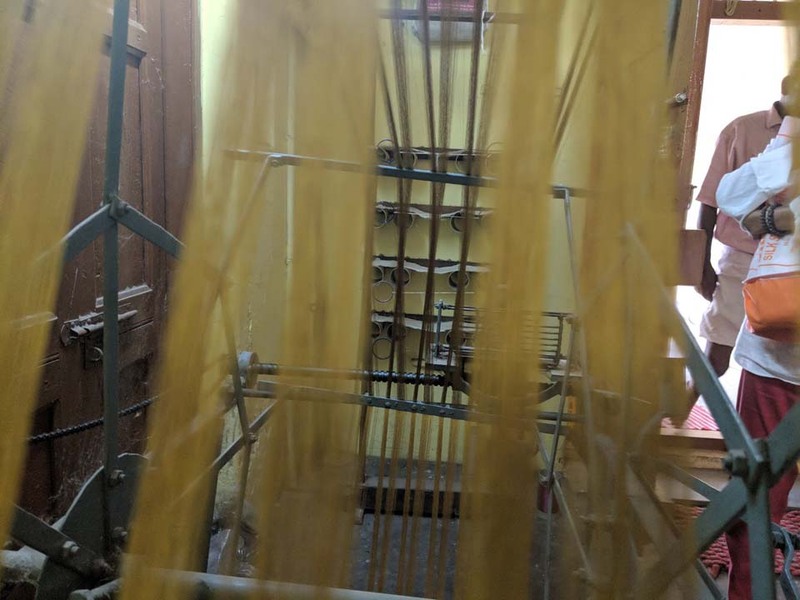 Venue: Lalit Kala Akademi, Greams Road, Chennai. 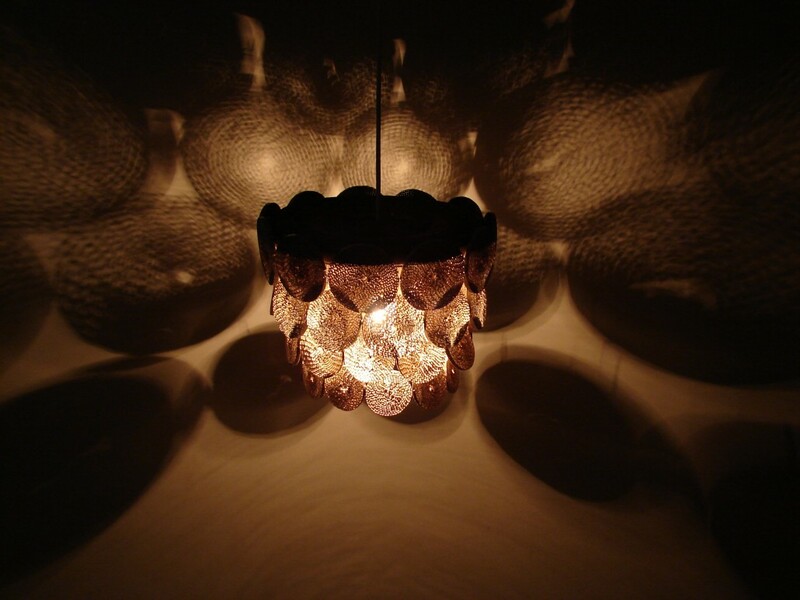 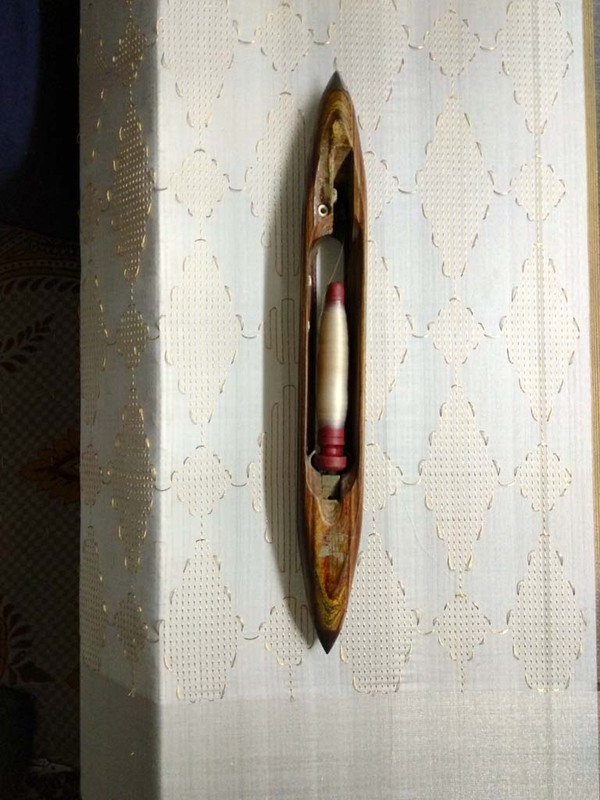 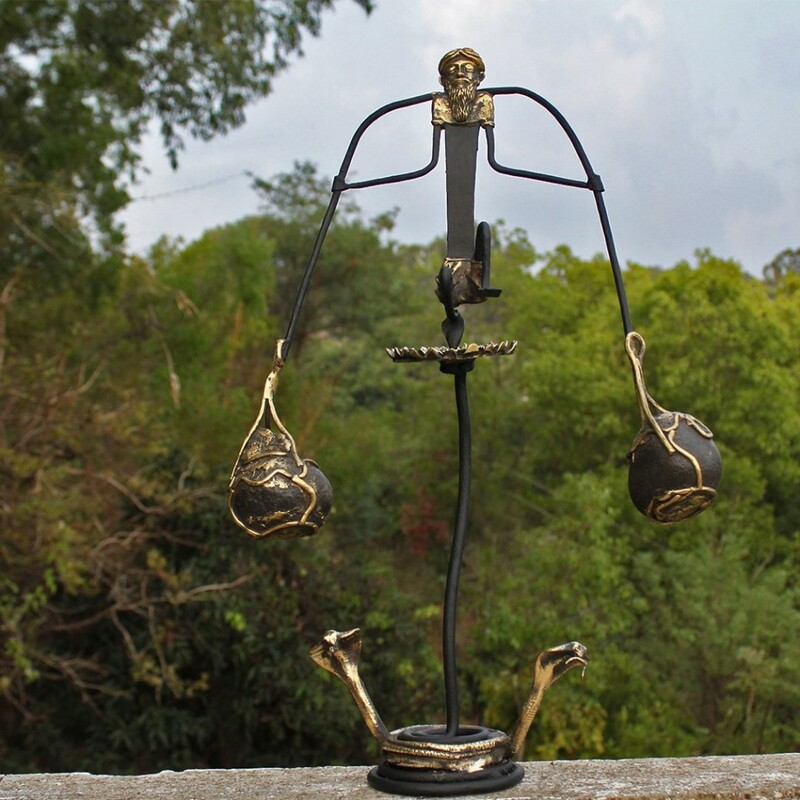 ‘Craftepreneur’: An exhibition of contemporary craft, fourth edition, comes to Chennai! 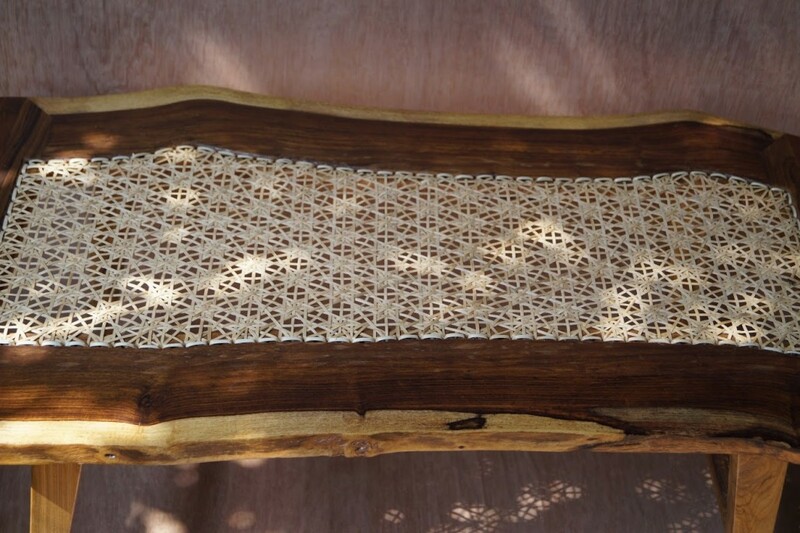 ‘Craftepreneur’ is not just a mint-new addition to word collectors dictionary, it represents the use by entrepreneurs of the amazingly diverse language and techniques of Indian crafts, wholly or in part, to fashion and create products for contemporary lifestyles and needs. 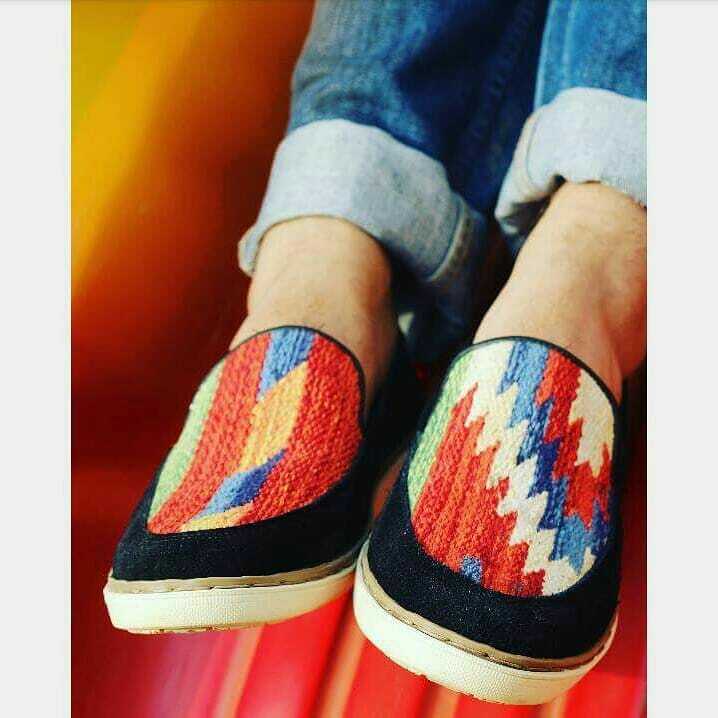 Craftepreneur is a word coined by The Crafts Council of India, a reflection of its focus on mainstreaming handcrafts in everyday life. 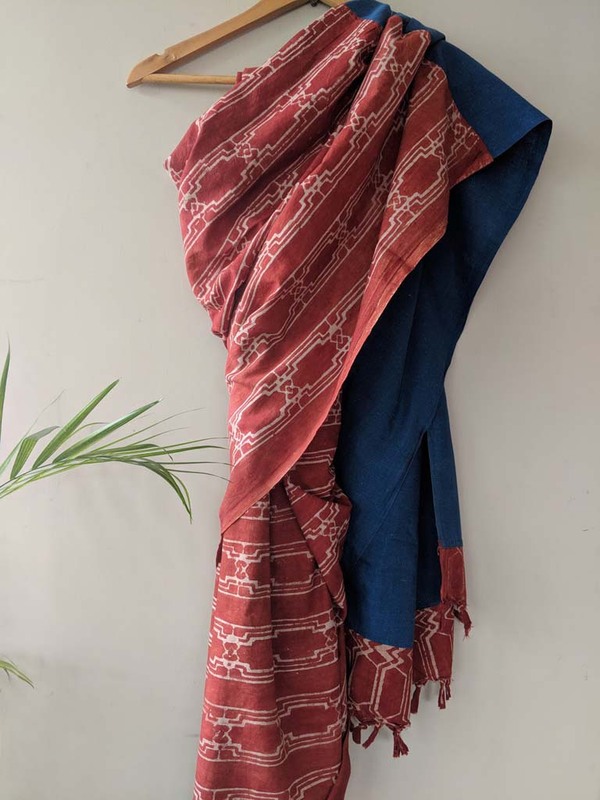 A ‘Craftepreneur’ is an entity who works with the techniques of Indian crafts and with craftspersons to fashion, embellish and express an array of products which are innovative and for today’s living. 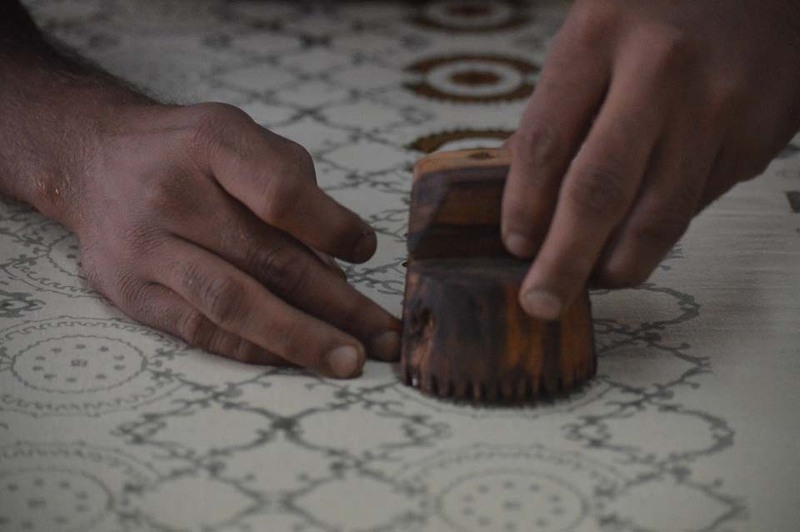 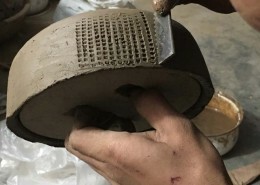 To this end, a host of traditional artisanal skills and techniques have been used by participants, working with traditional artisans to tell the story behind their products on view at ‘Craftepreneur’. 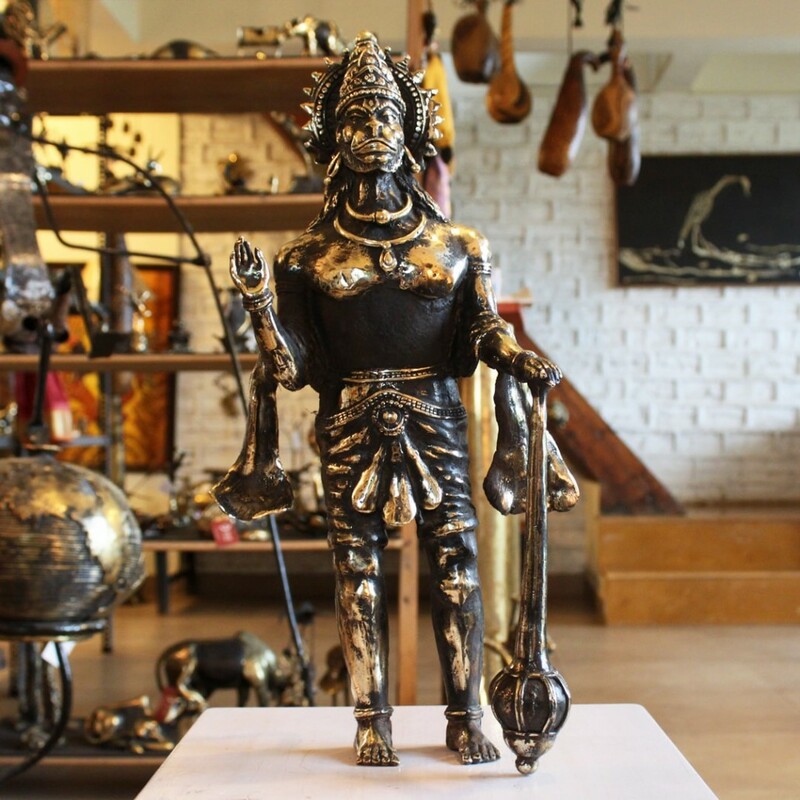 They tell stories of classical-edgy-contemporary clothing, saris, accessories, furniture, decorative, jewellery, home accents and more. 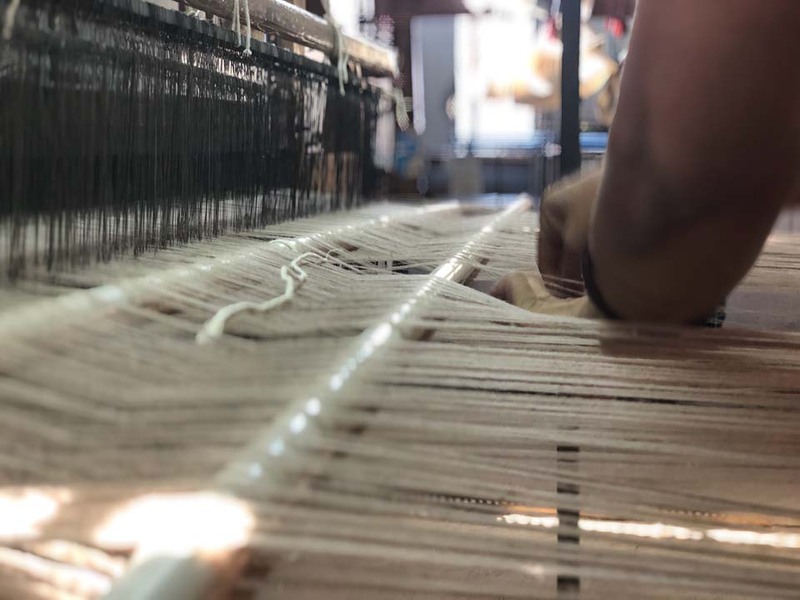 In each attractive, aesthetic, craft driven product is also woven by message of ecology, sustainability and revival of crafts and craft skills. 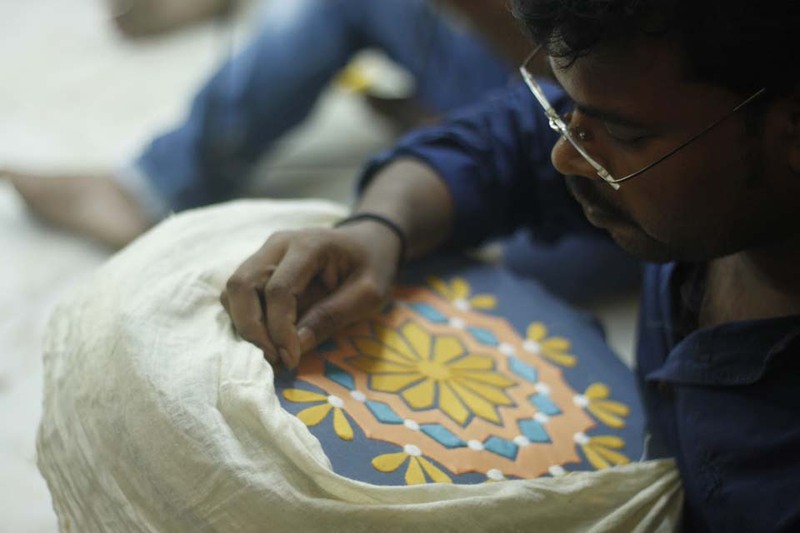 The Crafts Council of India presents the 4th Edition of ‘Craftepreneur’ this October, showcasing the products created by 22 craftepreneurs drawn from textile, product and fashion designers to artists and craft artisans. 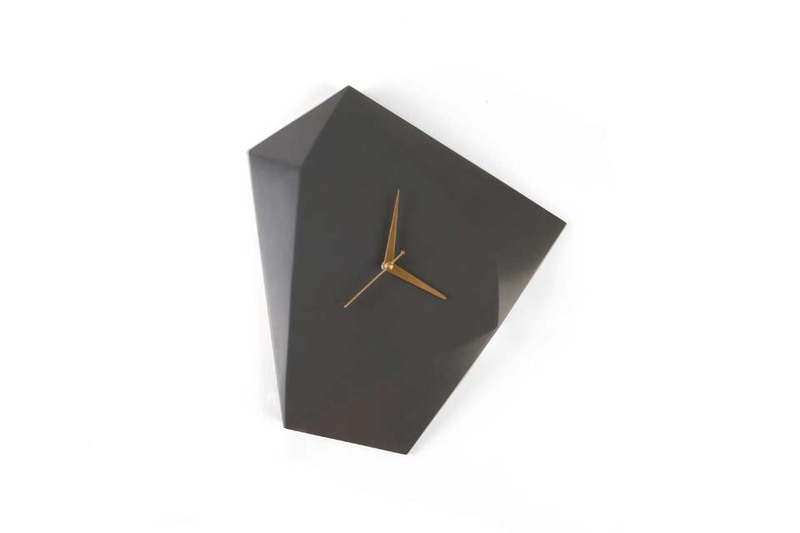 Many of the products are breathtaking in concept, ingenuity of form and format. 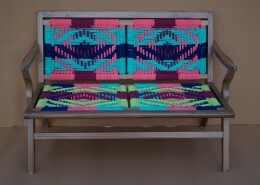 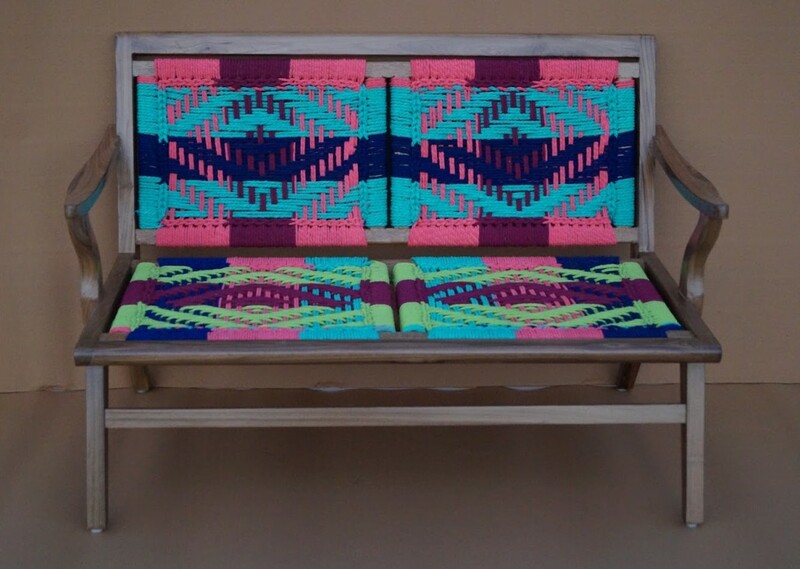 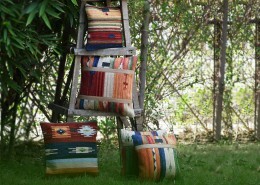 Like Boriya Basta’s cushion covers and handbags crafted out of the slit weave of Kilims. 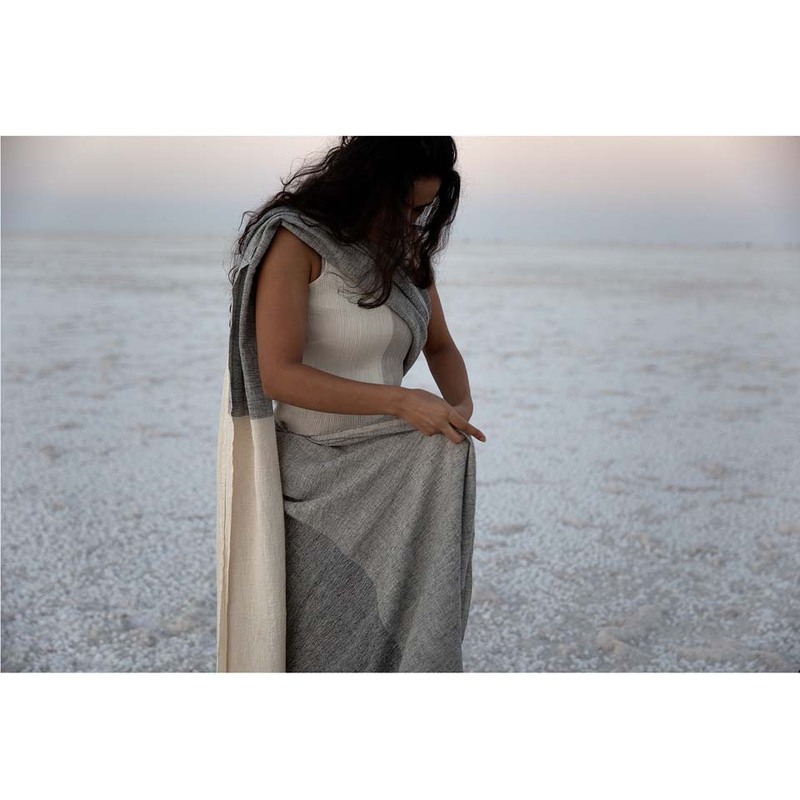 Intricate opaque, motifs of clouds, and flying birds in ‘Threads of Winds’ textiles. 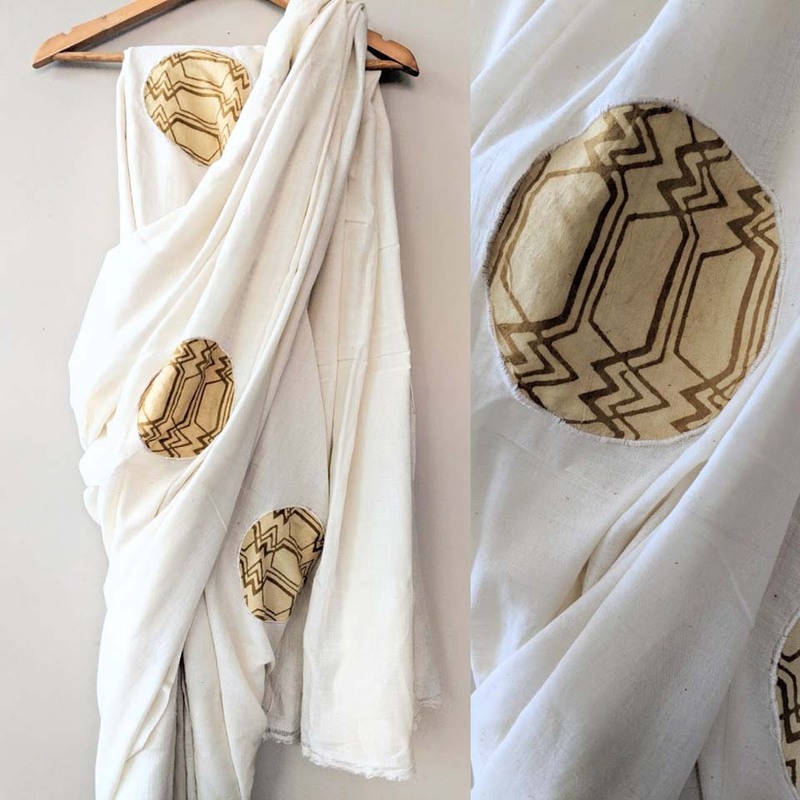 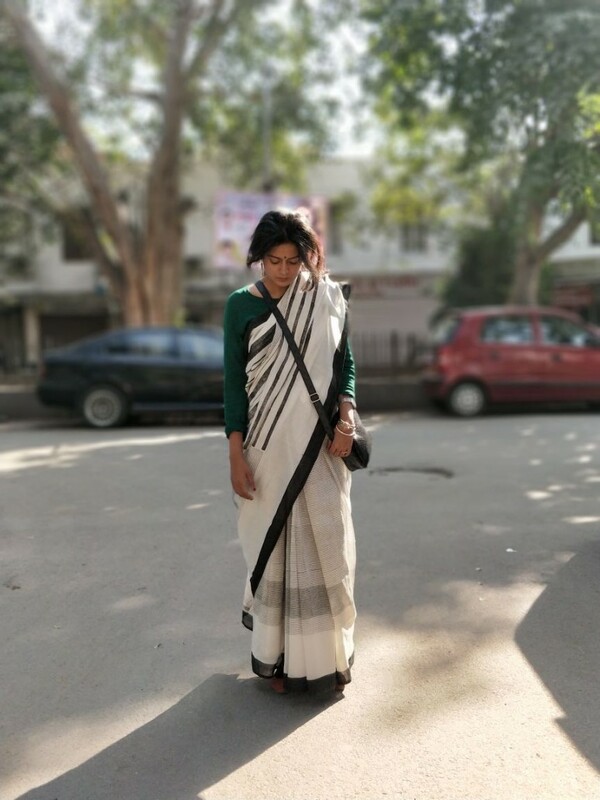 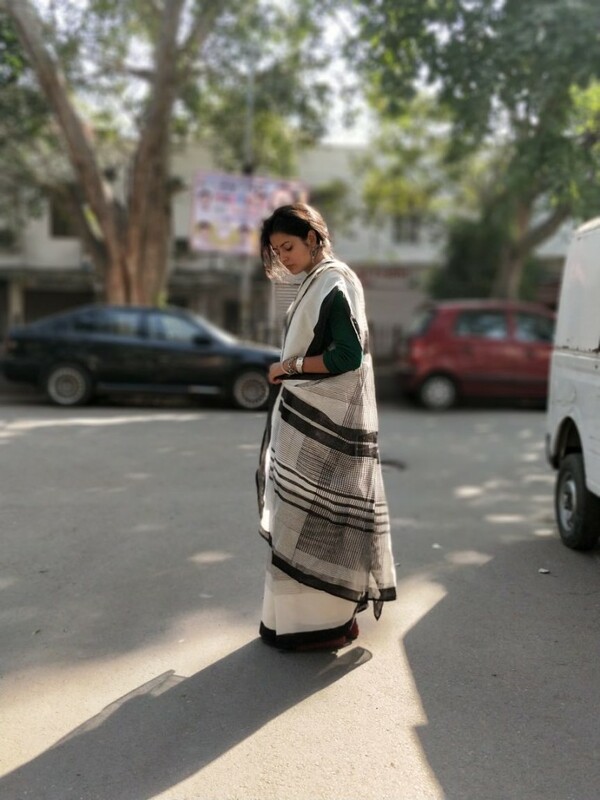 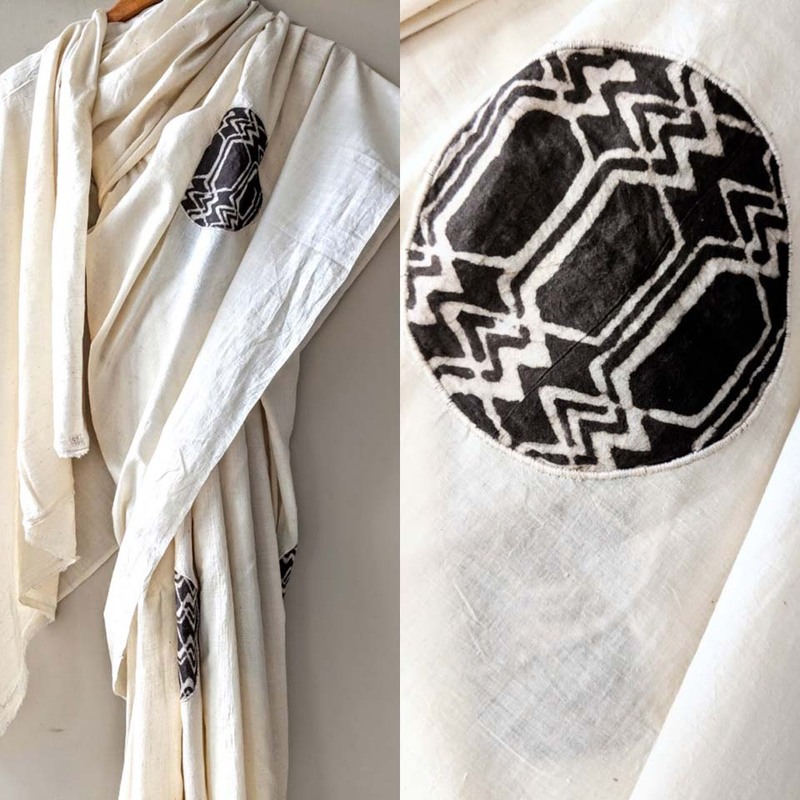 Shefcoz’s Chanderi saris woven with the ‘Kirkila’ weave, ‘Padmajas’ quirky, humerous take in her clothing line, Studio Objectry’s value addition to Manipuri’s black pottery and Moradabad’s brass and much much more. 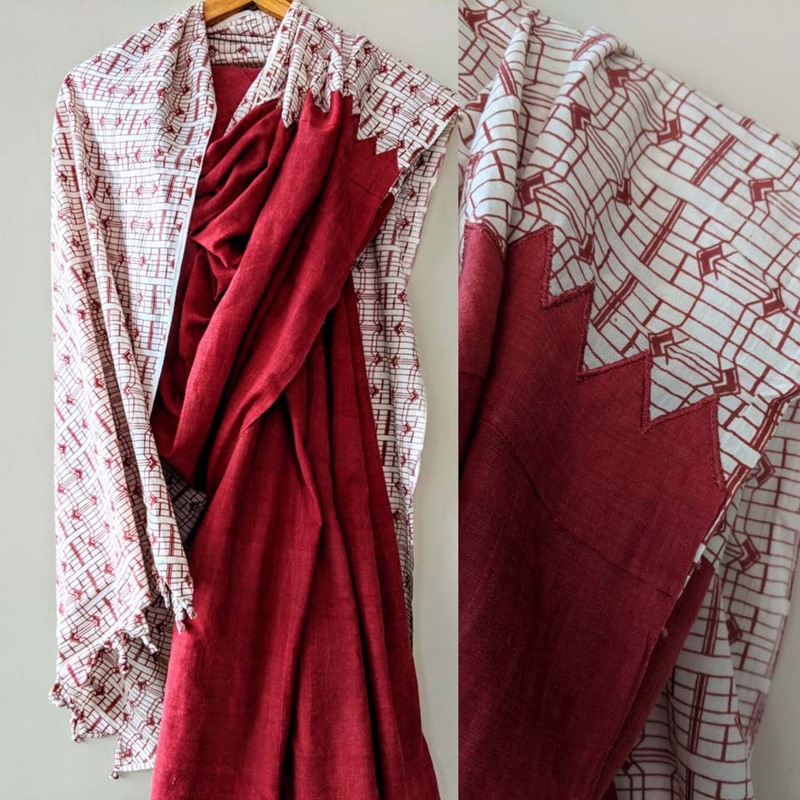 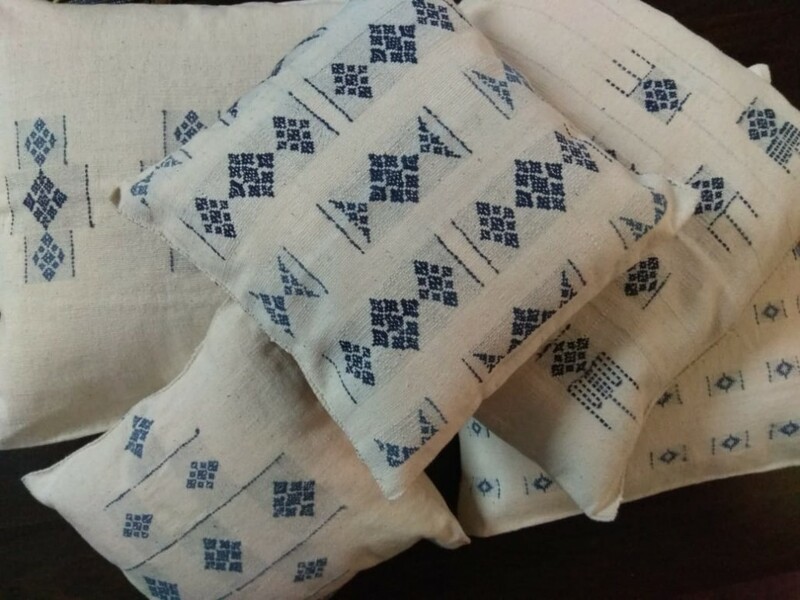 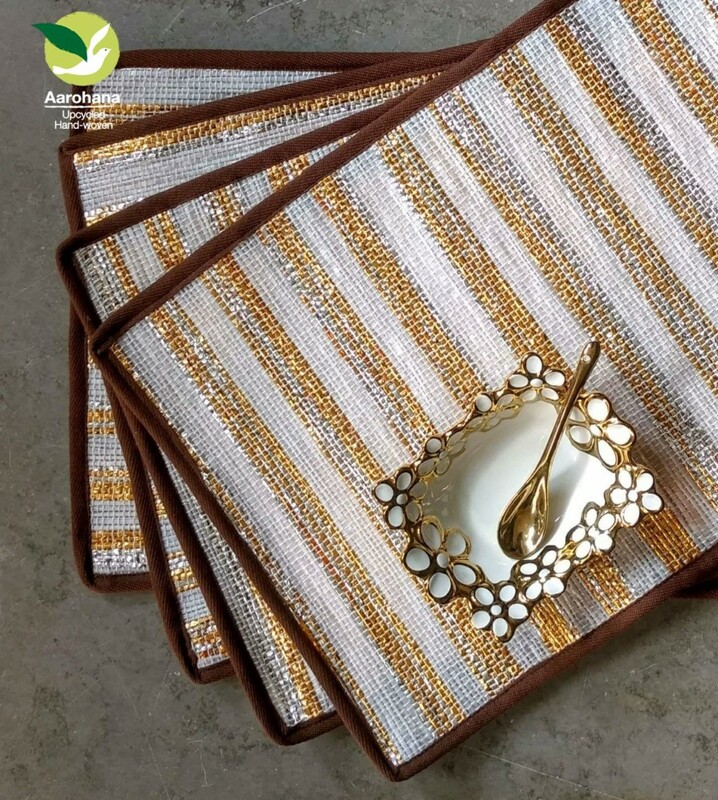 A unique take on creativity and craft techniques which is the USP of ‘Craftepreneur’ products is expressed in a host of diverse saris and fabrics. 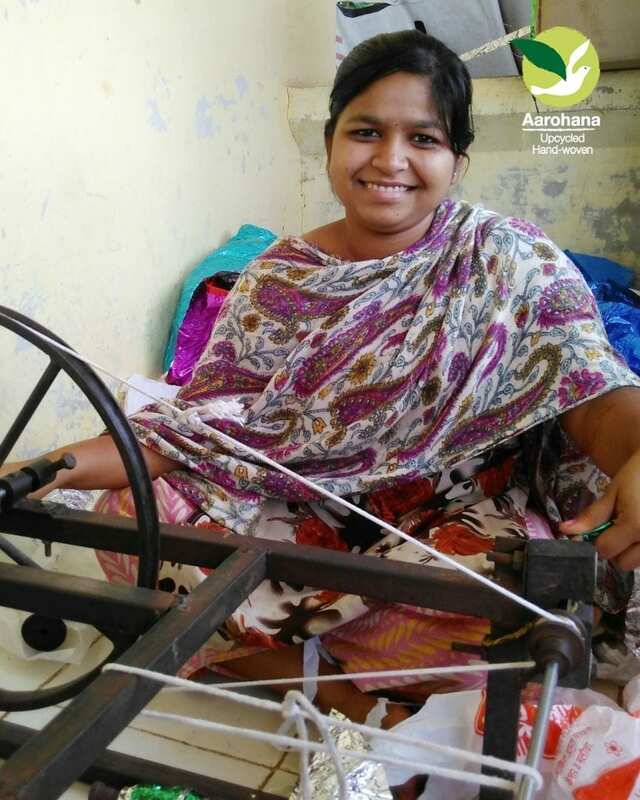 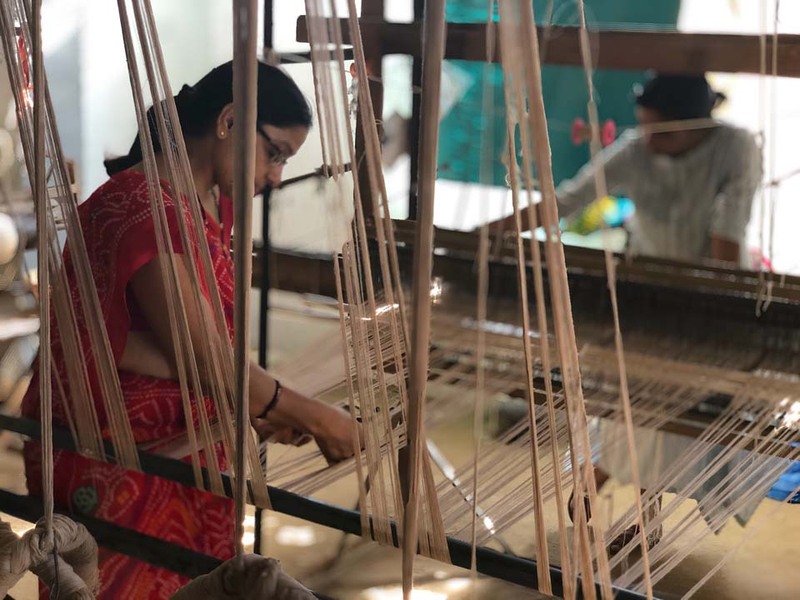 Among them, ‘Aarohana’s’ waste plastic fabric woven on a loom, the use of algebraic lines and circles in woven fabric by ‘Shorshe’ and as well as the use of blocks, embroidery and craft value addition in innovative ways. 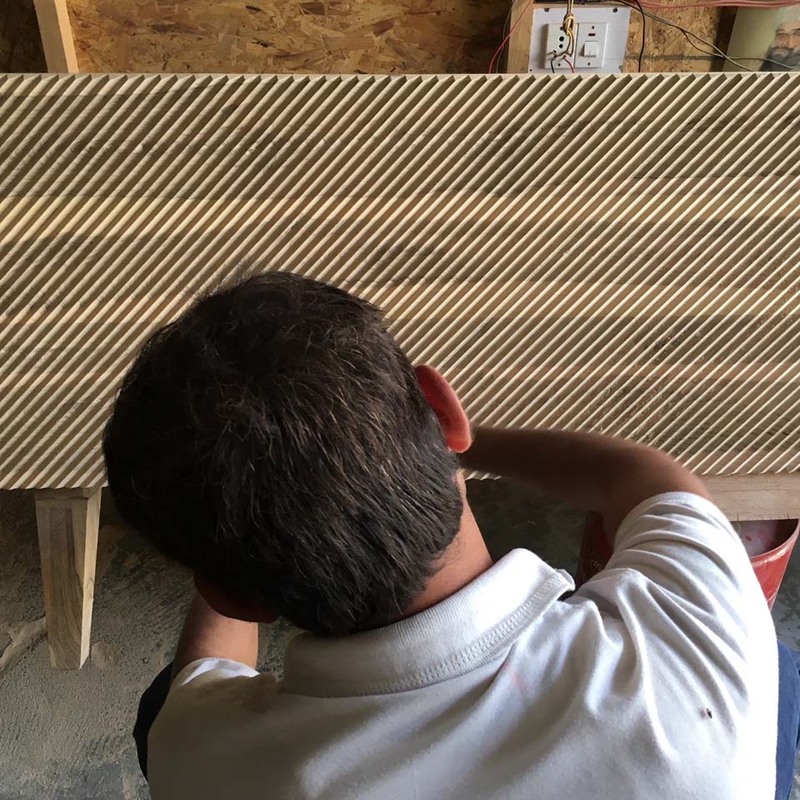 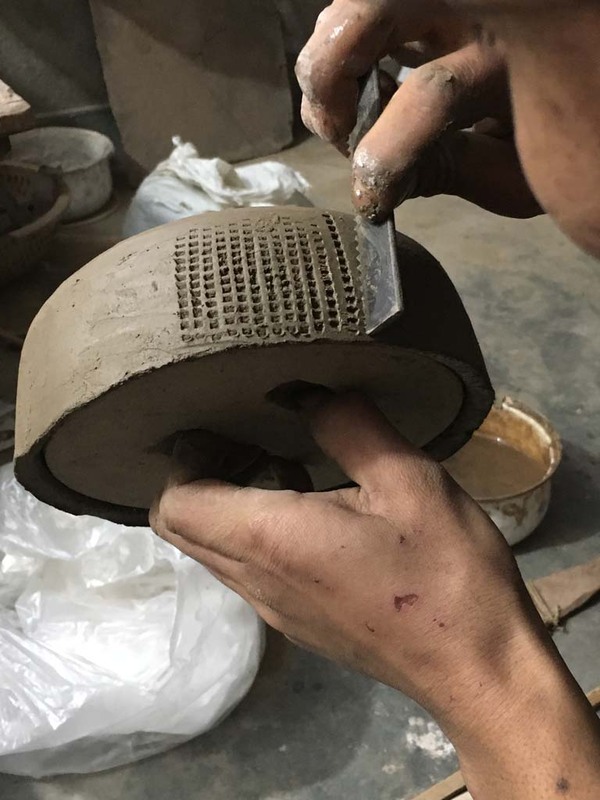 The passion reflected in Craftepreneur products is the obsession of the 22 craftepreneurs to respect and nurture our ancient skills and integrate them into products which are at once sustainable and eco-friendly both in raw material and process. 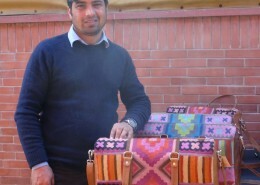 Above all, they showcase the work of the best young craftepreneurs in the field today. 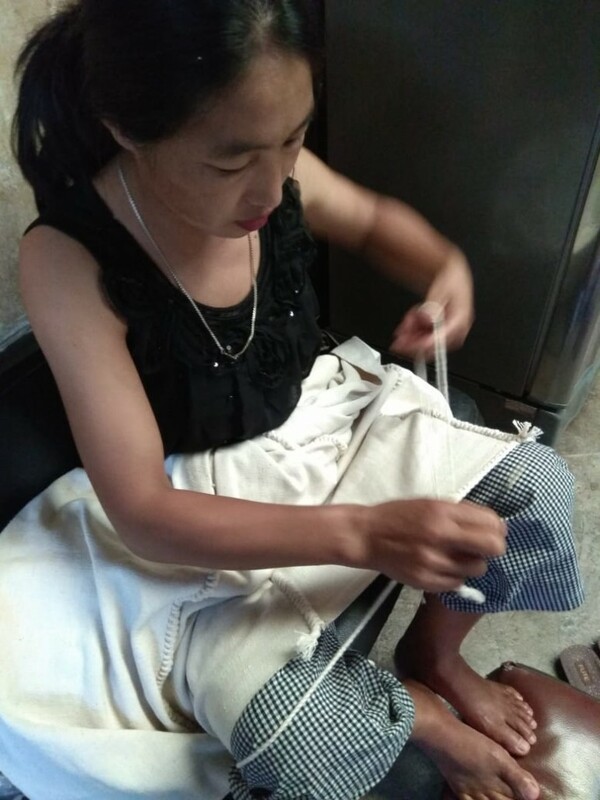 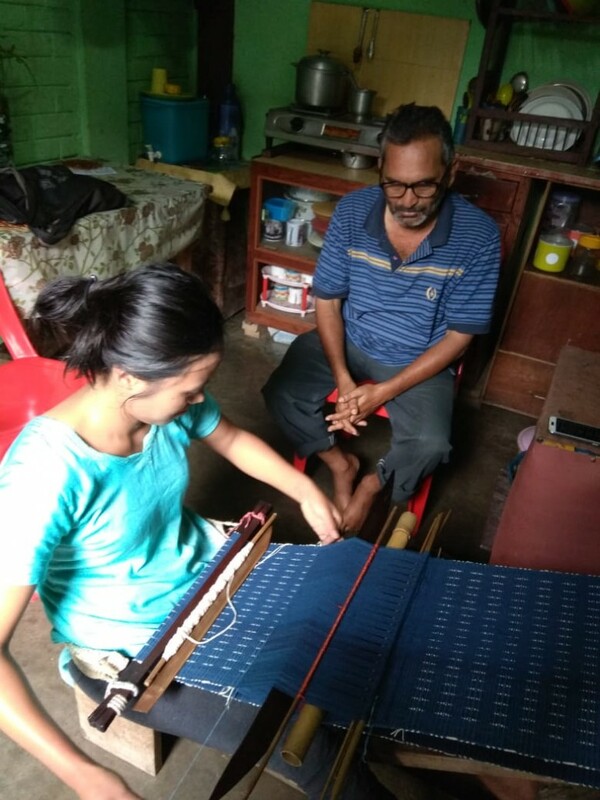 Kevisedenuo Margaret Zinyu from Kohima, started her label ‘Woven Threads’ in 2014 with a single weaver after pursuing NID. 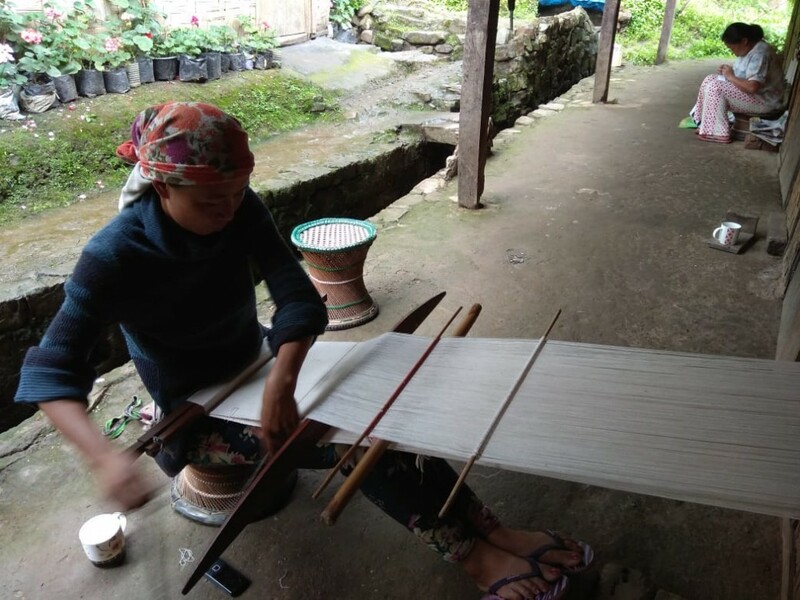 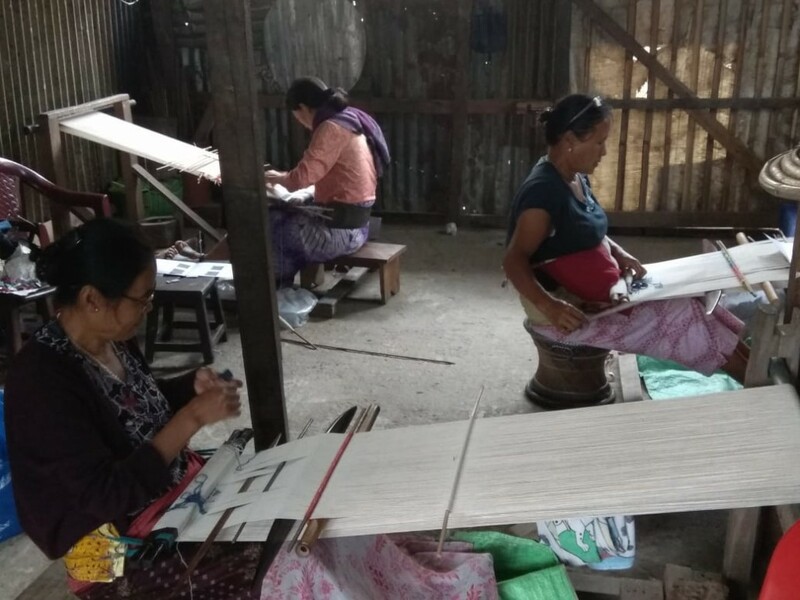 ‘Woven Threads’ has now grown into a design initiative encouraging the women weavers of Nagaland to preserve their traditional unique weaving tradition. 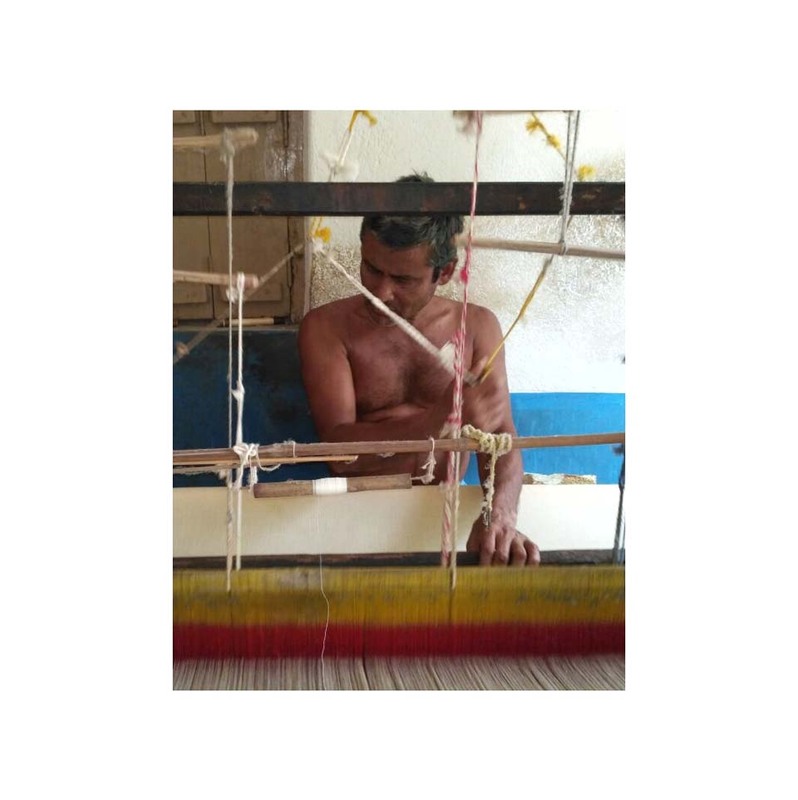 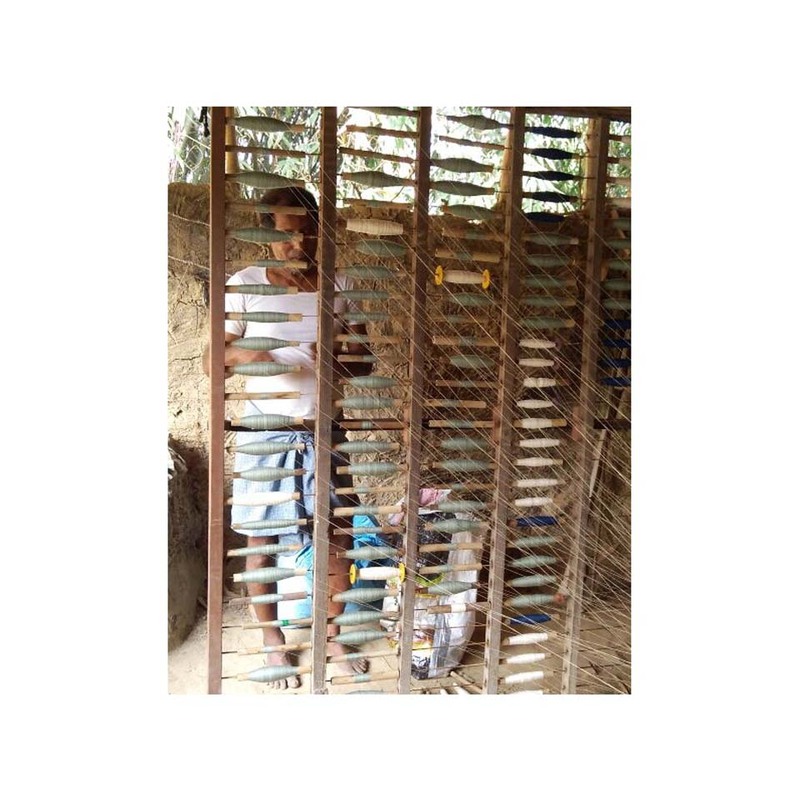 The loin loom of the weavers gives them flexibility to weave in their home-looms and continue to practice vital seasonal farming activities. 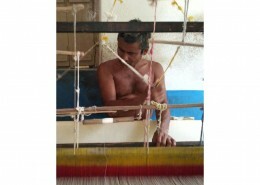 ‘Woven Threads’ abides by the ethos of traditional weaving methods of the region. 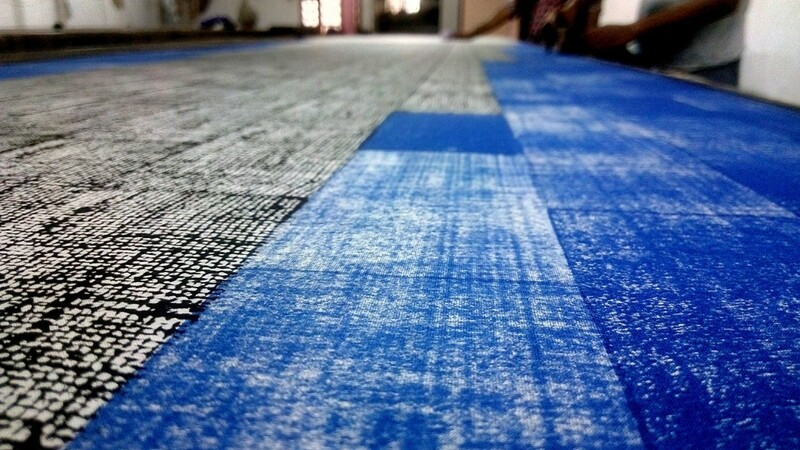 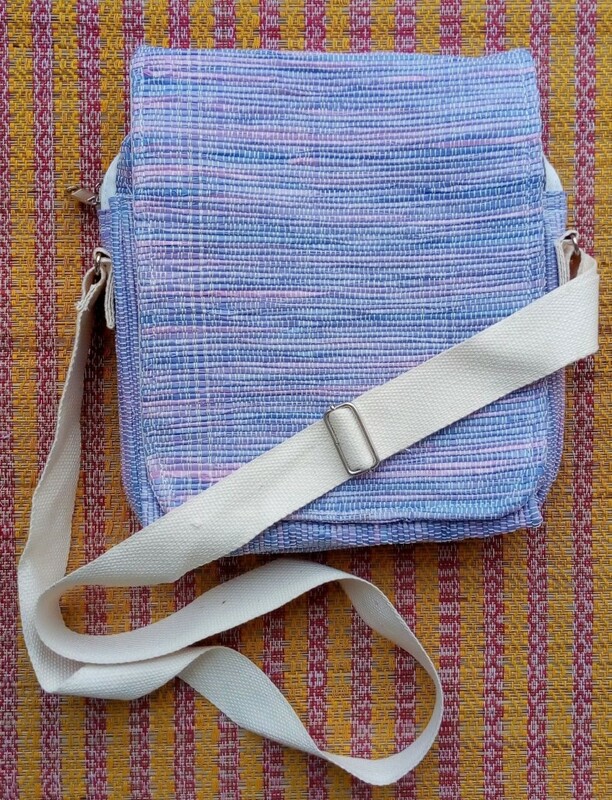 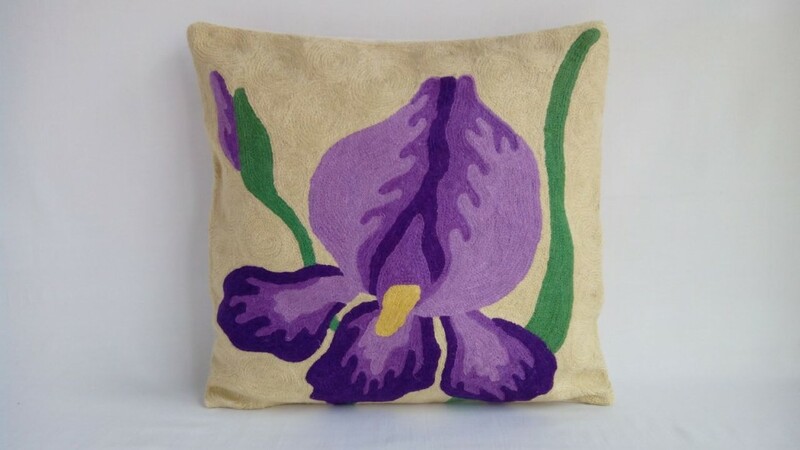 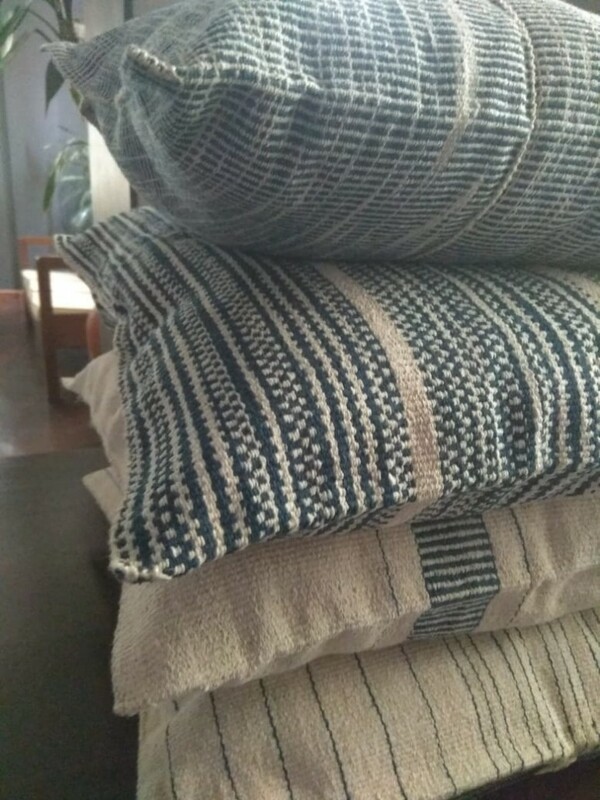 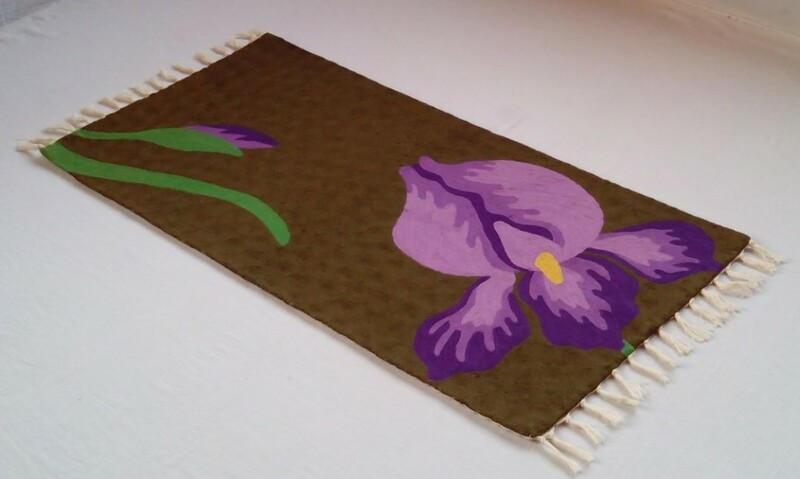 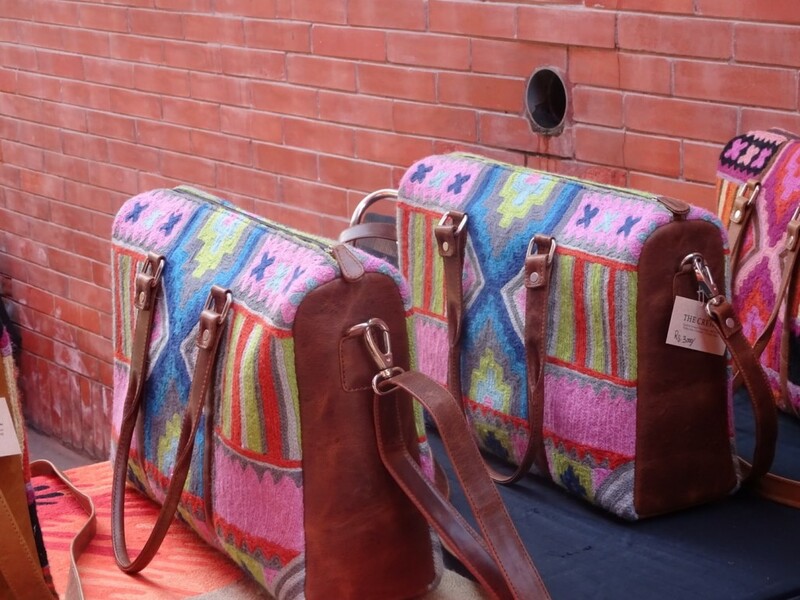 All products are completely handwoven and hand stitched. 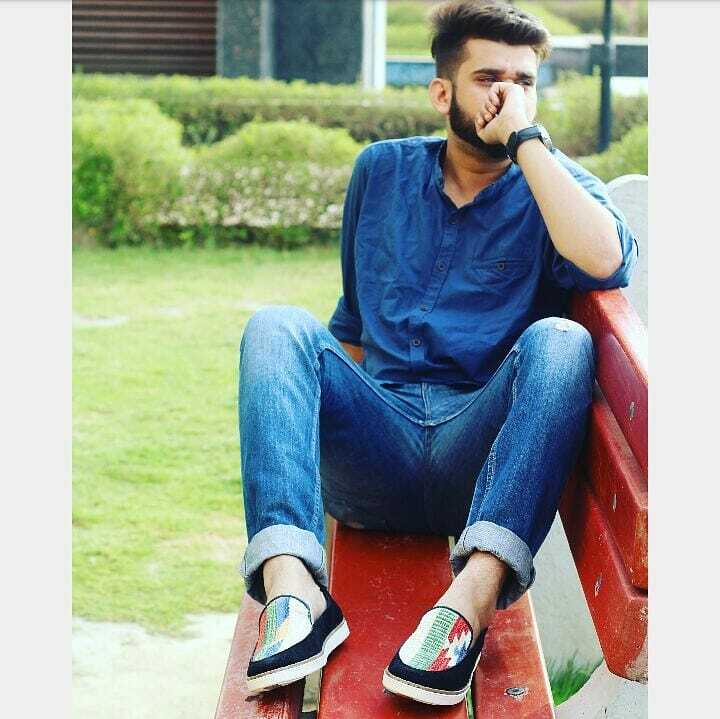 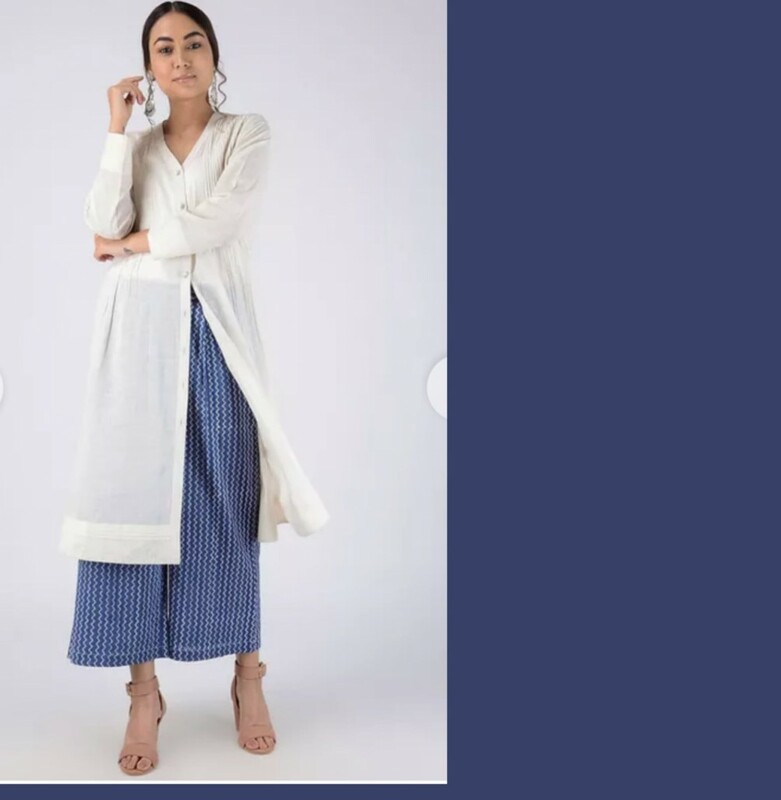 There is minimal wastage of fabric. 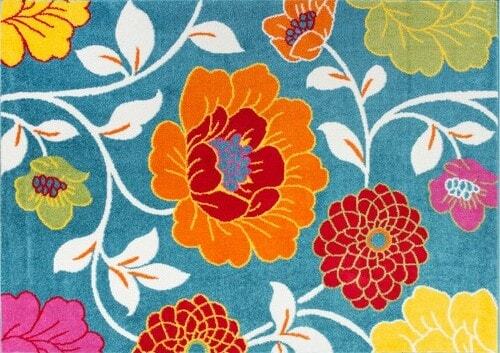 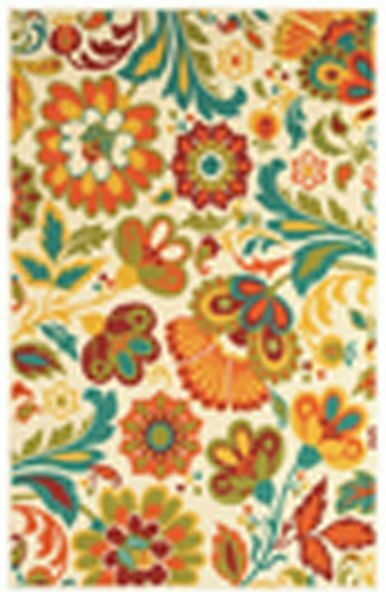 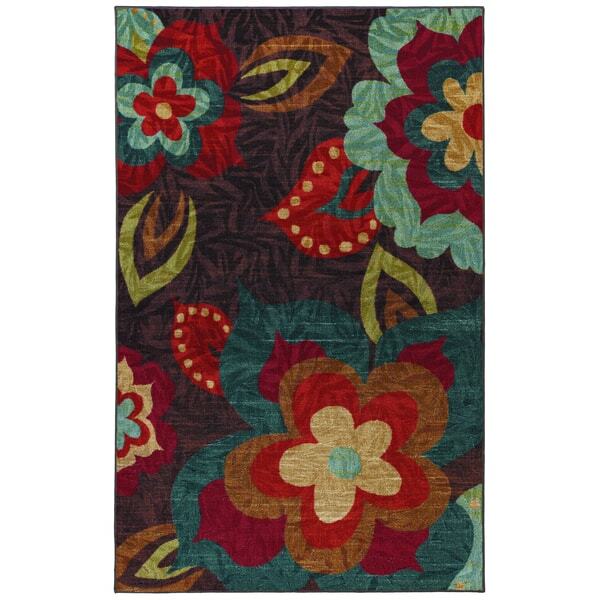 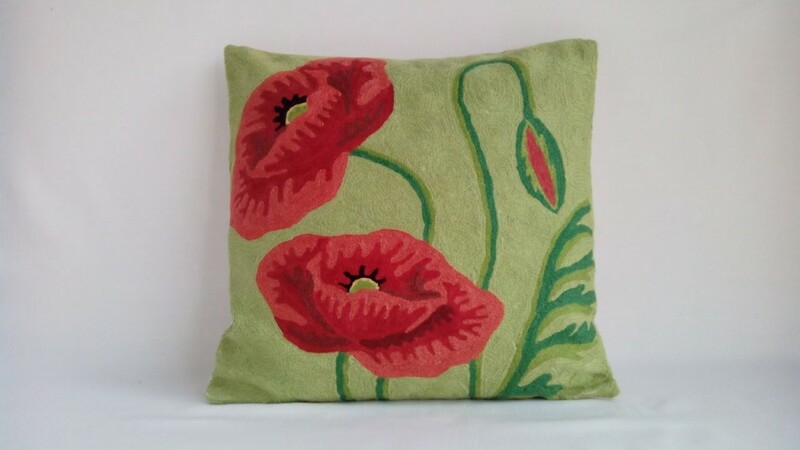 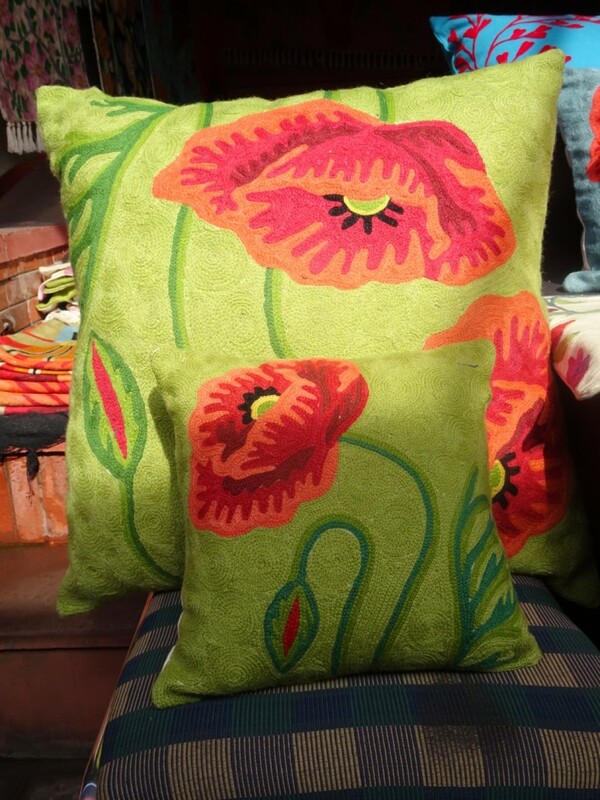 The range includes contemporary textiles for home & fashion. 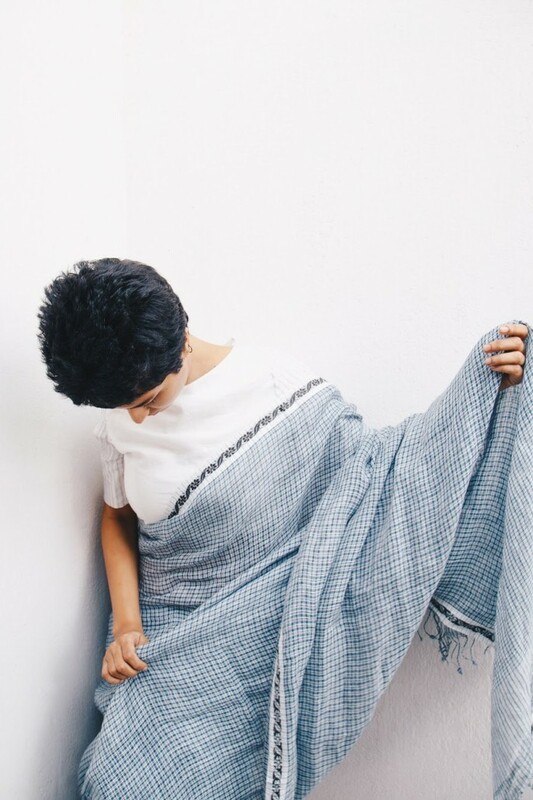 The Indigo collection is inspired from the Angami shawl ‘Loramhoushii’. 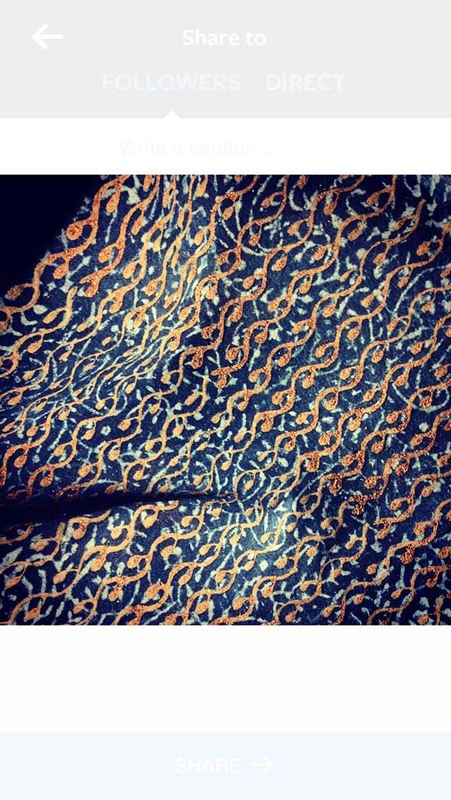 Loramhoushii shawl is worn by the youth and the middle aged. 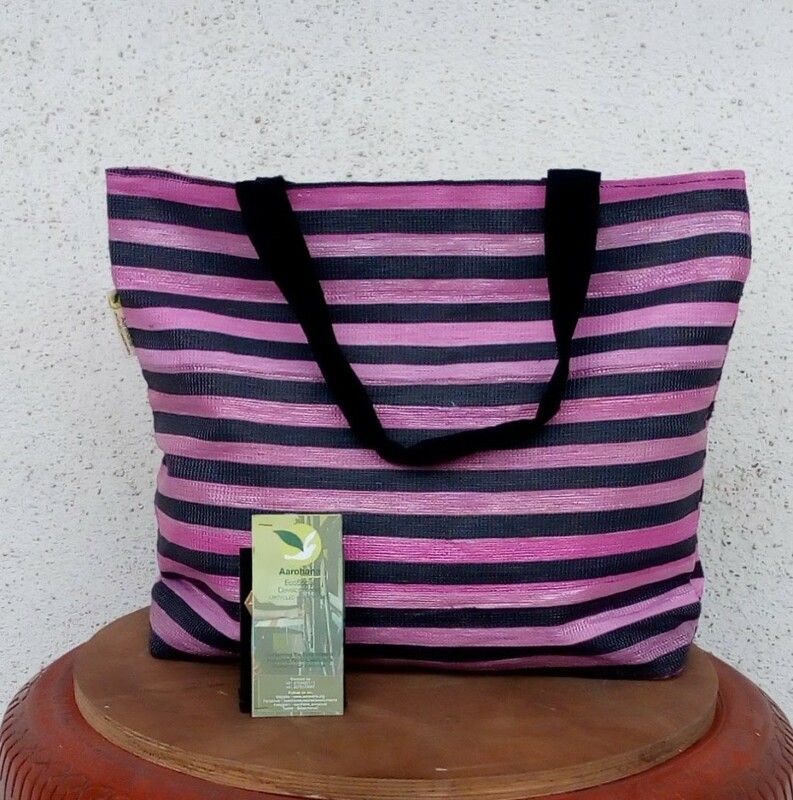 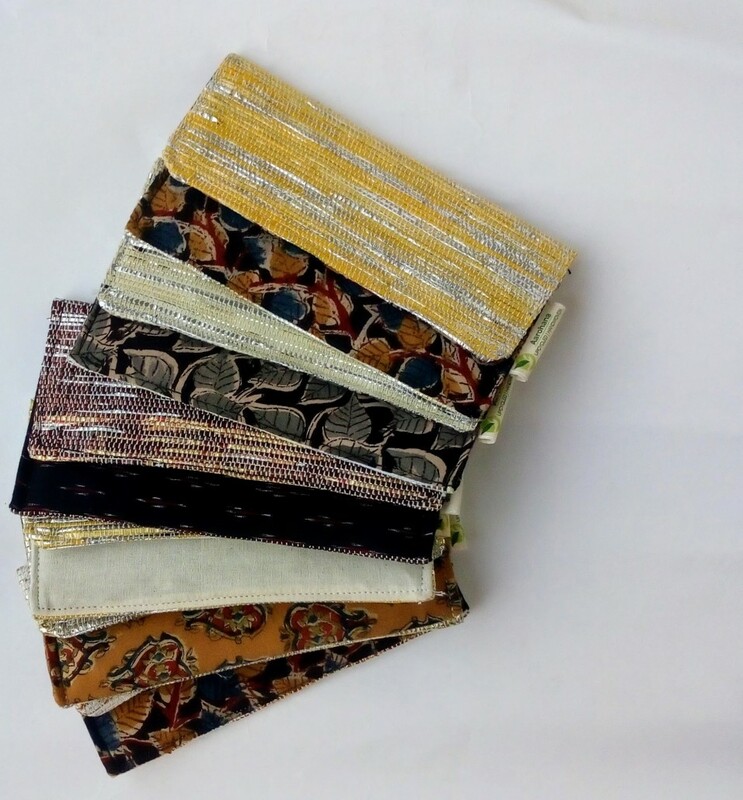 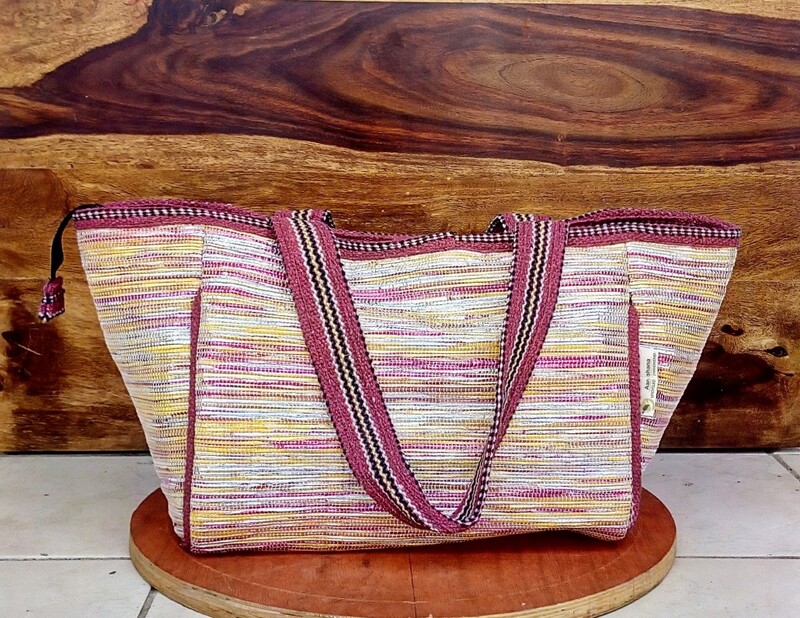 She designs pillows & throws in assorted sizes, table runners, accessories such as bags & clutches with weaves from Nagaland. 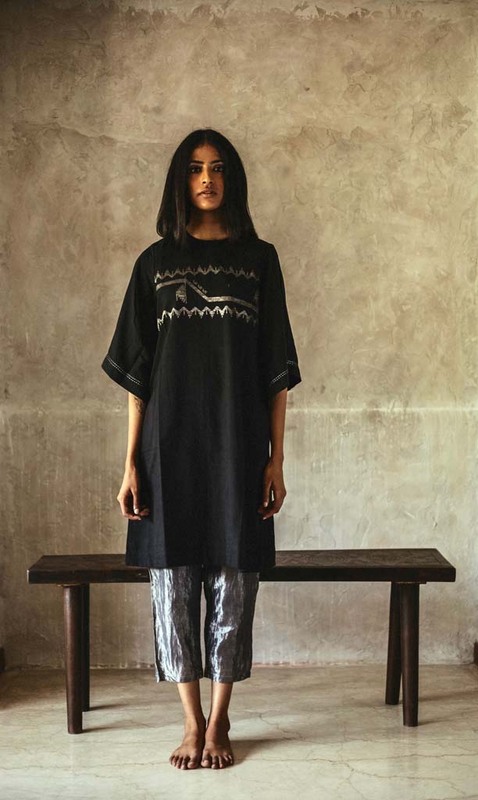 Vraj:Bhoomi celebrates Ajrakh craft in a lust of innovative ways yet keeps its Sufi inspired soul. 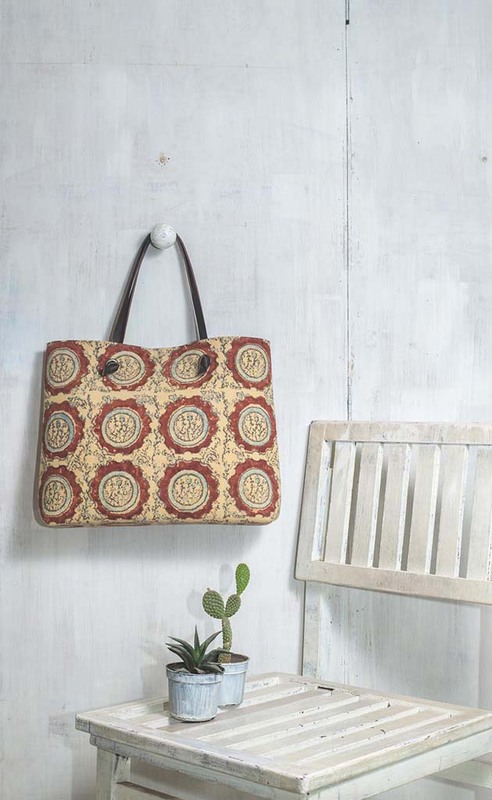 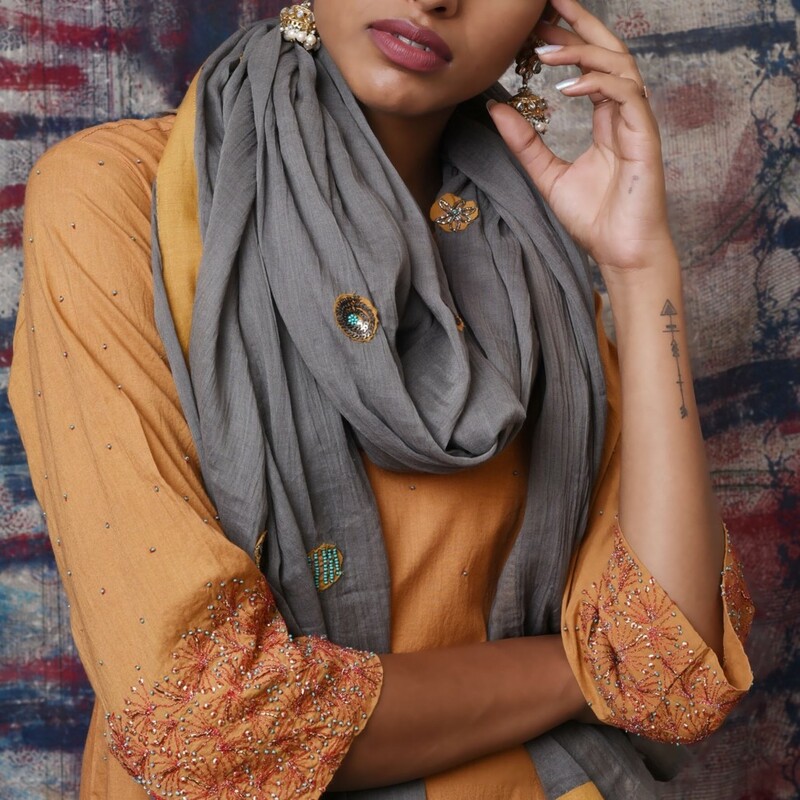 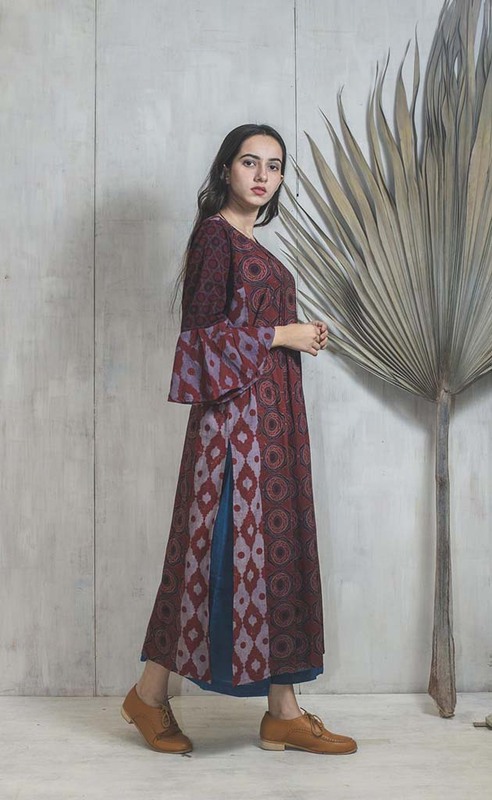 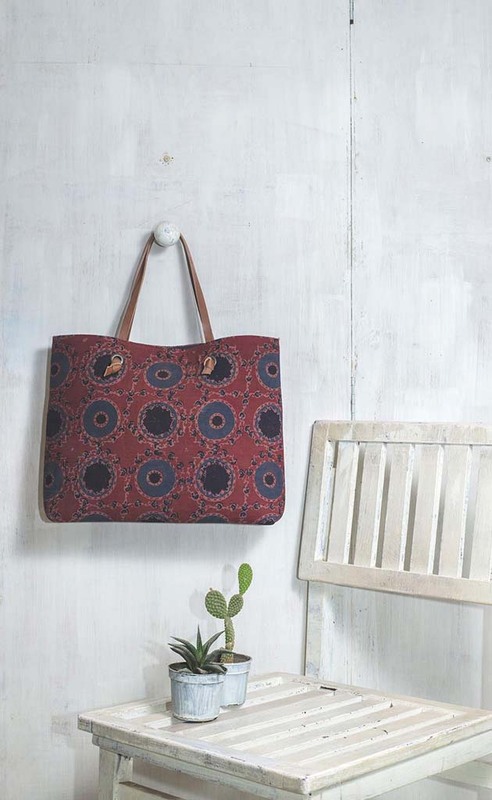 The revival of Ajrakh and the reinterpretation of age old Ajrakh printing blocks on fabric is the focus of the design expressions of the Vraj:Bhoomi collection. 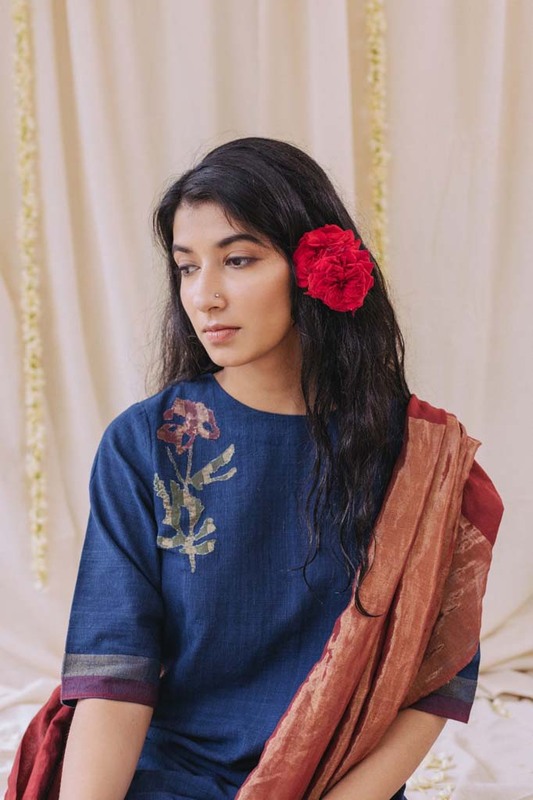 Craftepreneurs Bhoomi Dani and Priyam Shah work in their design innovations and expressions with the craft artisans while the traditional colours of Ajrakh, extracted from nature’s bounty are used in their designs, contemporary prints are used with traditional blocks to give the garments a global twist. 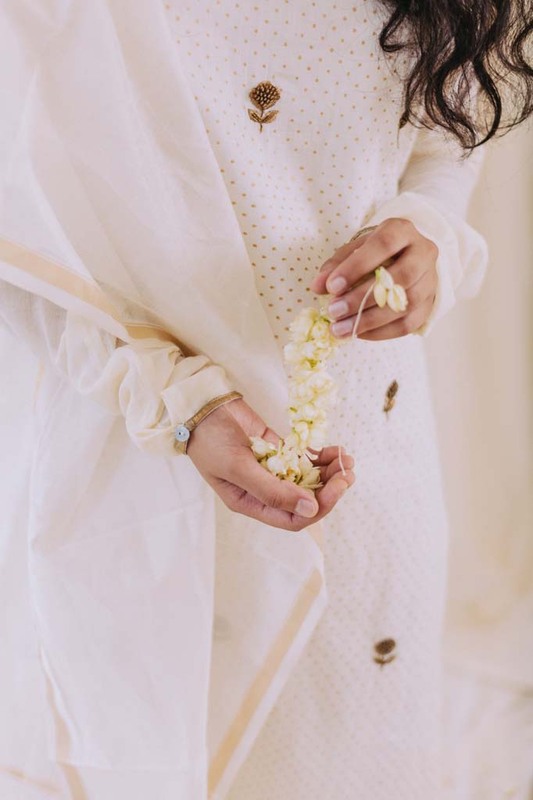 Yet the beauty of nature is the focus of the lyrical motifs: sun and moon disks, tender flora like tulips carnations and iris, pomegranate buds and more an Indo-Western silhouettes, tunics, kurtas and wraparounds. 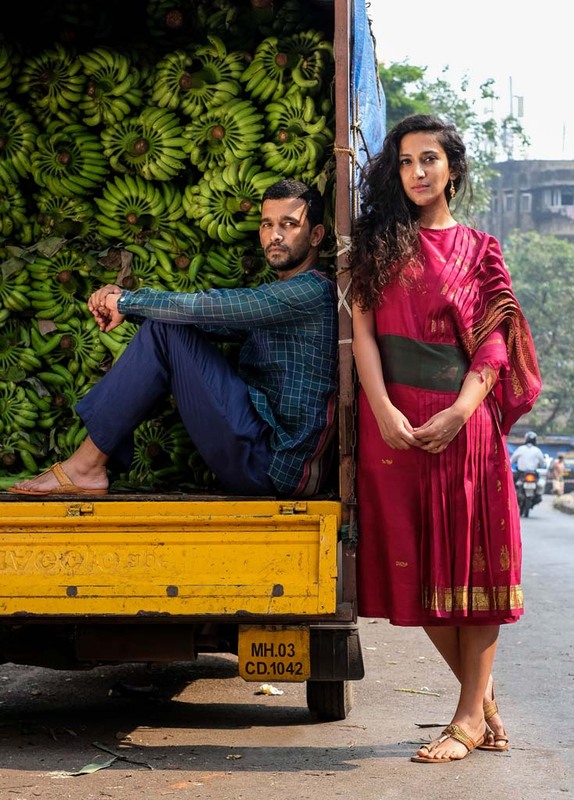 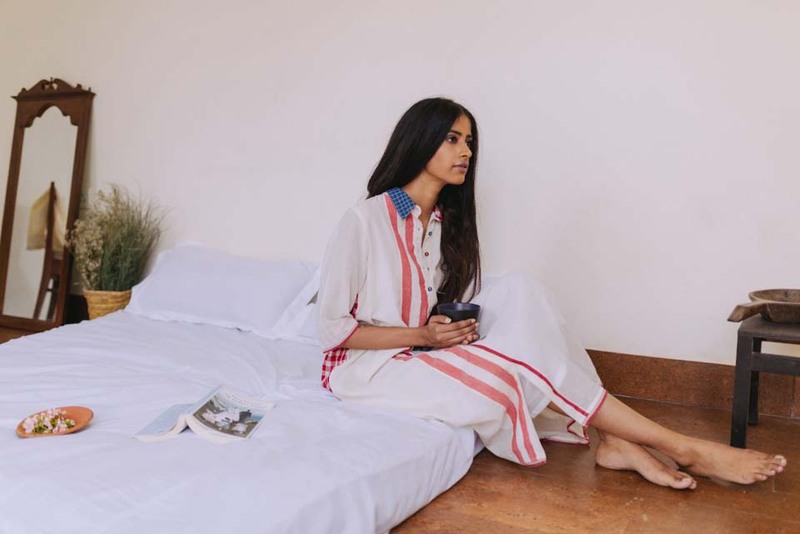 A Mumbai based brand founded by a brother-sister who are passionate about design and have founded two design labels ‘Tath’ and ‘आcai’ alongside parallel careers in journalism and social development, respectively. 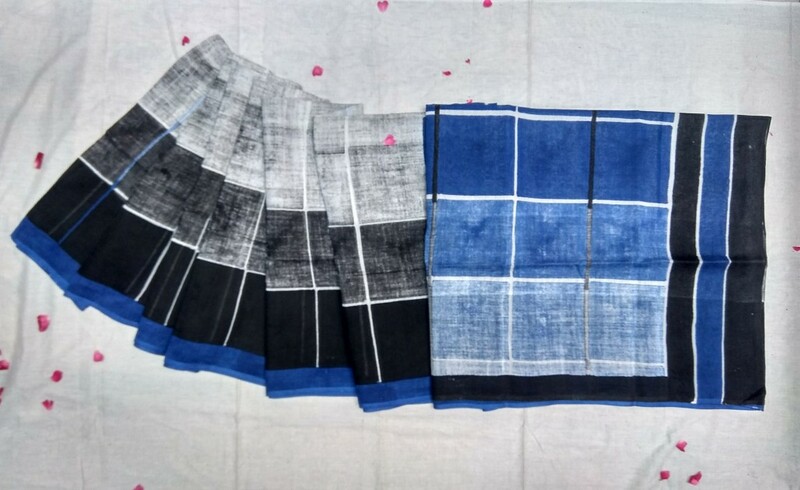 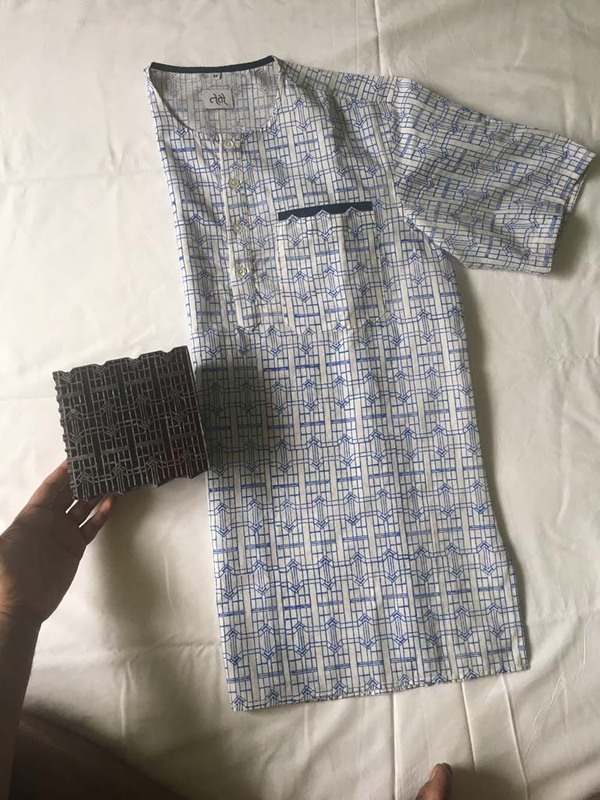 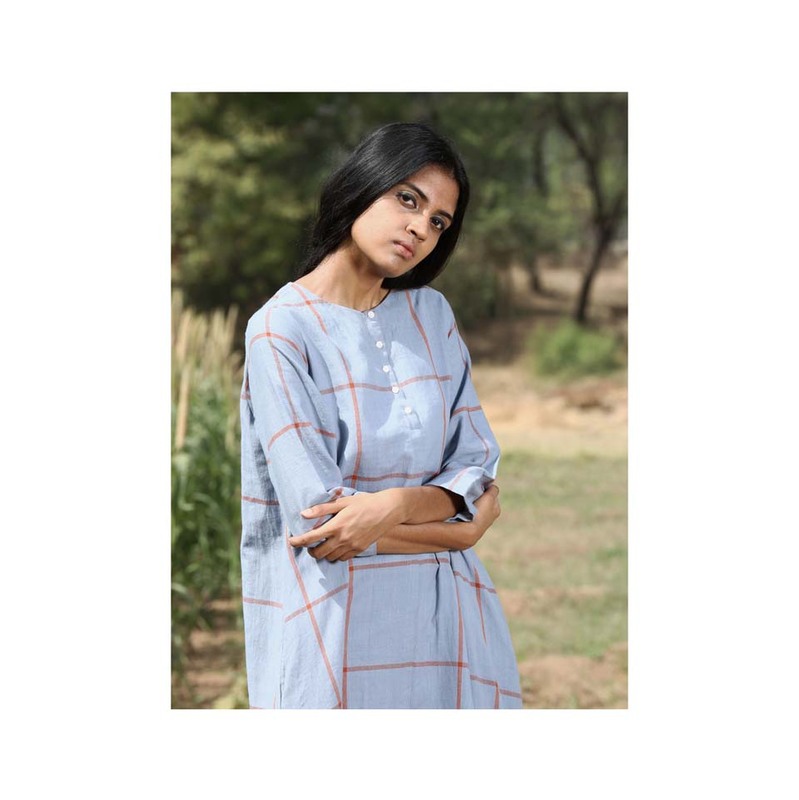 Label Tath by Prasad, works with Pochampalli, Mangalgiri, Koraput cotton and Kala cotton from Kutch to create very modern and stylish clothing for both women and men. 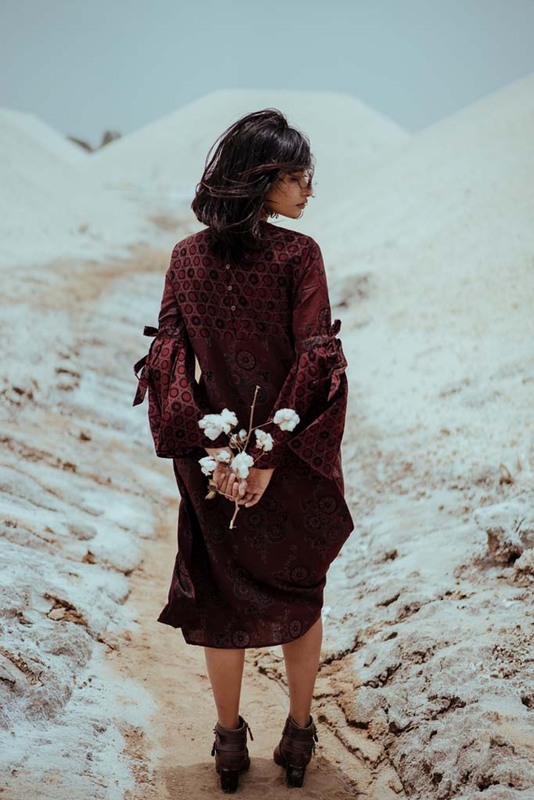 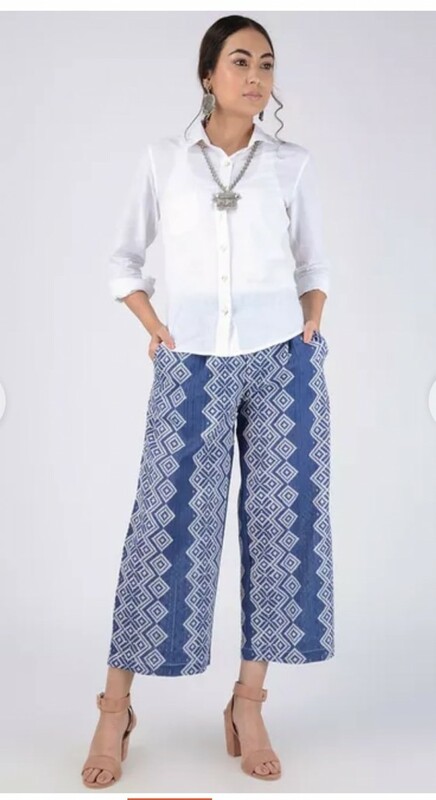 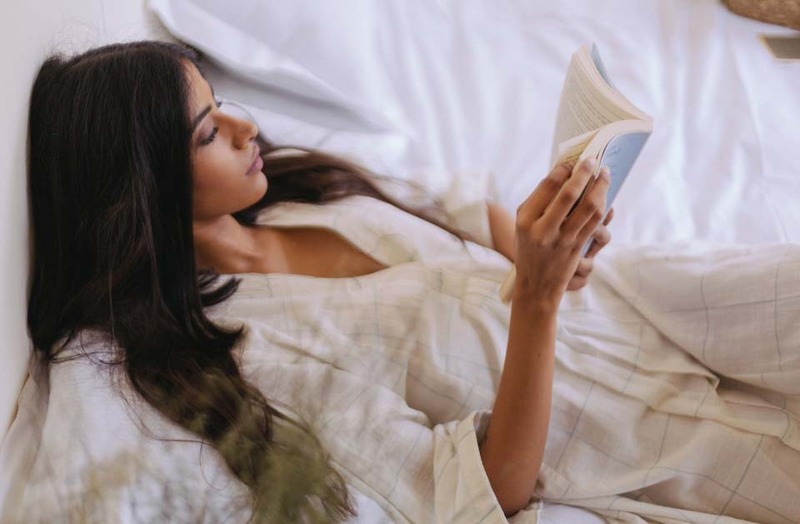 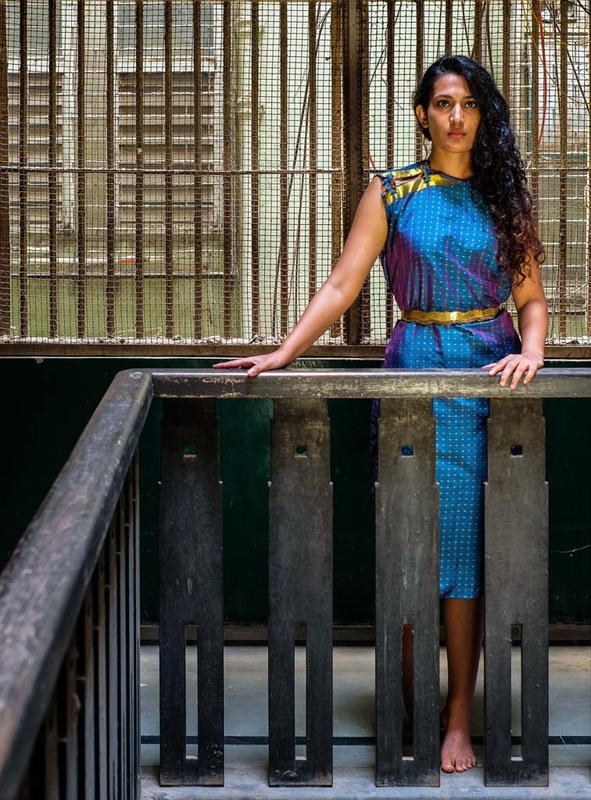 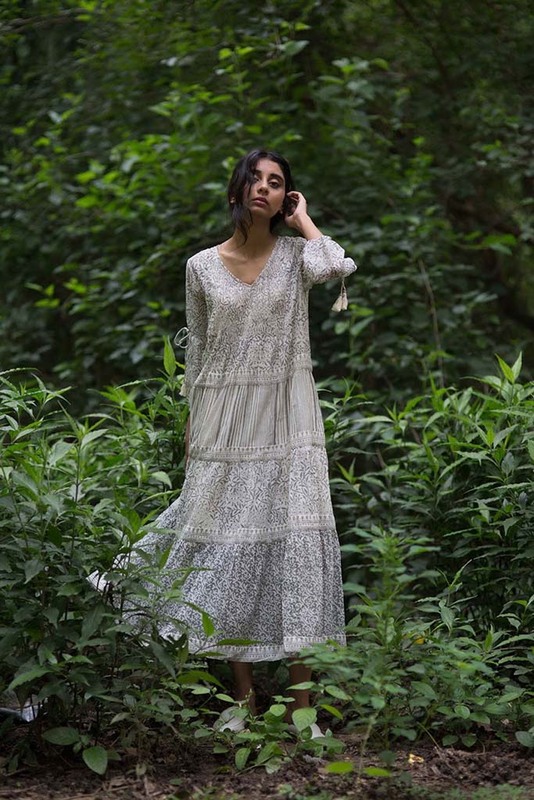 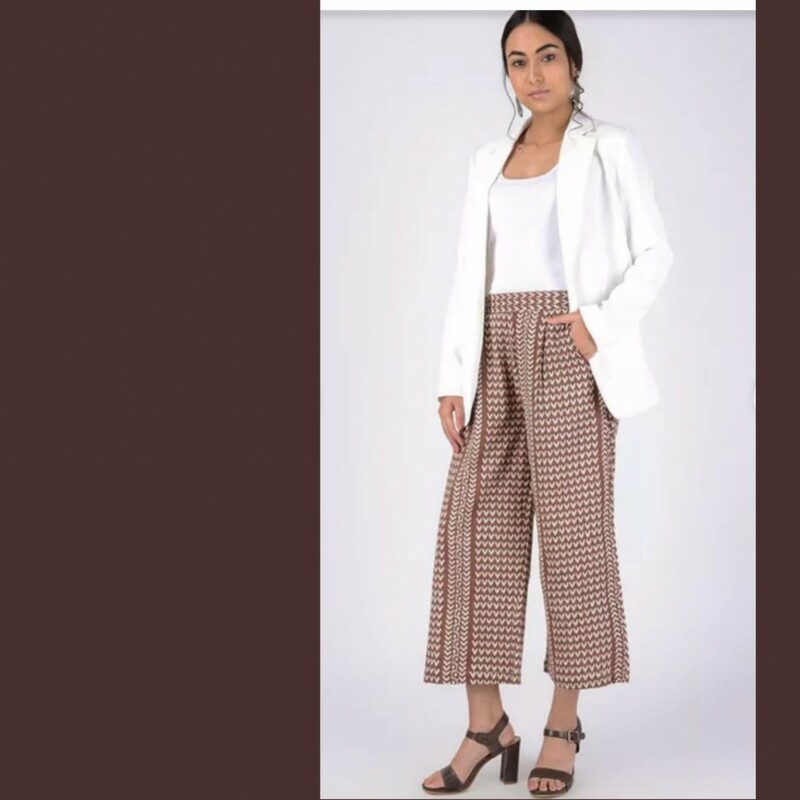 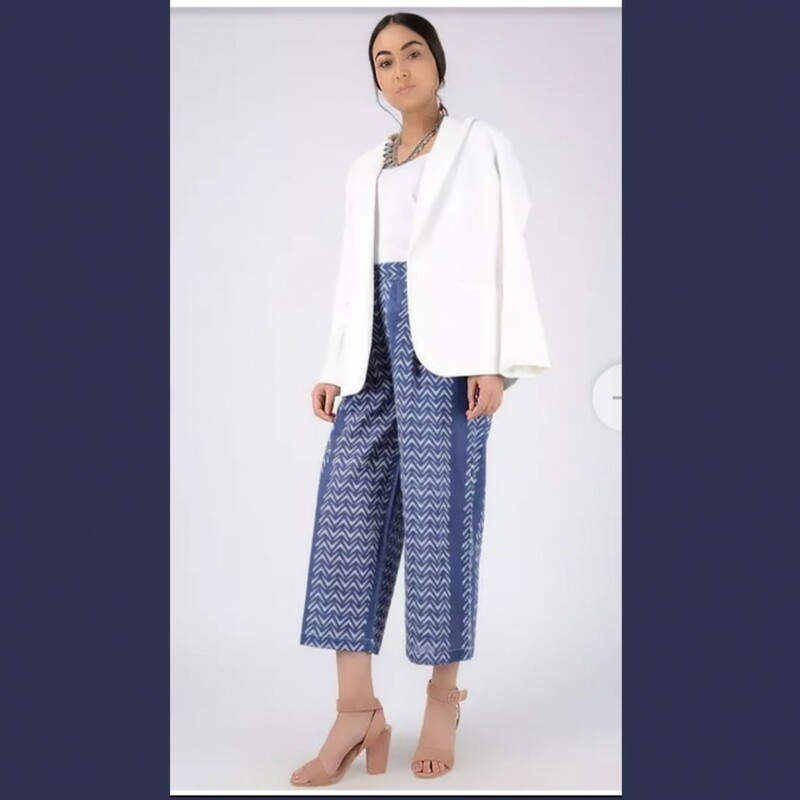 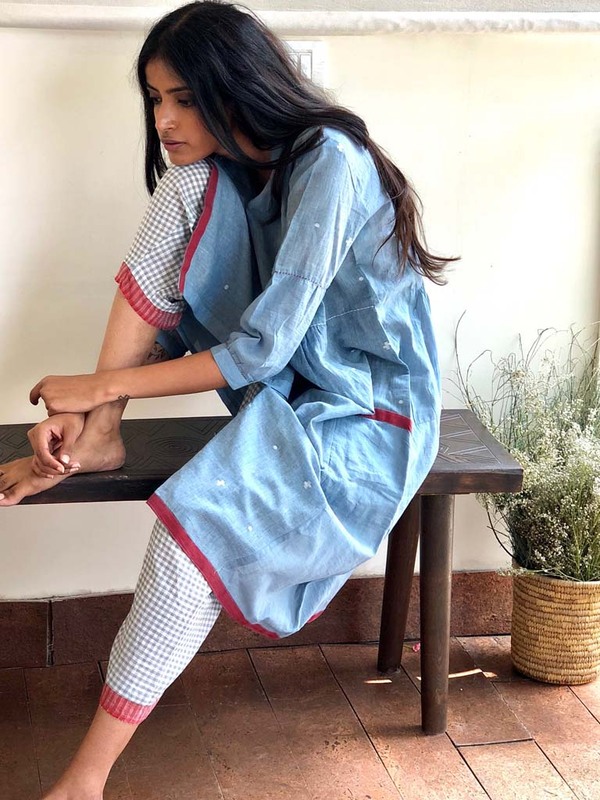 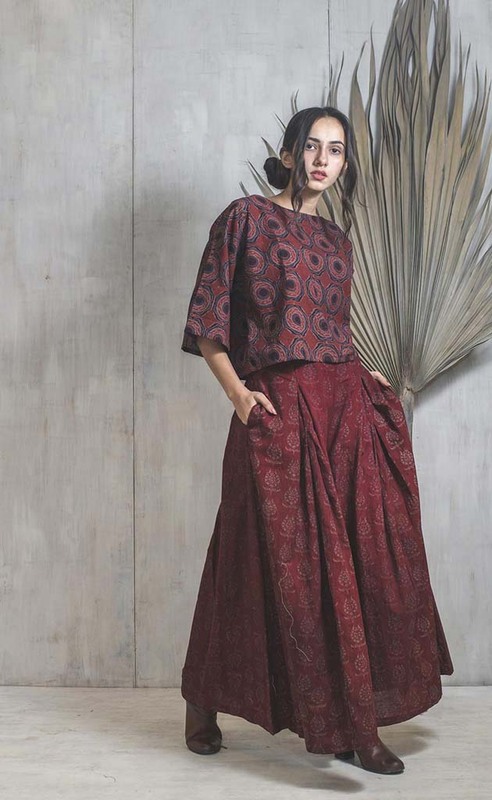 The inspiration comes both from the noted heritage of the handwoven fabrics, from organic fabric which they use in their fashion line as well as from Mumbai’s art deco. 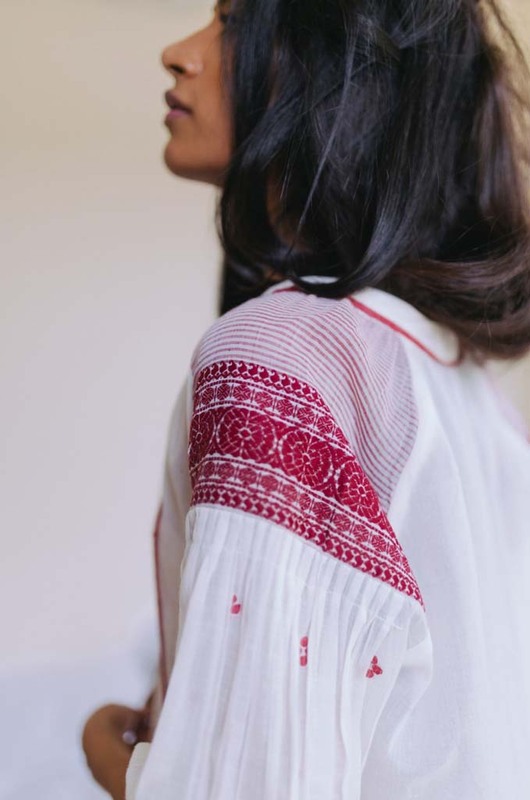 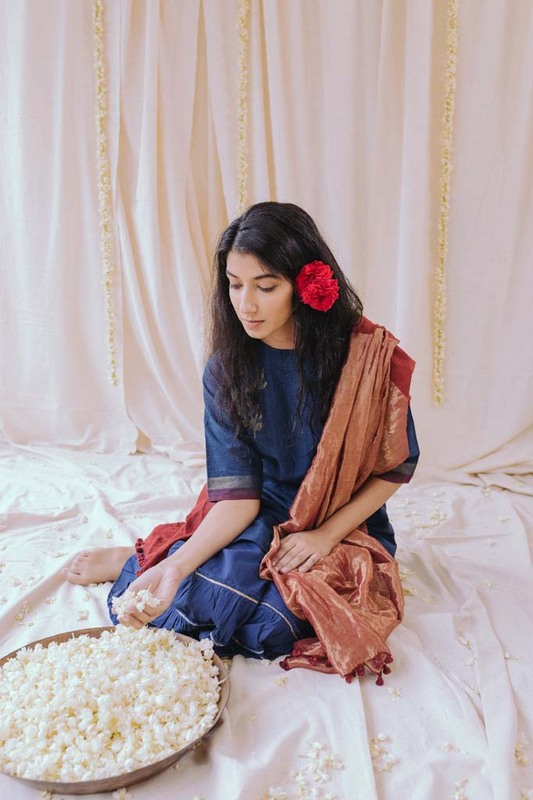 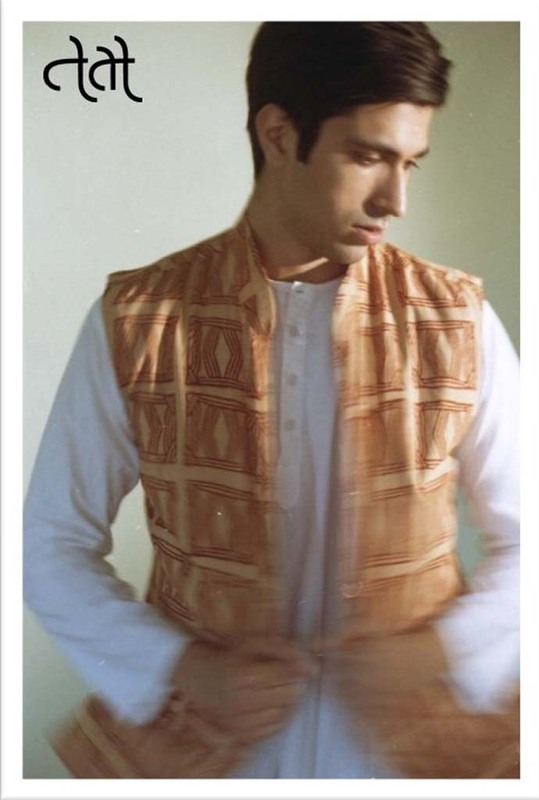 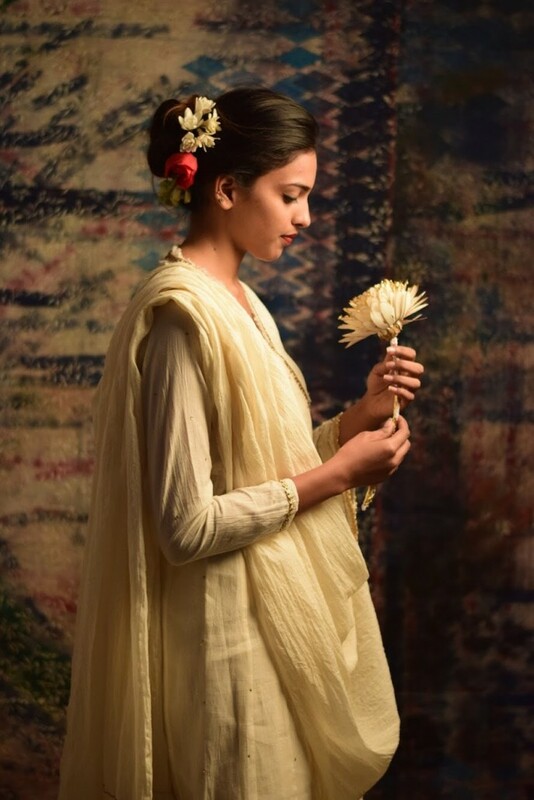 Techniques such as Dabu by Ranjan Chippa, Bagru by Dheeraj Chippa and the use of Khamir’s handwoven kala cotton makes each Tath piece a unique style statement. 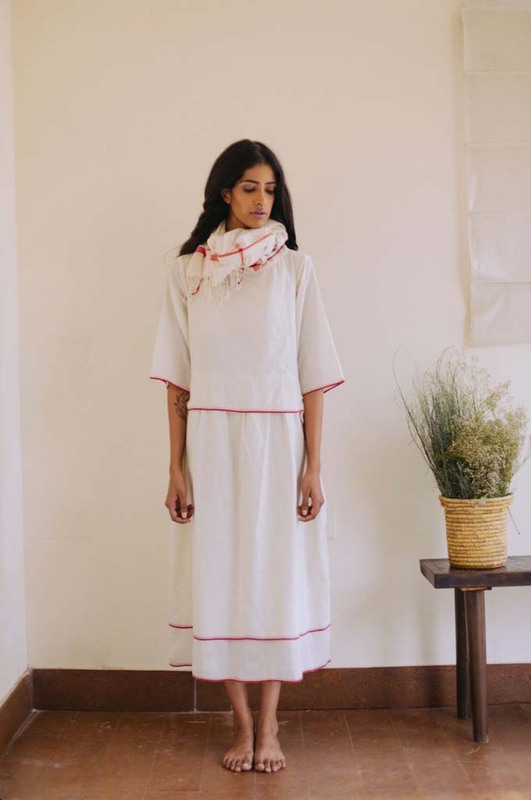 आcai founded by Rohini Ramamurthi seeks to use traditional ornamentation to create accessories and footwear for today’s women. 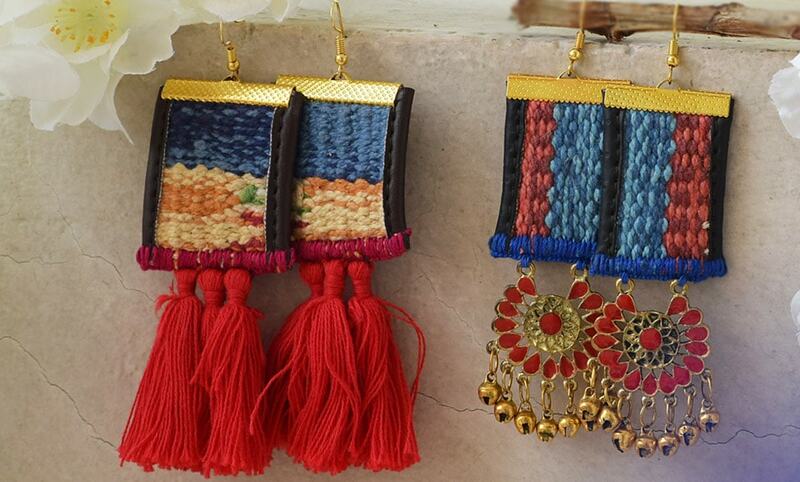 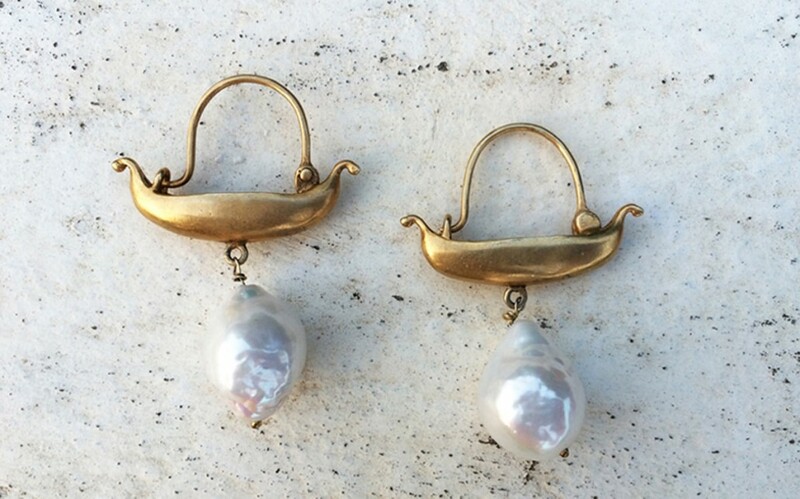 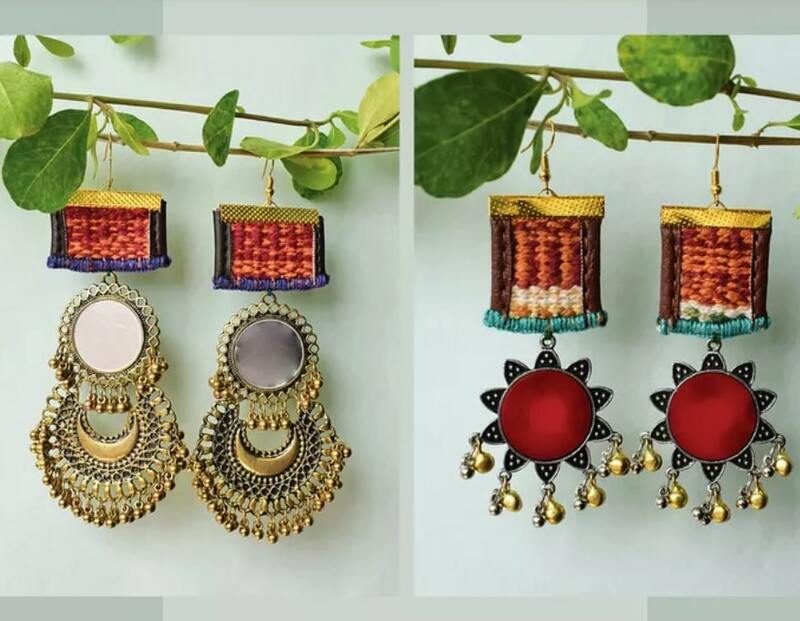 Rohini uses brass temple jewellery sourced from Tamil Nadu, embroidery done by West Bengal’s artisans and crochet for her ingenious accessories, leather footwear handsewn and produced in Karnataka by craft artisan turned entrepreneur, Sunitatai Vanmore. 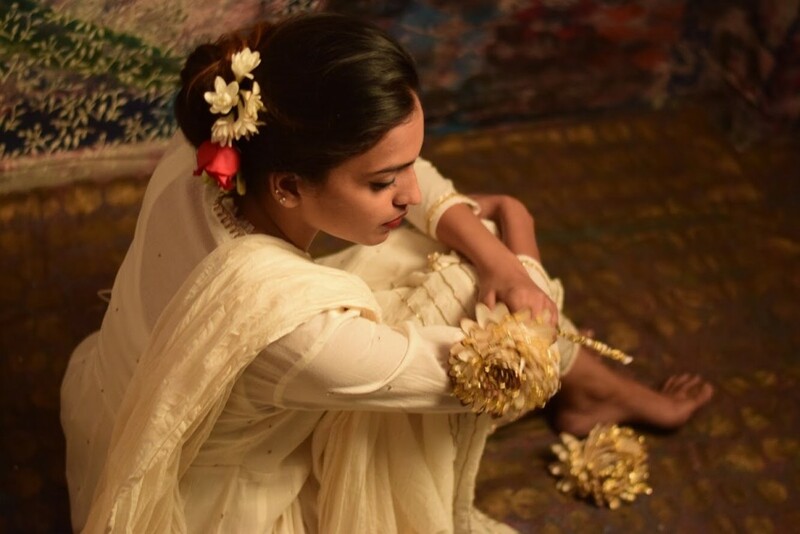 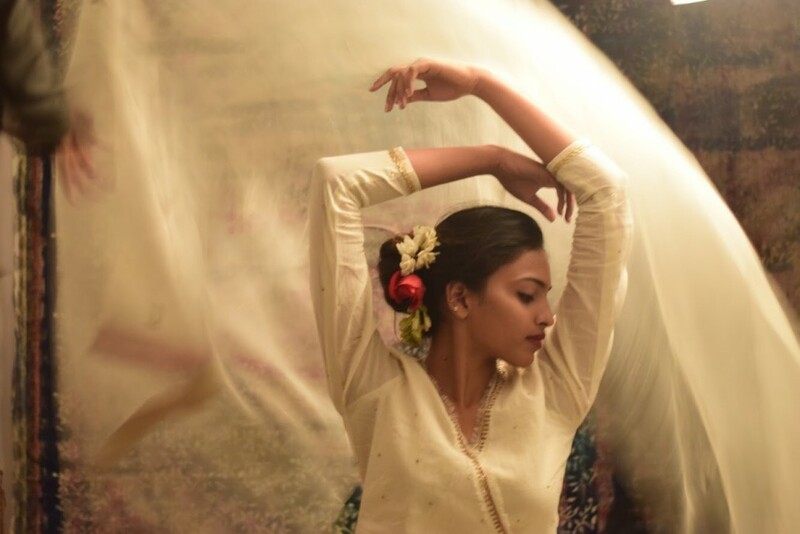 Founder and designer Tanushree Chatterjee Basu’s new collection by Shorshe unfolds like a diaphanous dance of loom and symmetry. 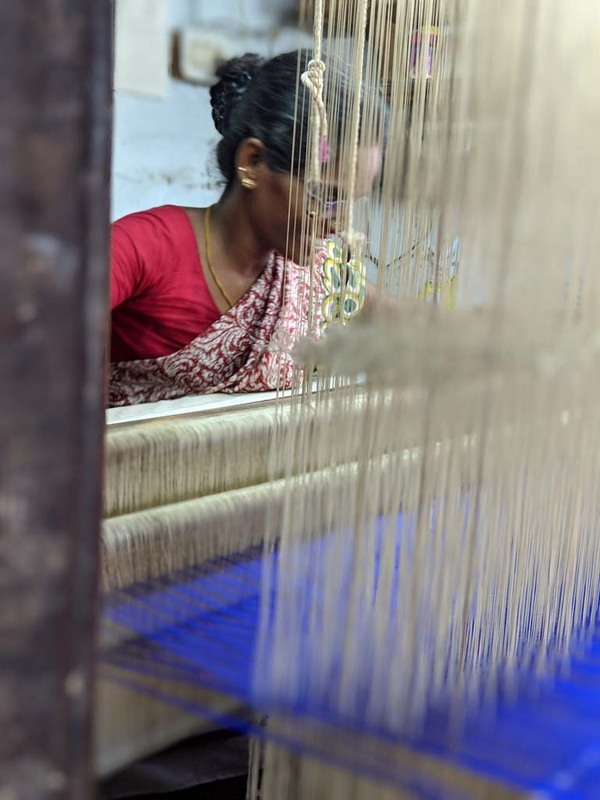 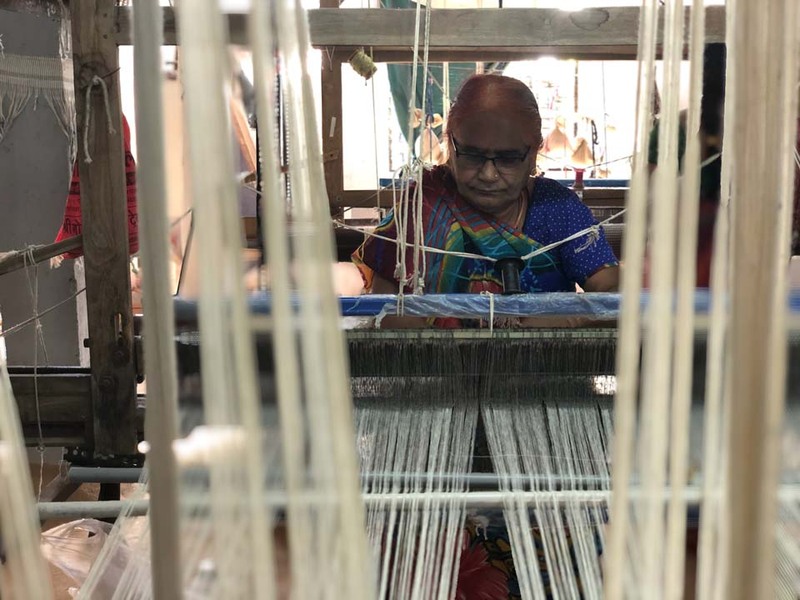 She works with 50 permanently employed weavers of Nadia district in West Bengal to customise the treatment of fabric, the colour palette, the motifs etc to create new collections. 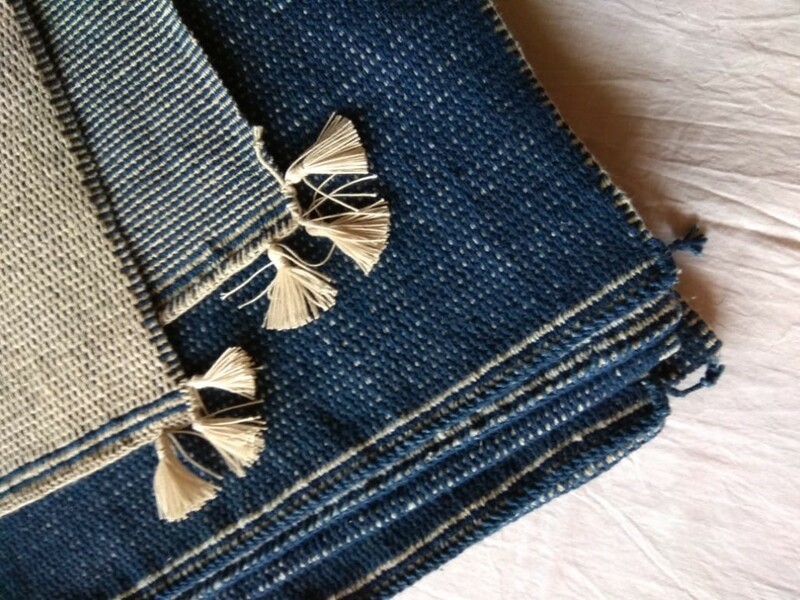 At Shorshe she customises traditional weaves with a view to reviving them. 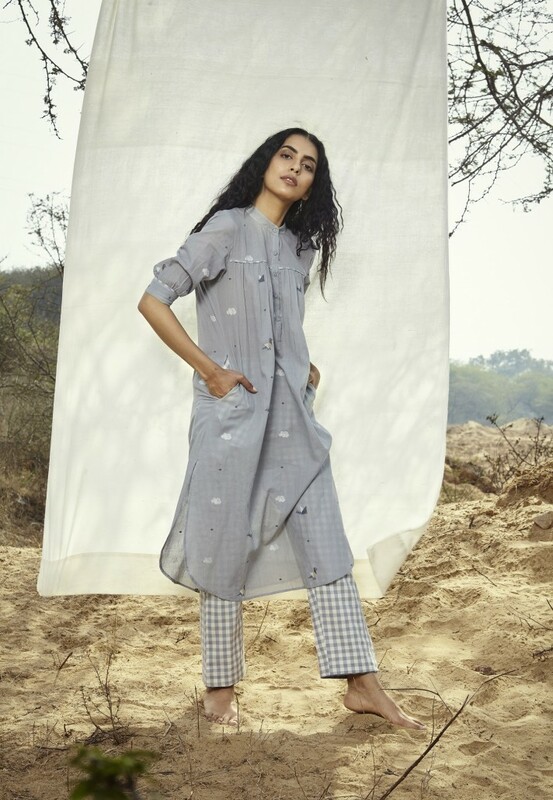 Her new collection has straight lines, graph-book checks, circles and parallel lines which appear woven into the fabric, changing the way one perceives muslin with embellishments in thread & zari jamdani motifs. 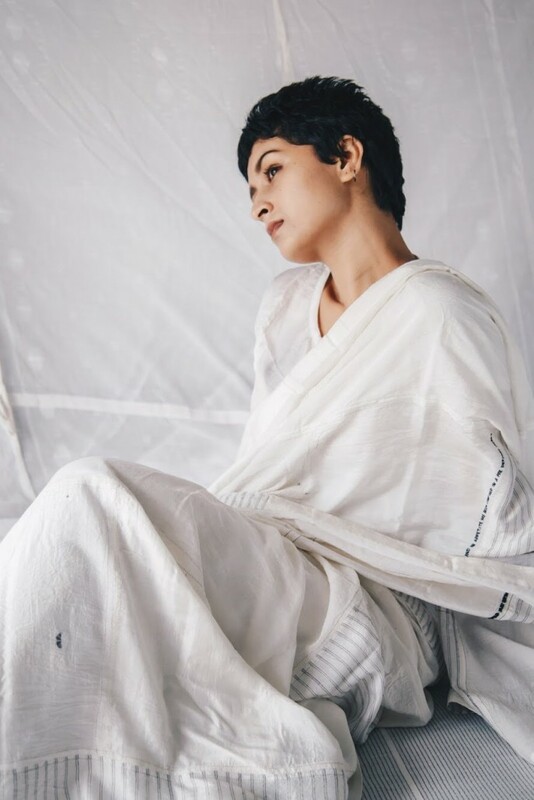 The classical red and white Bengal sari is combined with whites and touches of indigo. 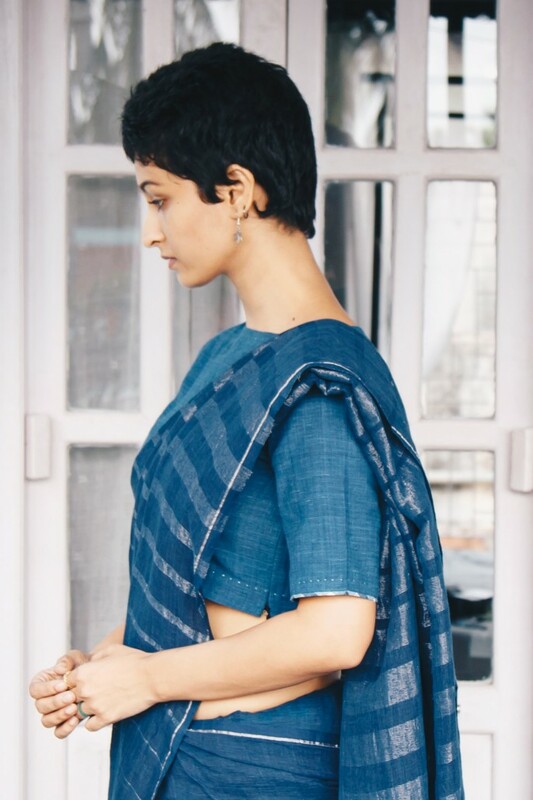 Feels like you are draping your grandmother’s soft comforting sari but with a modern form and silhouette ! 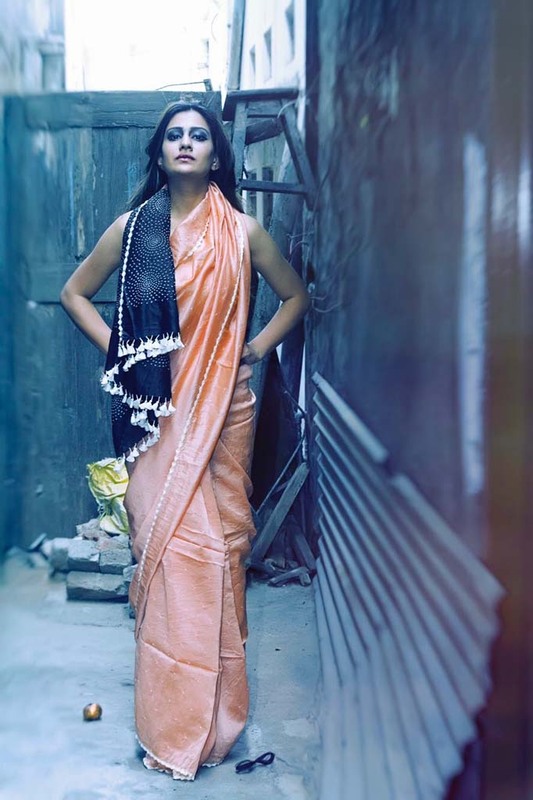 Her exquisite blouses give an edge to the sari completing the outfit. 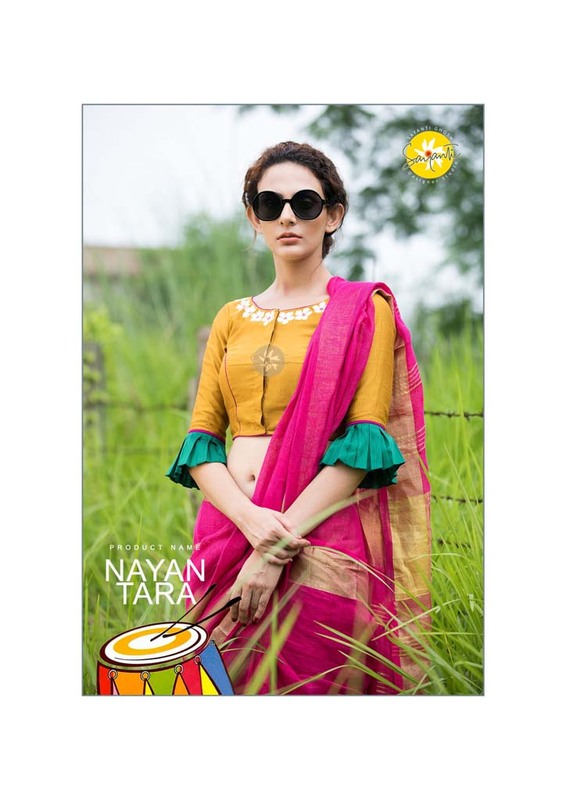 The patterning and weave of the cotton blouses revolves around nature, inspired by the lotus ponds of rural Bengal, the powerful mythologies of Jagannath in a play of mesmerising colours. 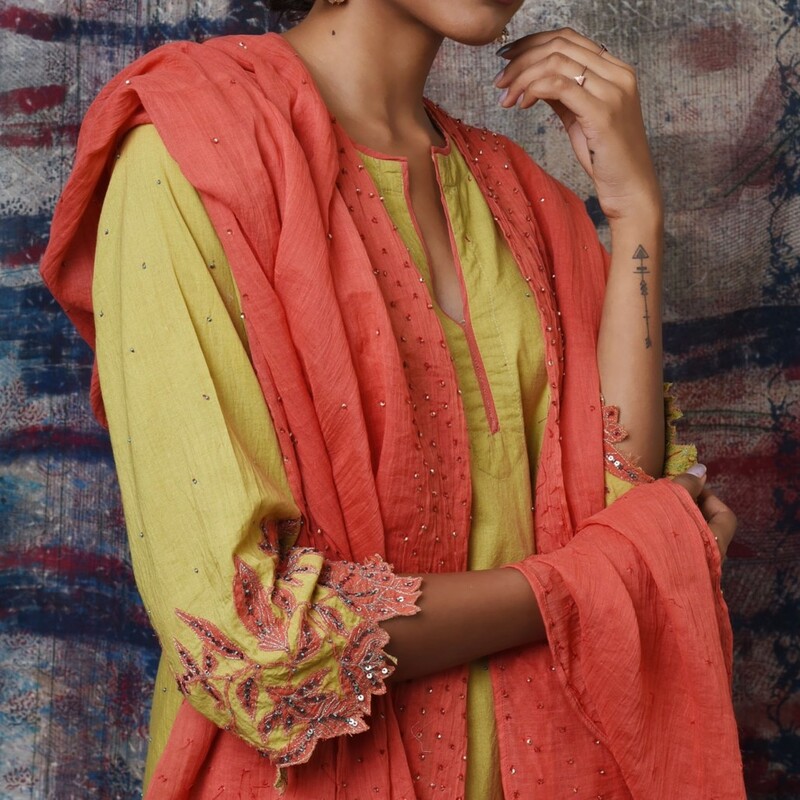 The blouses feature embroideries, kantha work and batik – each an individual piece of nuanced craft – or is it art ? 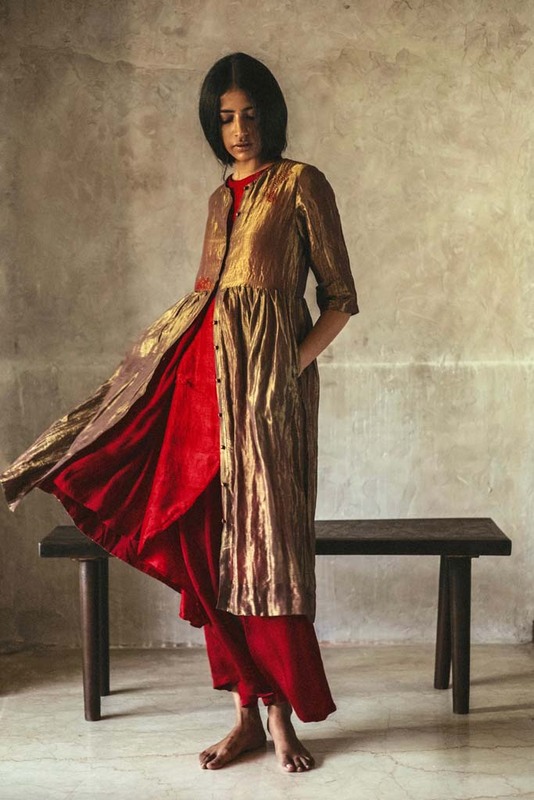 Jaipur based label Resha’s founders are designers Medhavini and Manish. 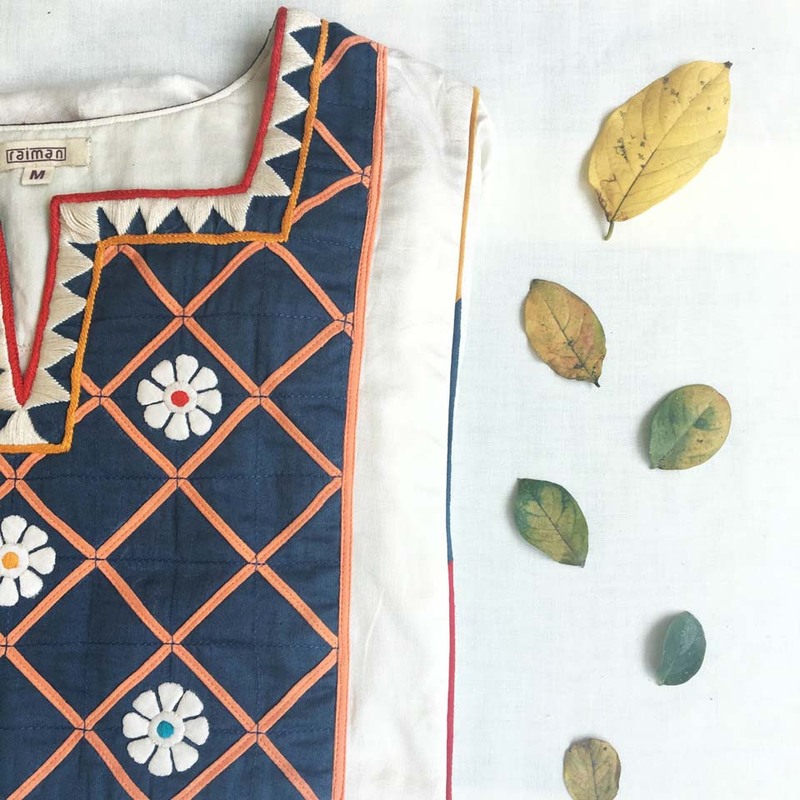 Their forte is hand block prints from Rajasthan & Kutch in natural colours on fabrics which they design that are woven by weavers. 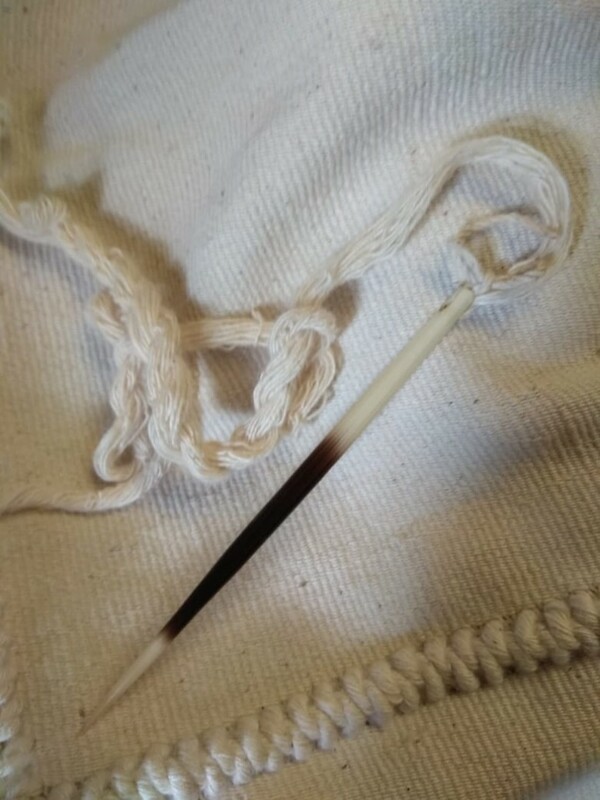 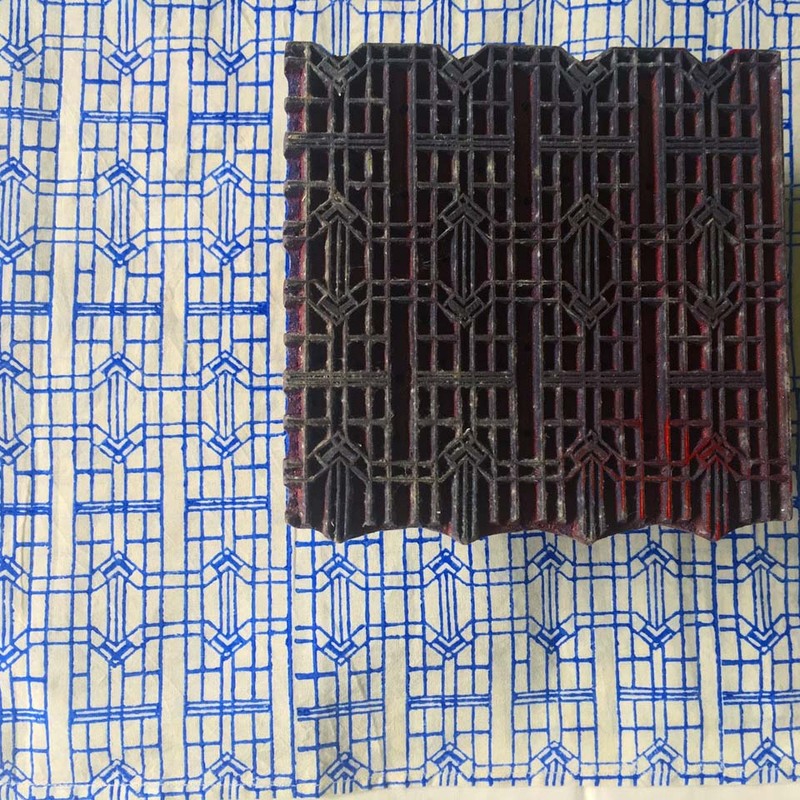 The weaves often reflect new techniques and patterns. 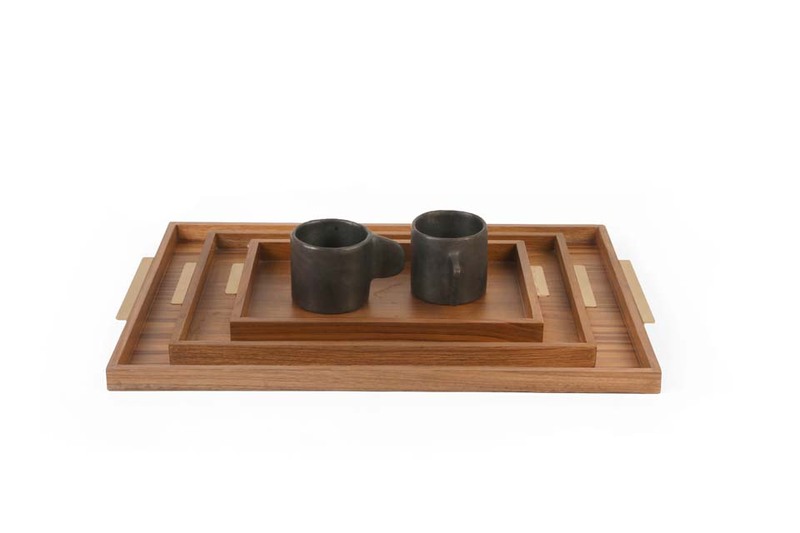 The blocks too are specially designed by Medhavini. 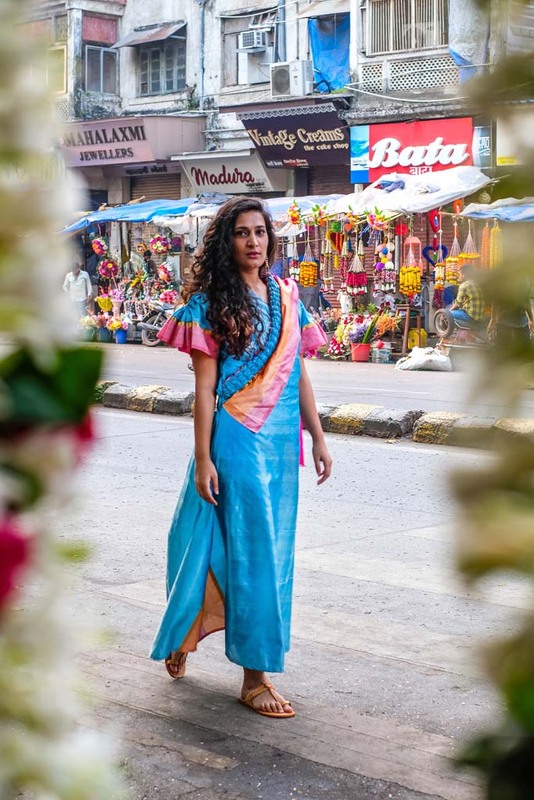 Experimentation with new colours and shades is a passion though their favourite dyes are indigo, turmeric and ferrous which are reflected in the Resha line of saris and dresses. 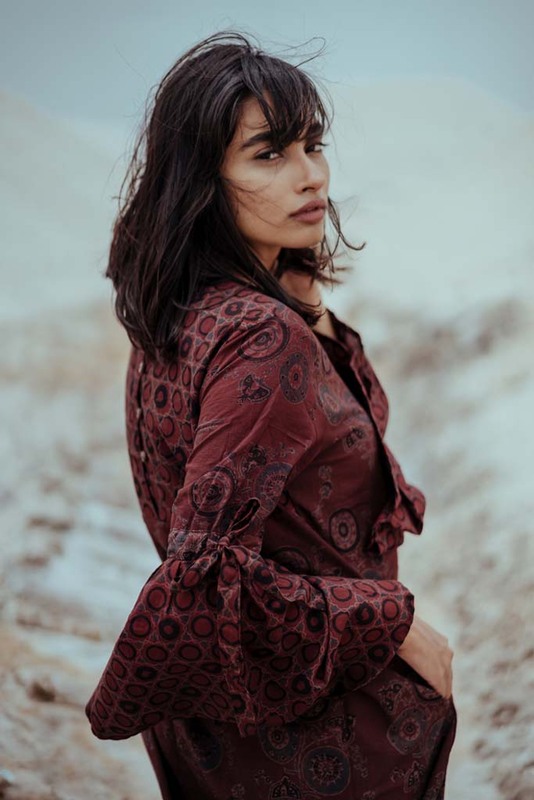 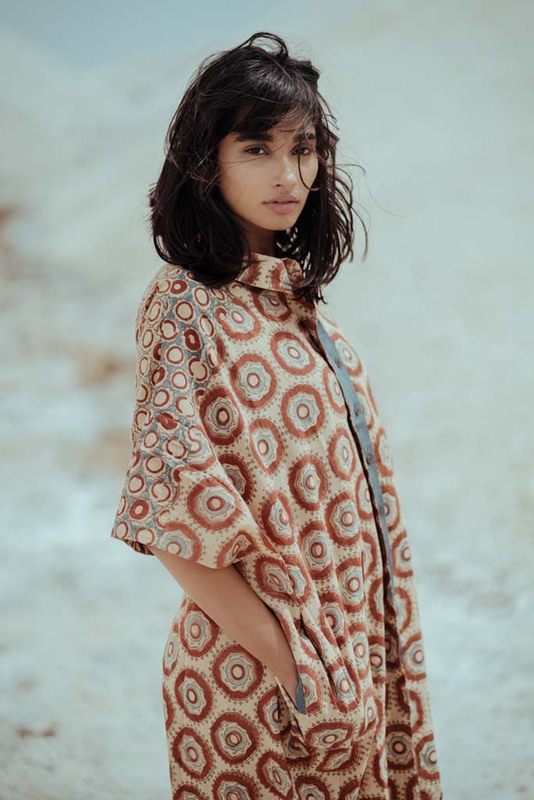 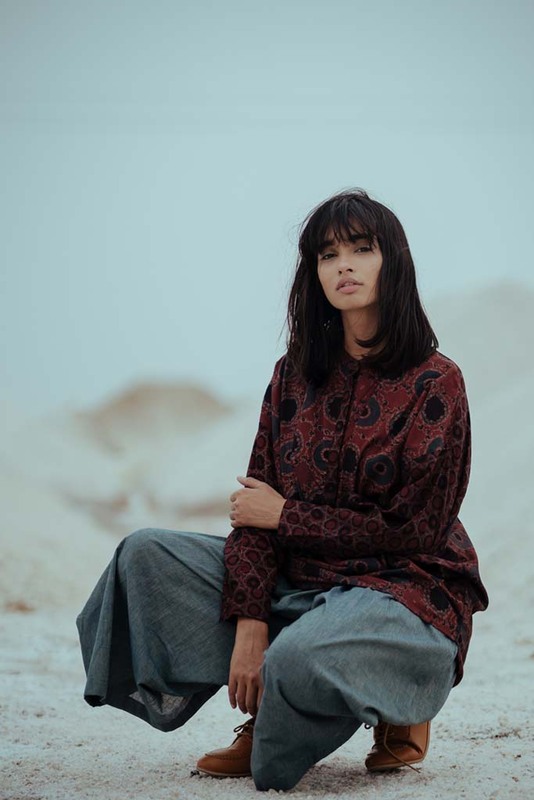 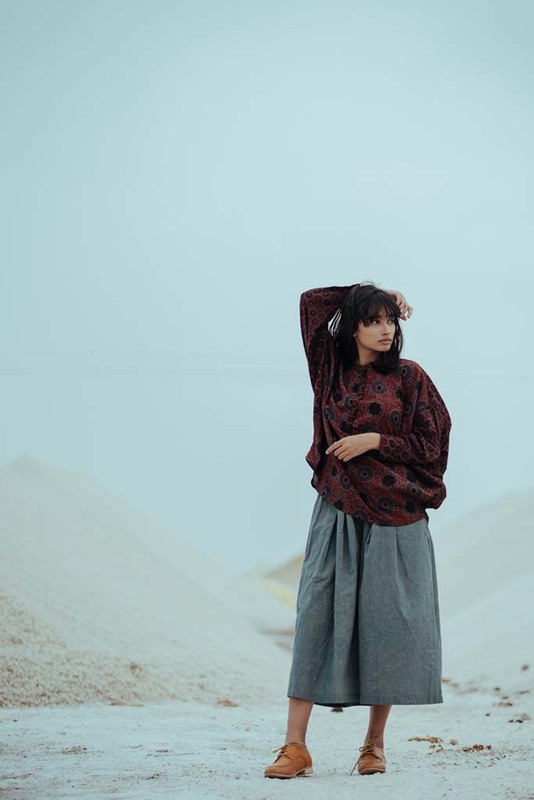 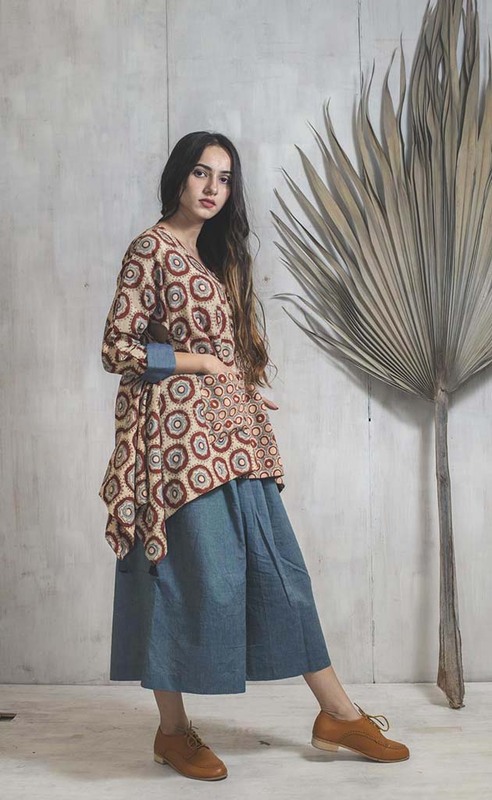 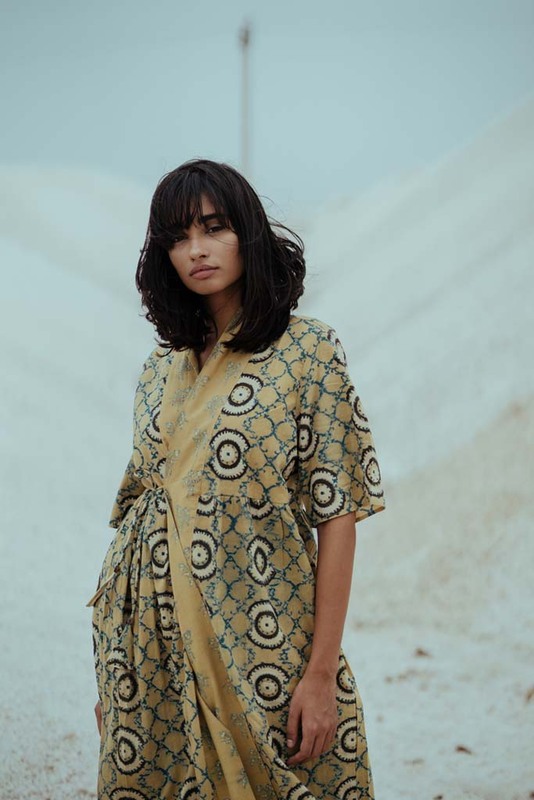 Delhi based designer Raiman Sethi’s passion with a focus has been to revive vintage Indian crafts ethically into a modern context while investing design with a ‘desi’ focus. 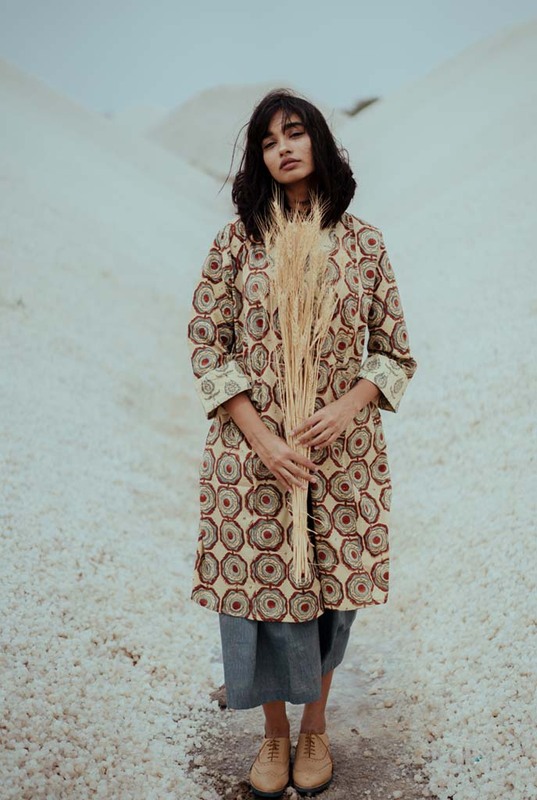 The Raiman label is the creative brain child of this endeavour. 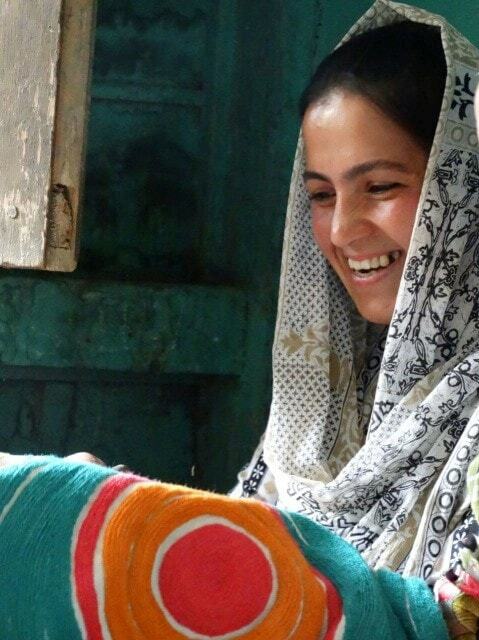 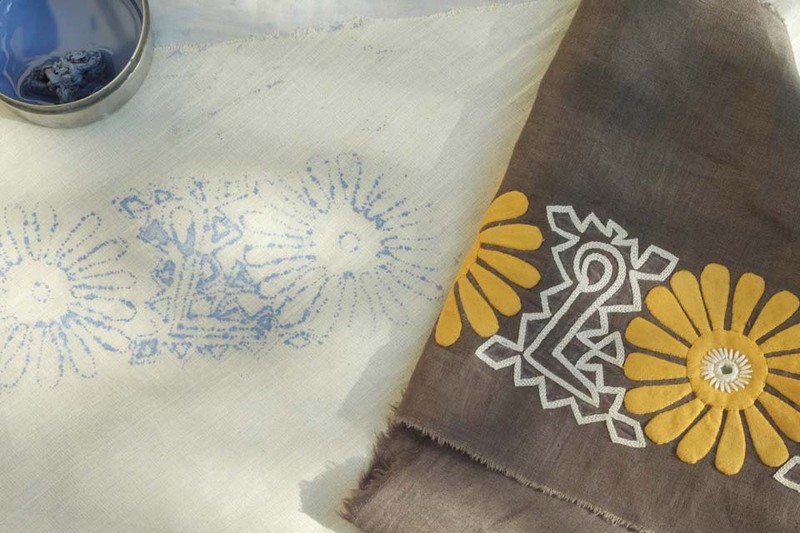 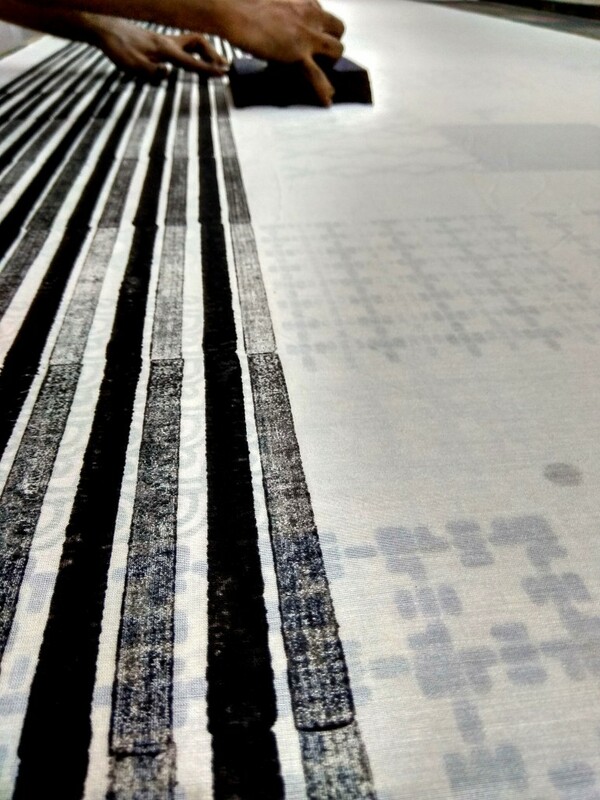 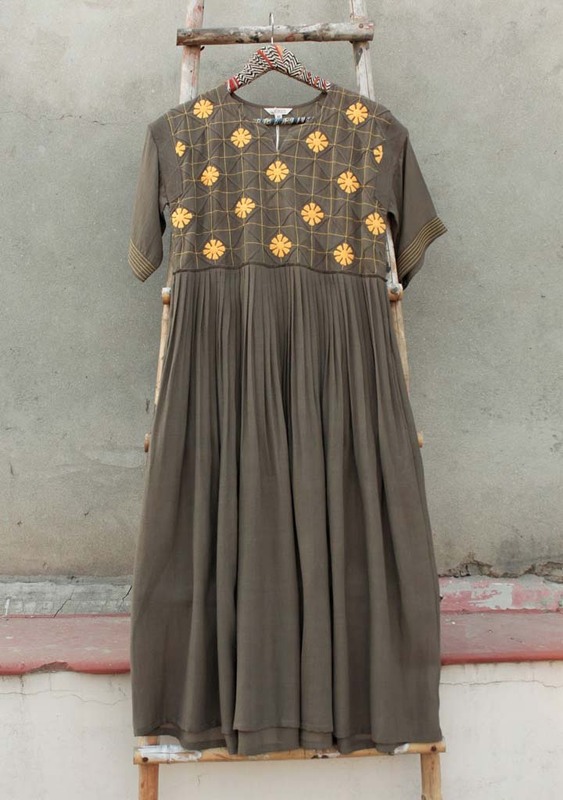 Raiman Sethi works with block print clusters in Rajasthan and uses vegetable and mineral dyes for her textile line. 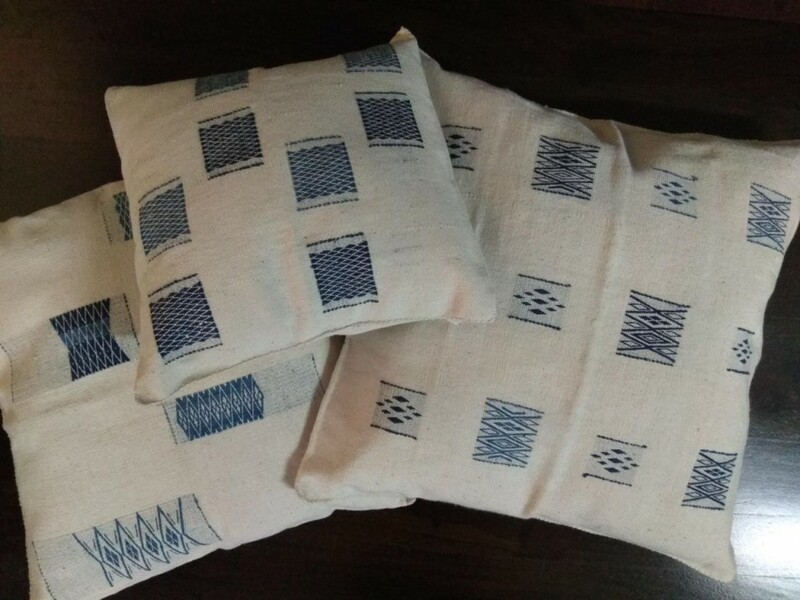 Fabrics used are mulmul and organic variants such as khadi and chanderi. 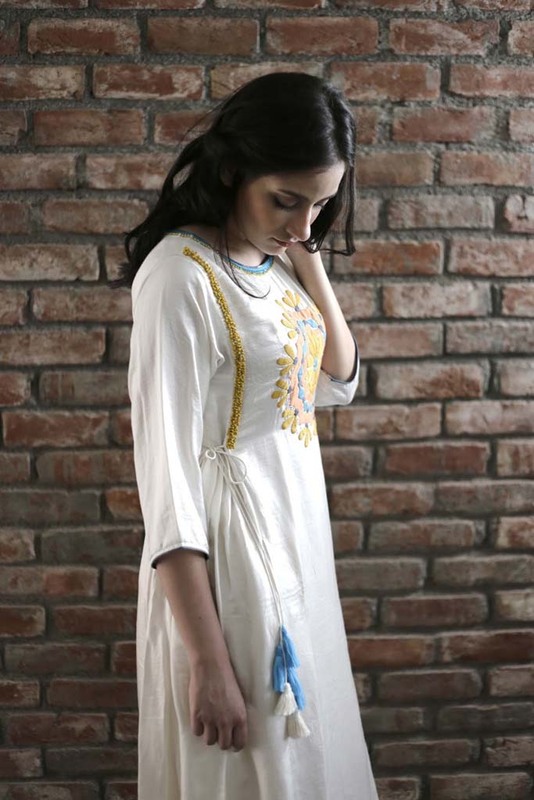 The designer incorporates hand appliqué embroidery in her work. 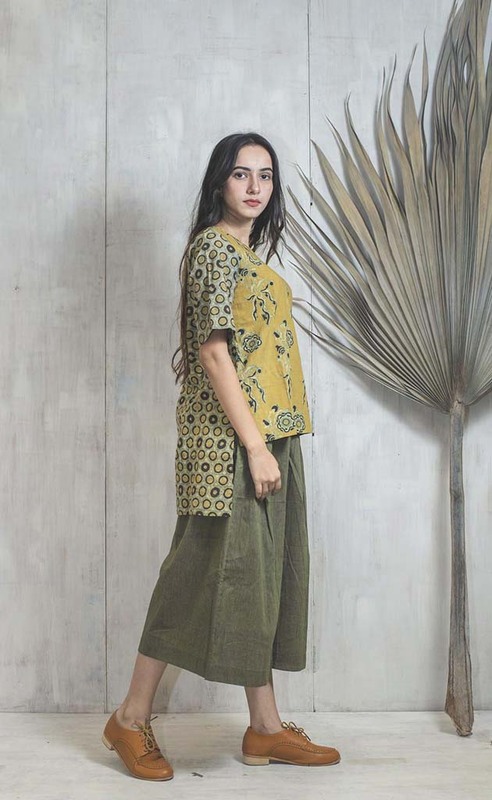 She makes sure that left over raw material is utilized in unique ways to style the outfits on display which are 100 percent sustainable by ensuring zero waste. 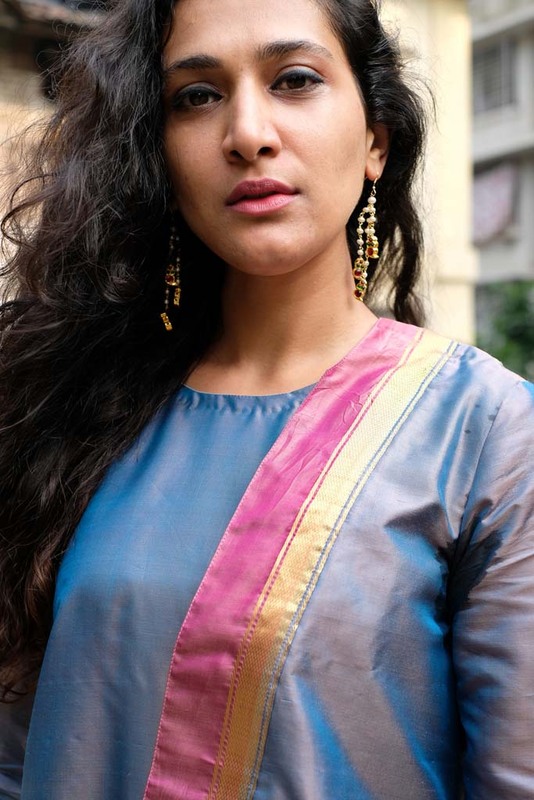 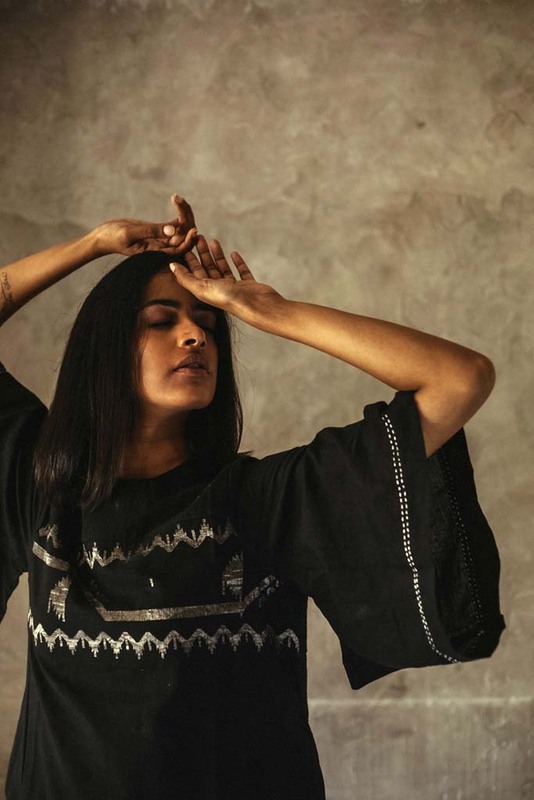 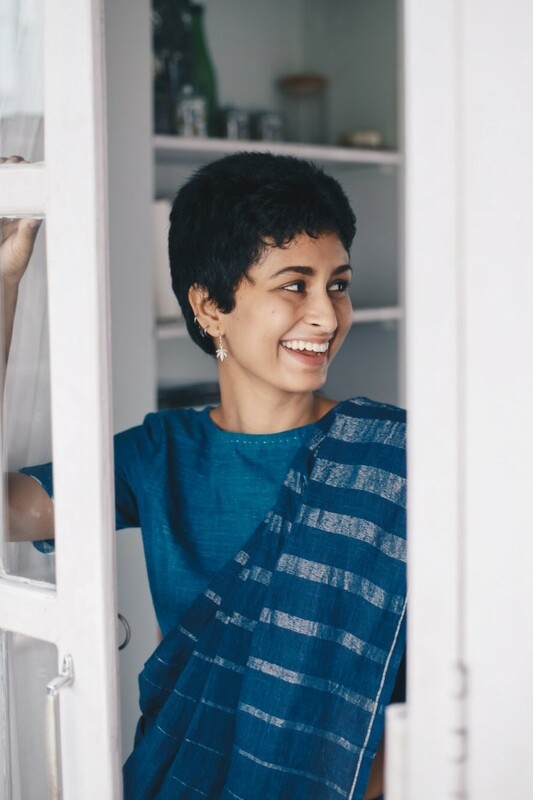 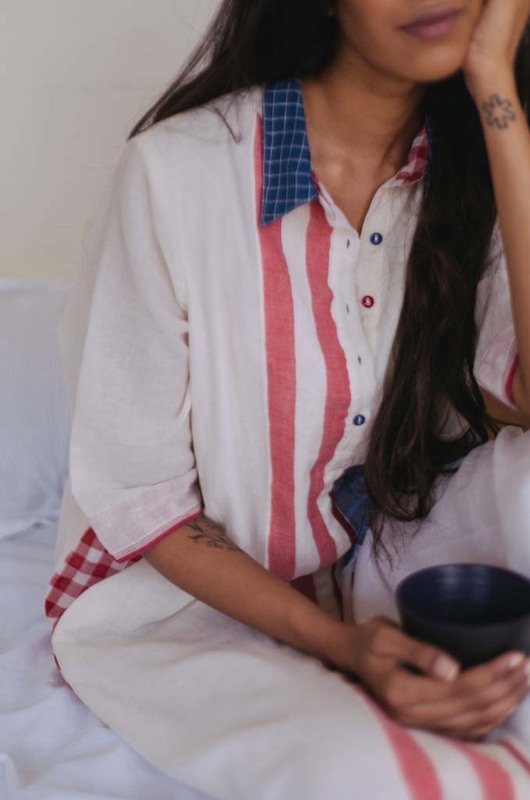 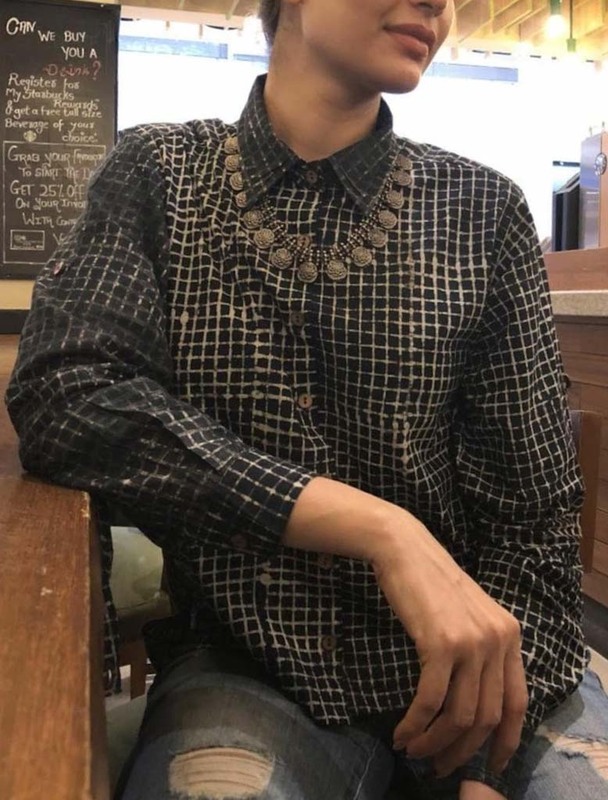 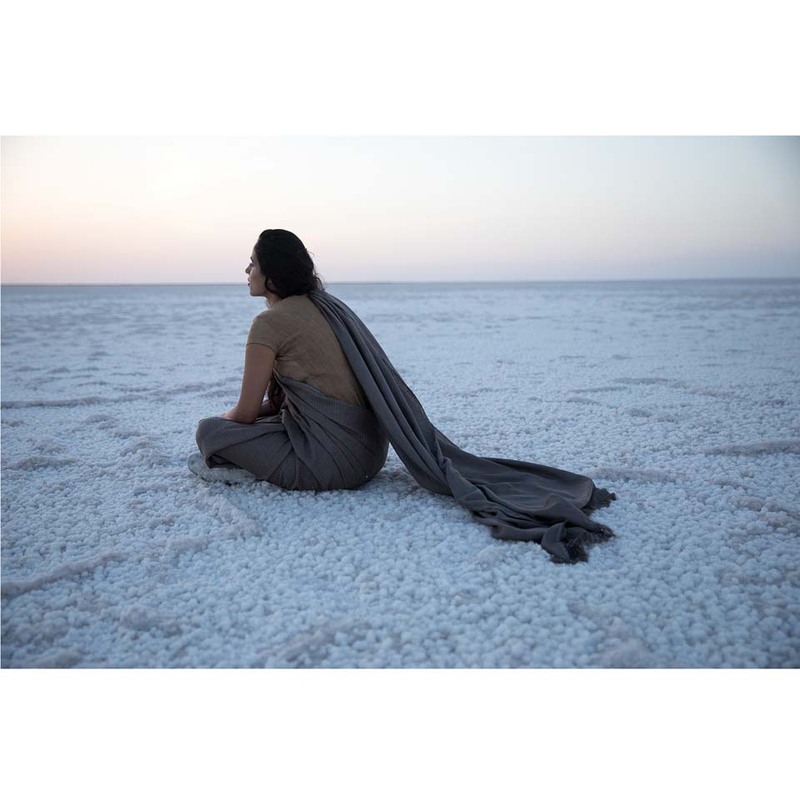 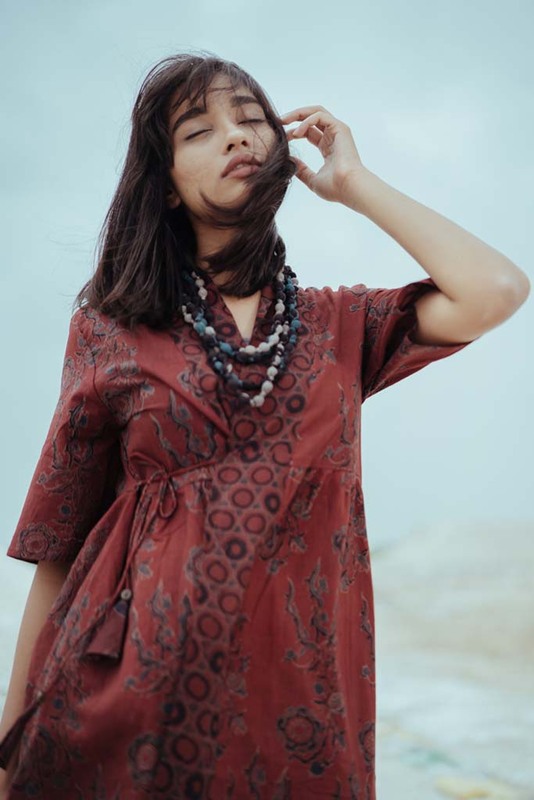 Mumbai based Designer and Entrepreneur Padmaja Krishnan who integrates the work of traditionally skilled artisans with modern design practices along with sustainability and social responsibility in her work philosophy creates non-confirmative, quirky and peaceful clothing, accessories and handcrafted products. 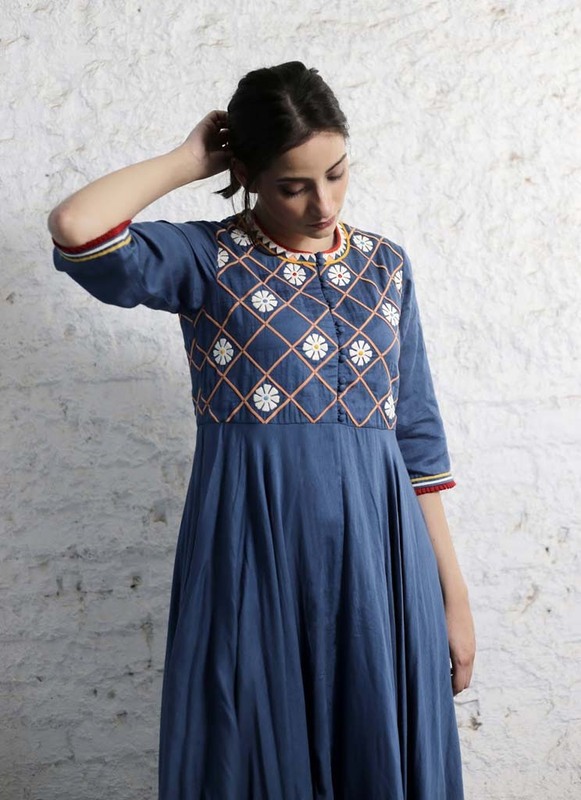 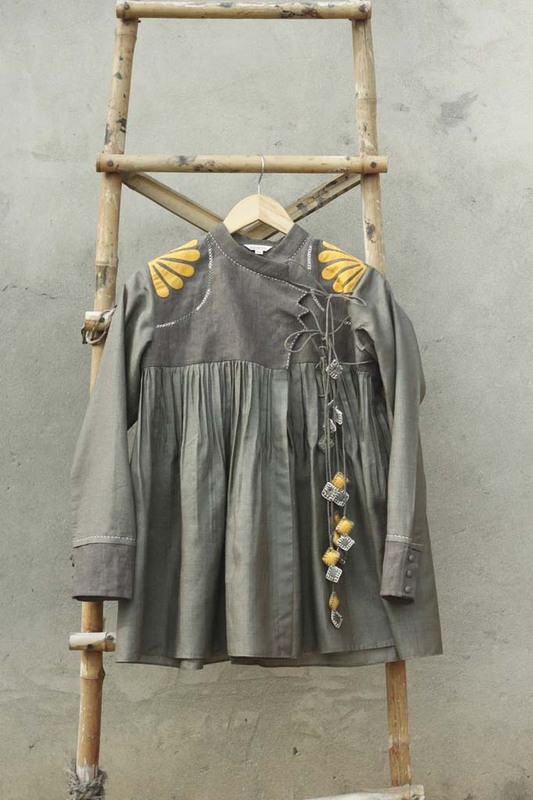 Her collection endeavours to create clothes that are simple, uncluttered and authentic. 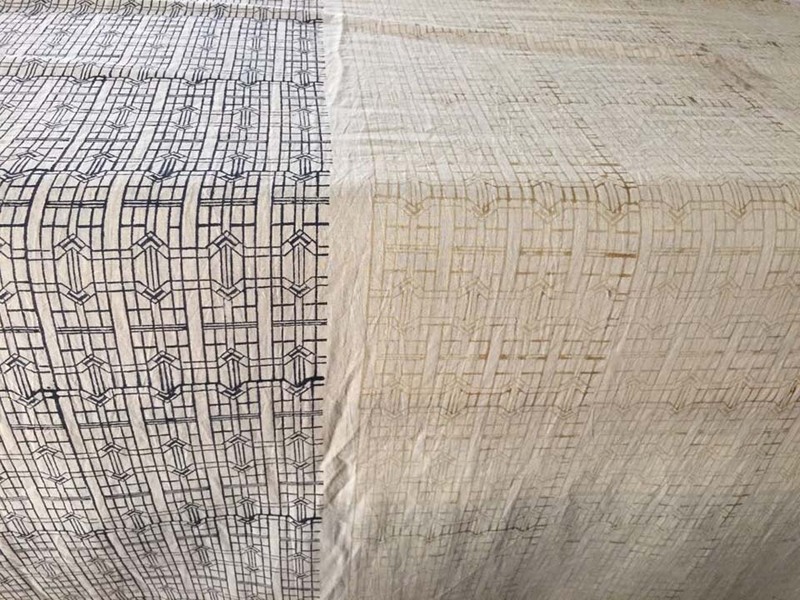 The poetry of imperfections which adds character is visible. 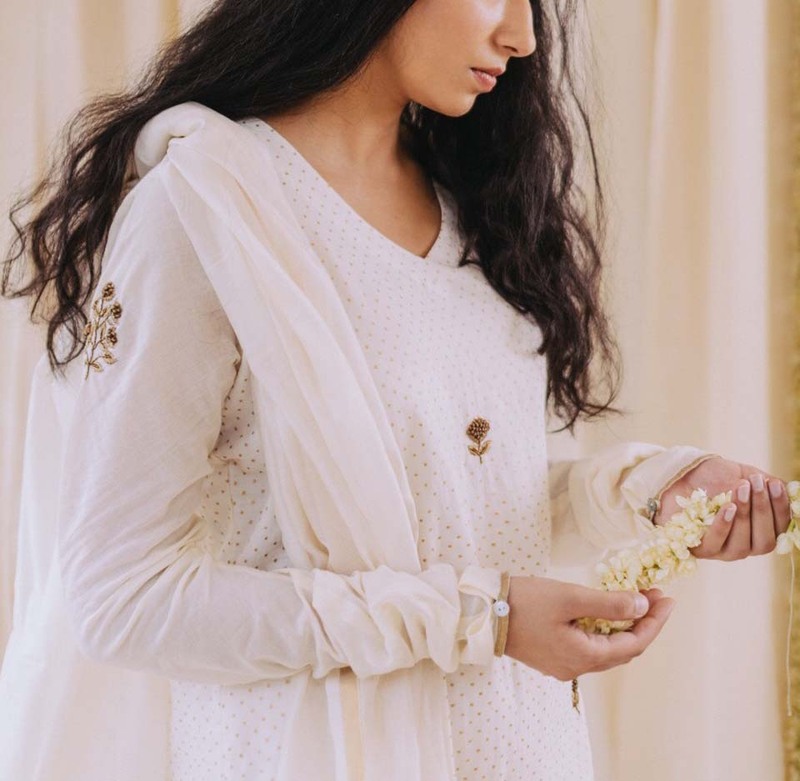 Silks, cottons and blends have been used with a graphic spatter of hand embroidered dots and straight lines to create a festive line of saris, stoles, tunics and shirts. 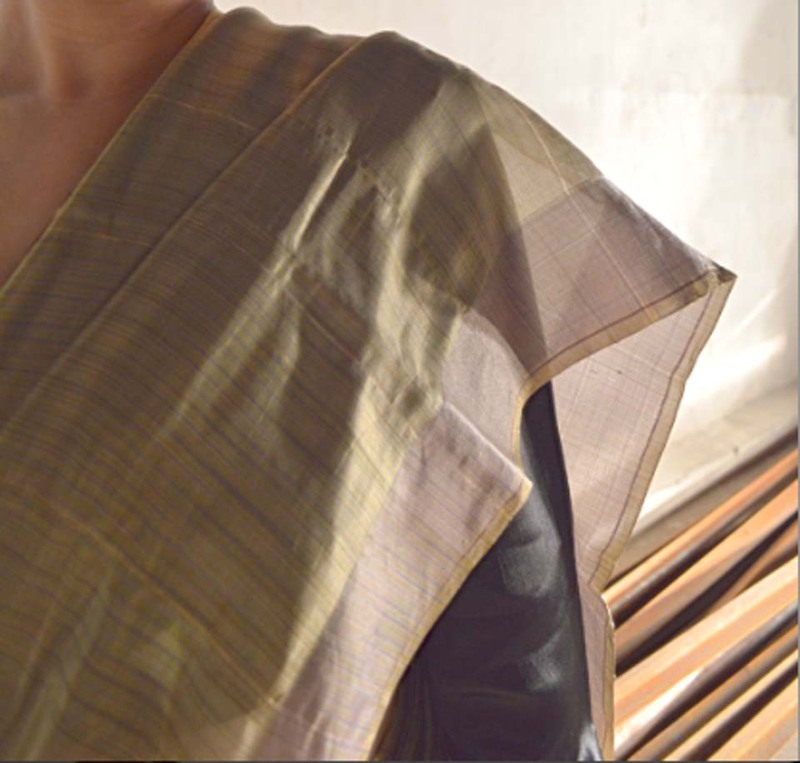 All the textiles have been created in close collaboration with the finest women weavers and spinners of Madhya Pradesh. 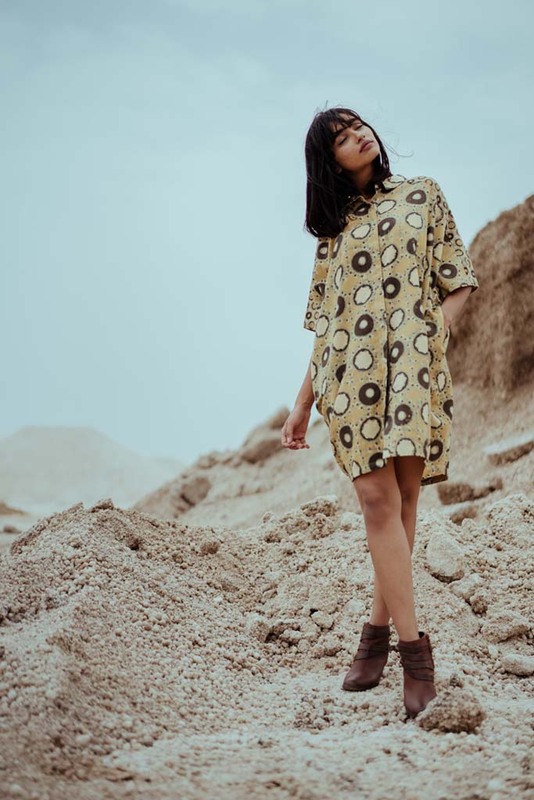 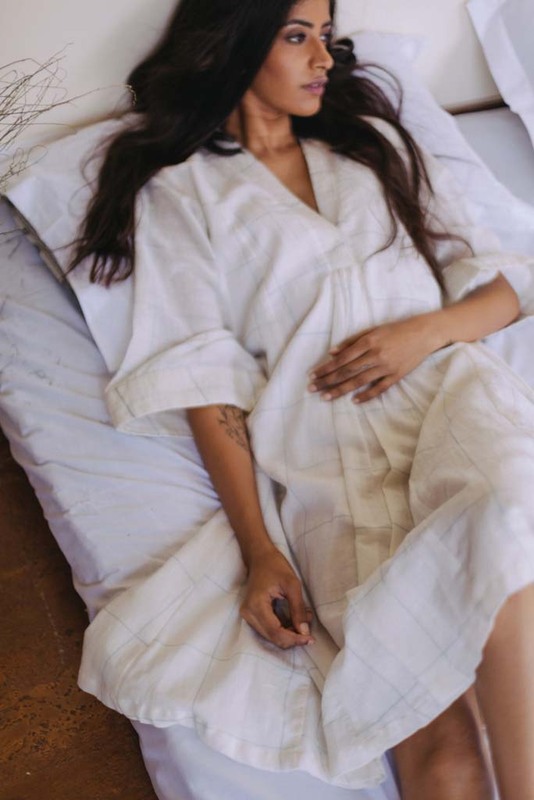 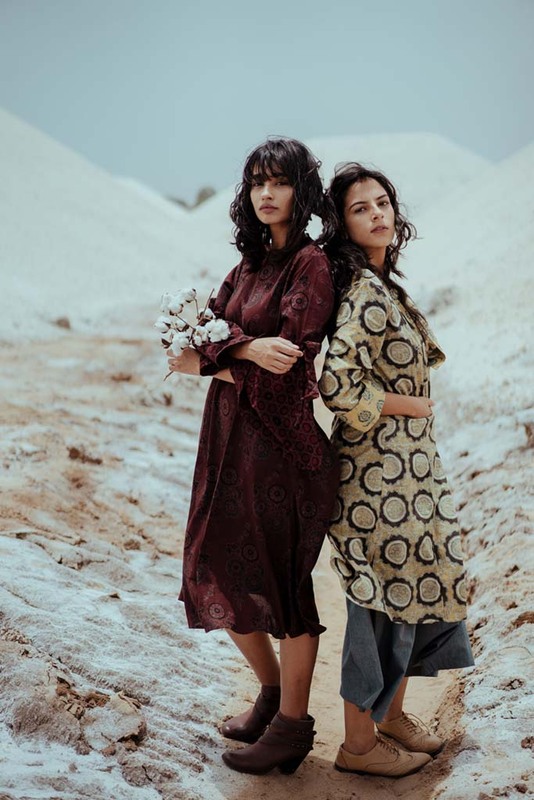 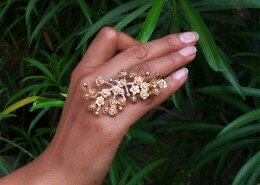 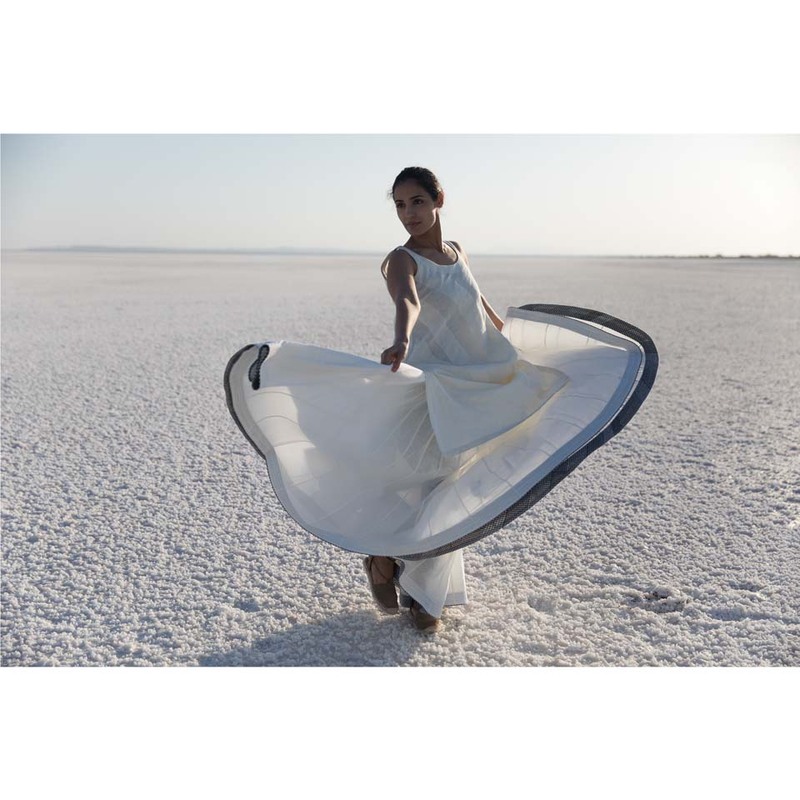 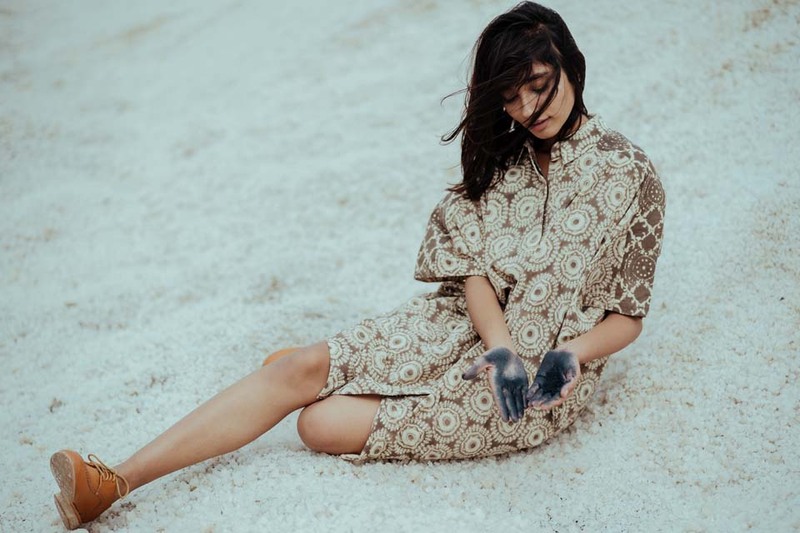 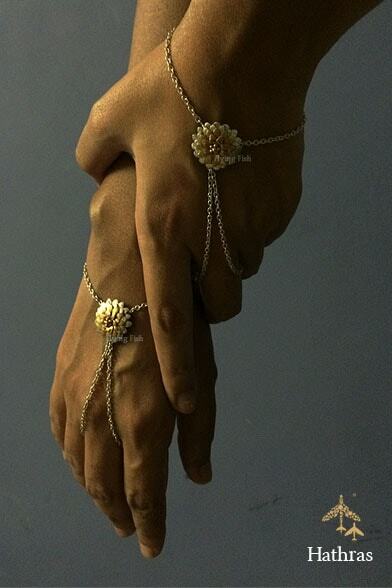 New Delhi based design duo of Aanchal and Sugandh established Objectry in 2015 with an experimentation with form and material while exploring different craft techniques. 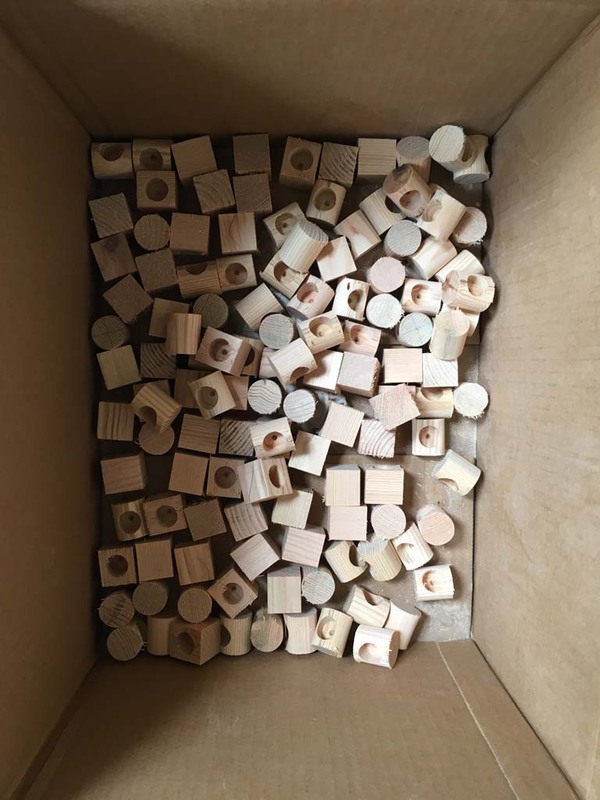 Their Experiment 1 in 2015 was an attempt to make the basics of a product interesting while exploring the properties of wood. 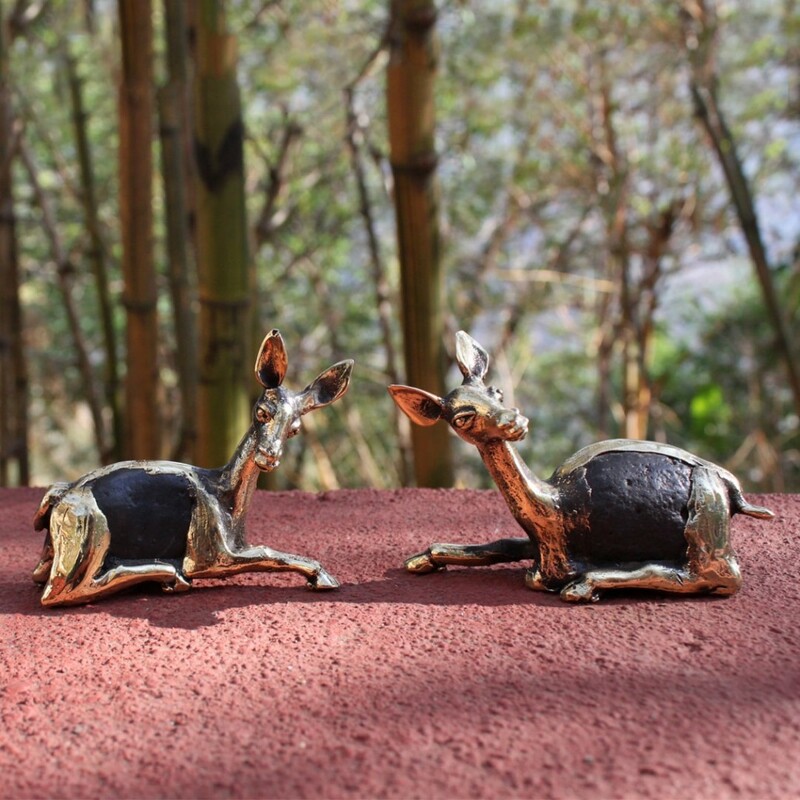 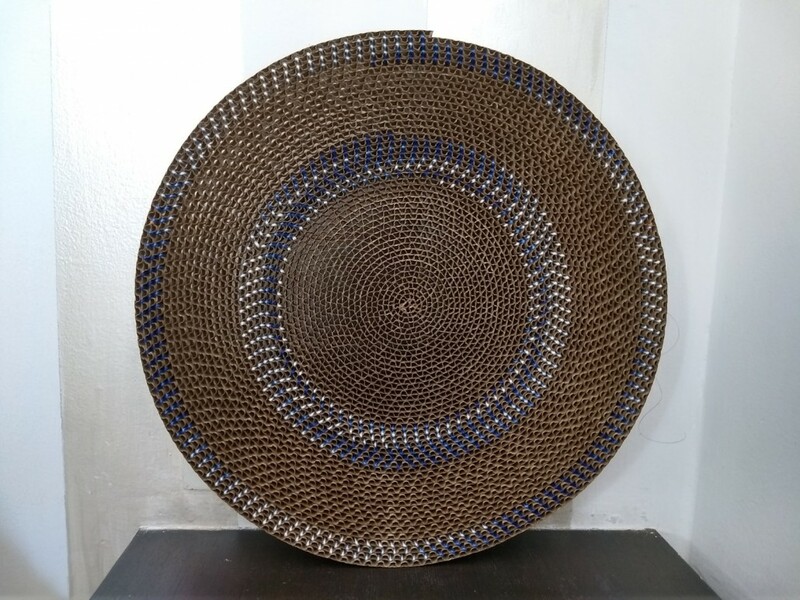 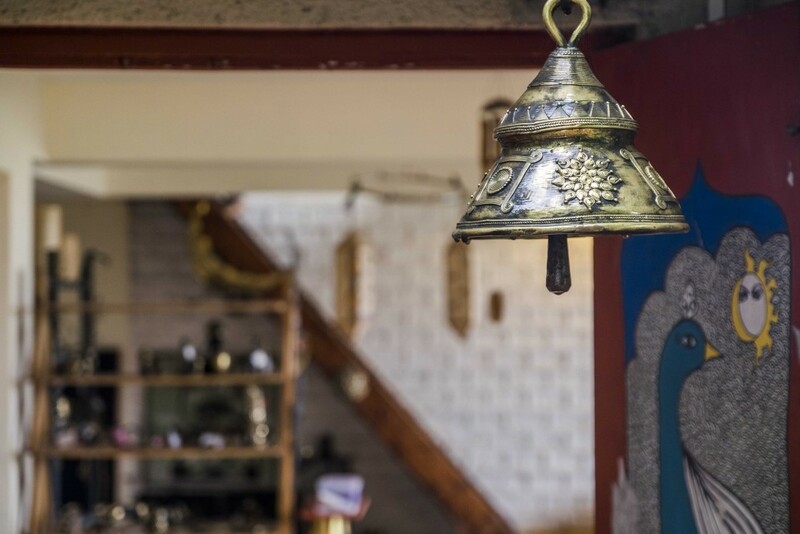 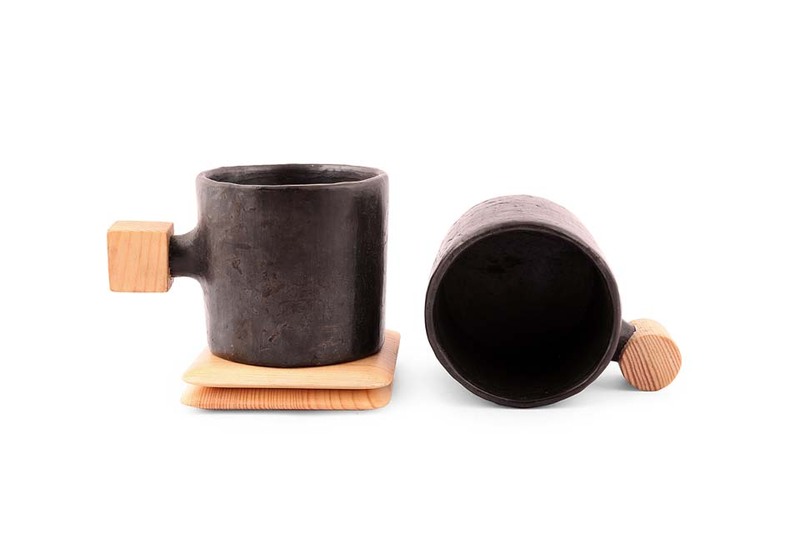 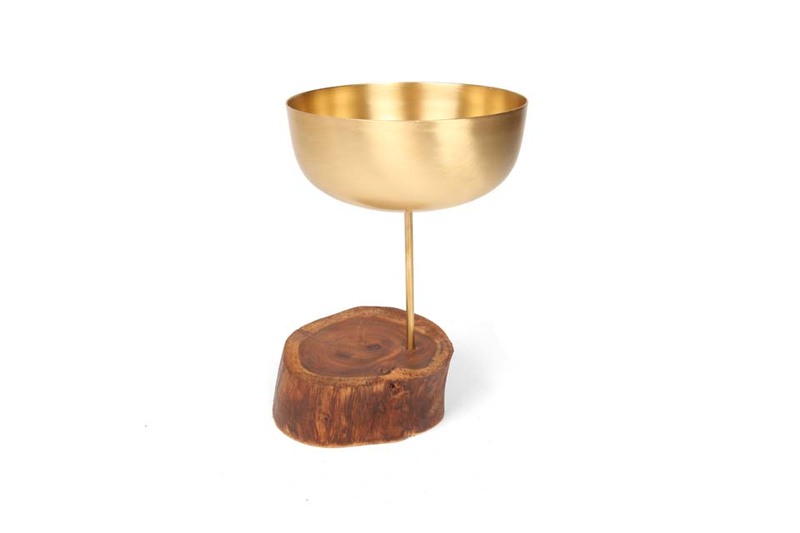 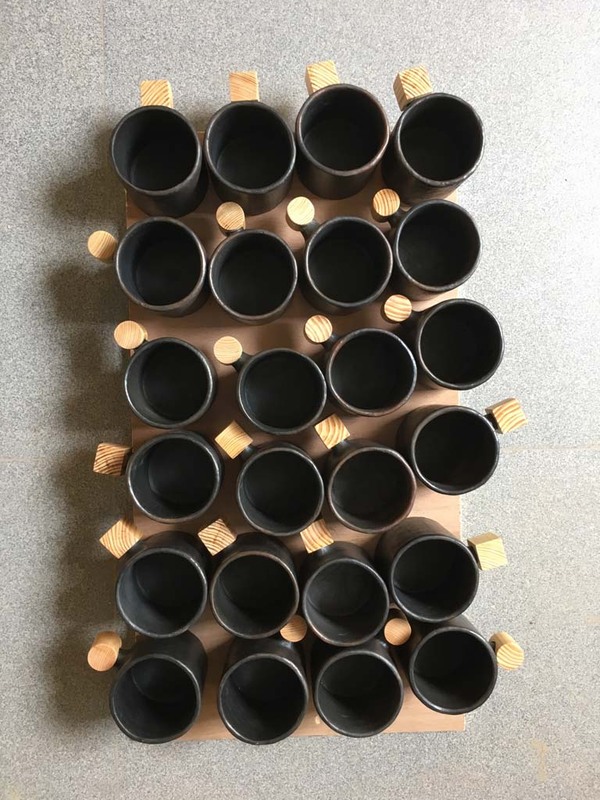 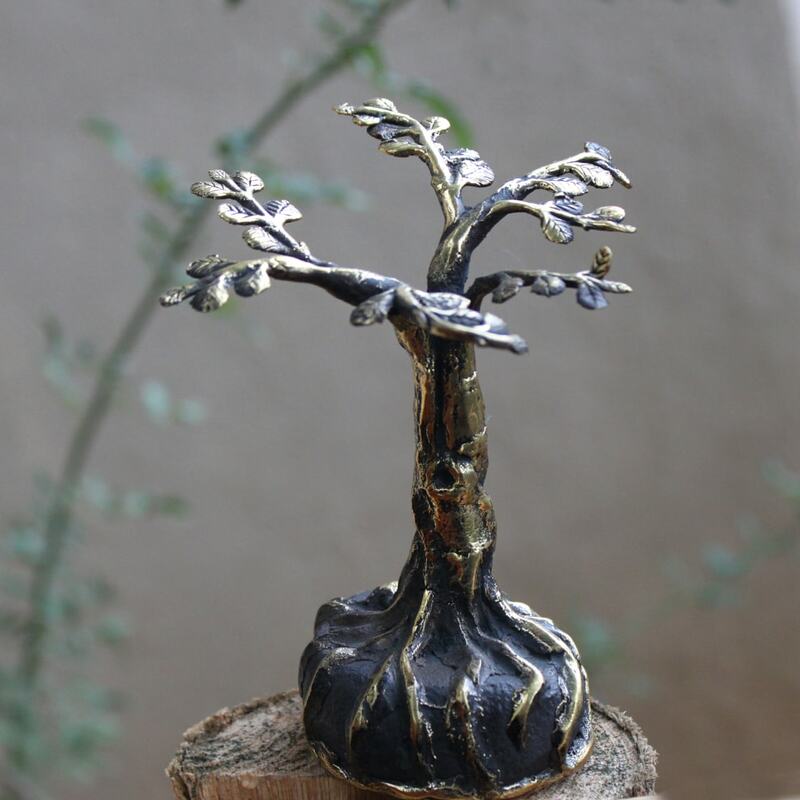 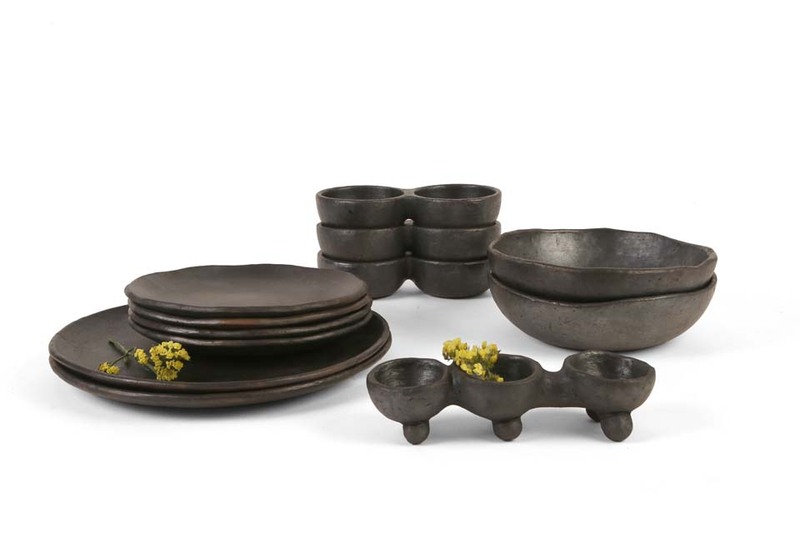 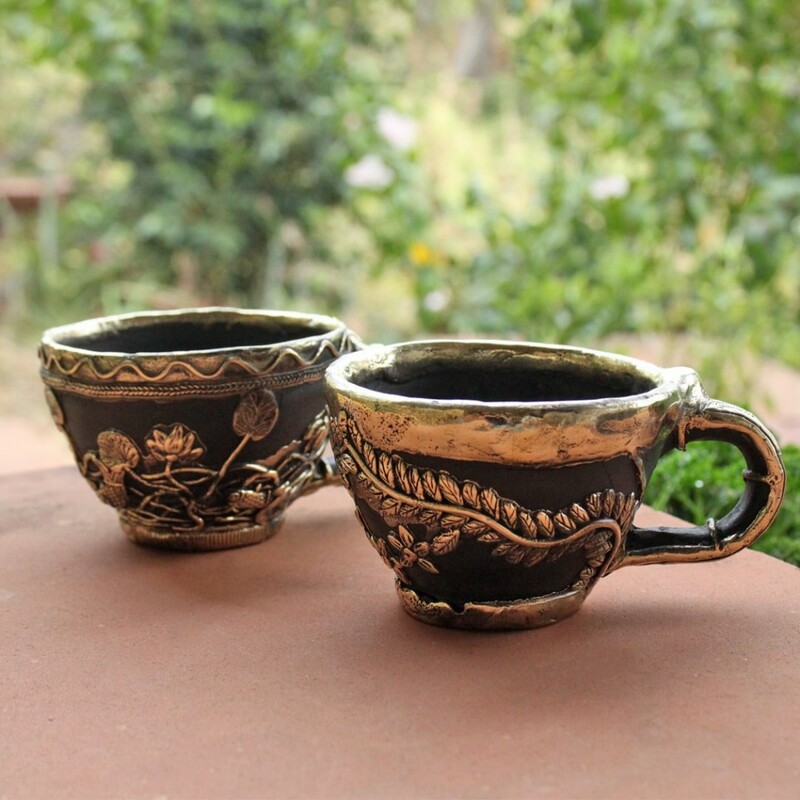 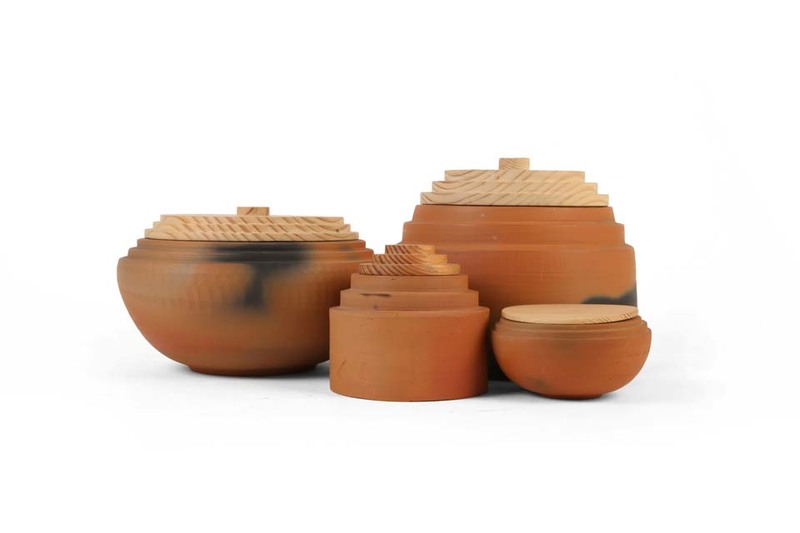 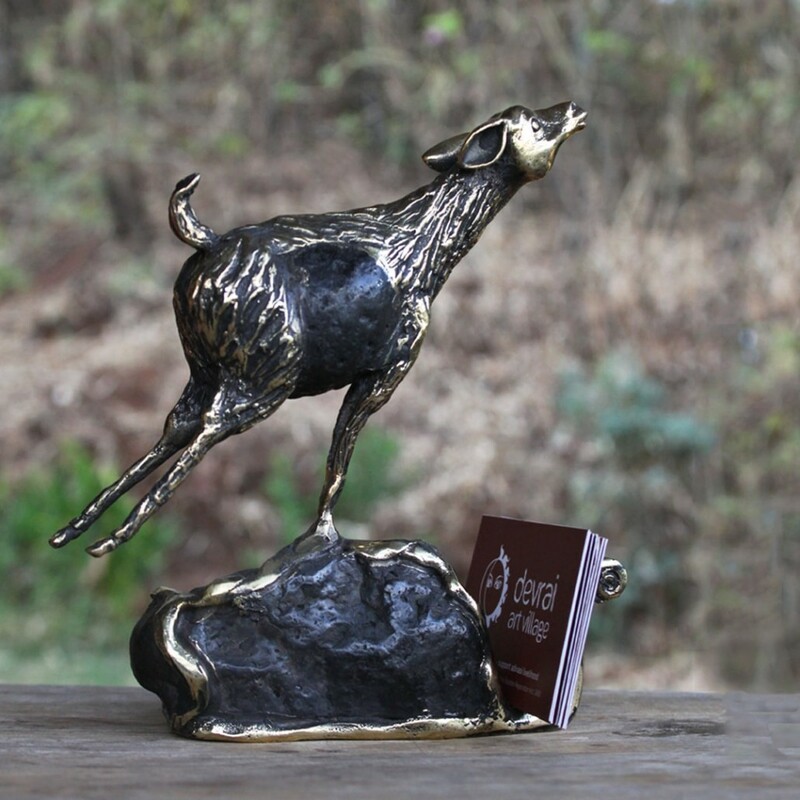 Their work has included table top accessories wit handicrafts such as Black Pottery from Manipur, Stoneware pottery, Terracotta pottery, Wood work from Nagina and Saharanpur, and Metal work from Moradabad. 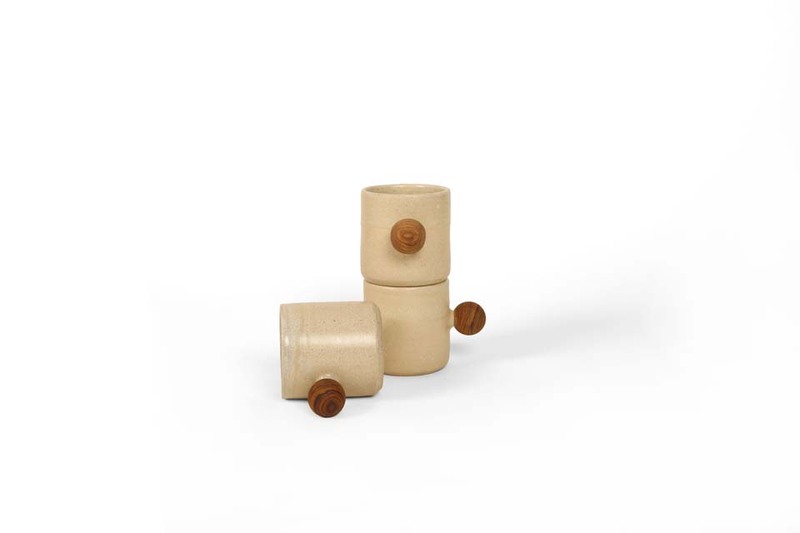 Their ingenious line of product value addition displays clean lines, crisp curves and edges proving that handmade need not necessarily mean irregular. 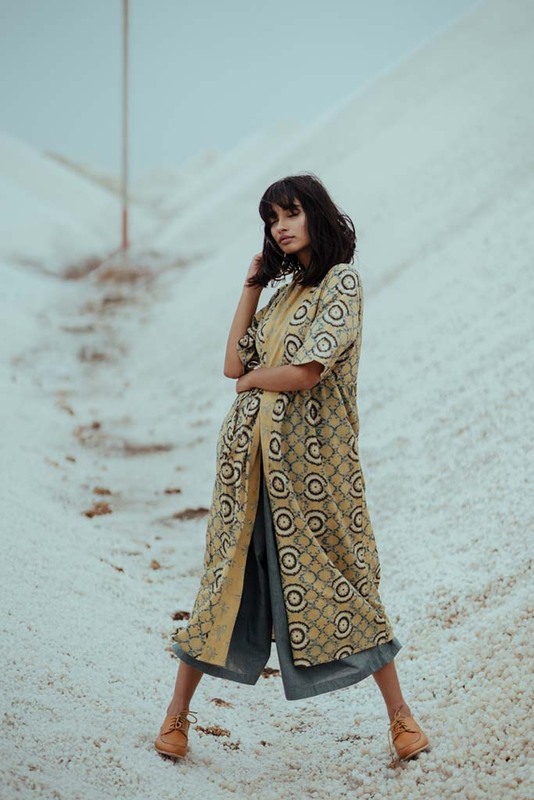 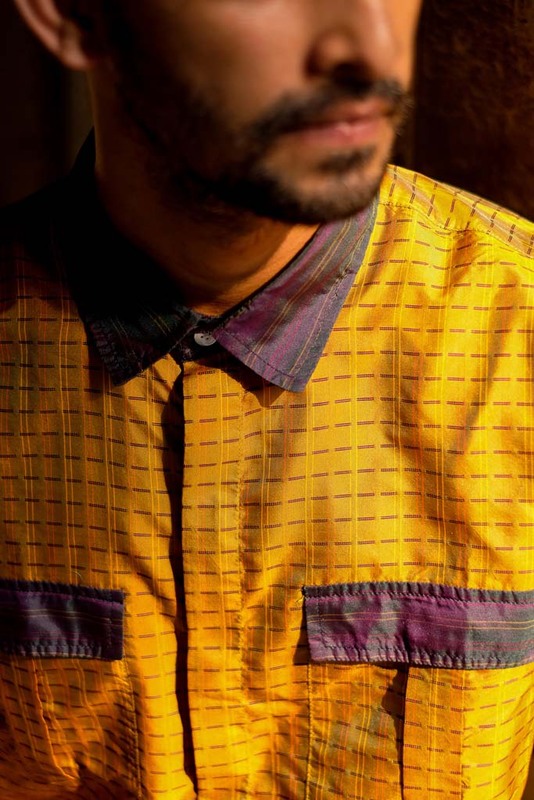 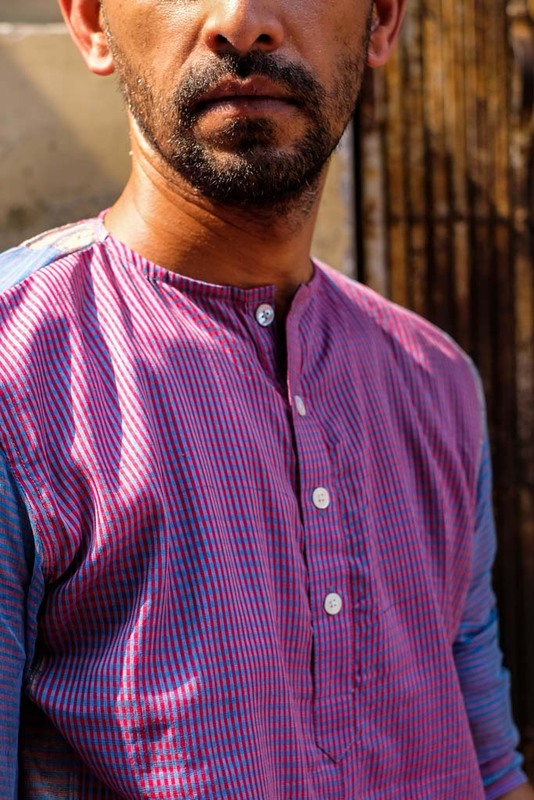 Jaipur based label Meekhalio’s Somya Tambi and his team work with Chanderi clusters. 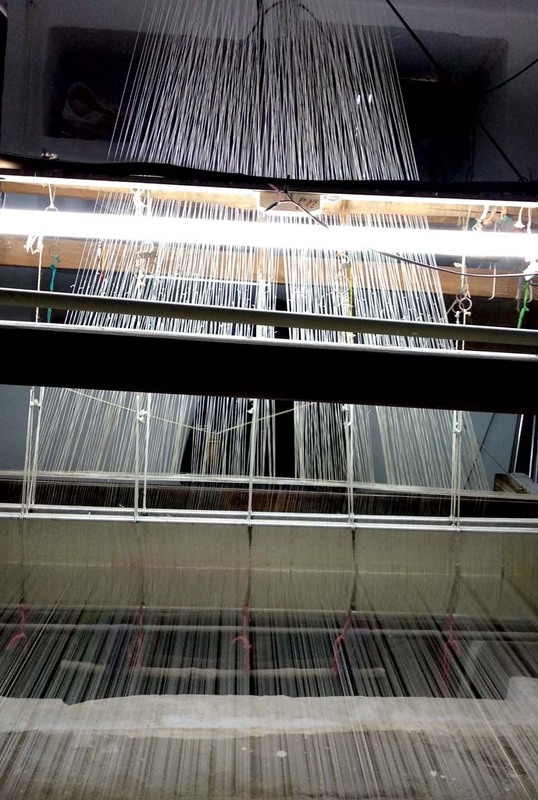 They do serious technical interventions on both loom and yarn. 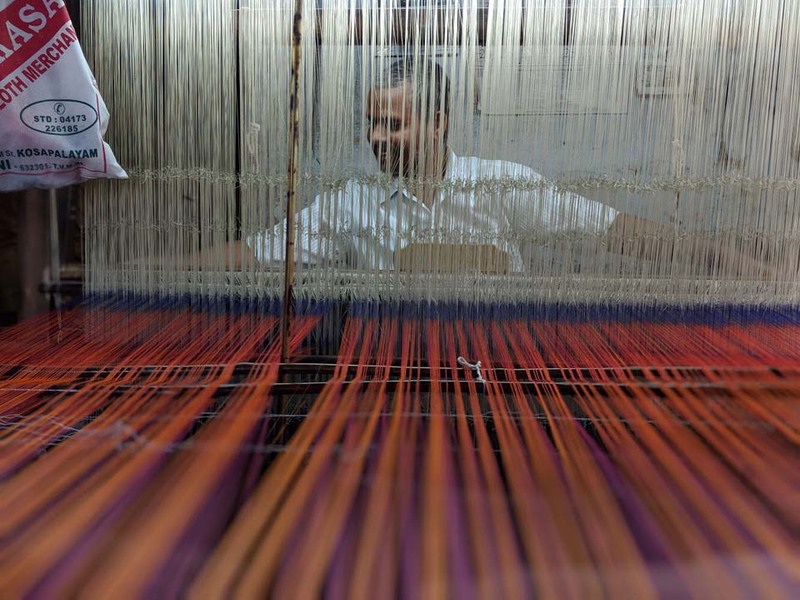 Sitting with the weavers they have achieved breakthroughs in the weaving process by making the ‘kirkita’ technique mainstream when it was only used in weaving the ‘pallu’ of the sari. 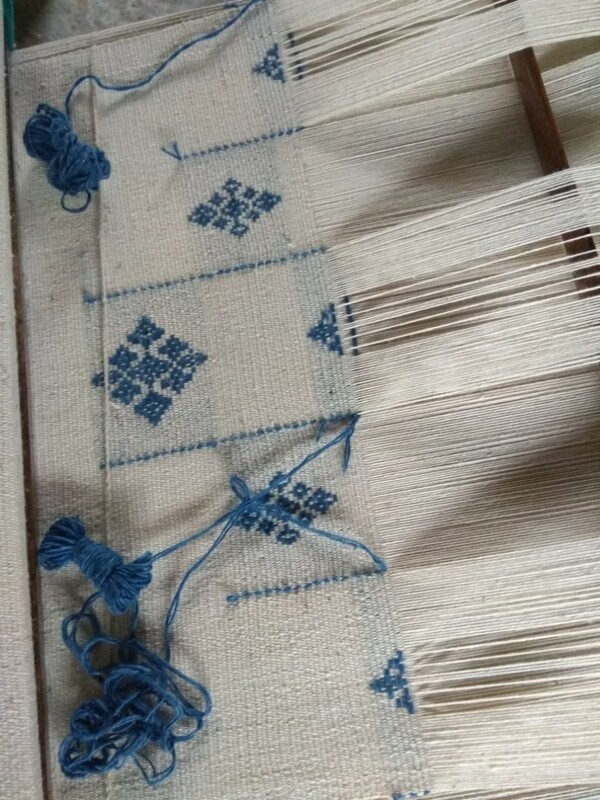 Motifs are, for the first time, made with the ‘kirkita’ technique thus keeping both the weaving time and cost low. 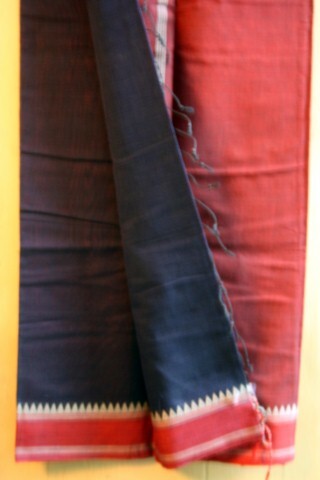 Meekhalio is pioneering the revival ‘Samander Leher’ tie and dye which gives a new look to the Chanderi saris. 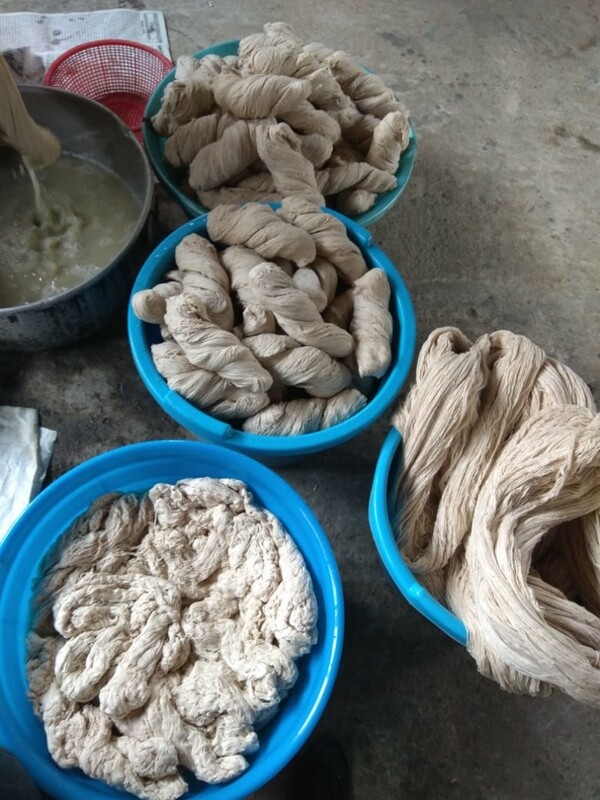 Azo-free dyeing too is being put in place. 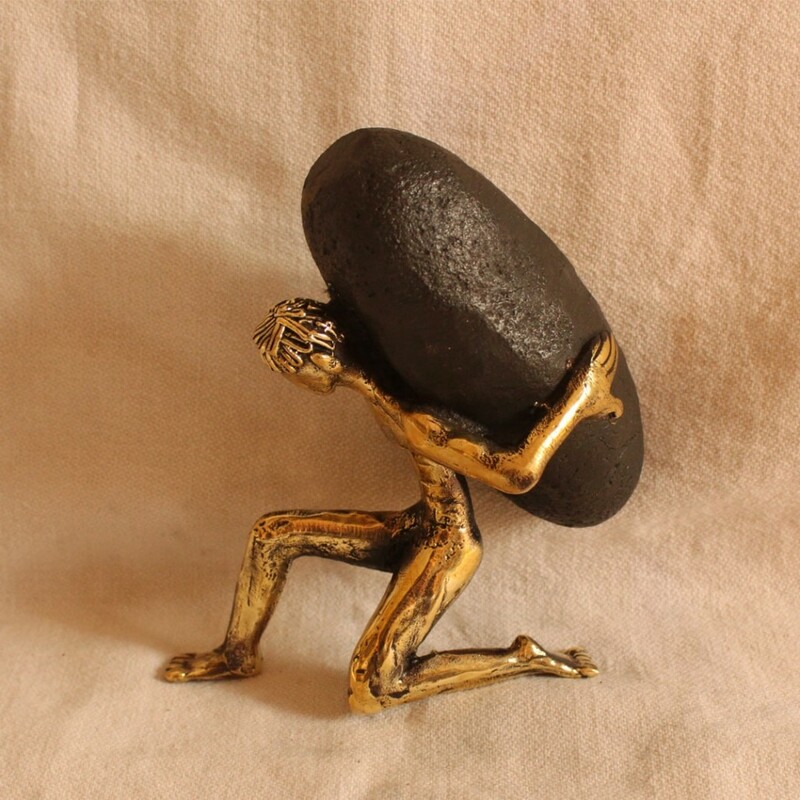 The workers in the cluster are being paid 20 – 25 percent more than the average cluster payment. 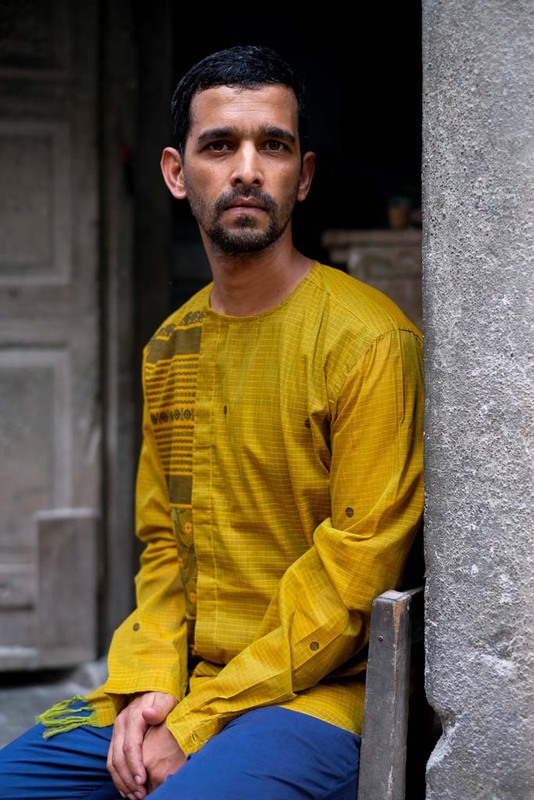 The brand instituted by the NID designer Shantanu Das is based out of Kolkata. 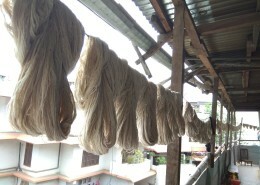 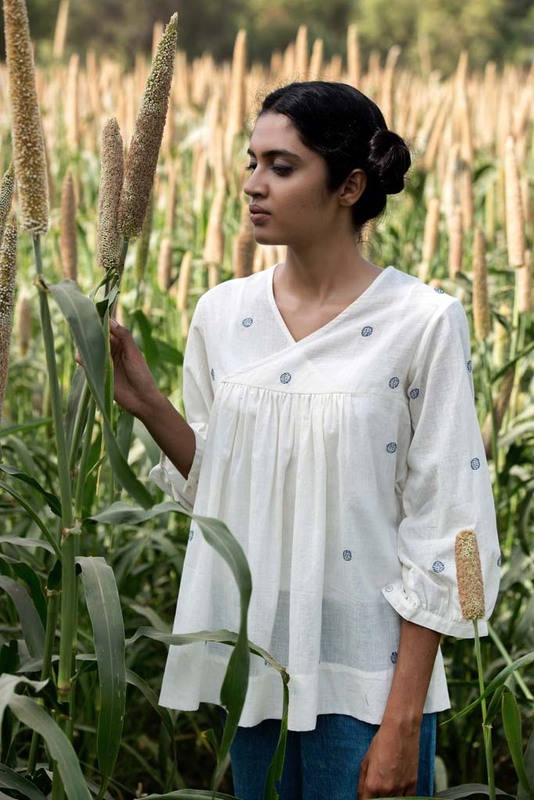 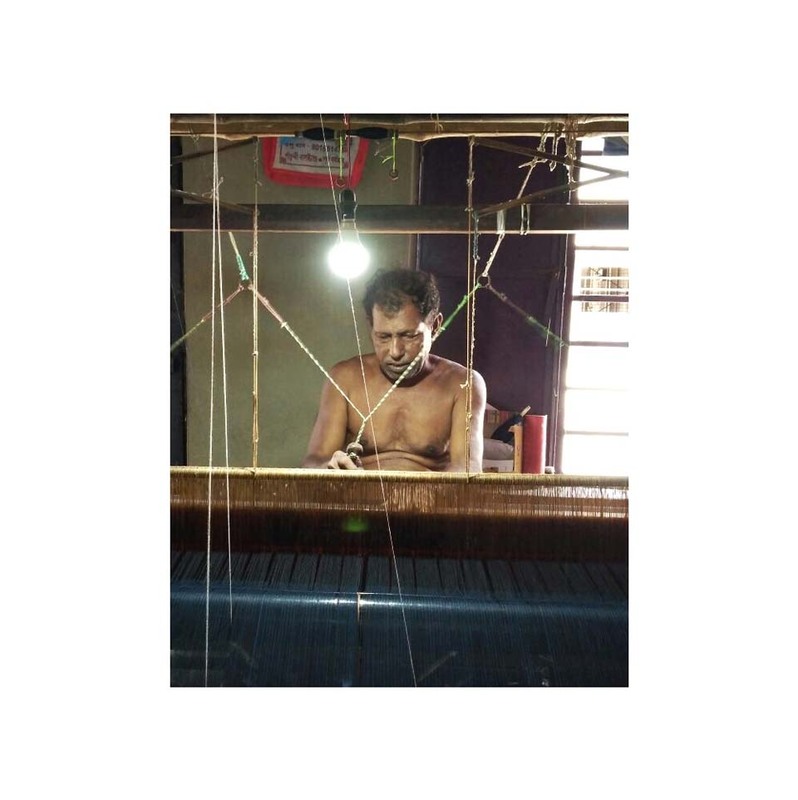 The USP of Maku textiles is quality textiles with natural fibres with an emphasis on hand-spun khadi, cotton and silk. 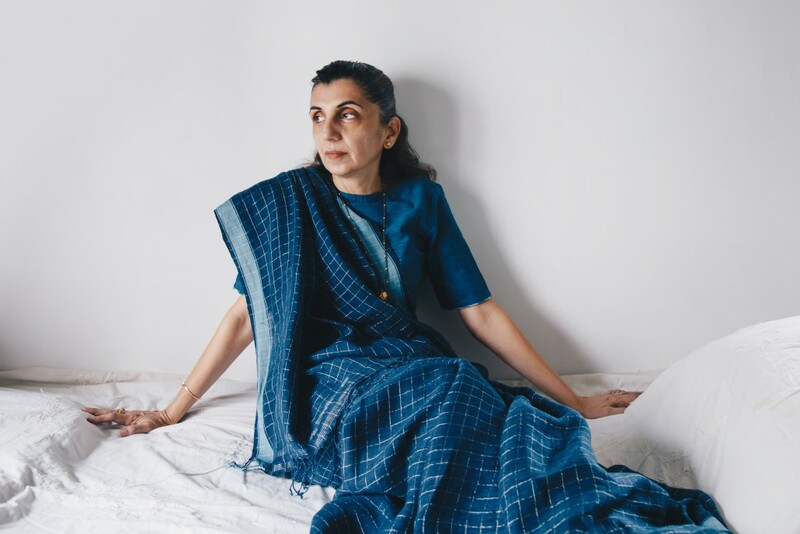 Use of indigo and experimentation with jamdani weaves distinguish his mesmerising collection of saris ranging from white to indigo to black. 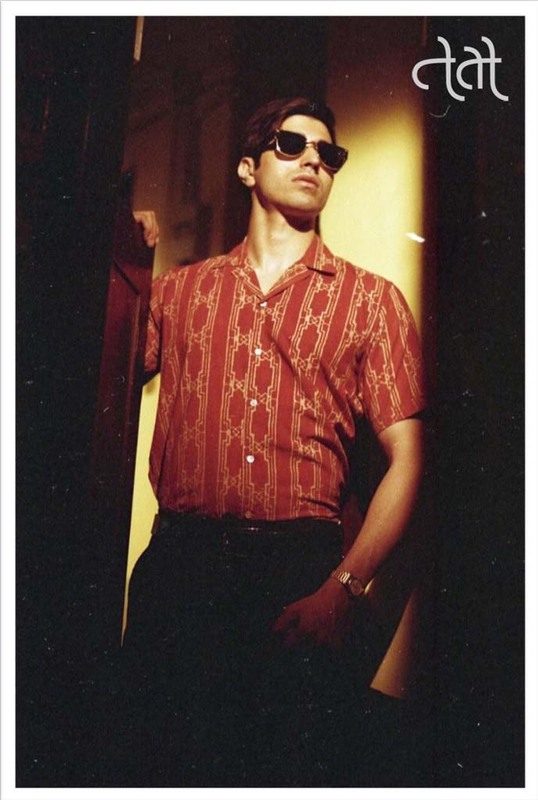 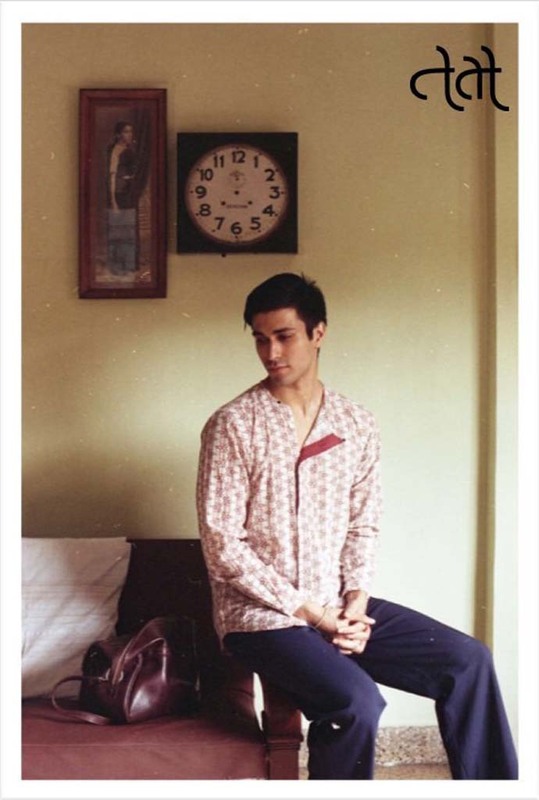 All shades of indigo are Shantanu’s favoured colour palette in his garments as well. 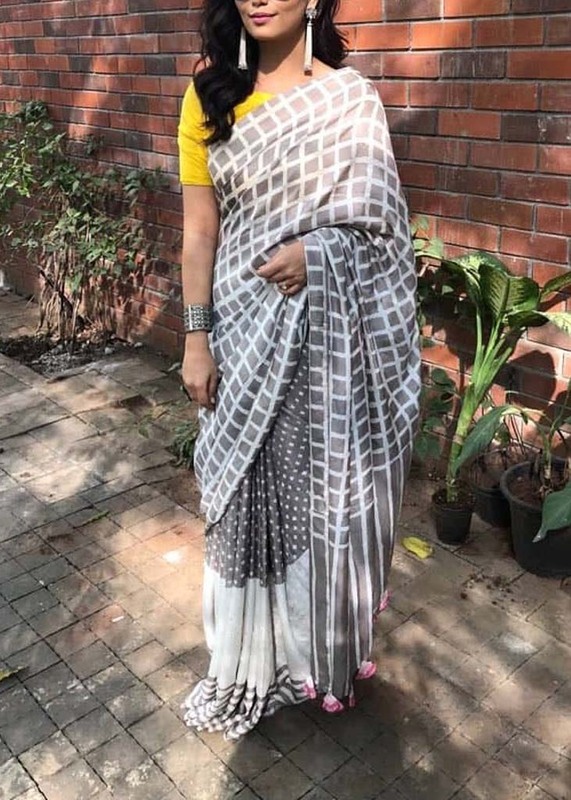 The innovative tweaking of the jamdani motif placement could be all over jamdani butties or just border in both cases with eye catching effect. 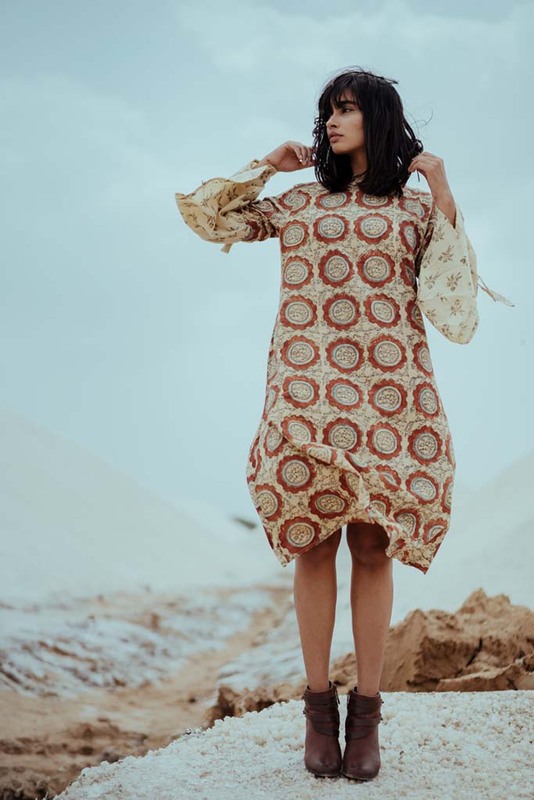 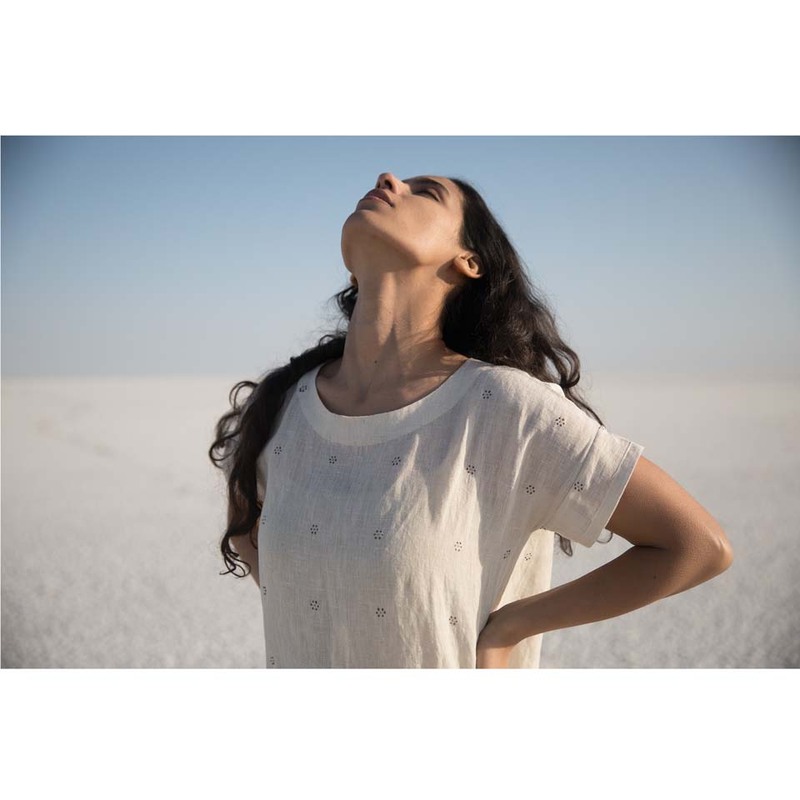 Karnam is a womenswear clothing label from Ahmedabad working on innovation in Indian traditional textiles from Bhuj and Kolkata. 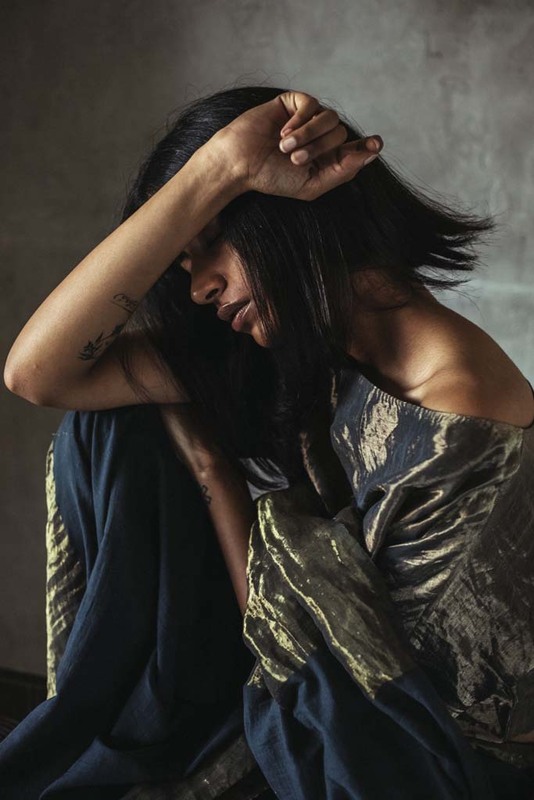 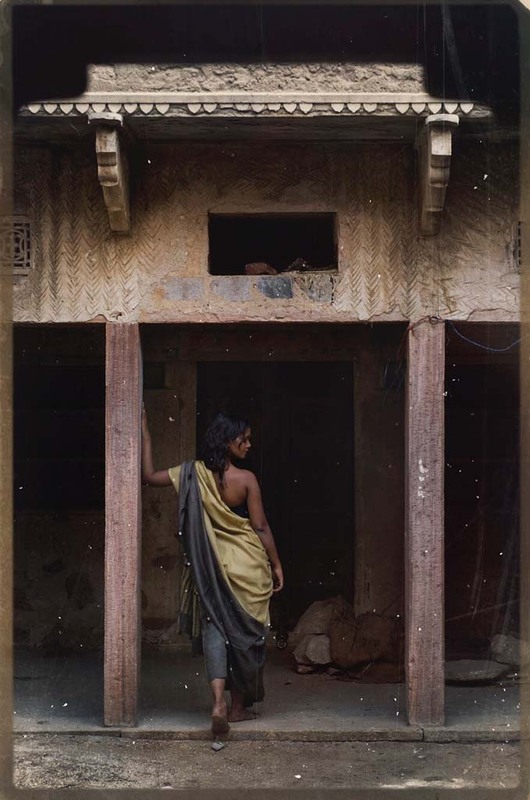 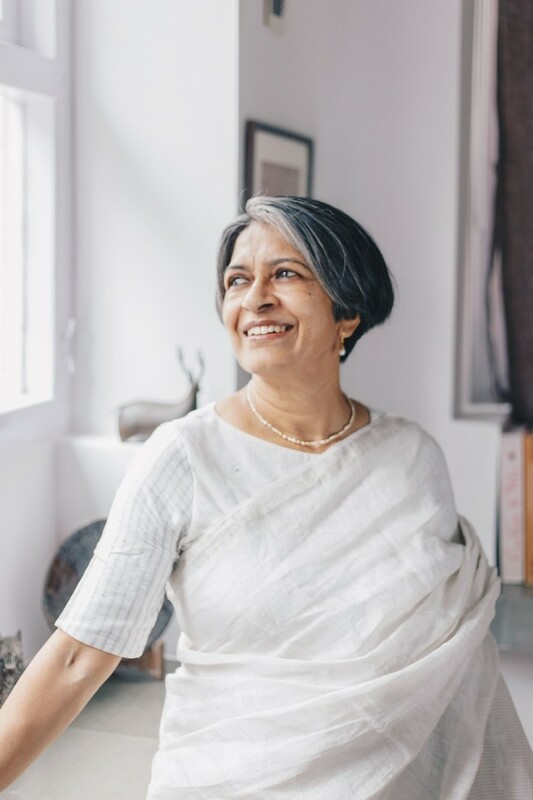 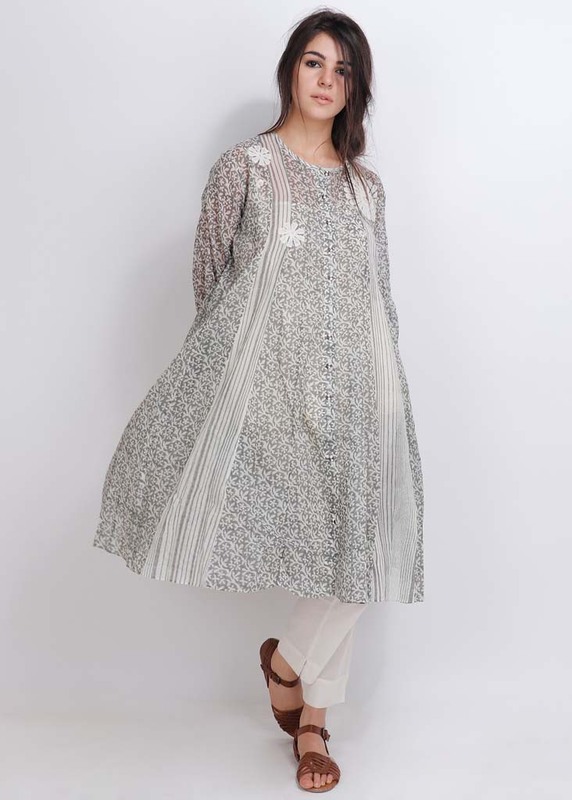 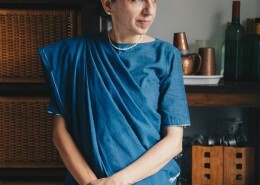 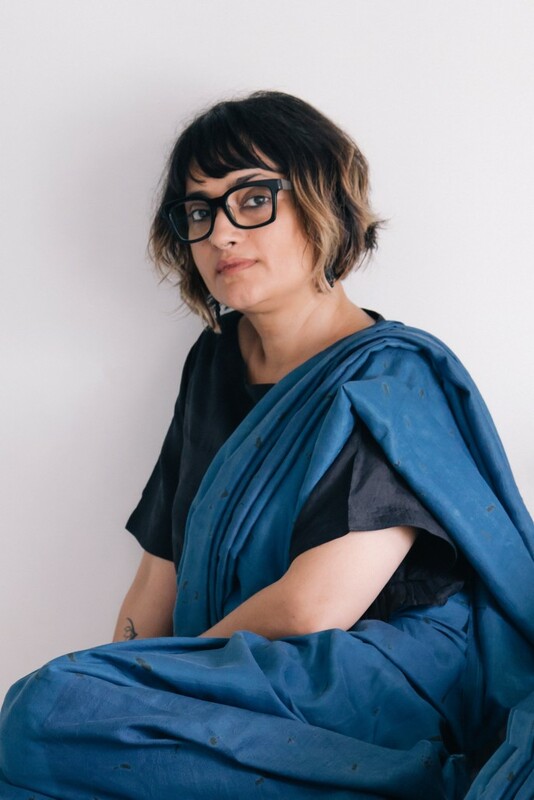 The focus of designers Kripa Shankar and Poonam Nishad is to develop jamdani and special extra weft technique Bhuj fabric with the combination of contemporary minimalist design in womanswear clothing. 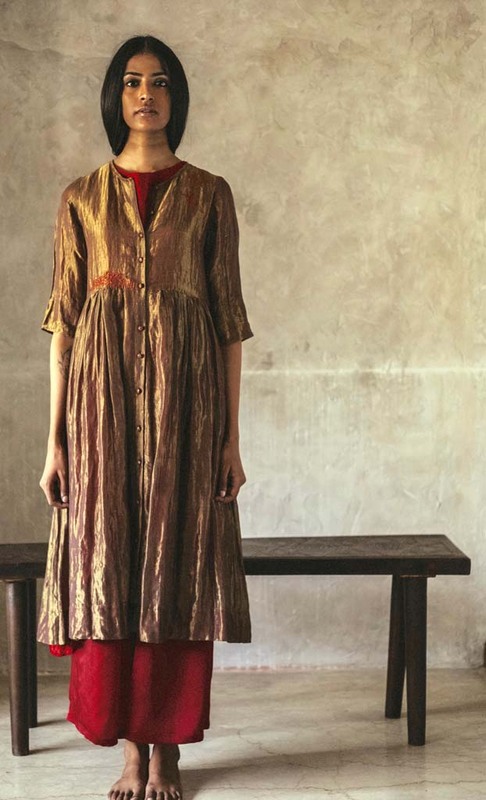 All the garments are dyed in natural dyes. 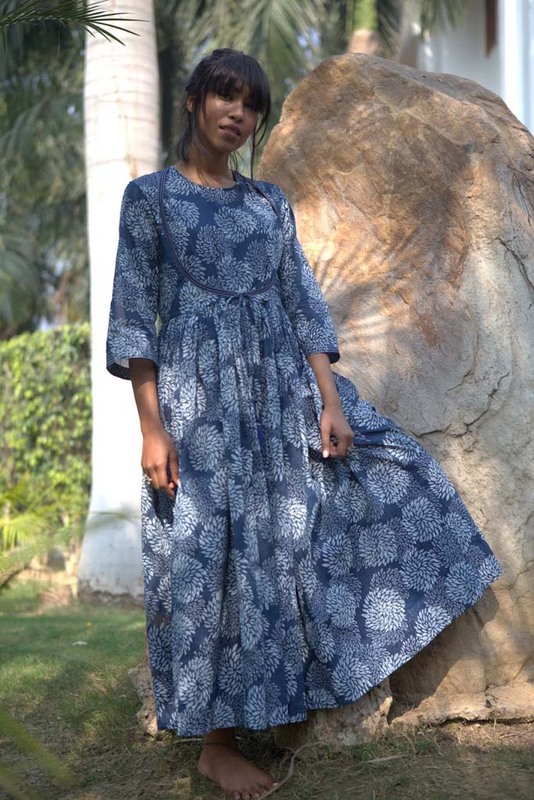 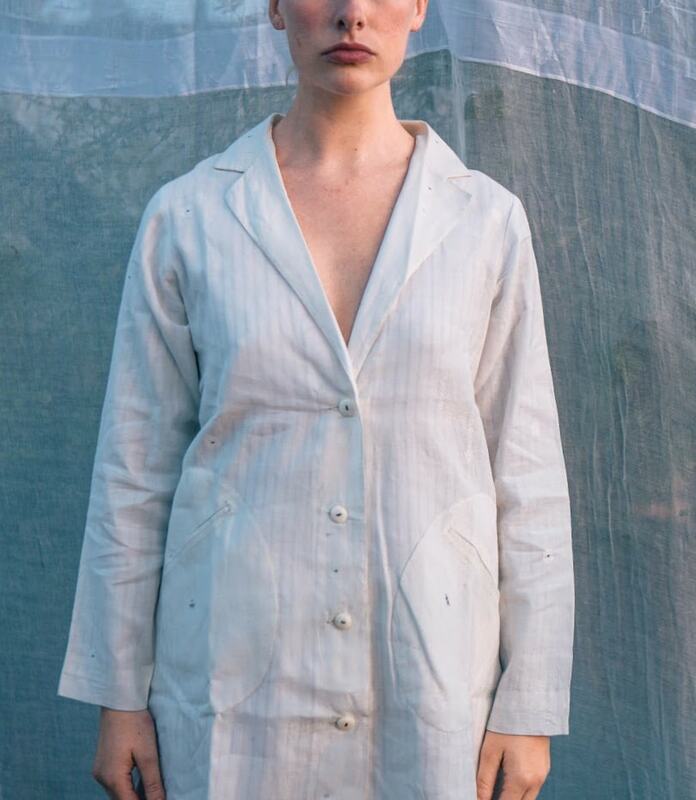 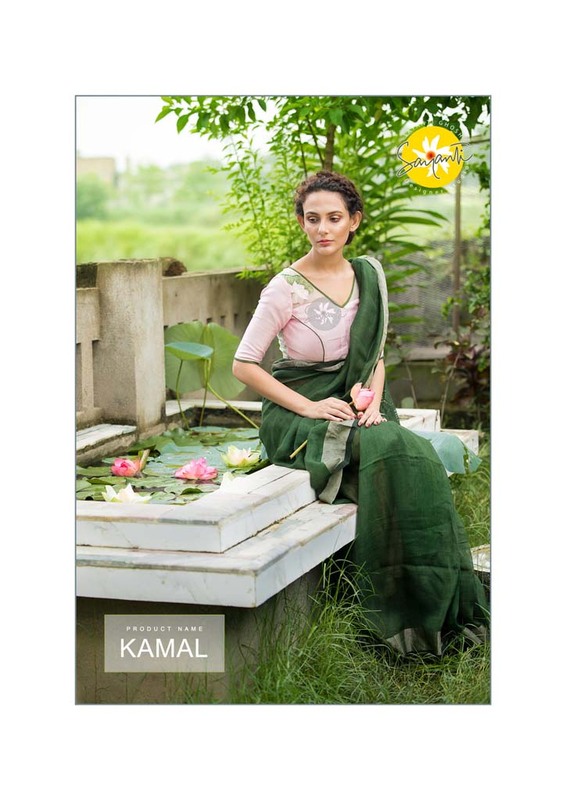 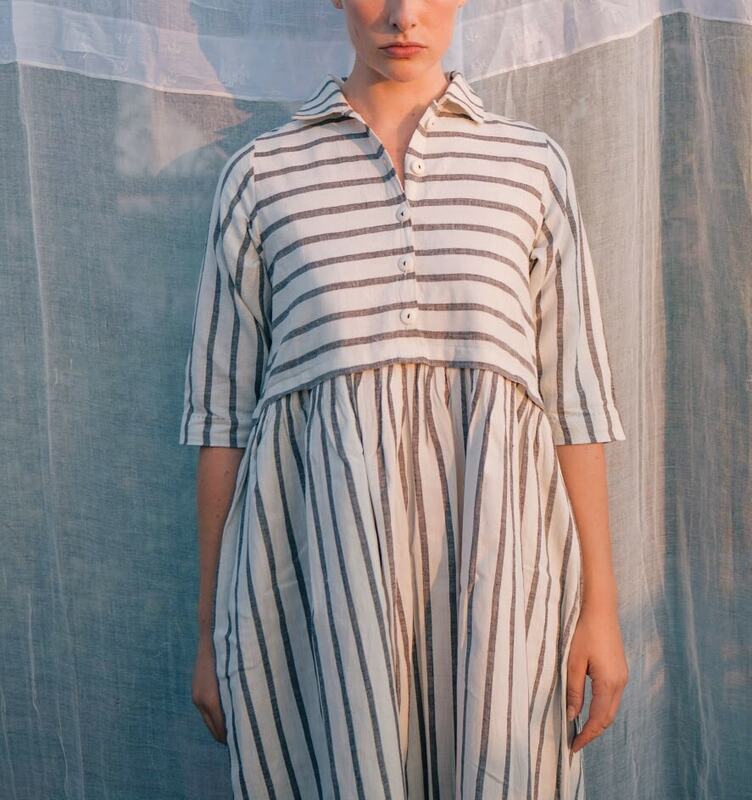 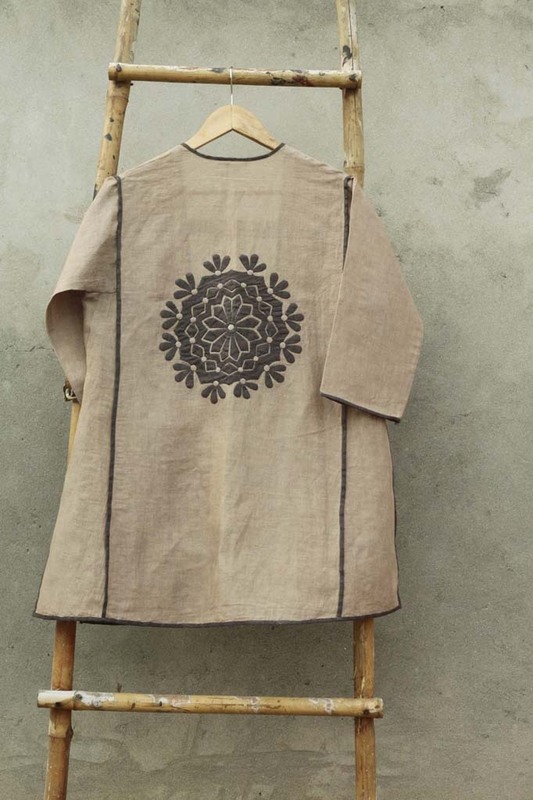 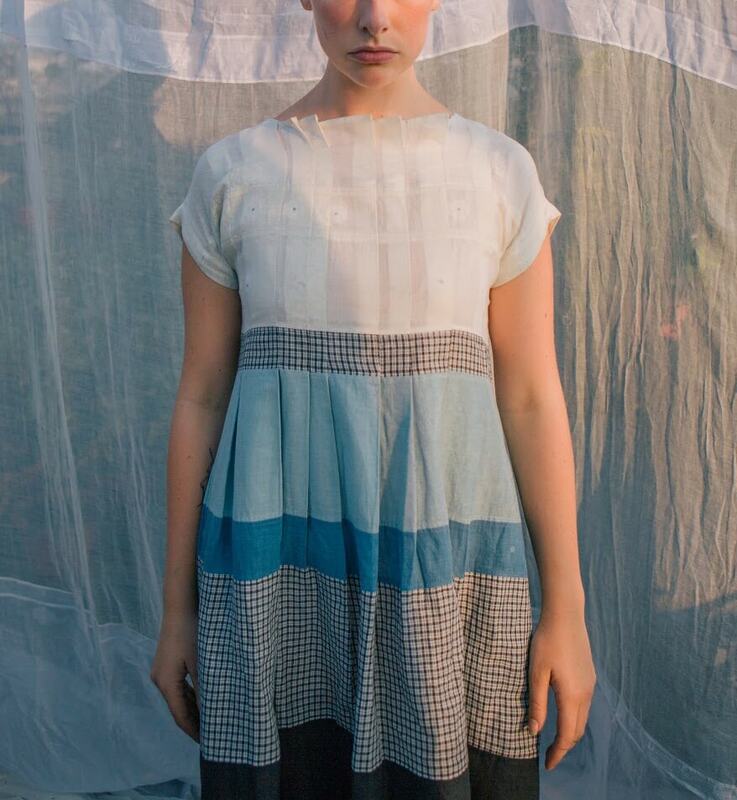 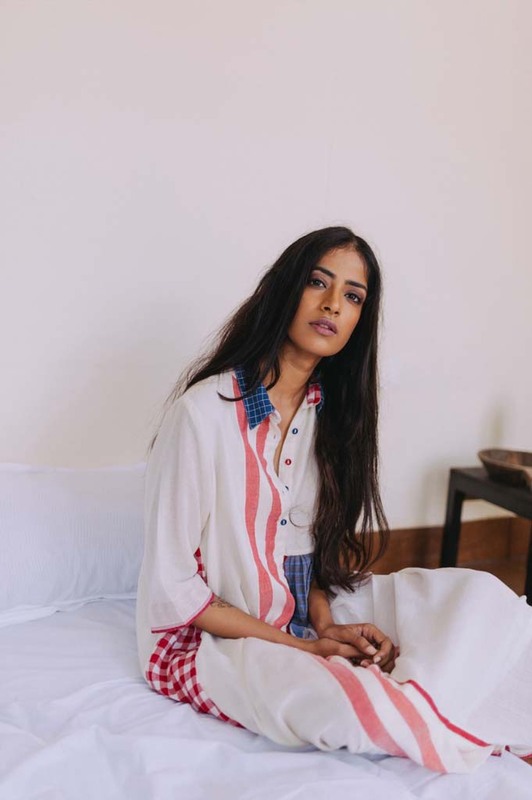 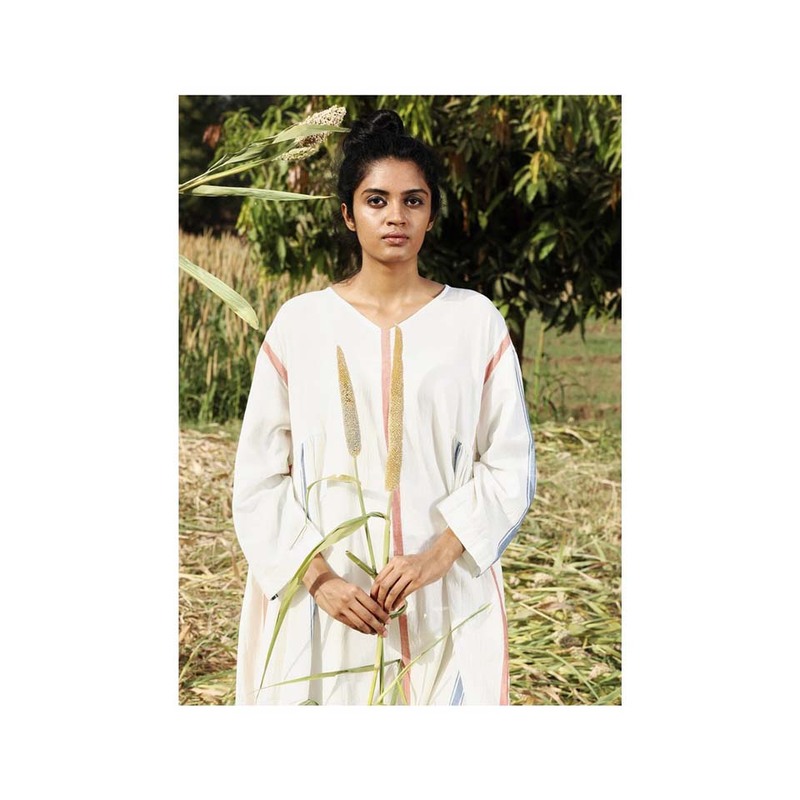 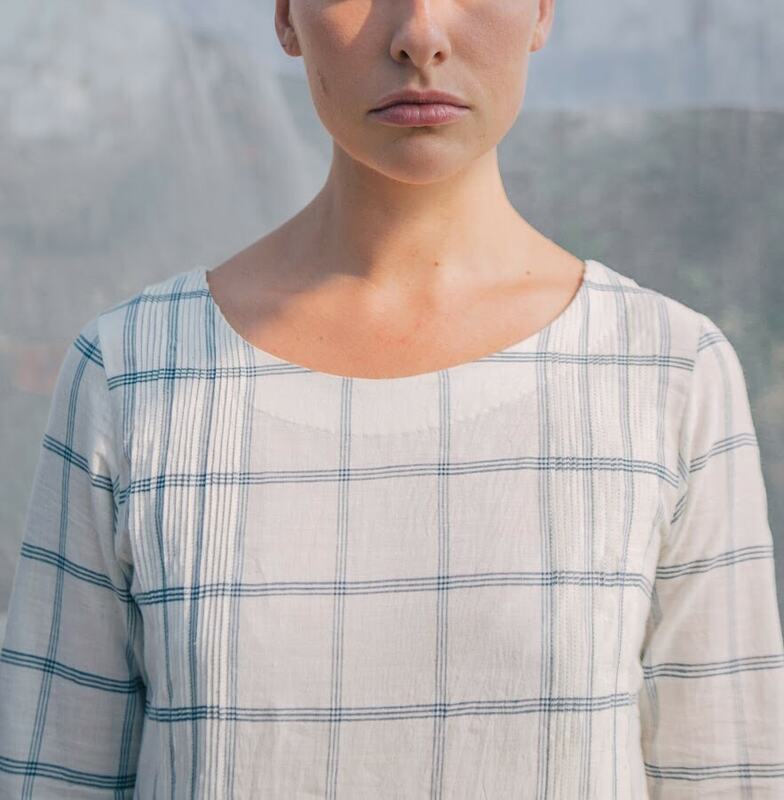 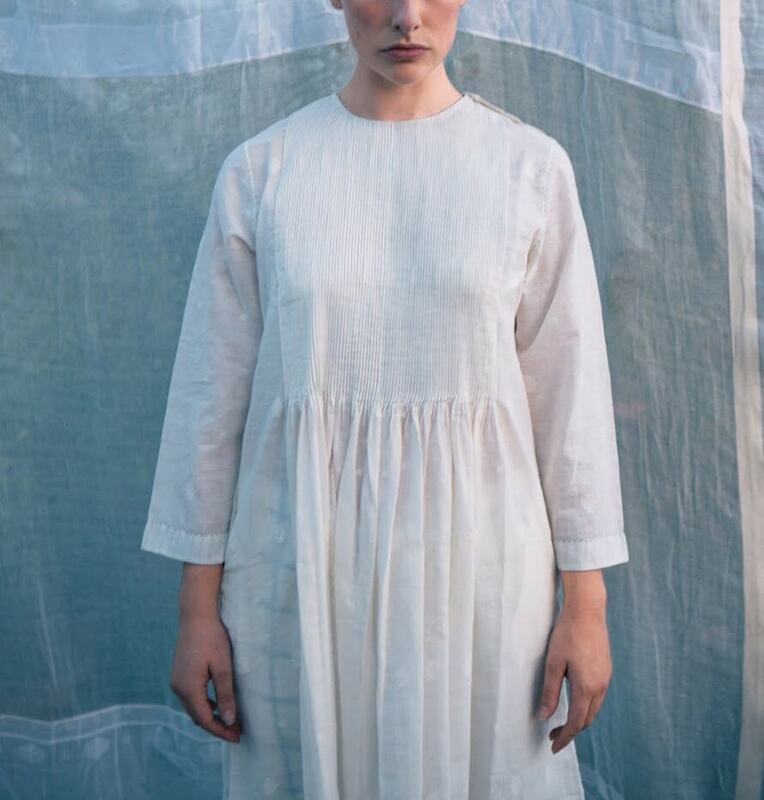 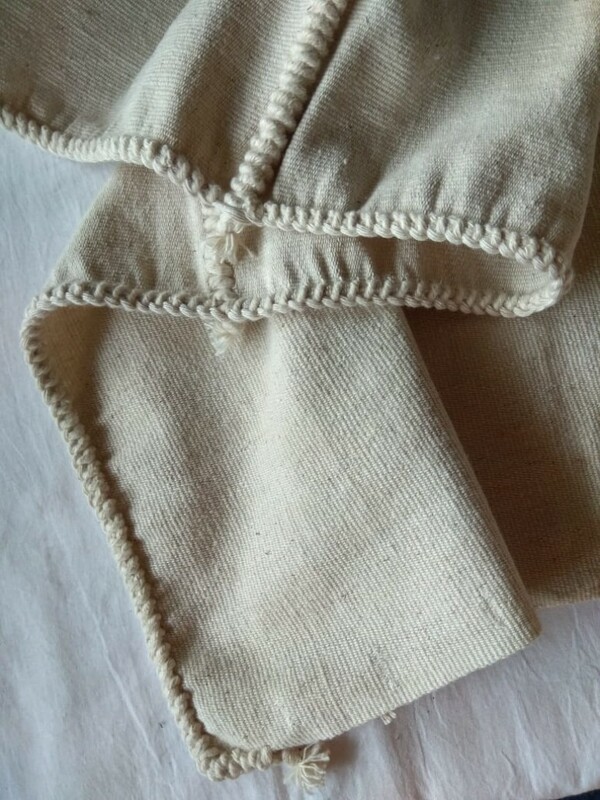 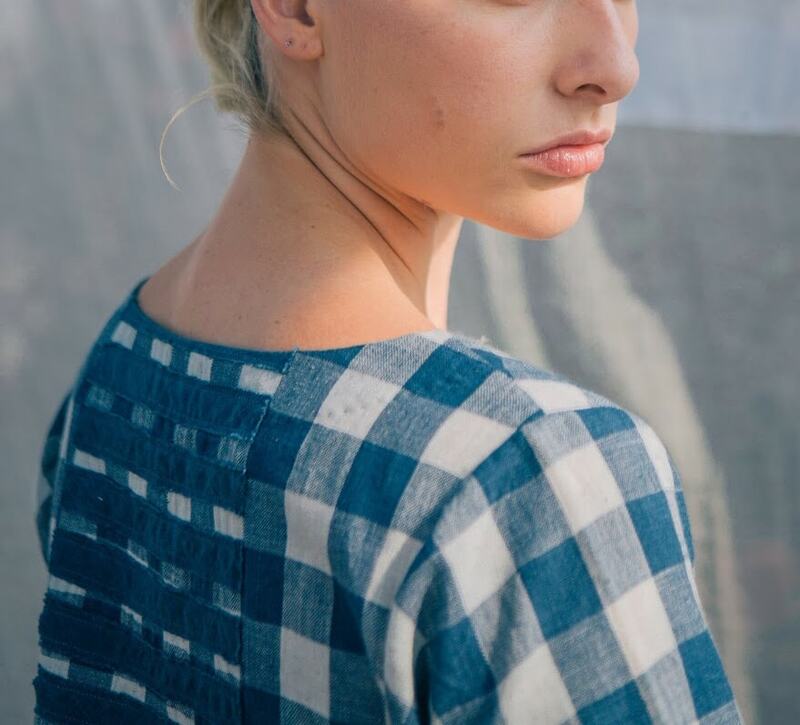 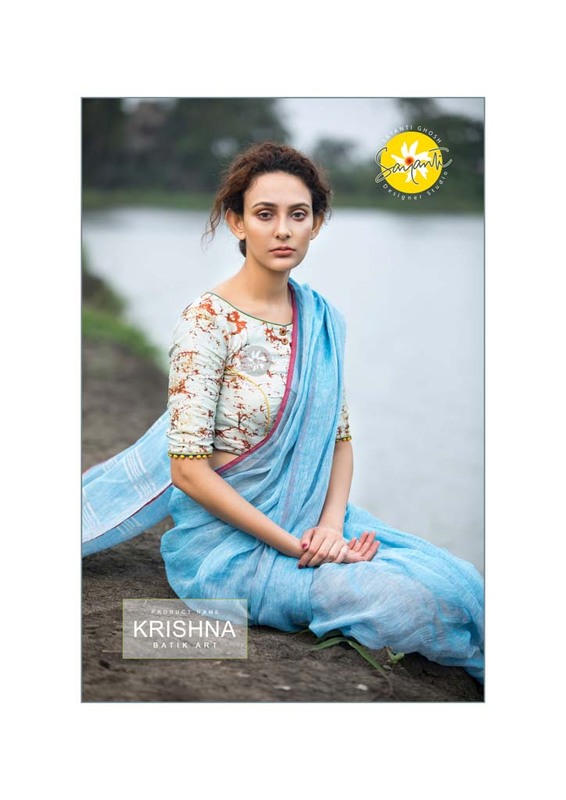 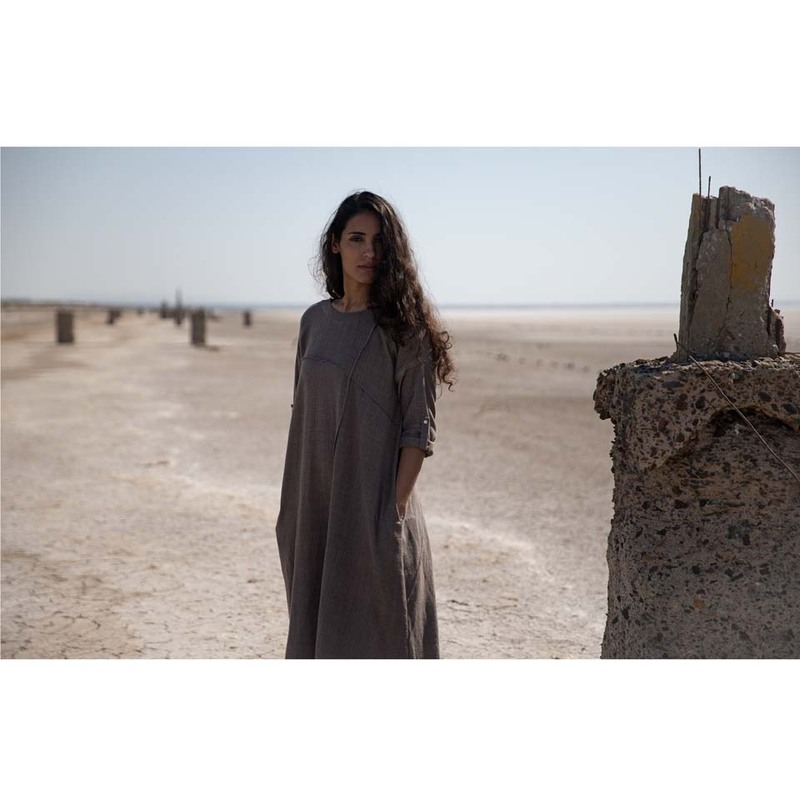 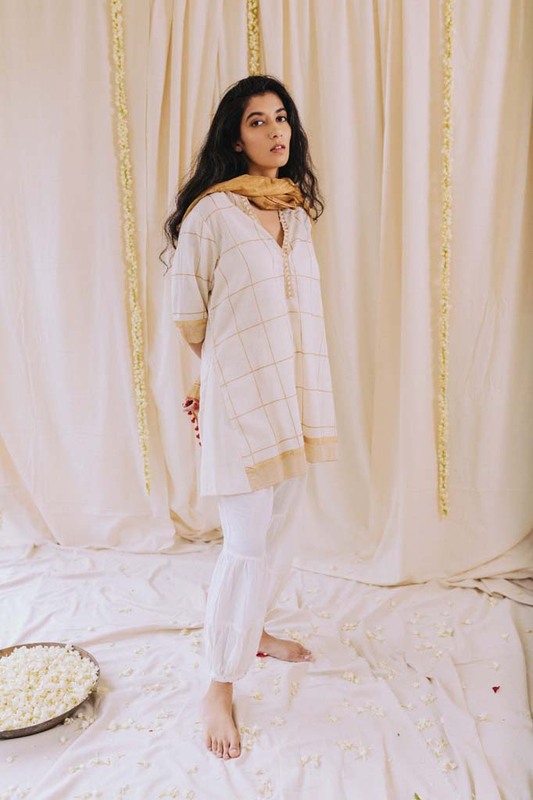 Khadi and sustainable fashion is the focus of Karnam while making anti-fits handcrafted comfortable clothing. 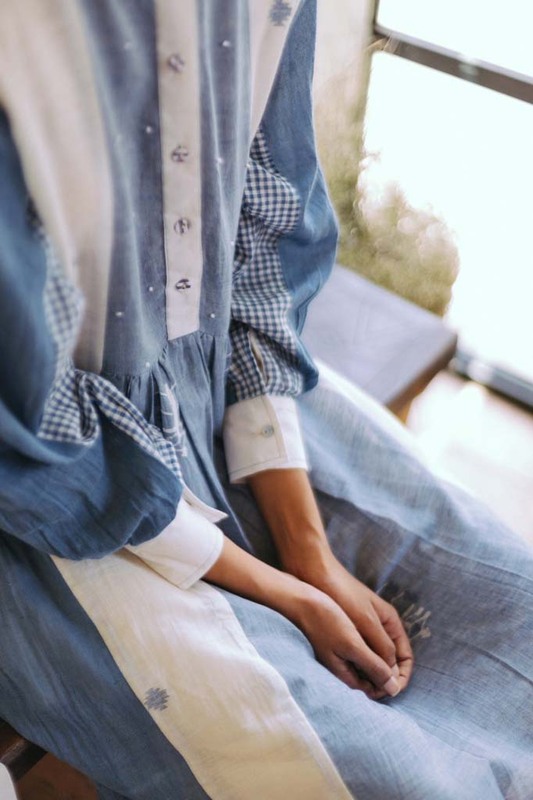 The Karnam autumn winter collection ’18 is inspired by Japanese aesthetics. 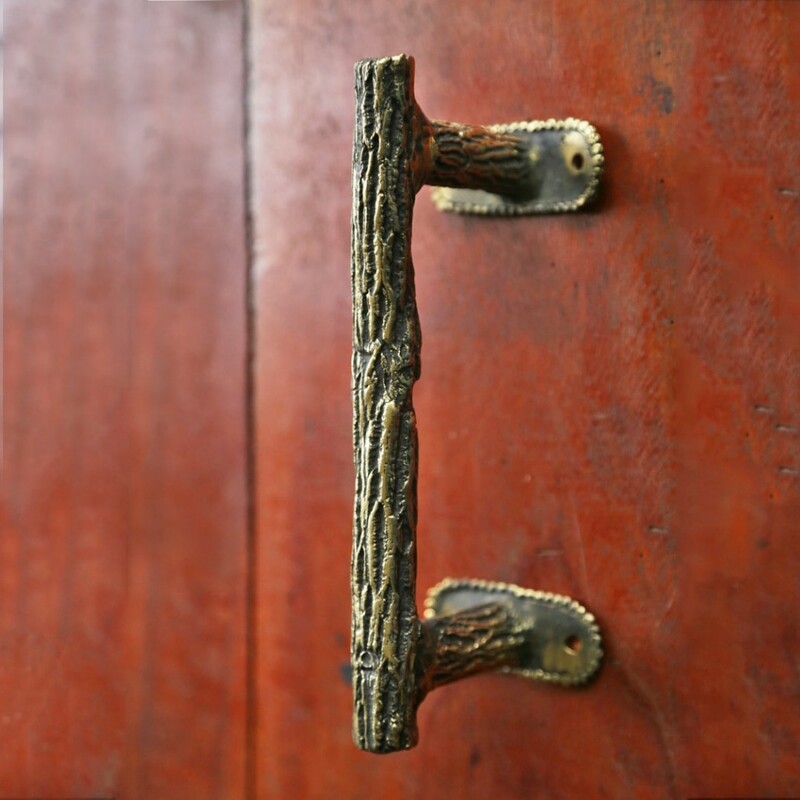 IKI a Japanese concept in aesthetics is an expression of simplicity, sophistication, spontaneity and originality. 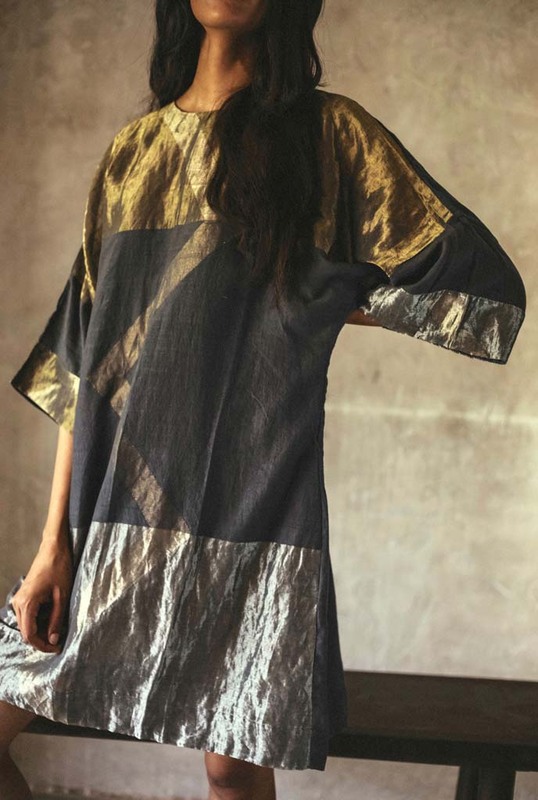 Minimalist design and originality of technique are expressed in the collection with emphasis on colours like kora, blue and black. 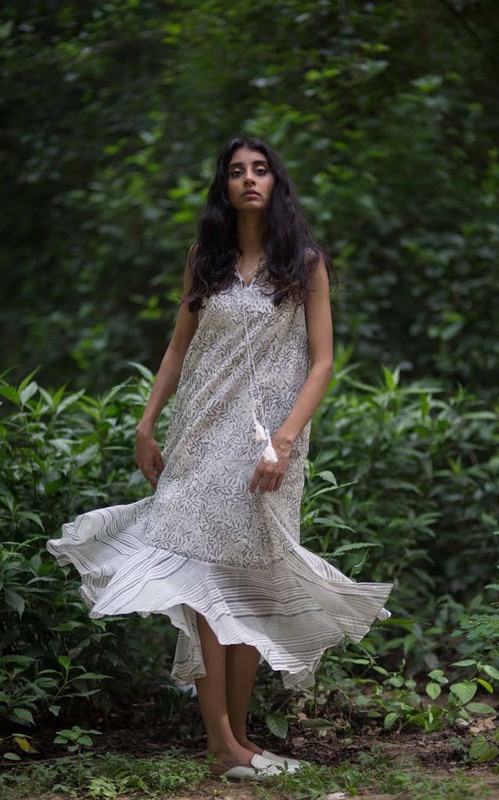 Flying Fish is the creative brain child of NIFT graduate Nikita Bose. 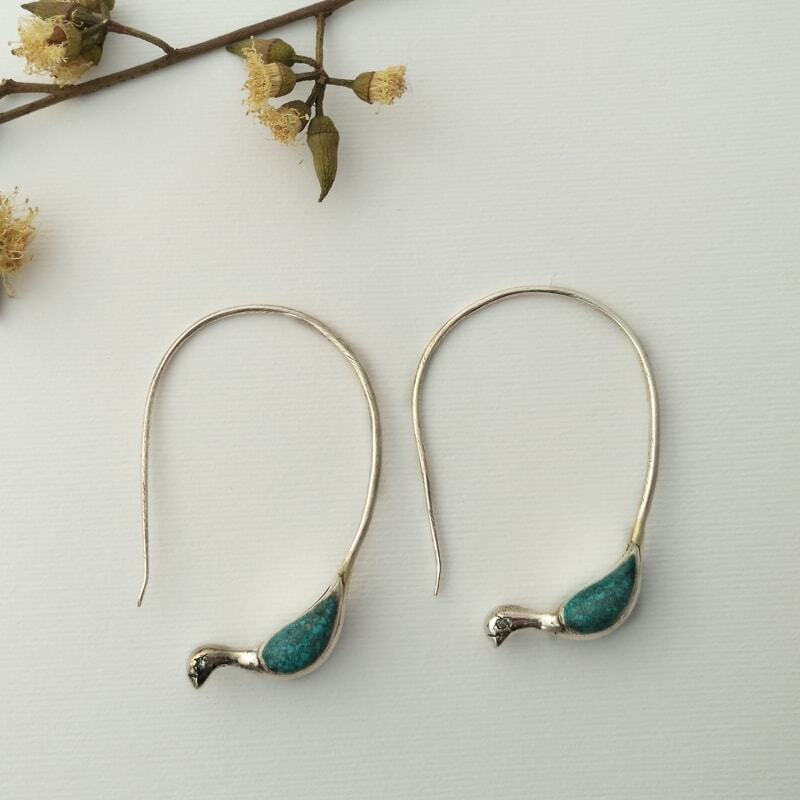 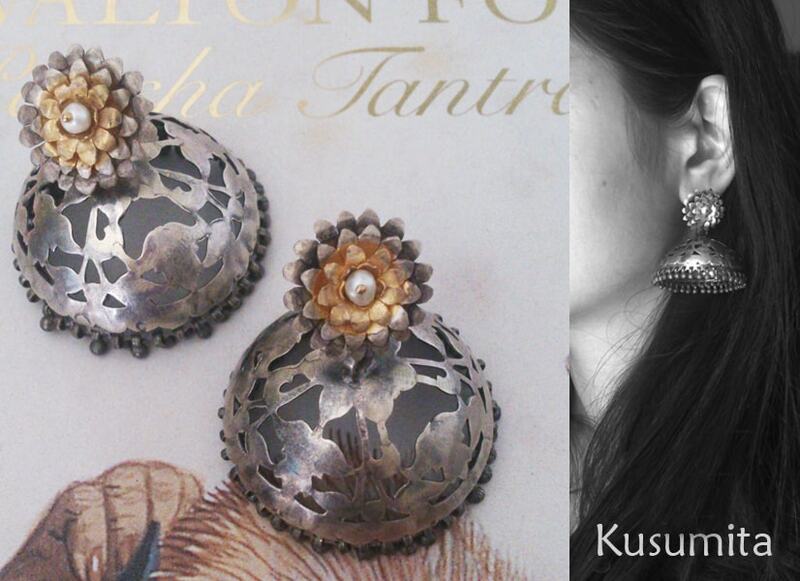 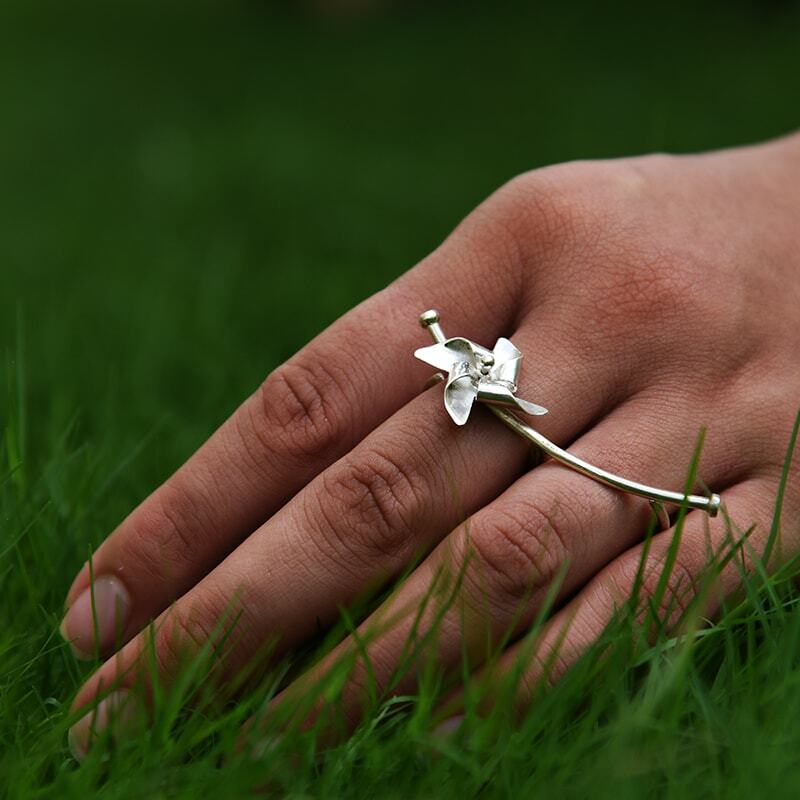 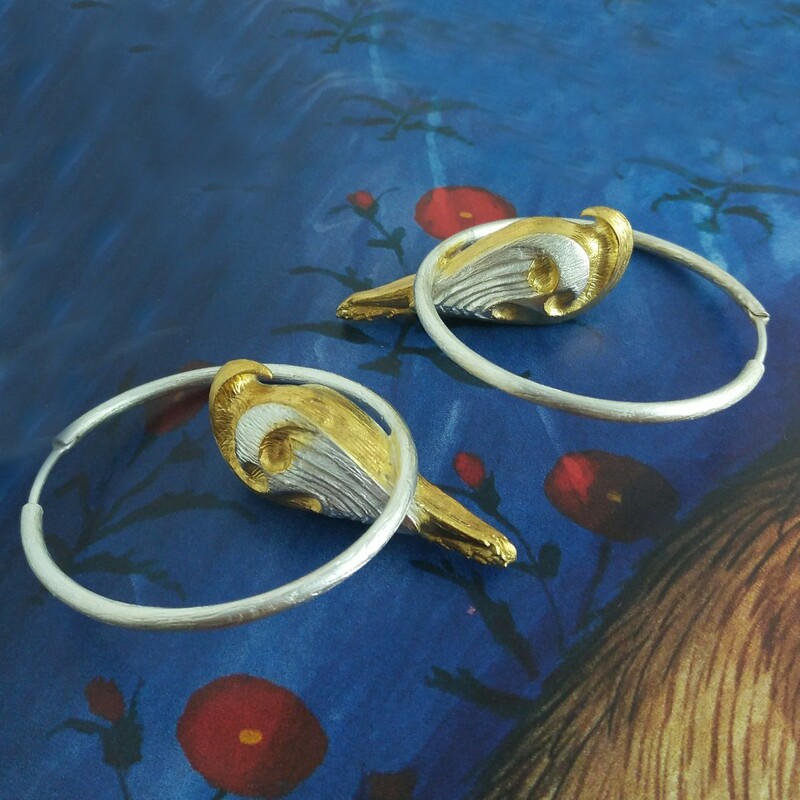 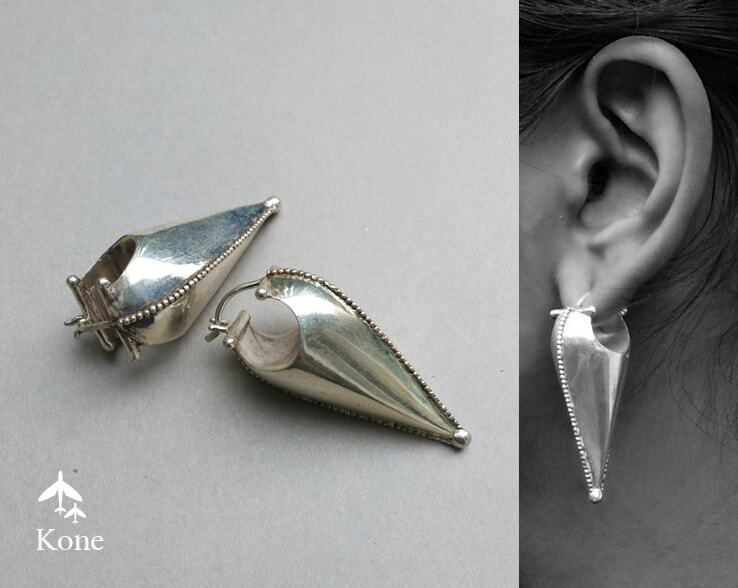 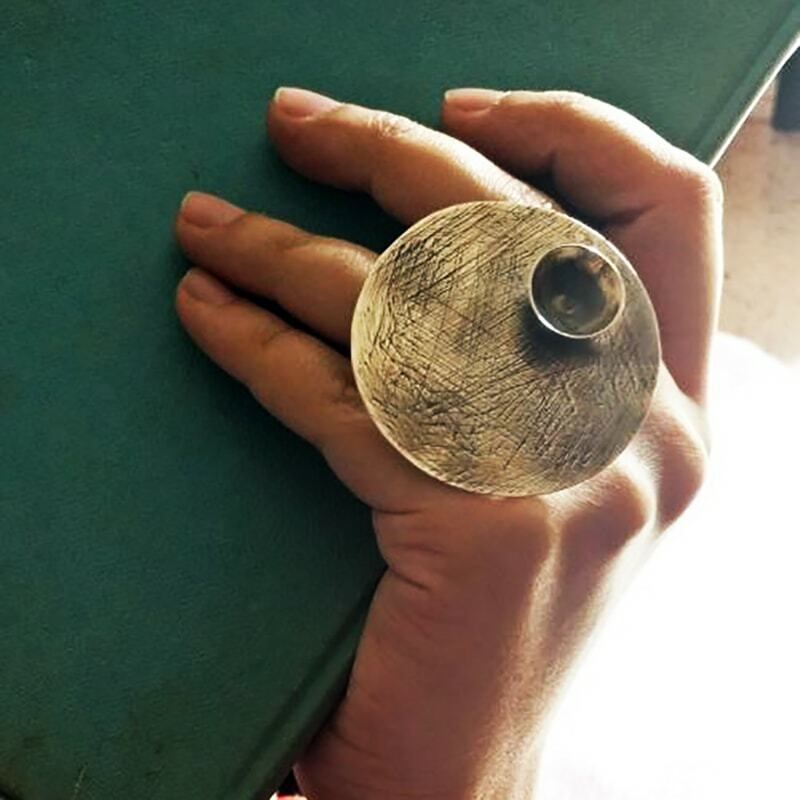 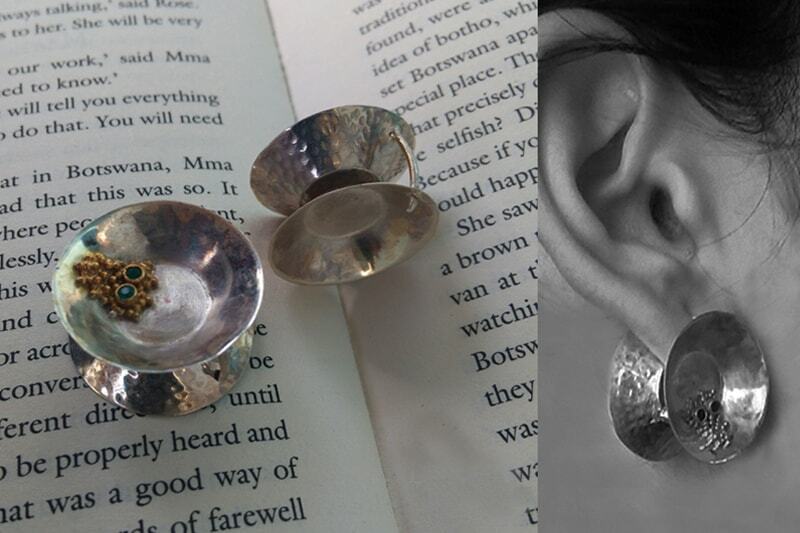 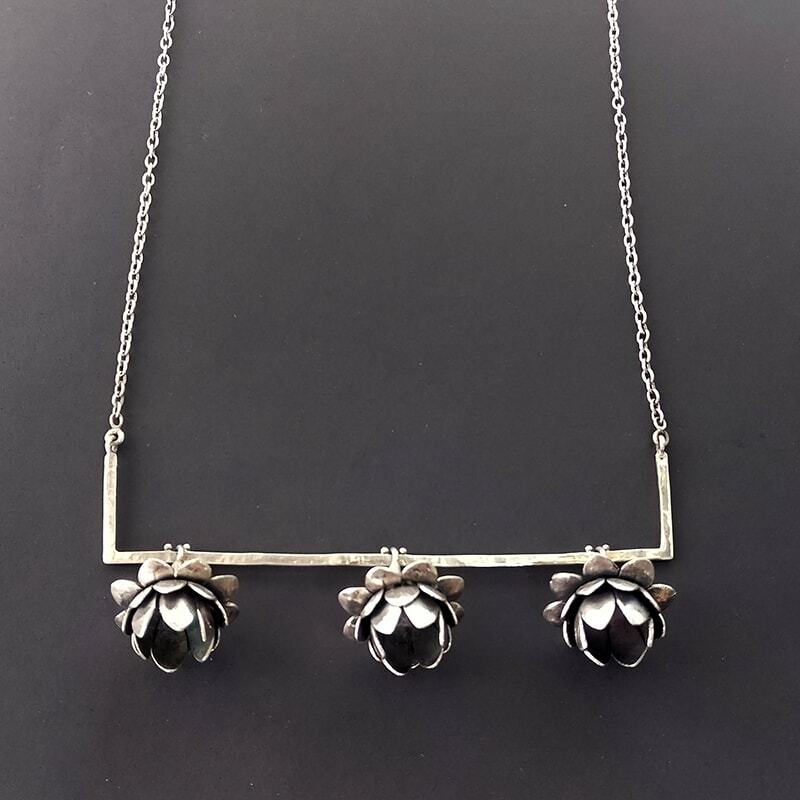 Exploring metal, mainly silver, with her team of traditional jewellery craft artisans from Jaipur, Kolkata & Orissa, Nikita has come up with a line which is at once contemporary, innovative and stylish, yet rooted in tradition. 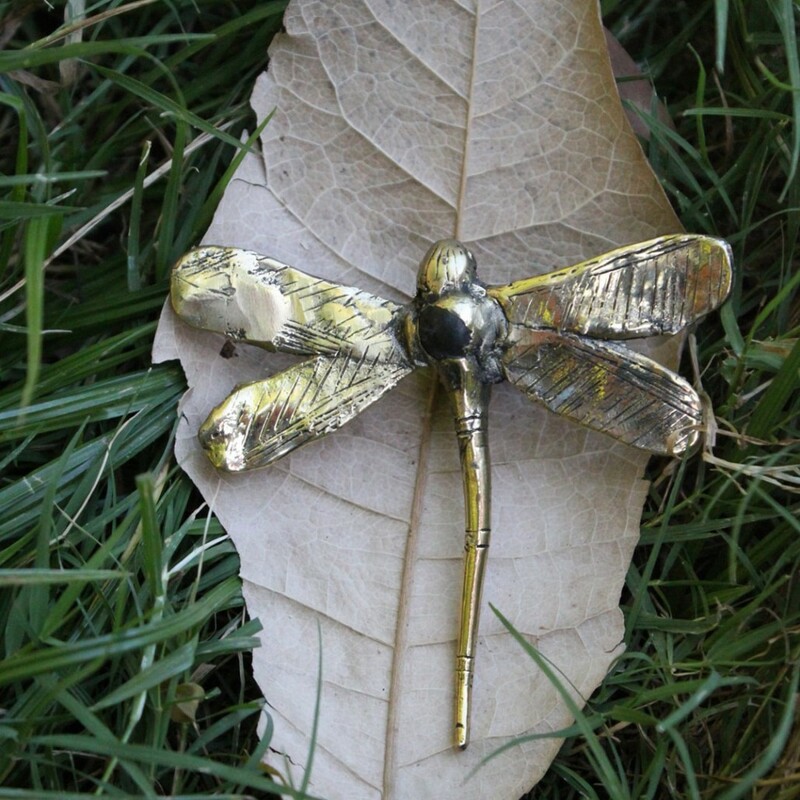 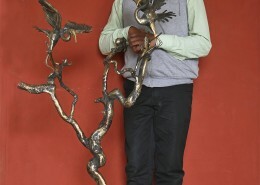 Techniques such as forging, repousse, enameling, fretwork have been used merging it with a thorough contemporary sensibility. 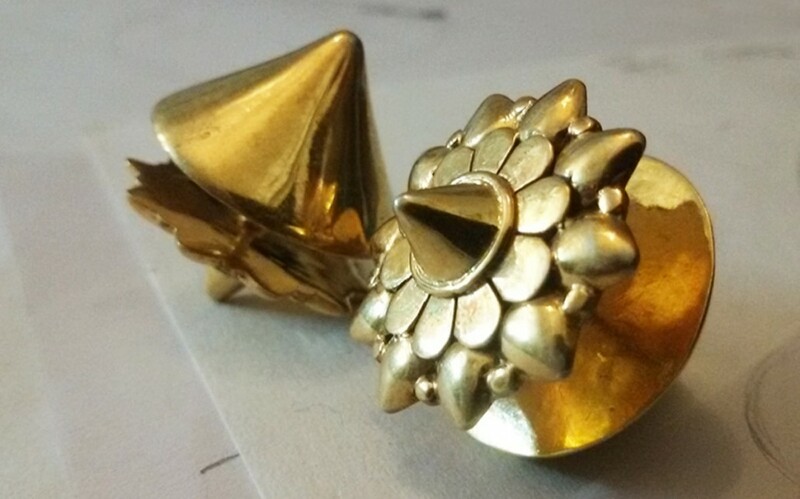 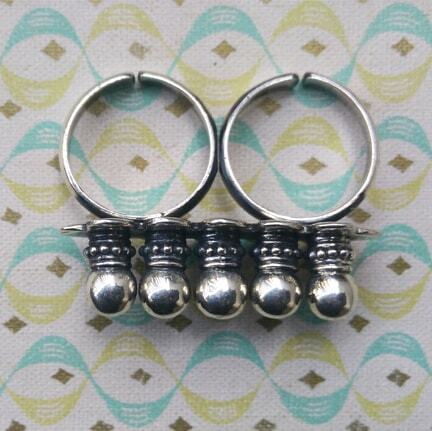 Look out for an exciting range of nose pins, earrings, necklaces, hairpins and more. 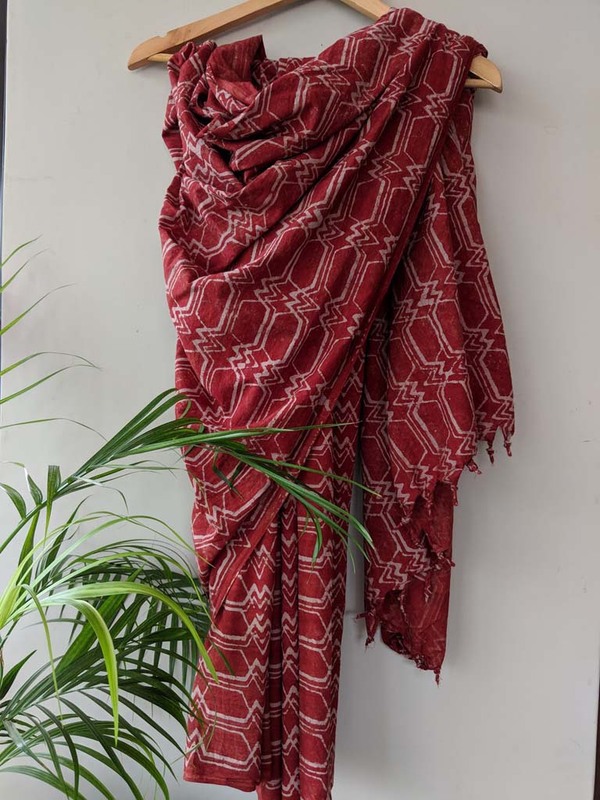 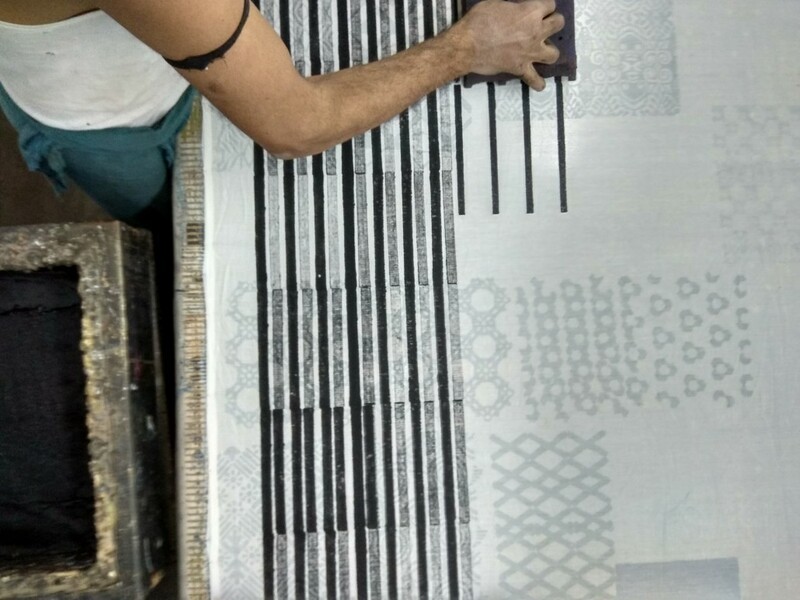 Established in Delhi in 2016 by Rakshit Reddy, Eachaneri Designs is a take on the contemporary Indian sari – with the beauty and ingenuity of prints using hand-blocks and motifs to break the monotony of regular print designs and create a unique new genre of block printing on saris. 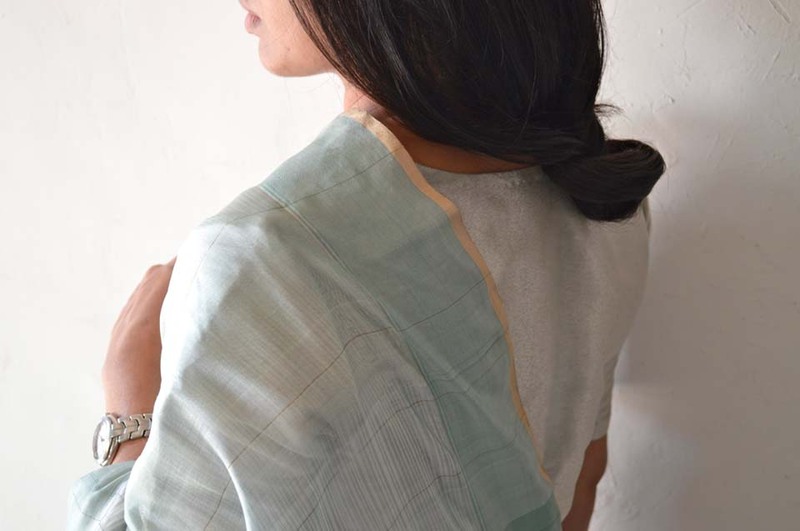 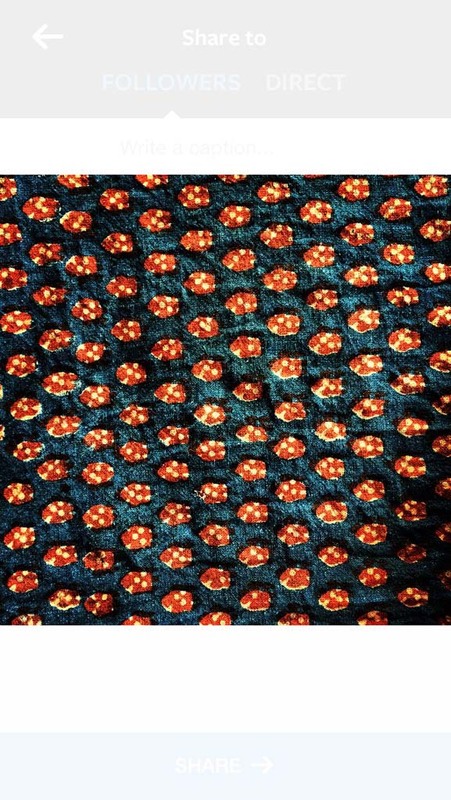 Done on Tussar and Chanderi, Reddy adds to the ‘perfectly imperfect’ impressions created by the basic shapes, lines and other techniques using the hand block where the pattern merges to accentuate the beauty of the handmade process. 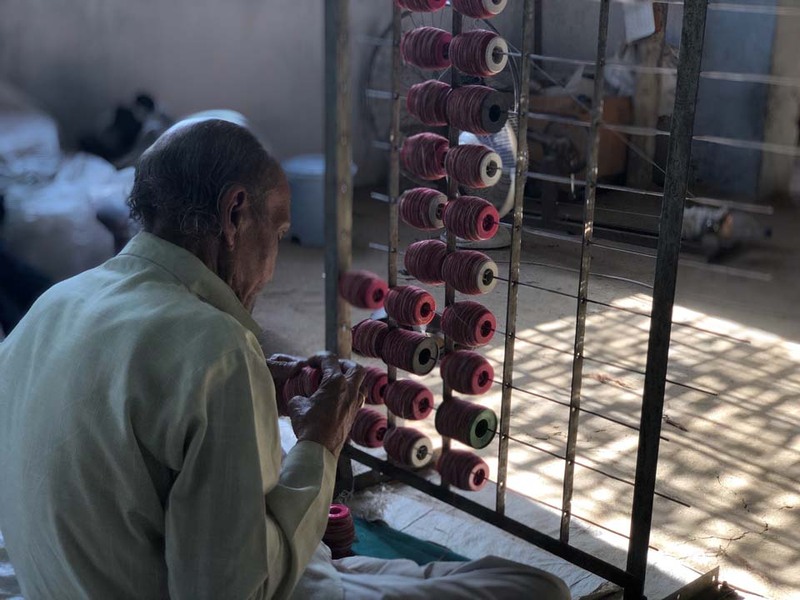 Currently working with weavers in Madhya Pradesh, Bengal & Andhra Pradesh, the inspiration behind the collections are uniformity and diversity of geometry. 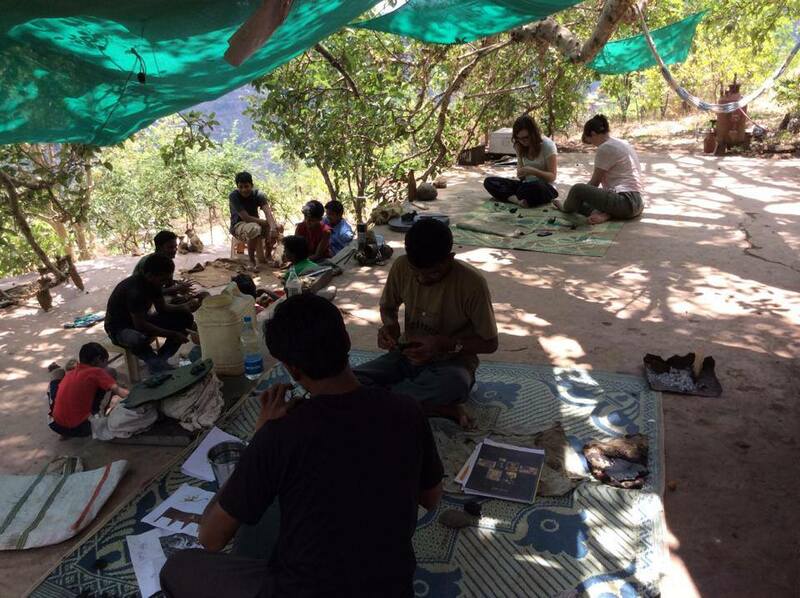 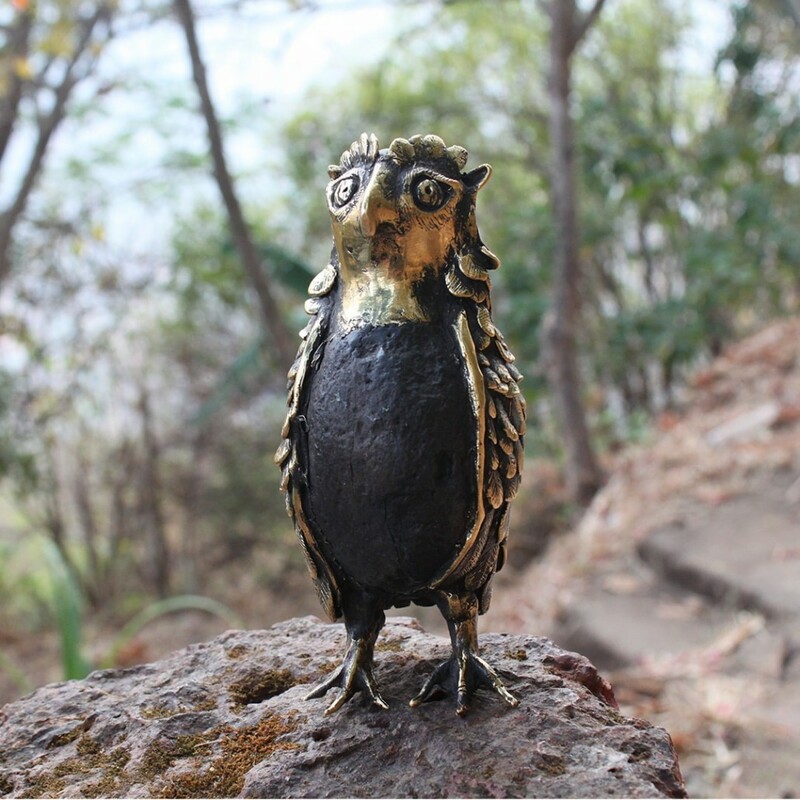 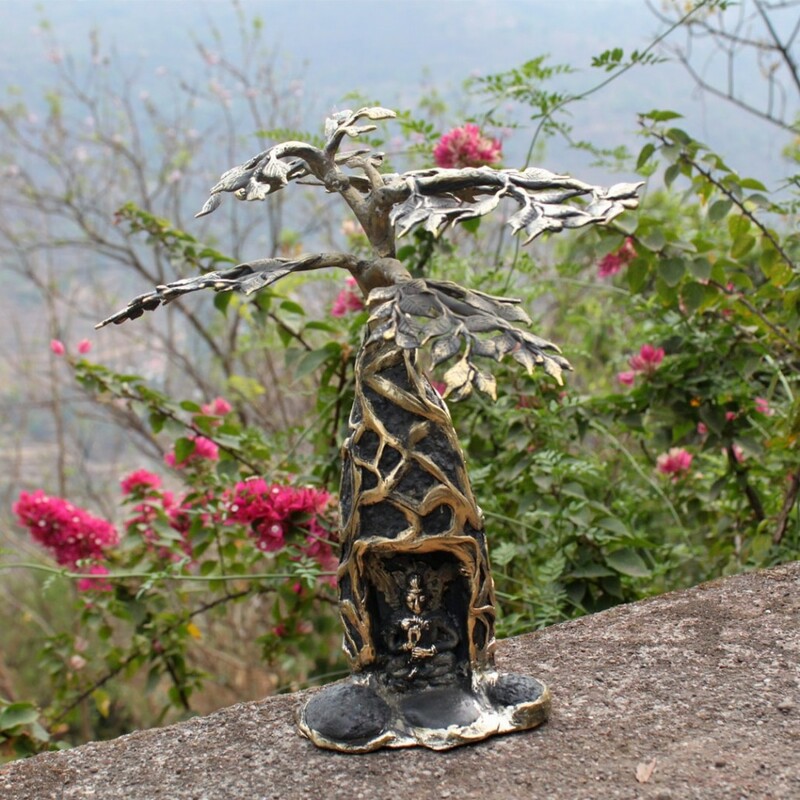 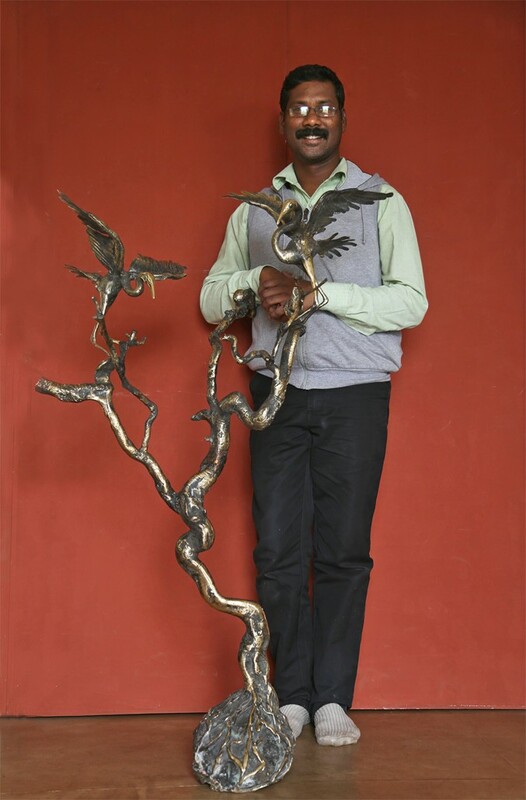 Devrai Art Village, a non profit initiative connects with nature and celebrates creativity. 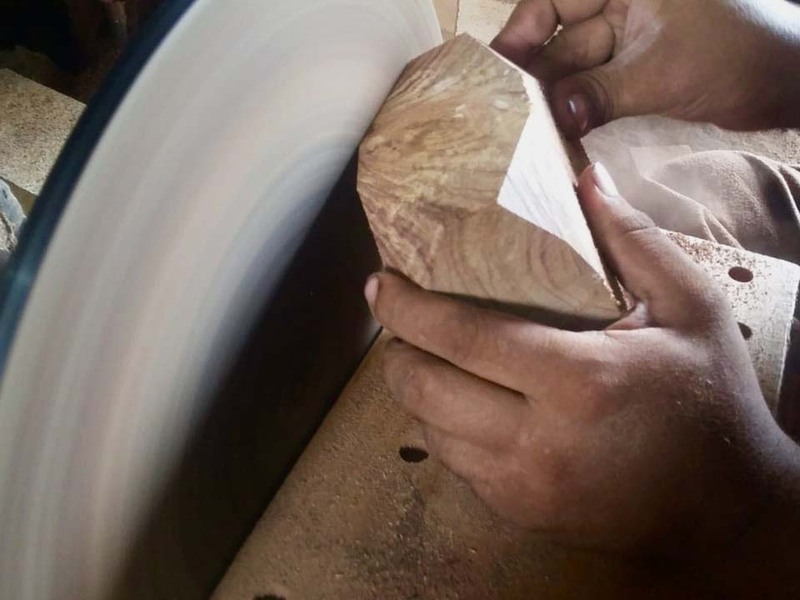 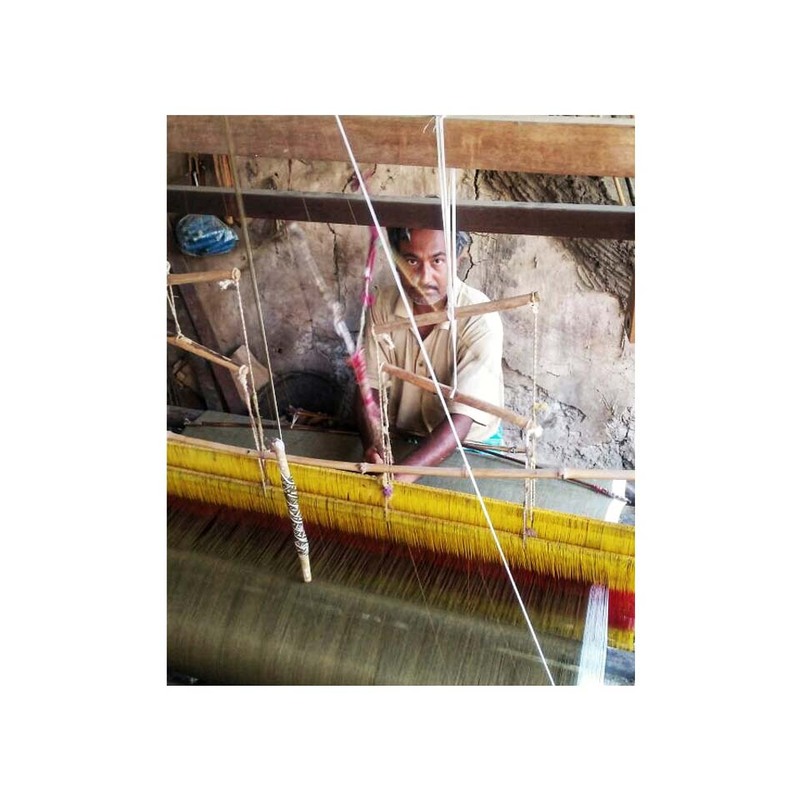 A core group of highly skilled Adivasi craftsmen and artists from the naxalite affected areas of Gadchiroli & Chhattisgarh find a livelihood and a safe refuge here in Panchgani. 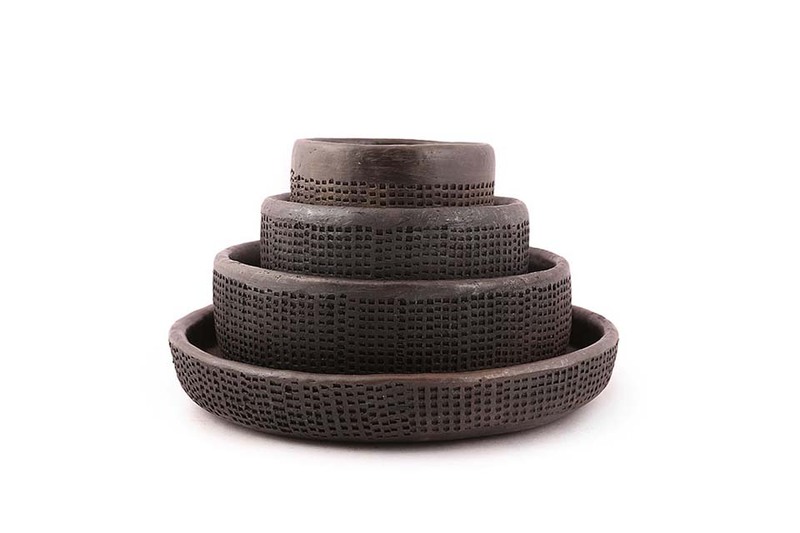 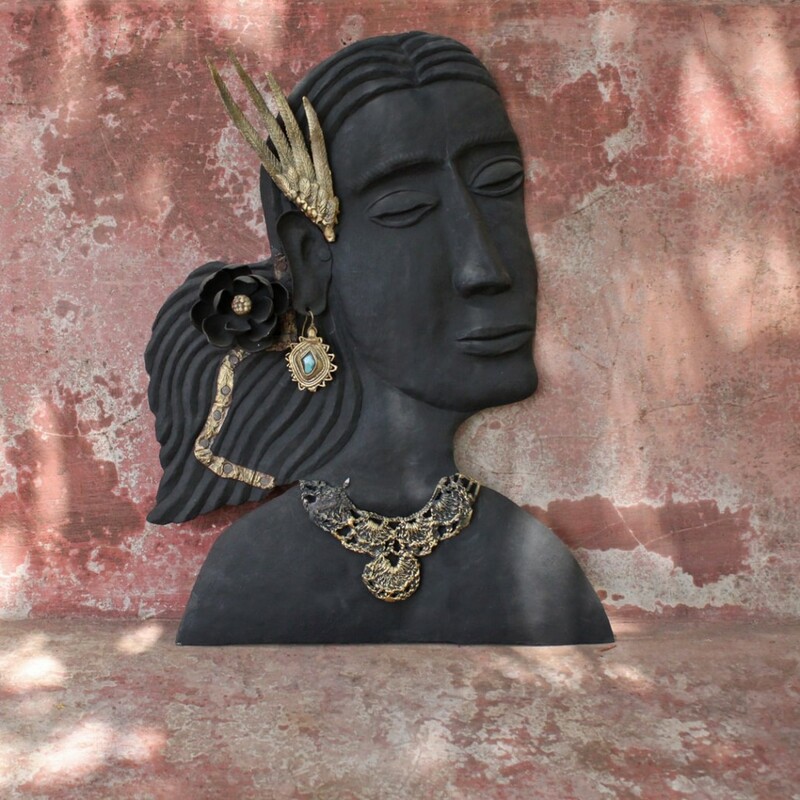 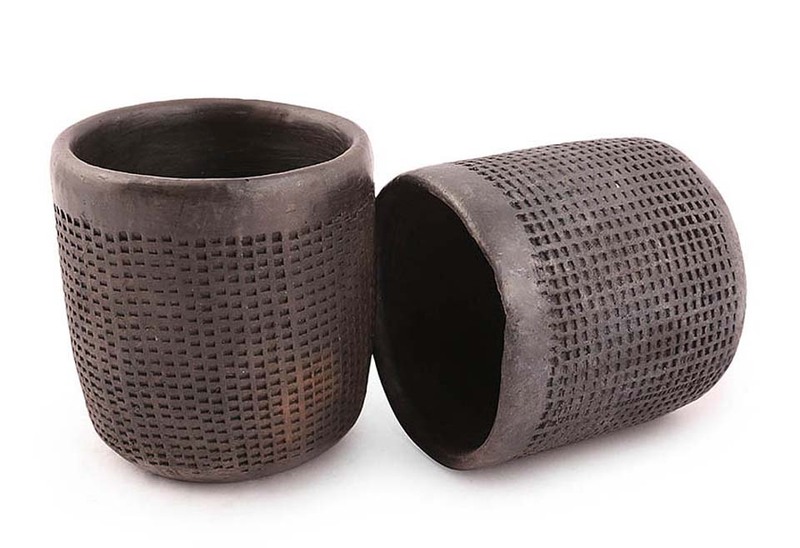 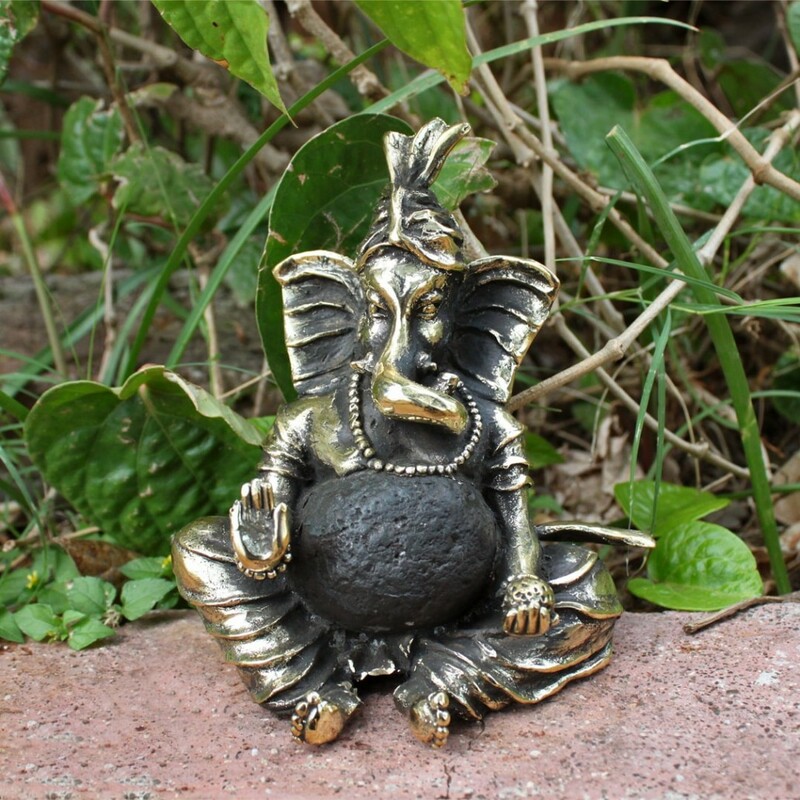 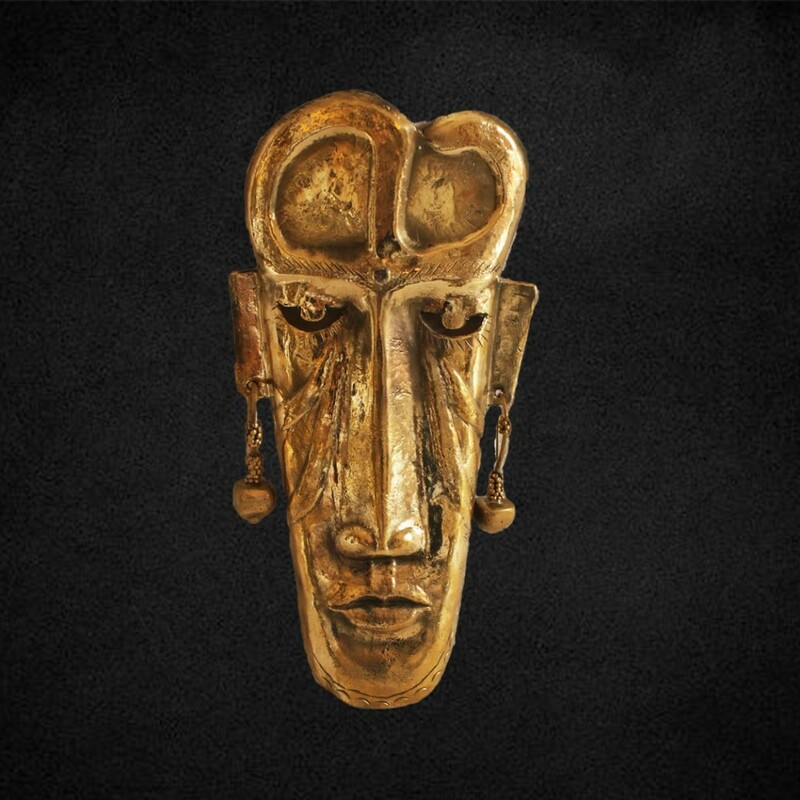 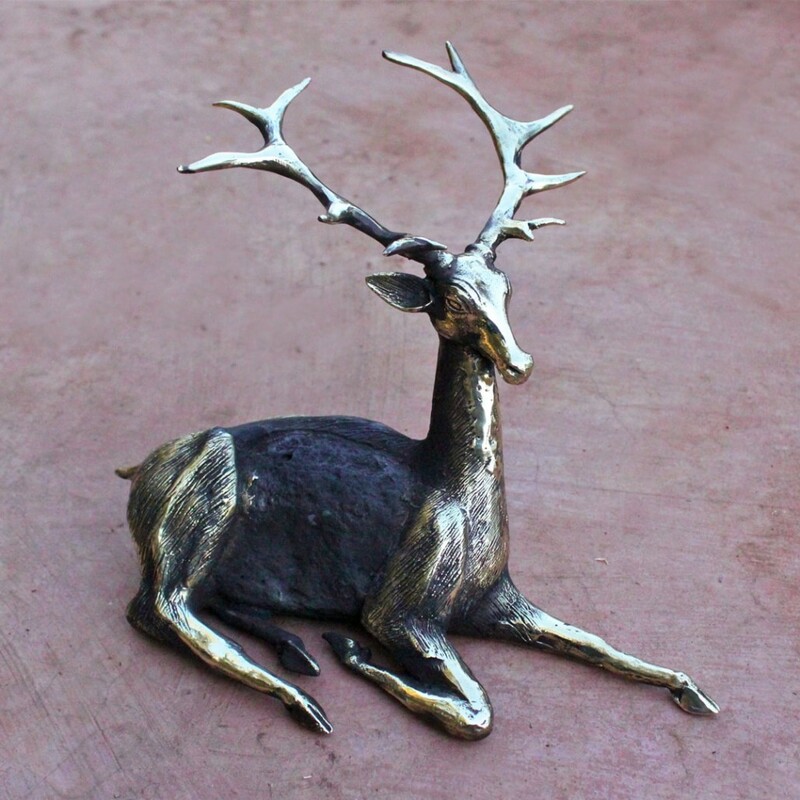 The unique and distinctive style of their product range comes out through combinations of different mediums such as iron, brass, stone, wood, bamboo and terracotta. 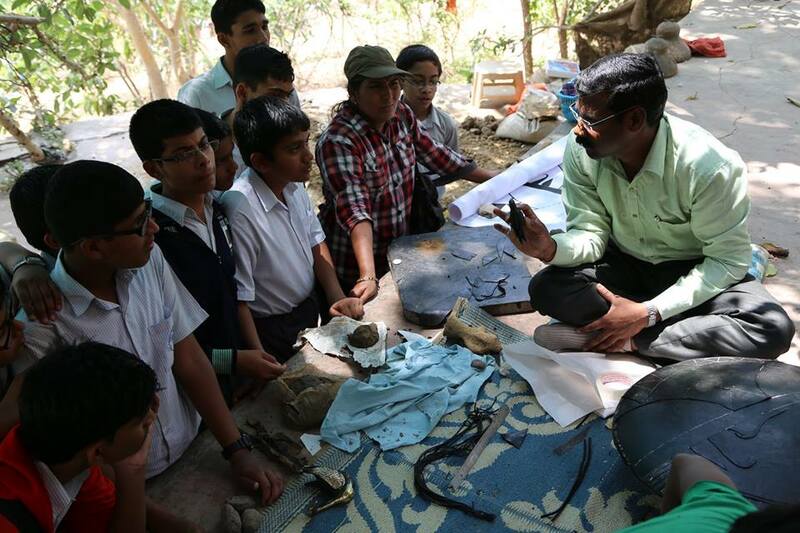 What they are known for is ‘Rock Dhokra’ (Fusion of brass & stone), a completely new invention for which they are getting a patent. 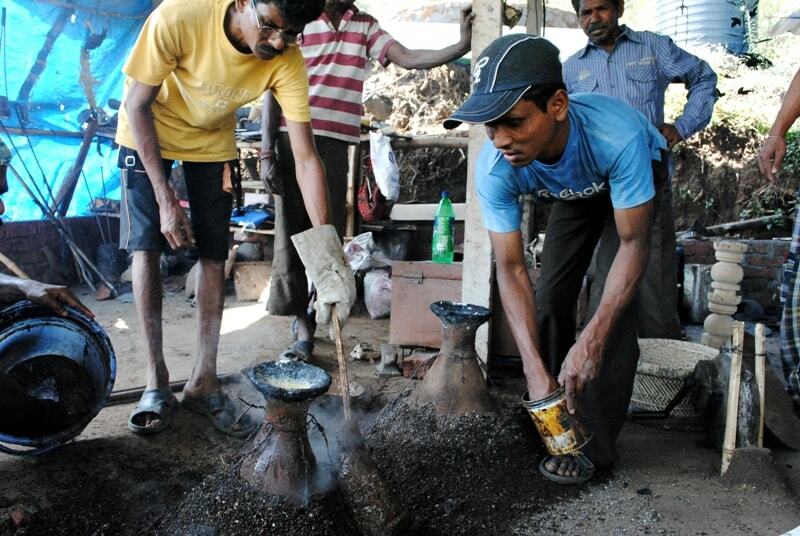 The Rock Dhokra process first creates the shape of the end product in bees wax around an appropriately chosen rock. 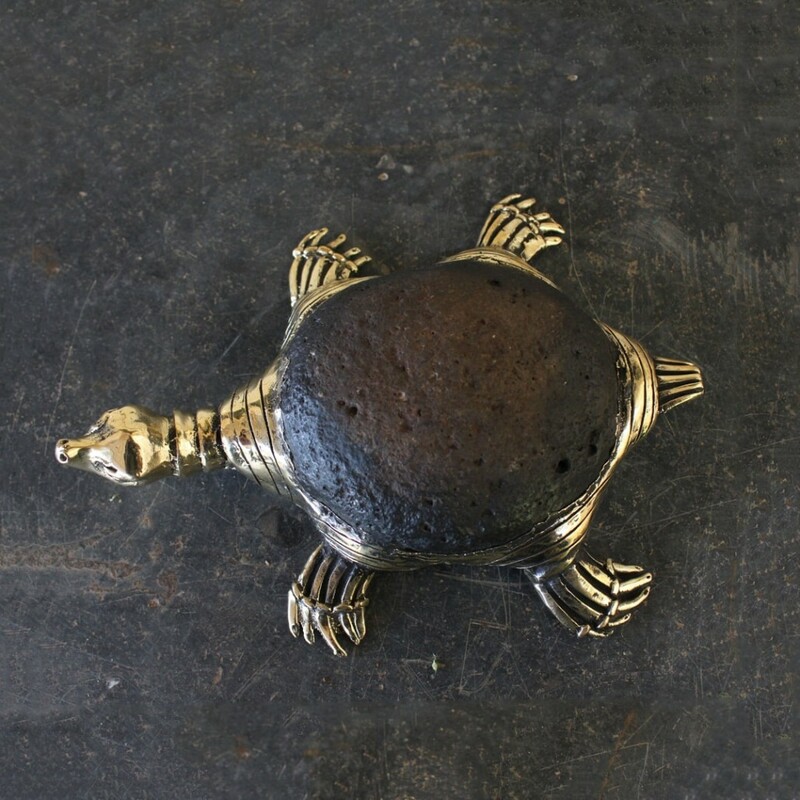 The rock is fused with molten brass in a high temperature kiln. 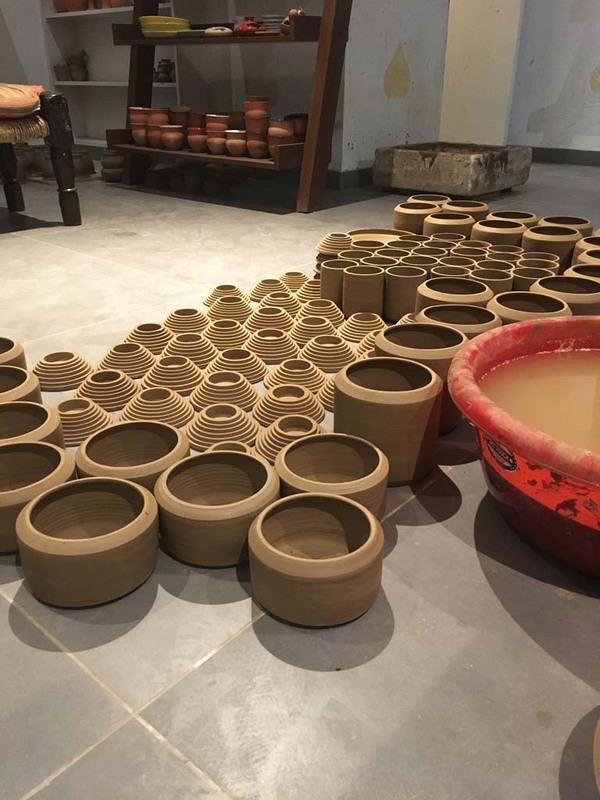 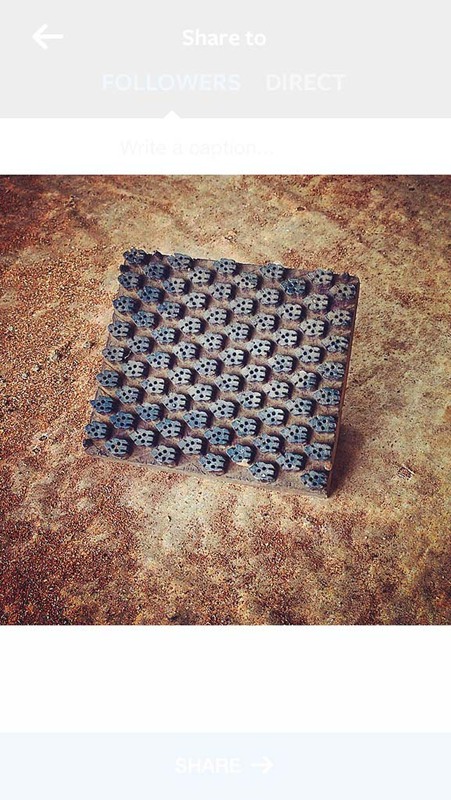 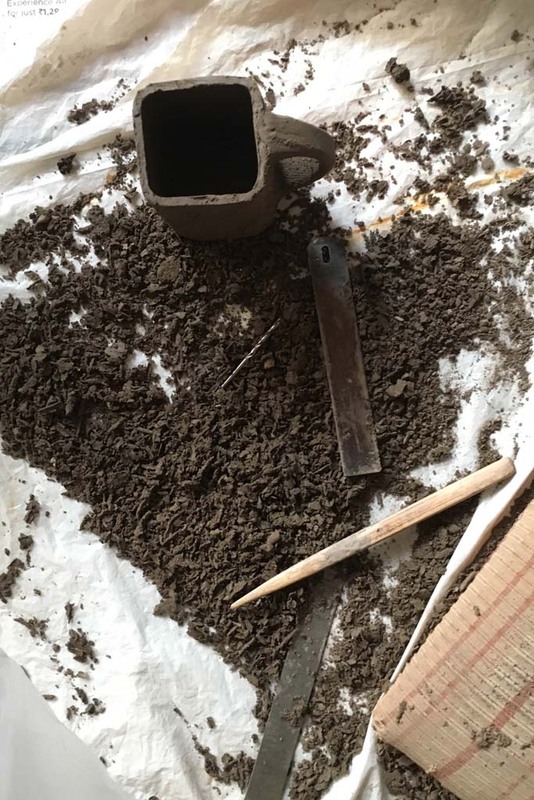 This combination of the traditional Dhokra art of ‘lost wax technique’ along with stone is a breakthrough that has never before been achieved. 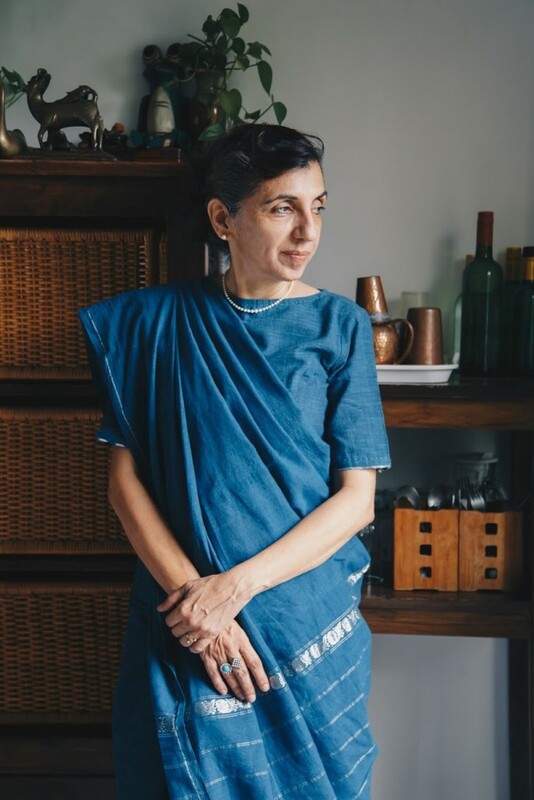 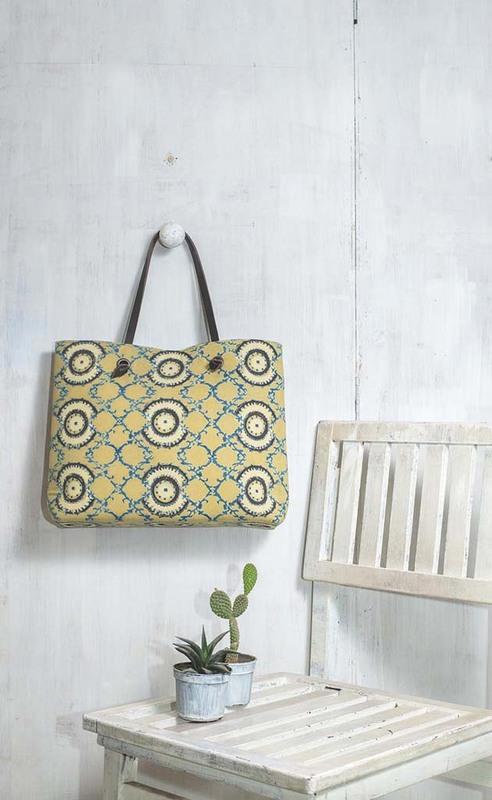 Bhavya Arya’s Classic Furnishers are designed and handcrafted with artisans in her family run studio in Delhi. 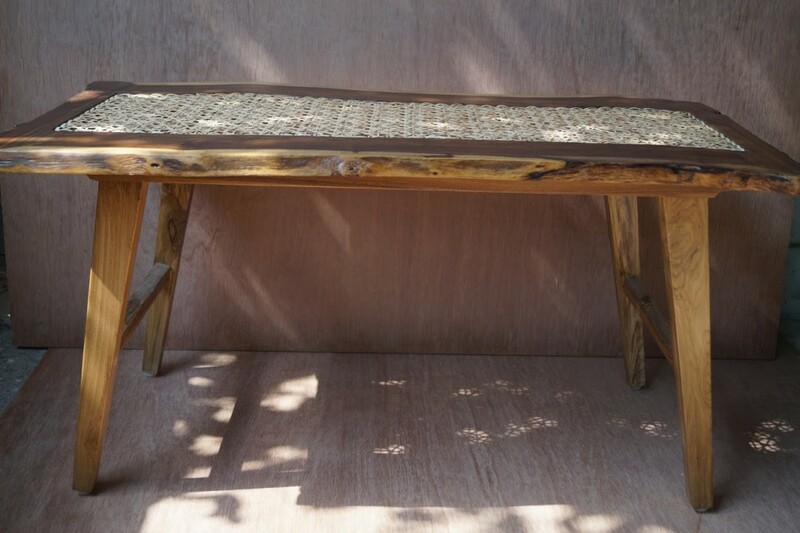 Classic Furnishers has exquisite handcrafted furniture in teakwood. 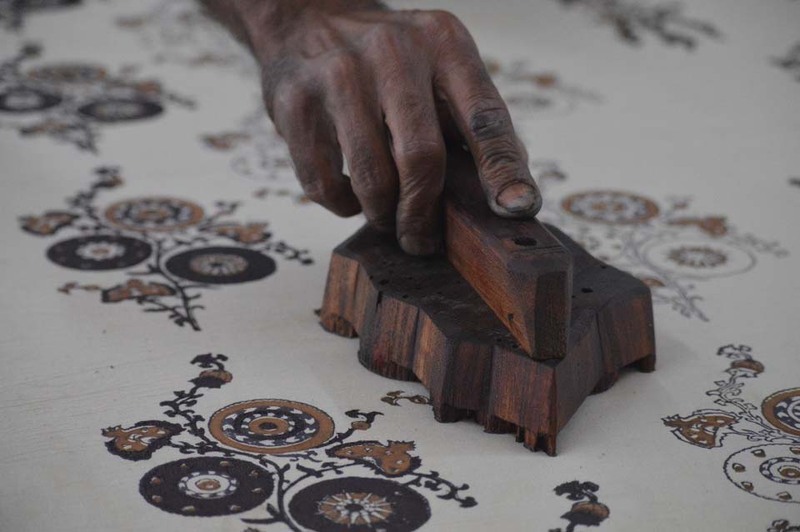 It was started with handcrafted traditional and Raj colonial furniture. 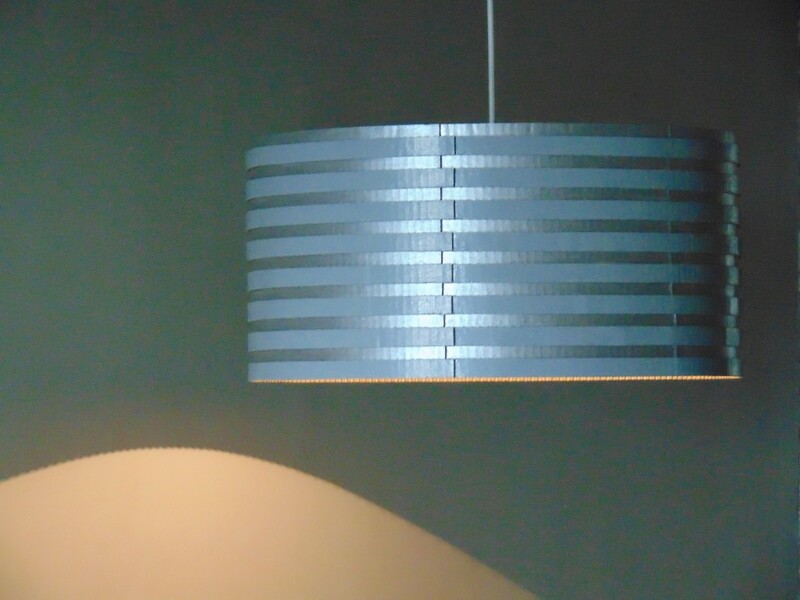 Today, their oeuvre includes contemporary furniture which retain the flavours and techniques detailing, etc of the past. 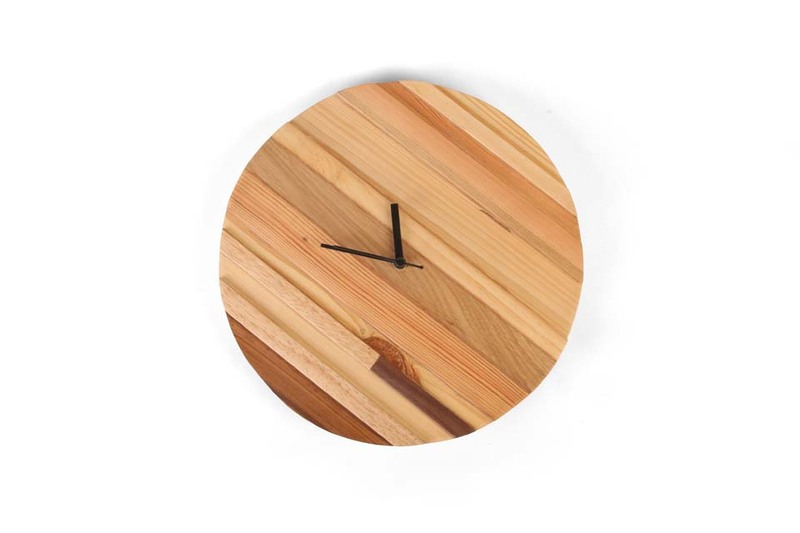 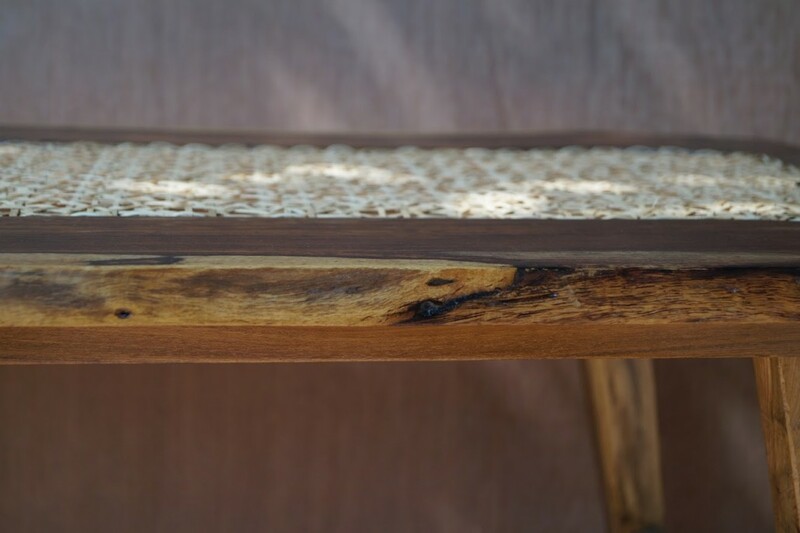 All the products are ergonomically designed, using old-world wood joinery techniques. 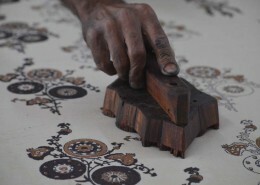 Hand rubbed polish is another outstanding feature as is the use of 8 way spring tying techniques for upholstering. 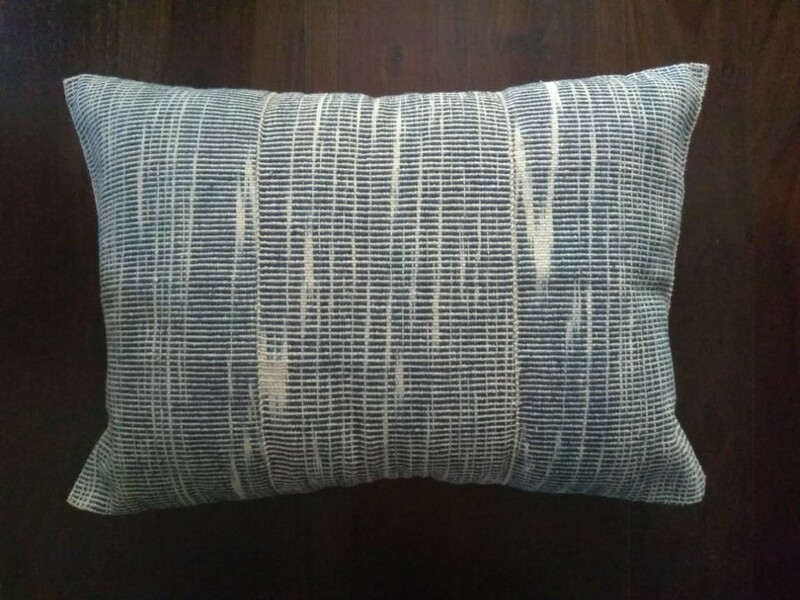 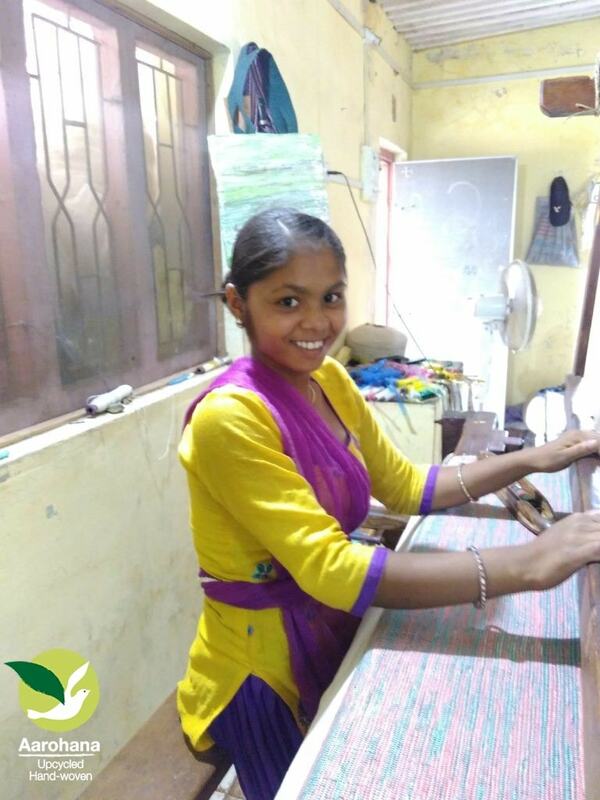 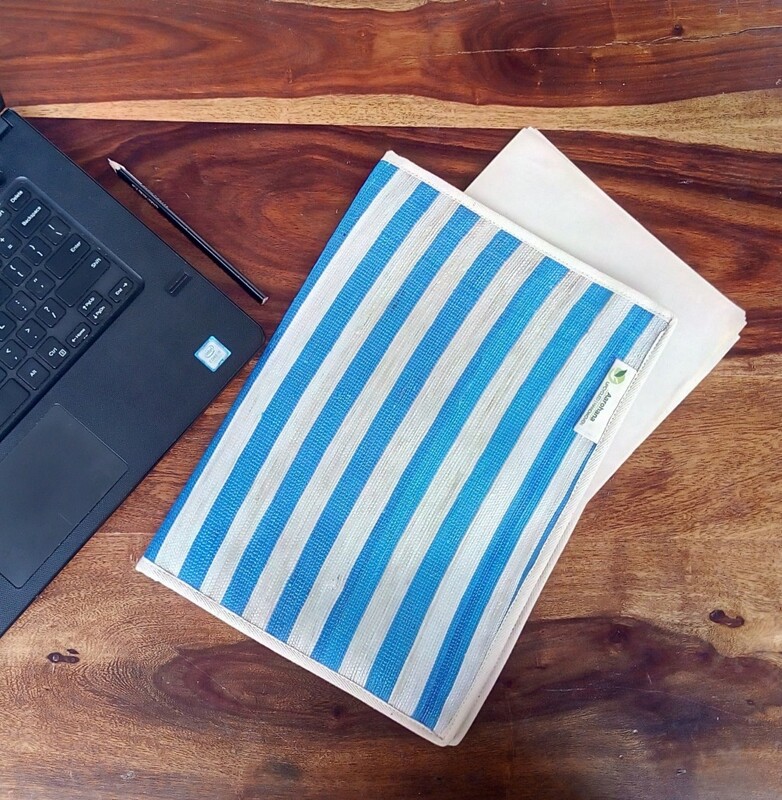 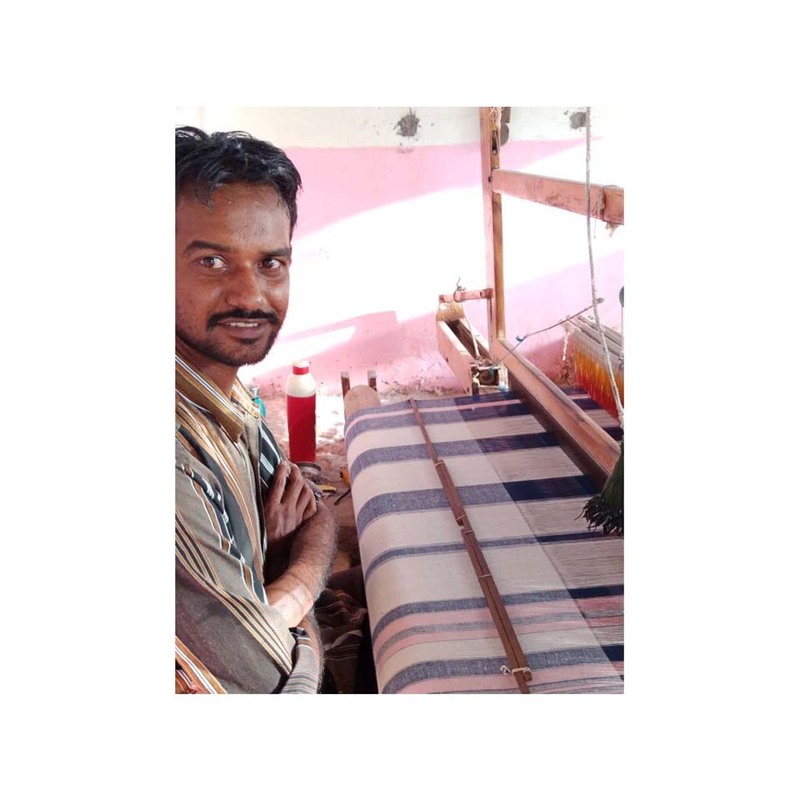 For Craftepreneur, Bhavya will showcase different products which focus on the craft of cane weaving along with ropes woven with recycled fabric from villages of Barmer, Rajasthan. 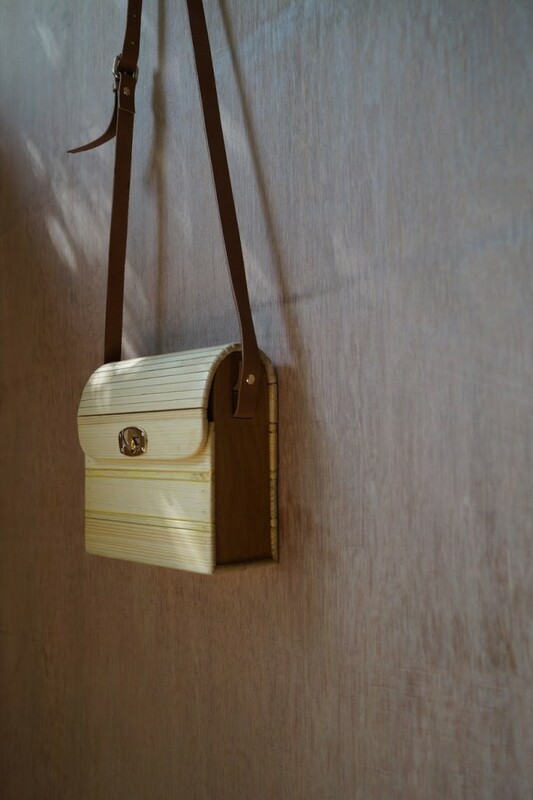 She has also extended her love for wood working on creating a collection of bags, lamps & partitions with pinewood and cane weaving. 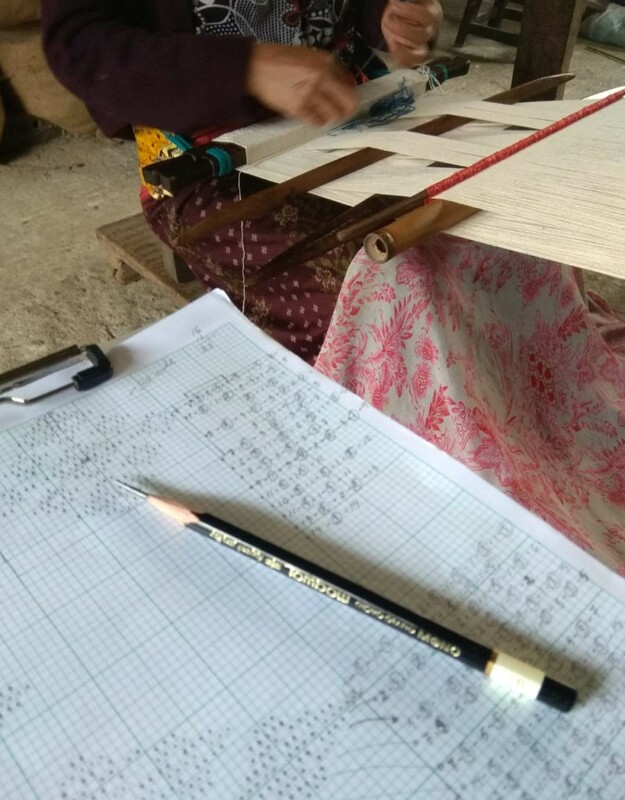 Commitment to Kashmir Initiative (C to K) was conceived by Gandhian economist, late Shri. 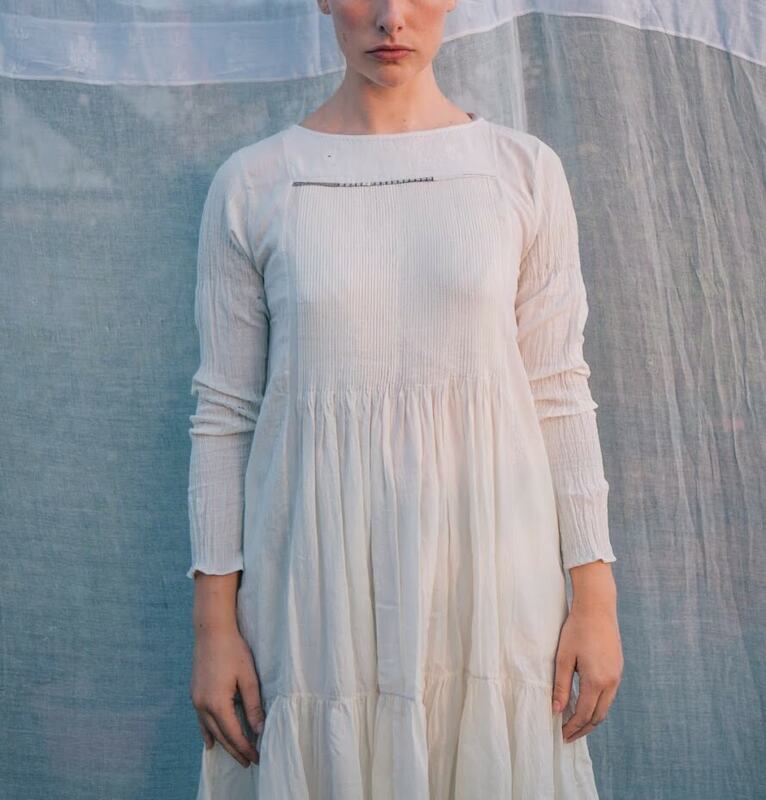 L.C. 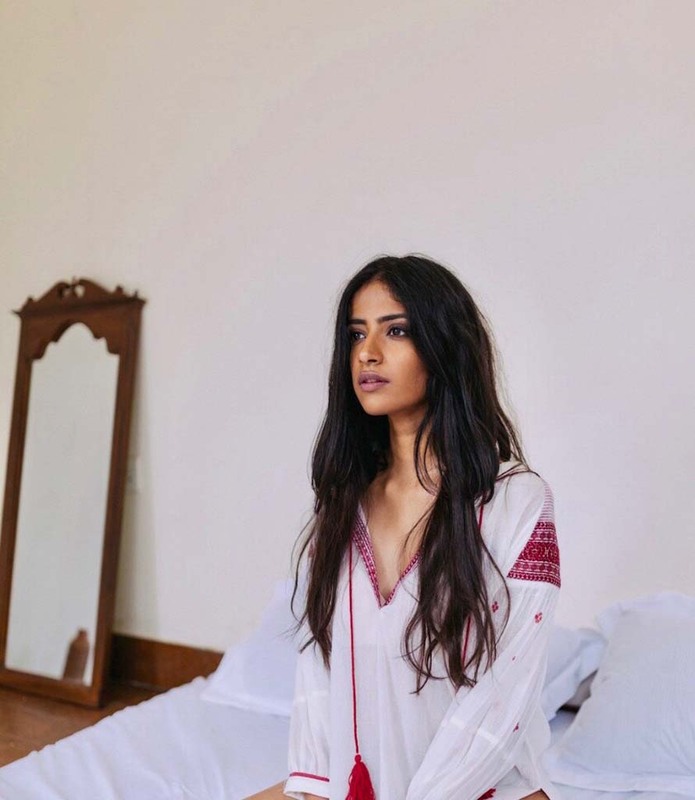 Jain. 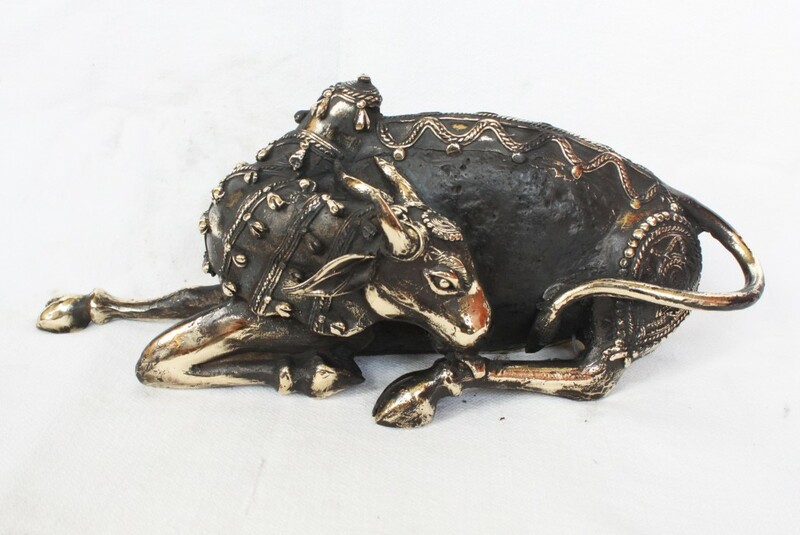 It is managed by a group of eminent individuals and institutions having over 6 decades of working in the handicrafts sector. 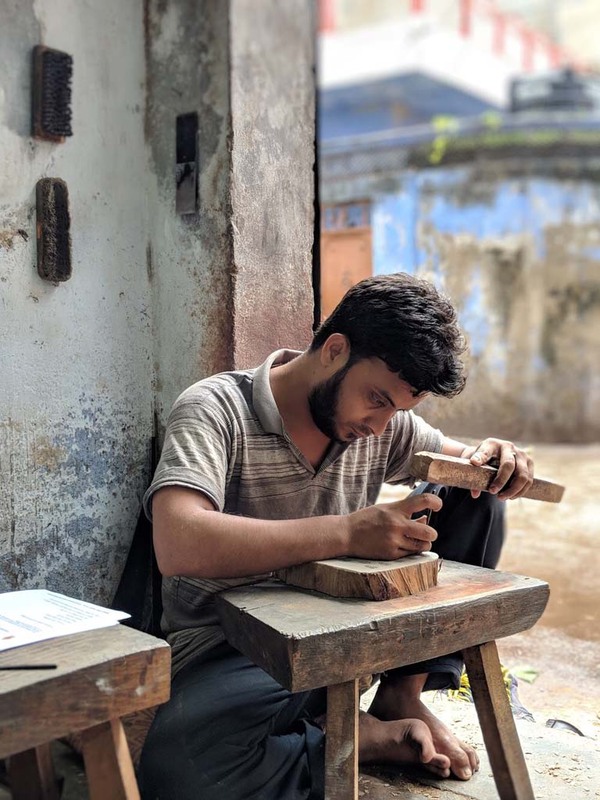 C to K works with young craftspersons of the valley, enabling them to become independent and sustainable craft entrepreneurs. 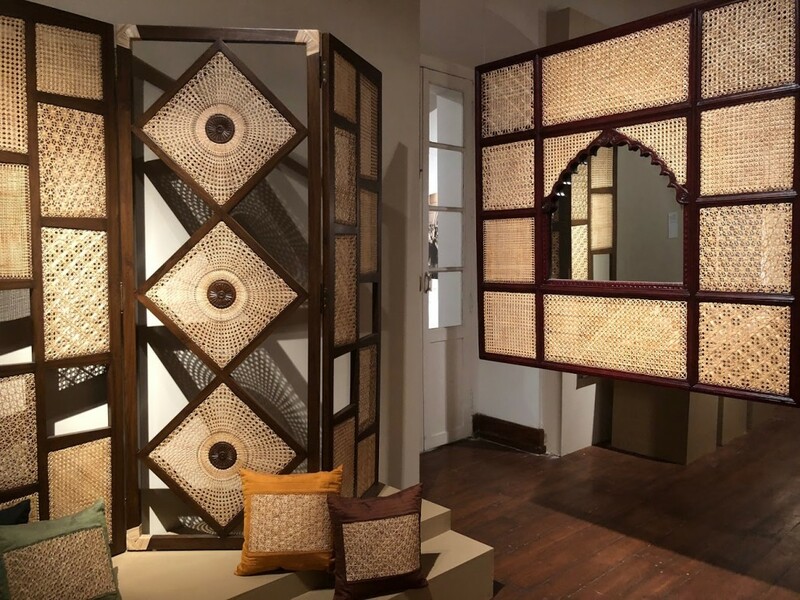 One such example is that of Jahangir Bhat, a craft entrepreneur, who with design guidance provided by C to K has created a contemporary range of home furnishings. 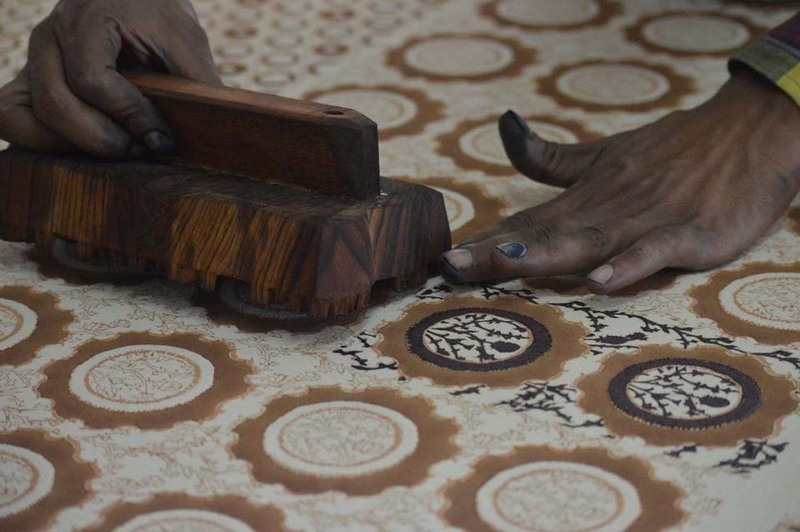 C to K has worked with artisans skilled in embroideries like chain stitch and crewel, pashmina work and namda carpet making & has led interventions in the craft techniques of workers in papier mache, copper moulding, walnut wood carving, etc. 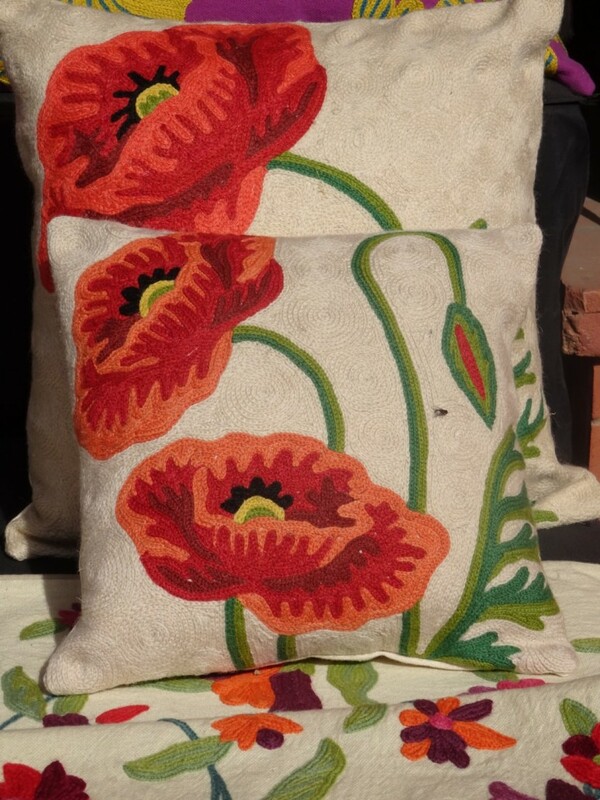 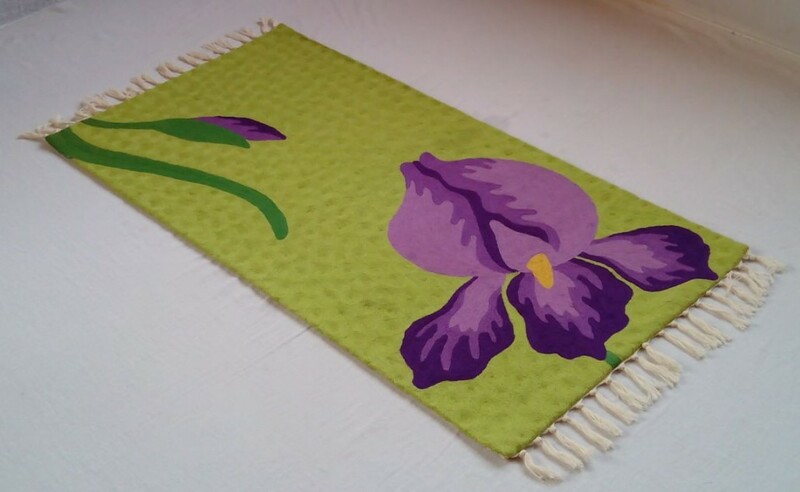 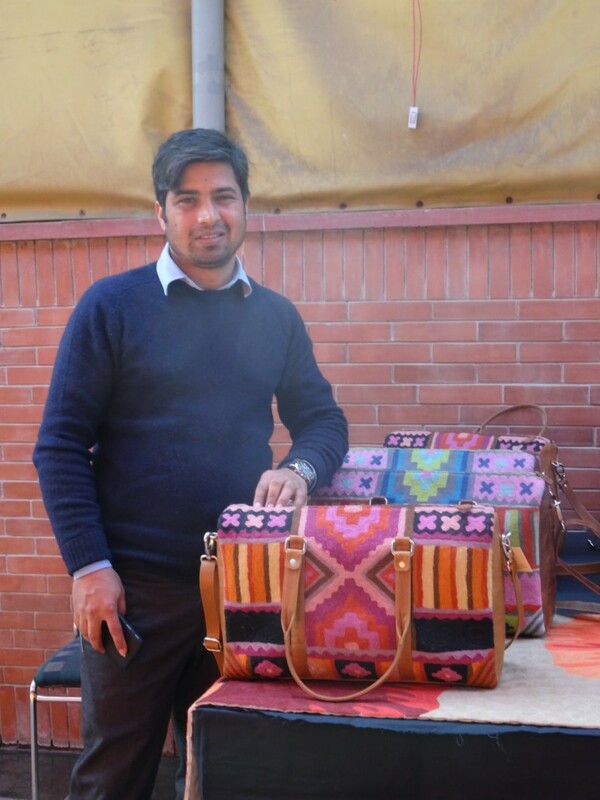 Jahangir’s craft on view at Craftepreneur are cushion covers, rugs, bags, curtains and table runners, etc. 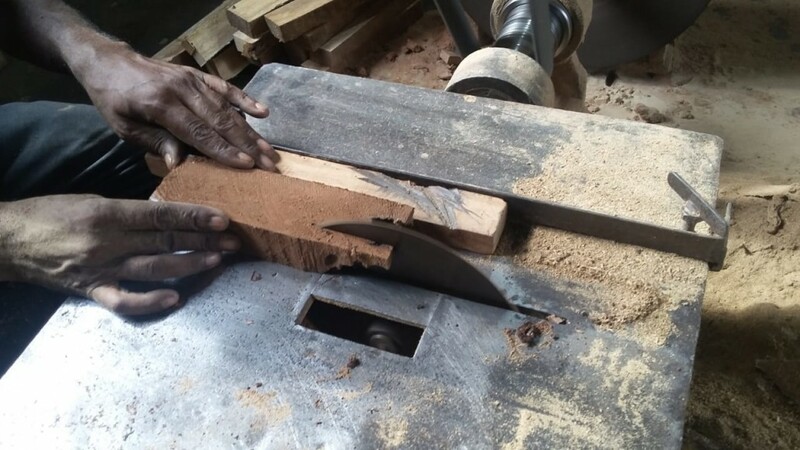 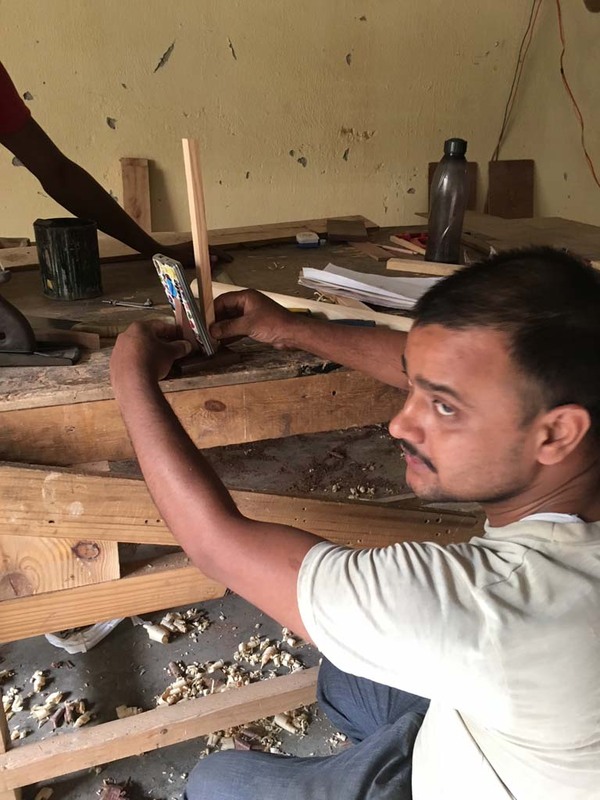 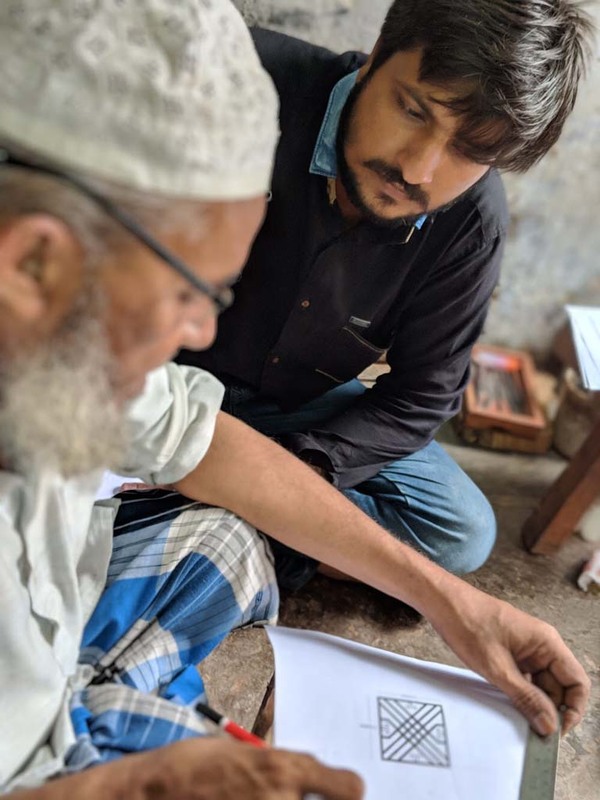 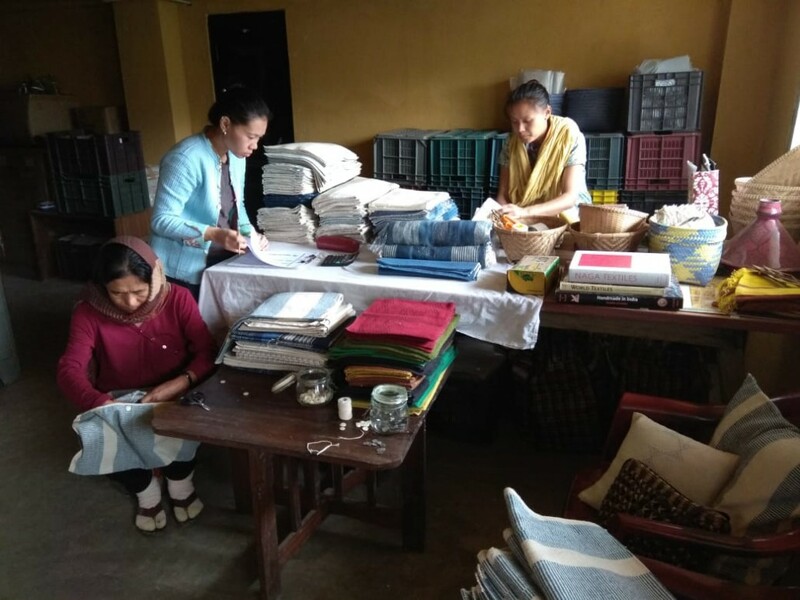 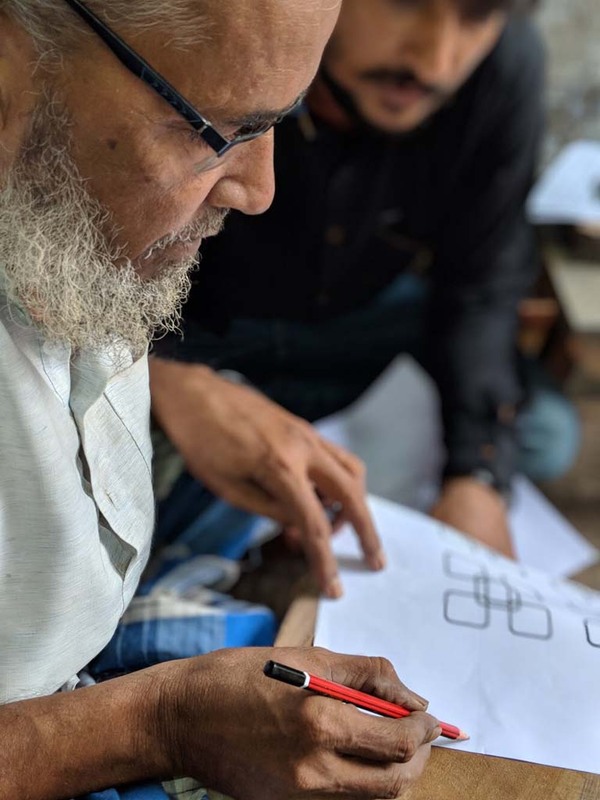 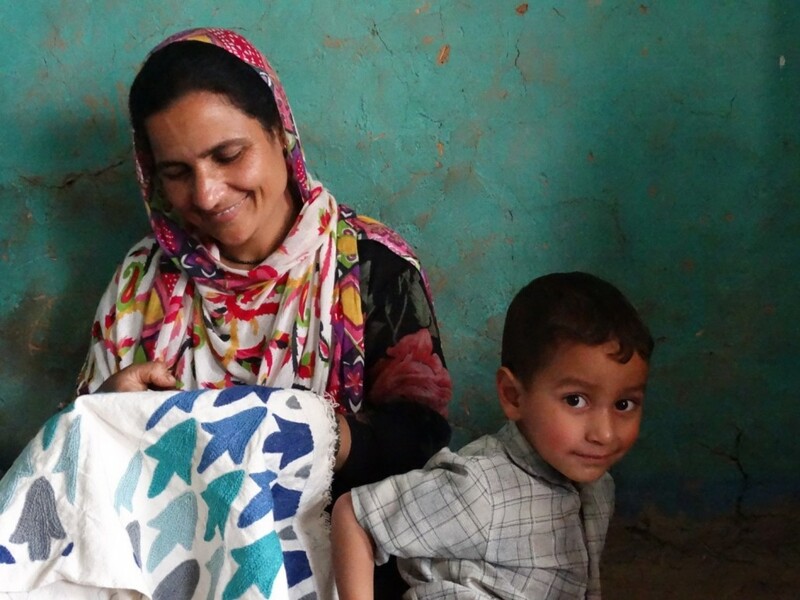 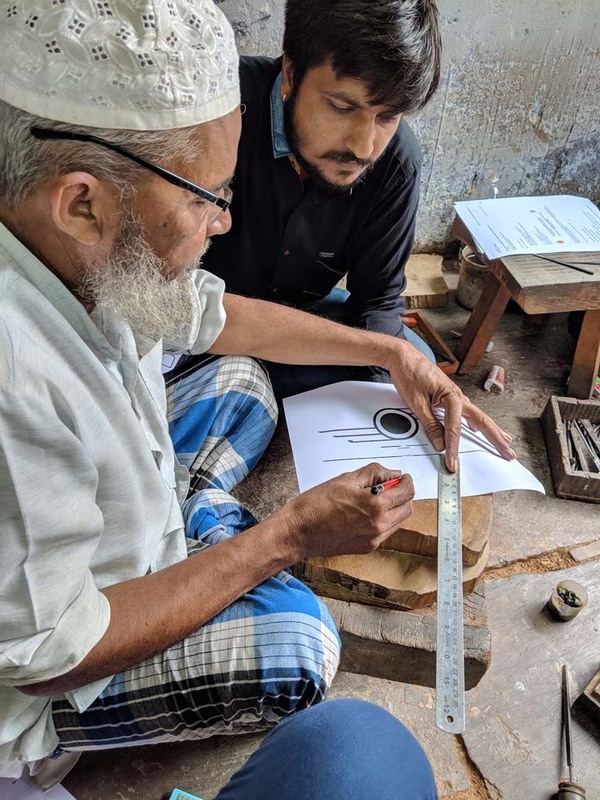 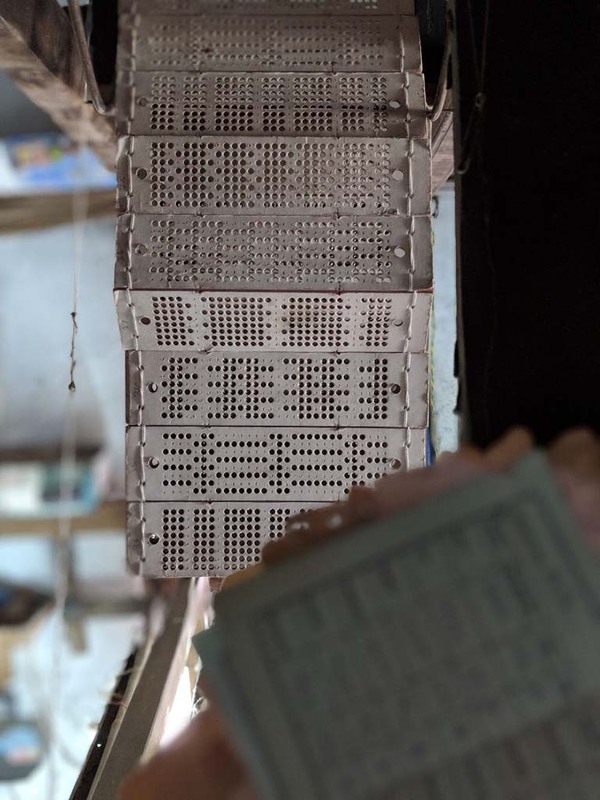 The impact of design led intervention by CtoK has helped Craftepreneurs like Jahangir create regular and sustained income for the 20 women artisans working with him in the district of Kulgam. 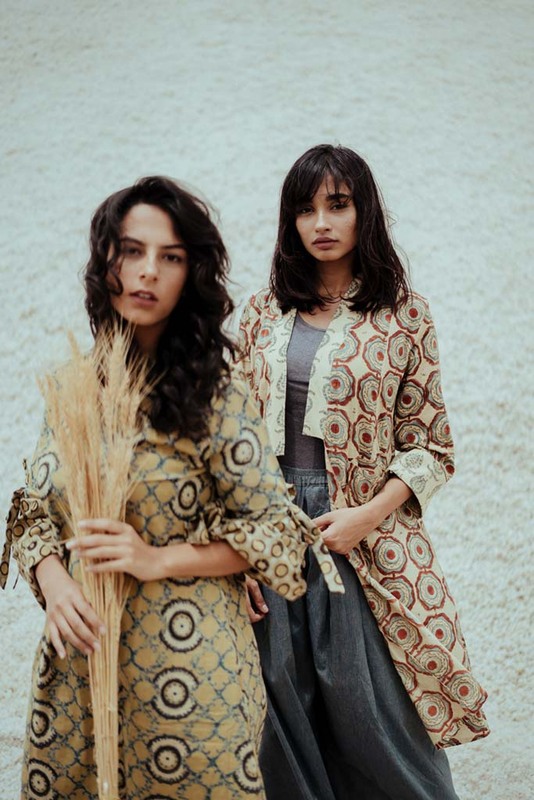 Buna’s SS’18 collection’s luxurious Pret line is a tribute to the heritage tradition of handwoven khadis and their Jamdani weaves, which has been declared by UNESCO as one of humanities most significant achievements. 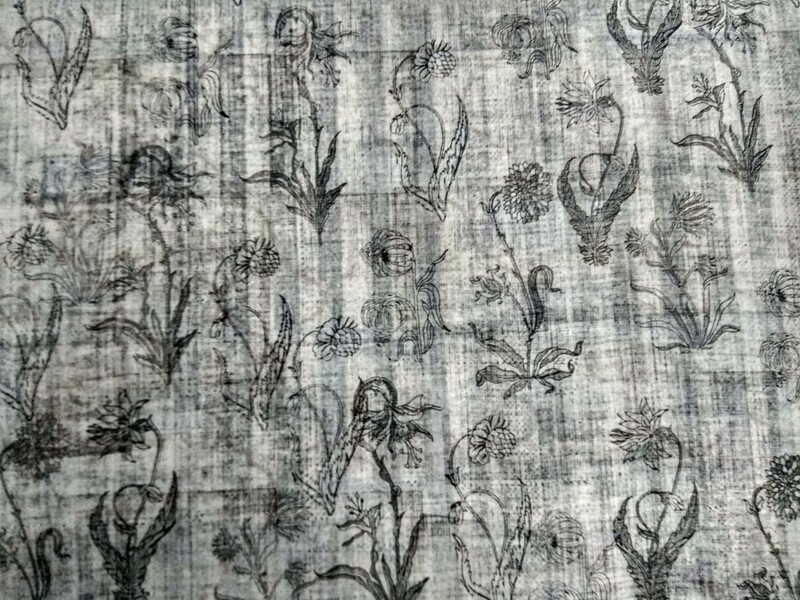 Jamdani, described in ancient textile texts as ‘Threads of Wind’ is labour intensive and time consuming form of weaving in which intricate opaque motifs are interlaced over a fine muslin base. 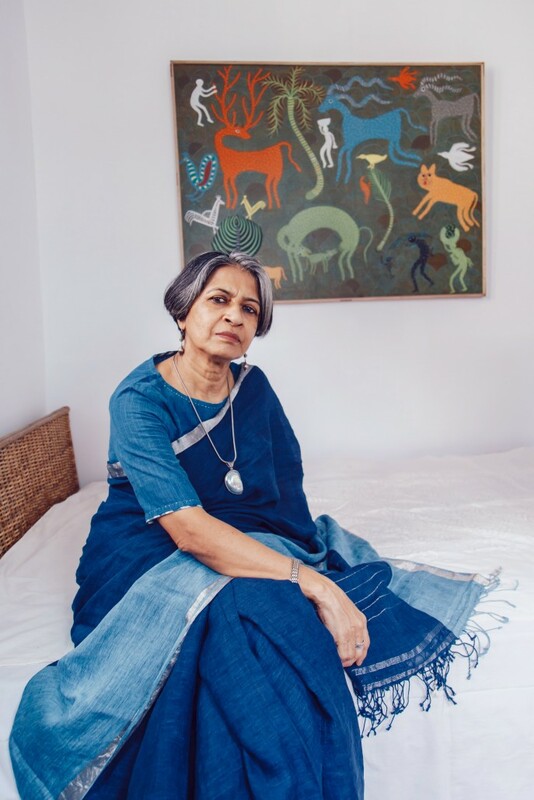 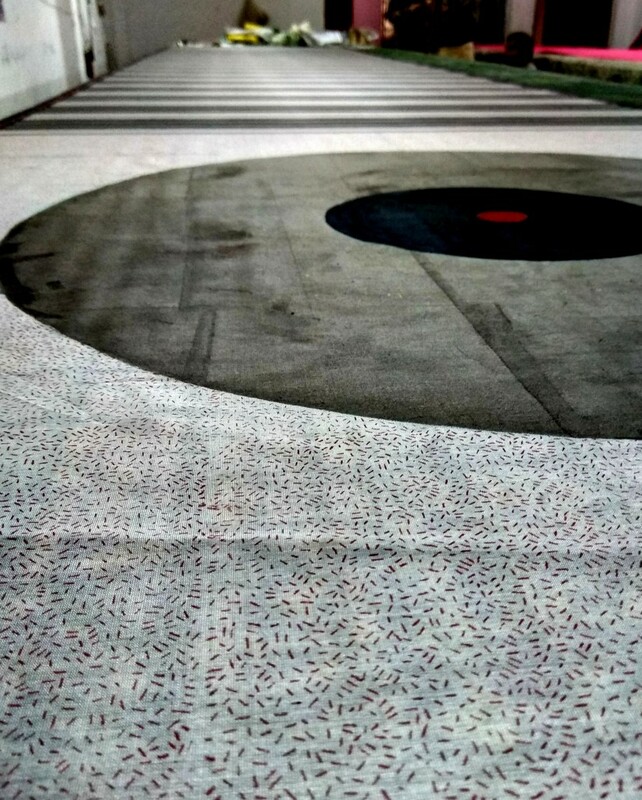 It has been contemporised by Buna’s founder and Creative Director Pallavi and her team who have worked with motifs of dots, clouds and flying birds. 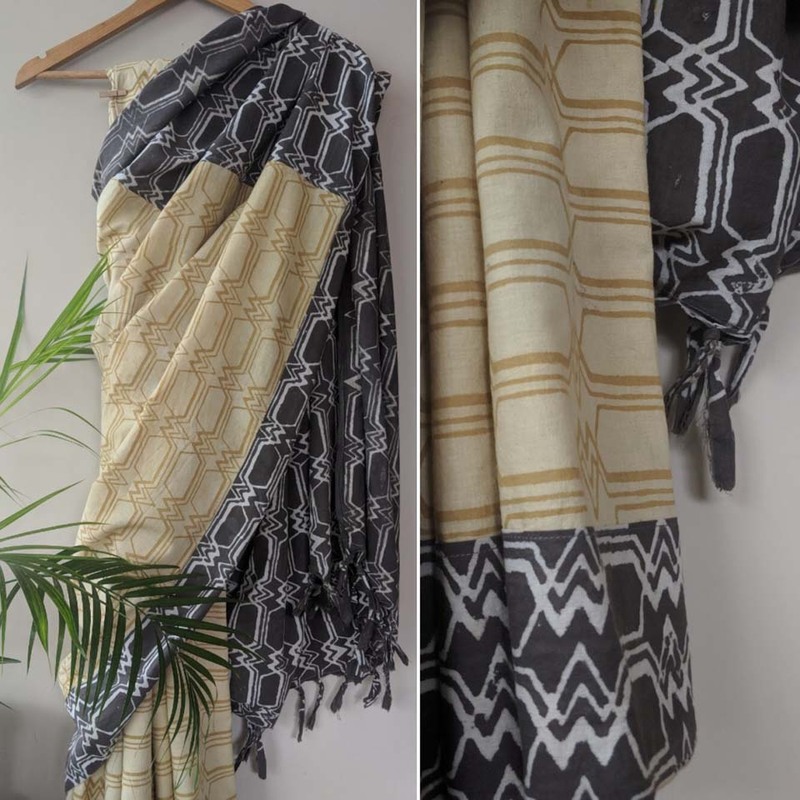 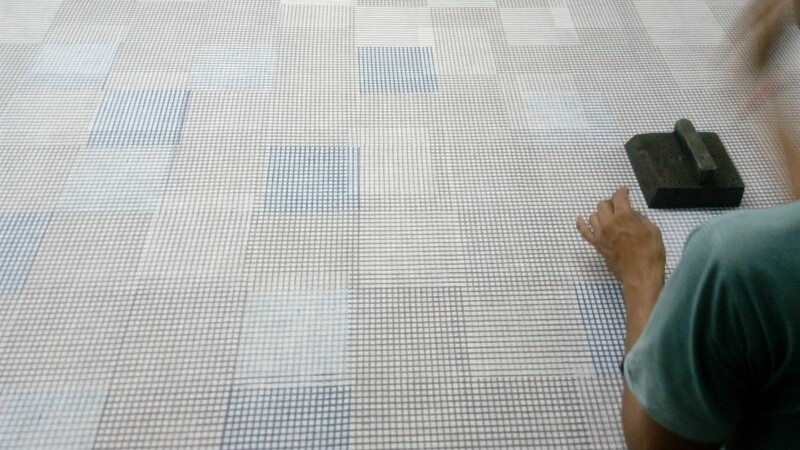 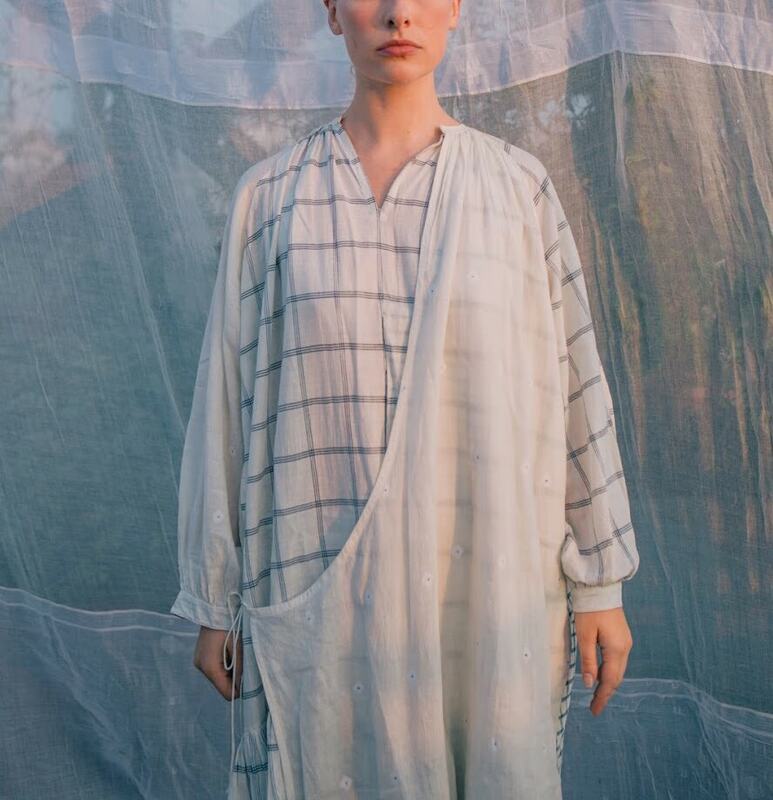 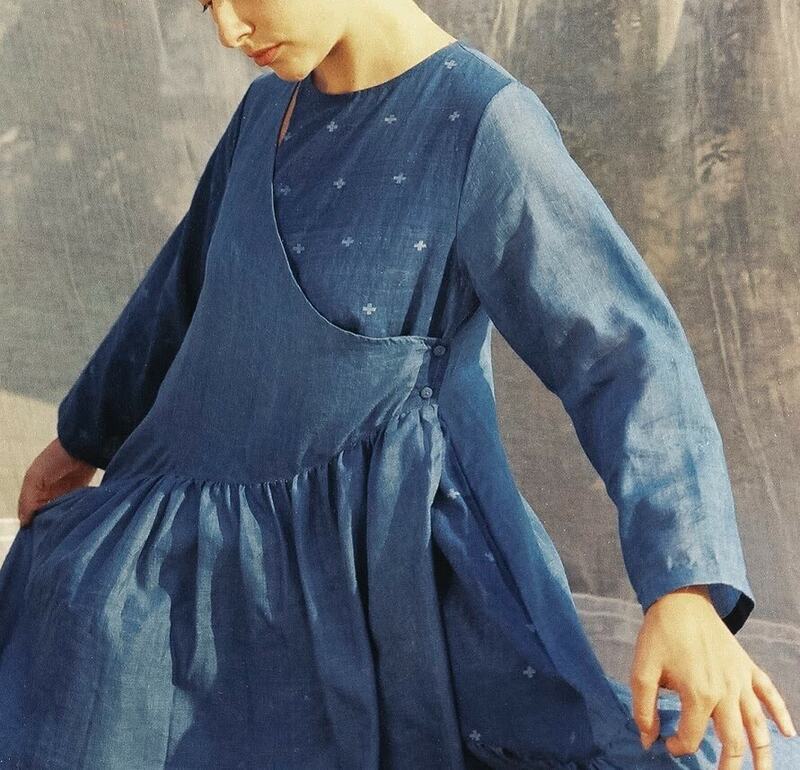 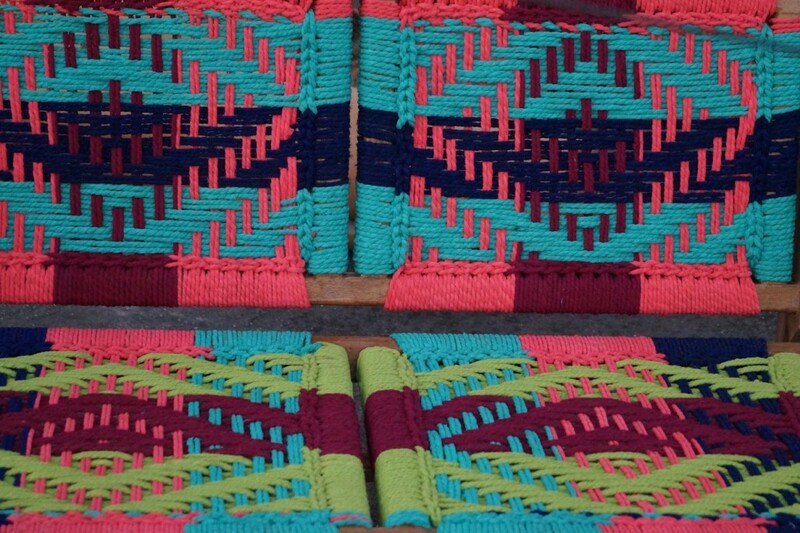 The weaving techniques used by Buna are ancient and sustainable while the designs and dainty silhouettes are original, modern, relaxed and flowing. 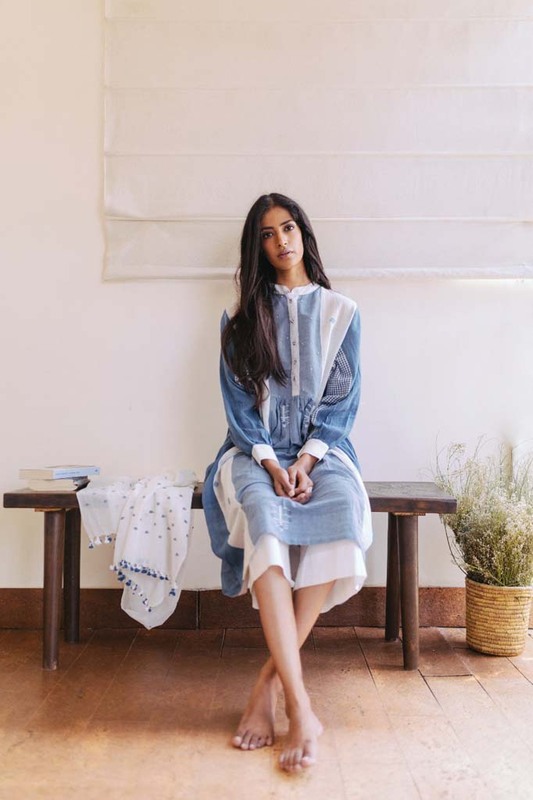 The glowing palette – whites unbleached and raw, the blues of the sky – brings a sense of space and lightness into everyday life and is a celebration of the present moment & slow living. 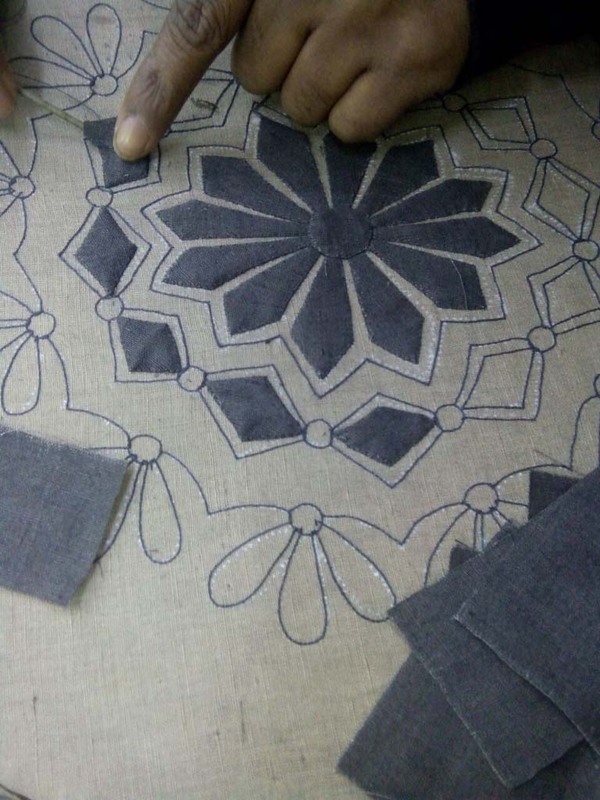 Every piece of Boriya Basta is a unique mix of tradition, craftsmanship and design that we see around us. 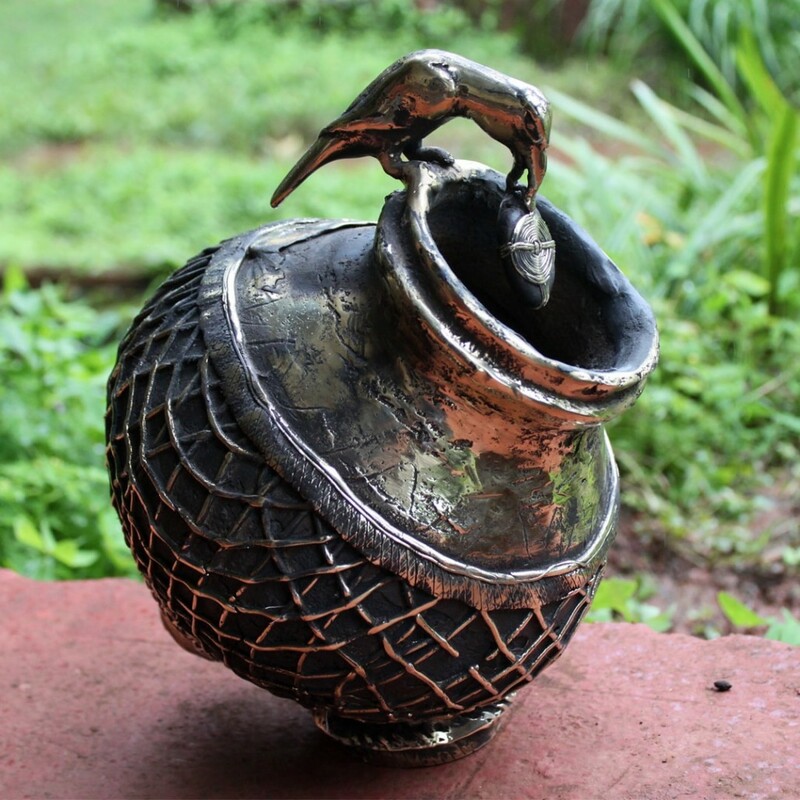 It reflects the cultural threads of lesser known Indian crafts. 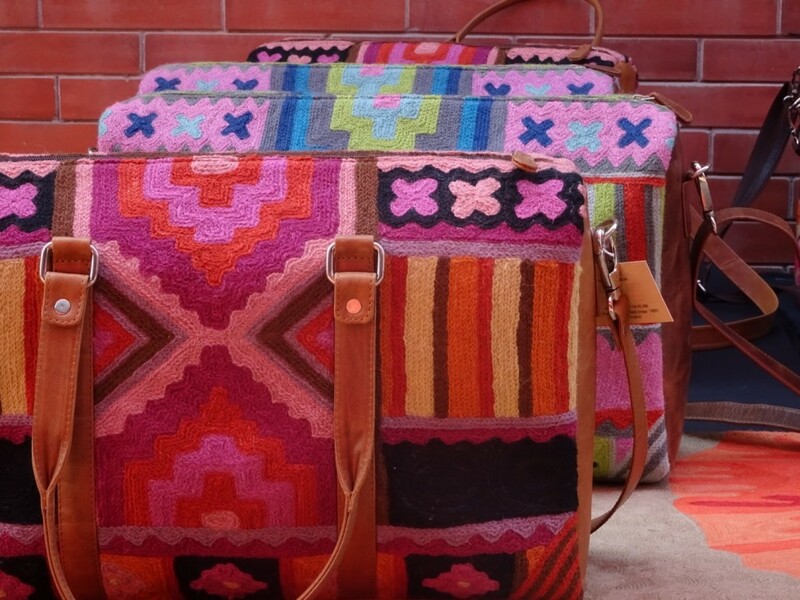 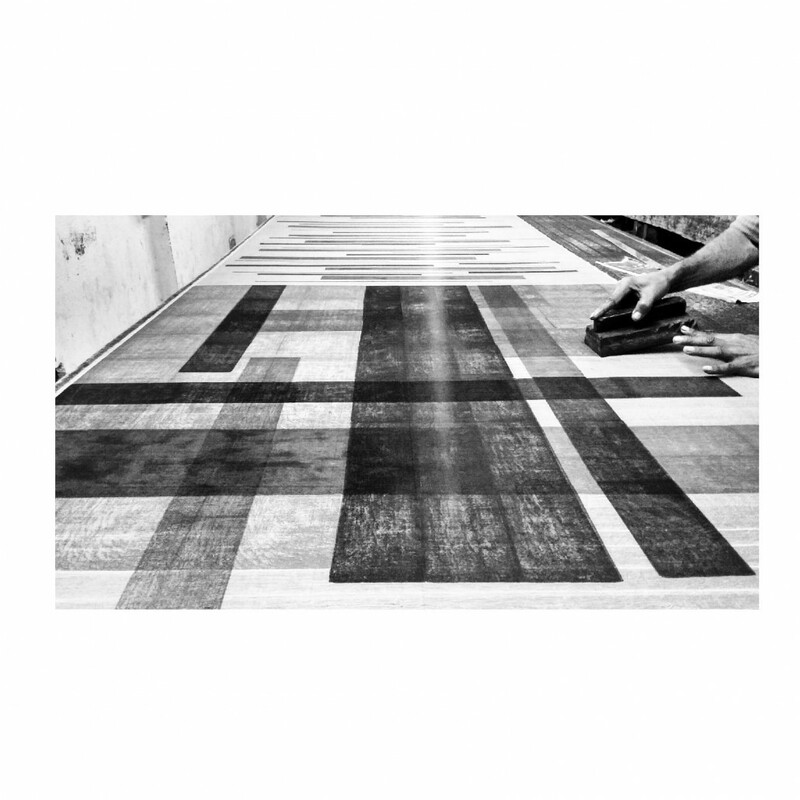 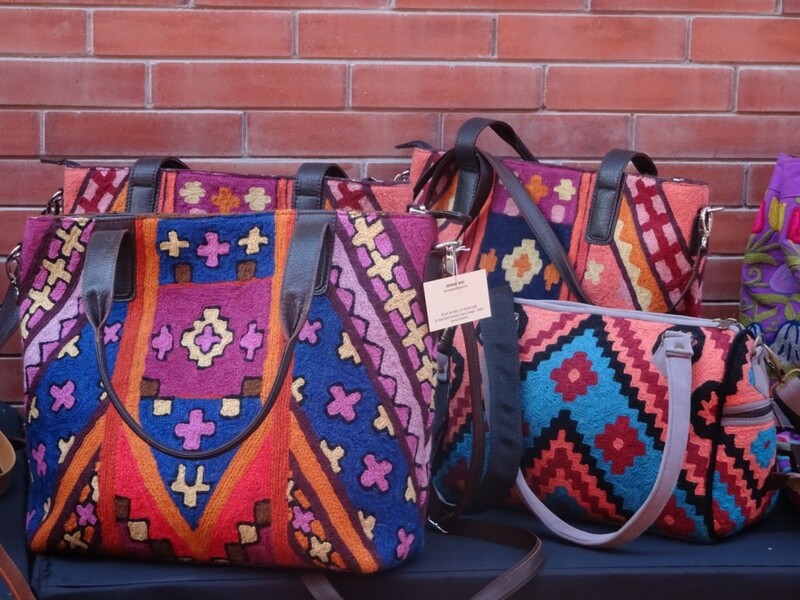 The USP of the breathtaking Boriya Basta product is the use of the hand woven Kilim which is a slit woven textile mostly used as floor coverings. 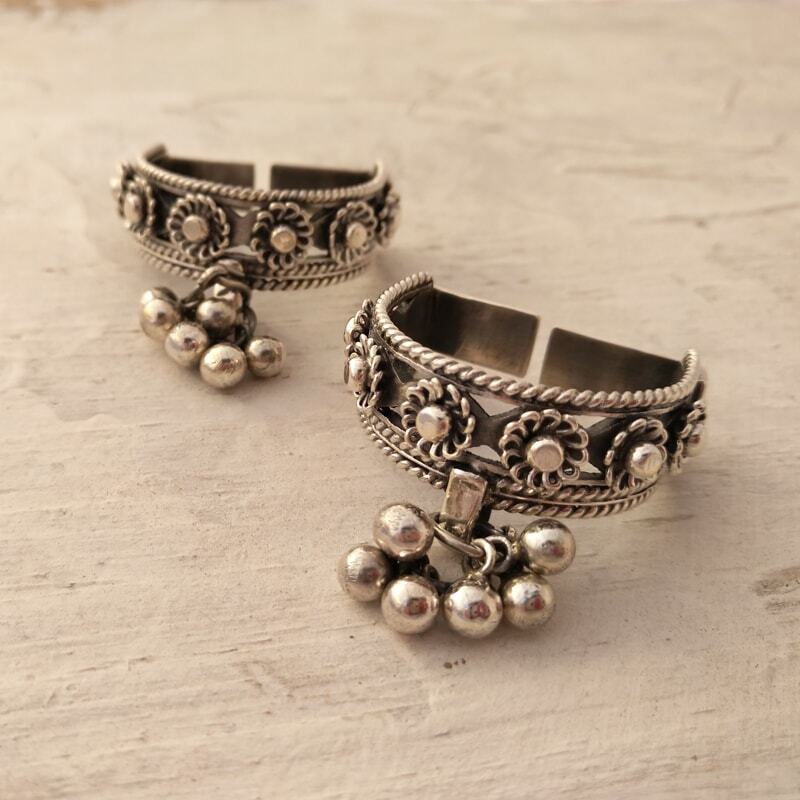 It has been used to make several beautiful products by merging old world traditions with new age design. 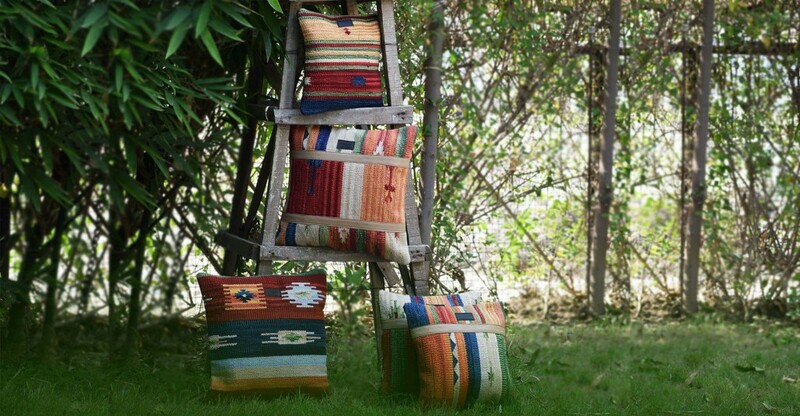 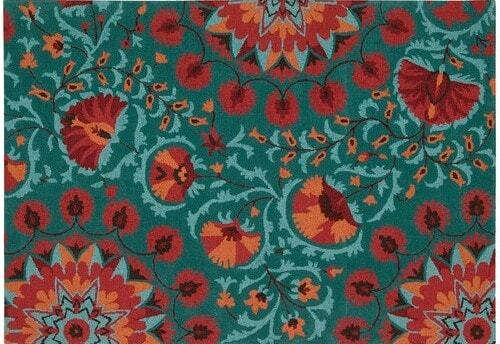 India is a major producer of Kilim which is woven in Bhadoi near Varanasi. 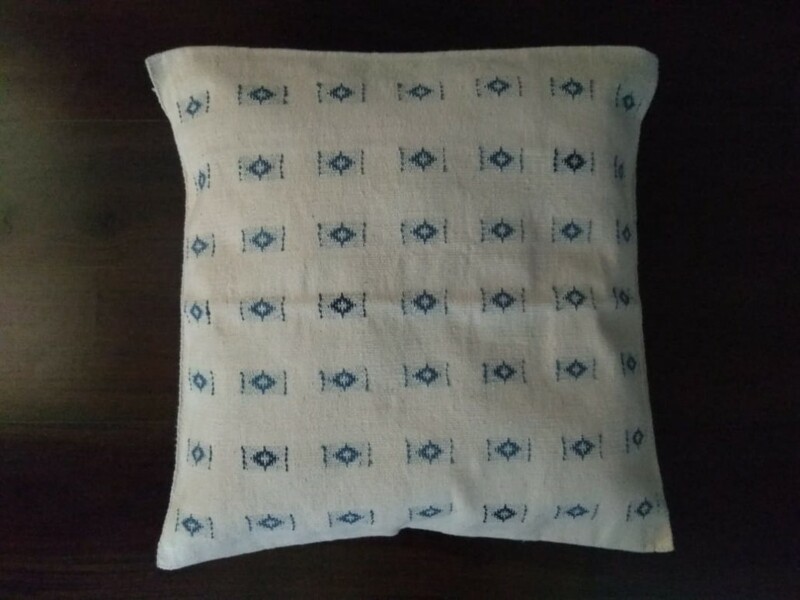 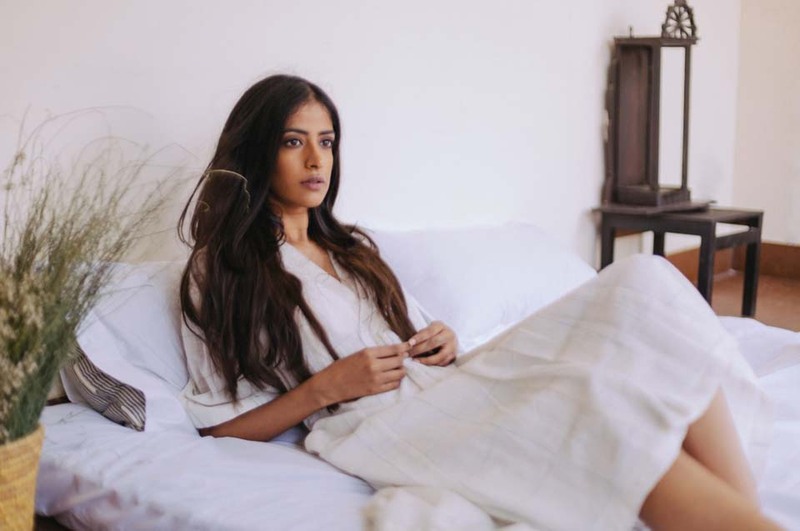 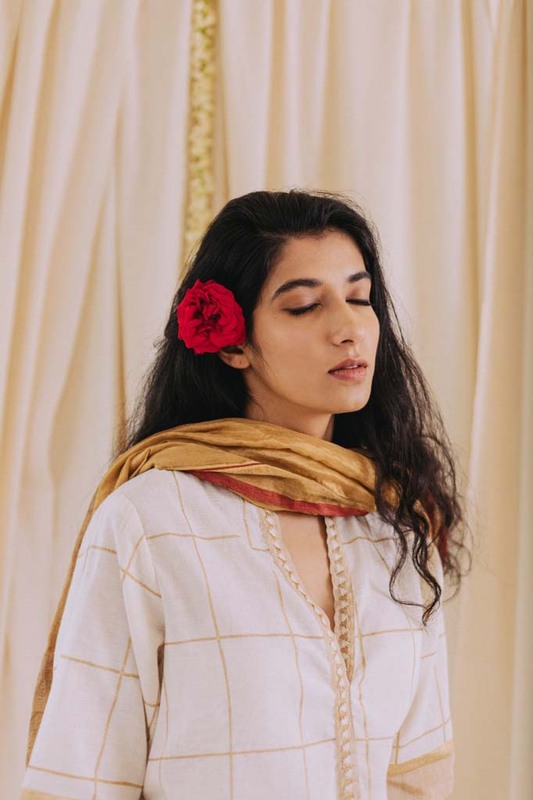 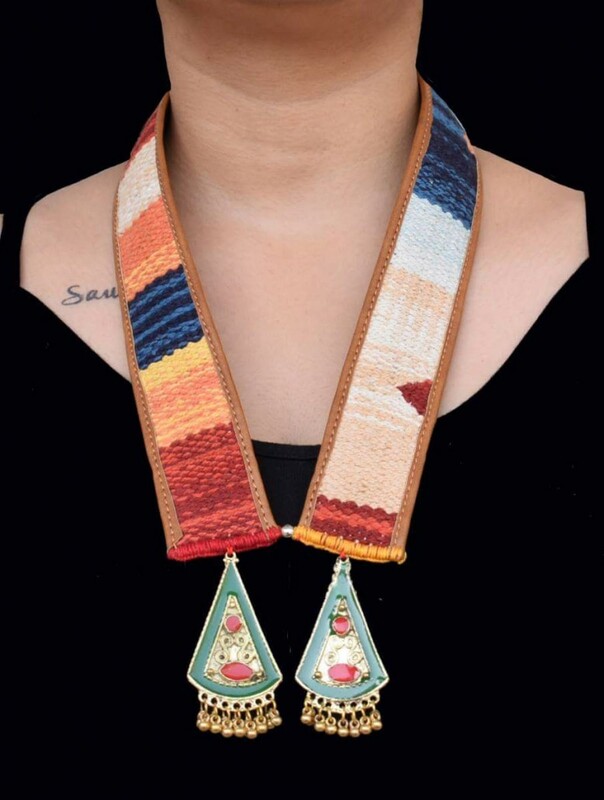 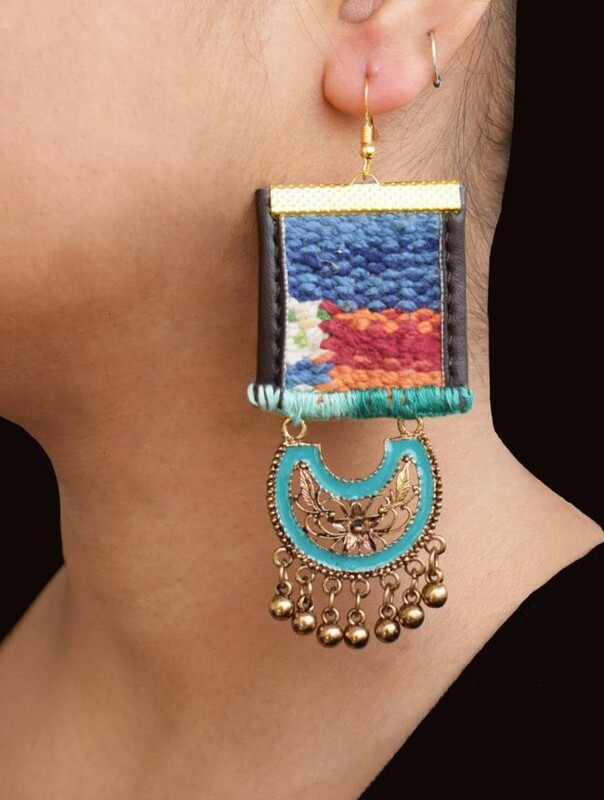 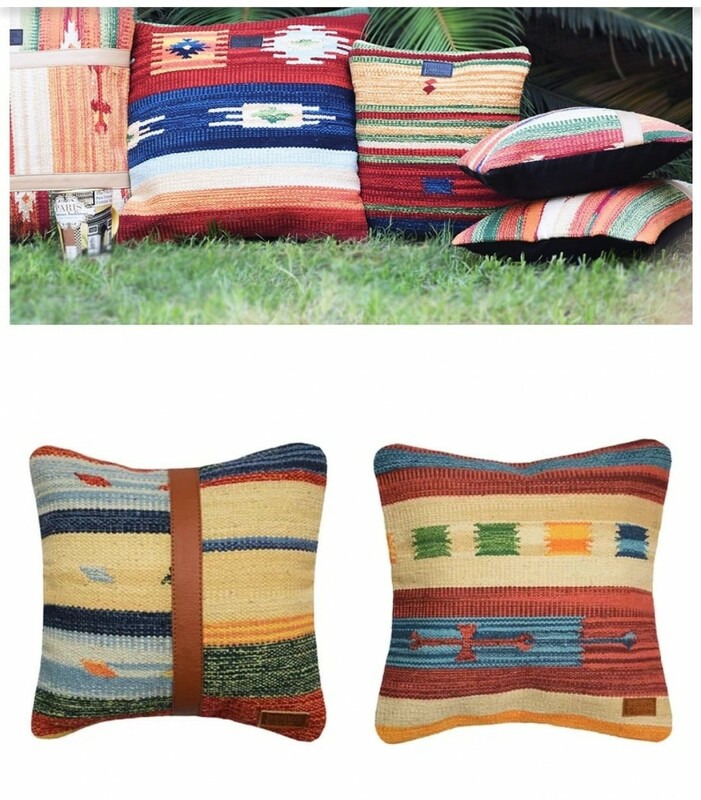 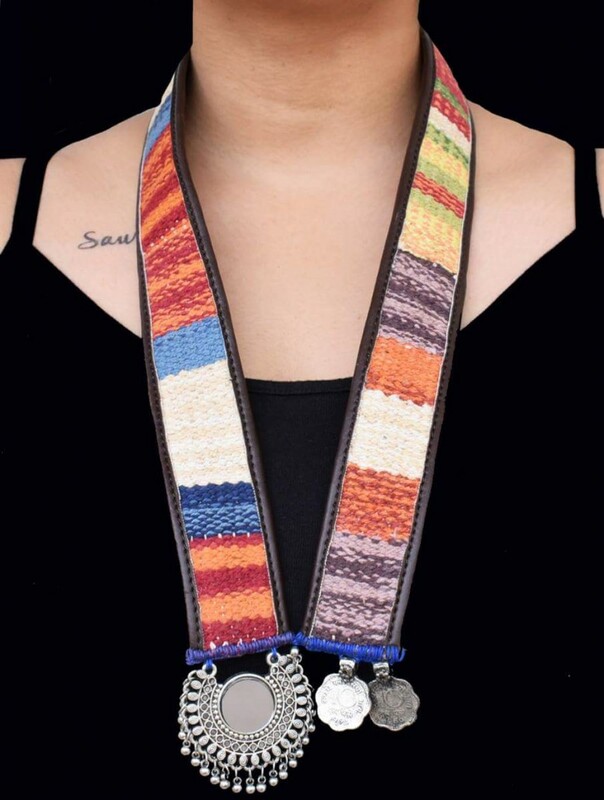 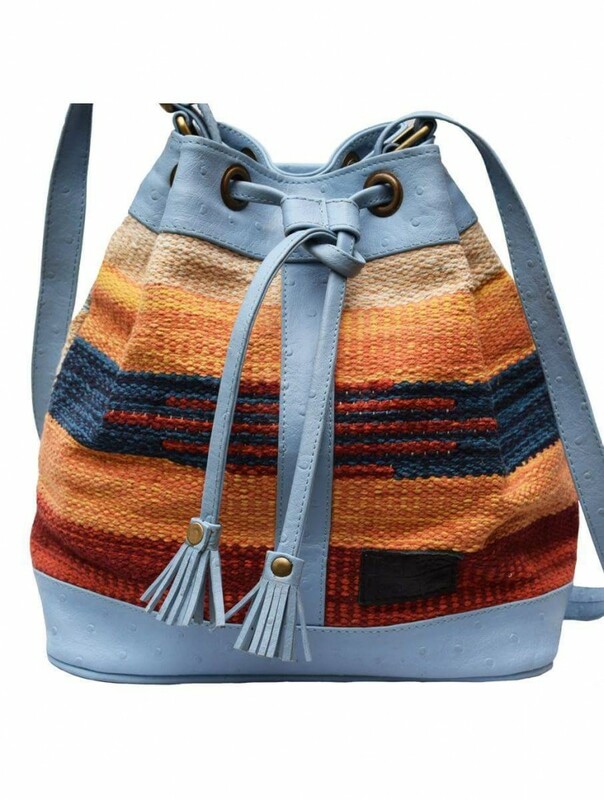 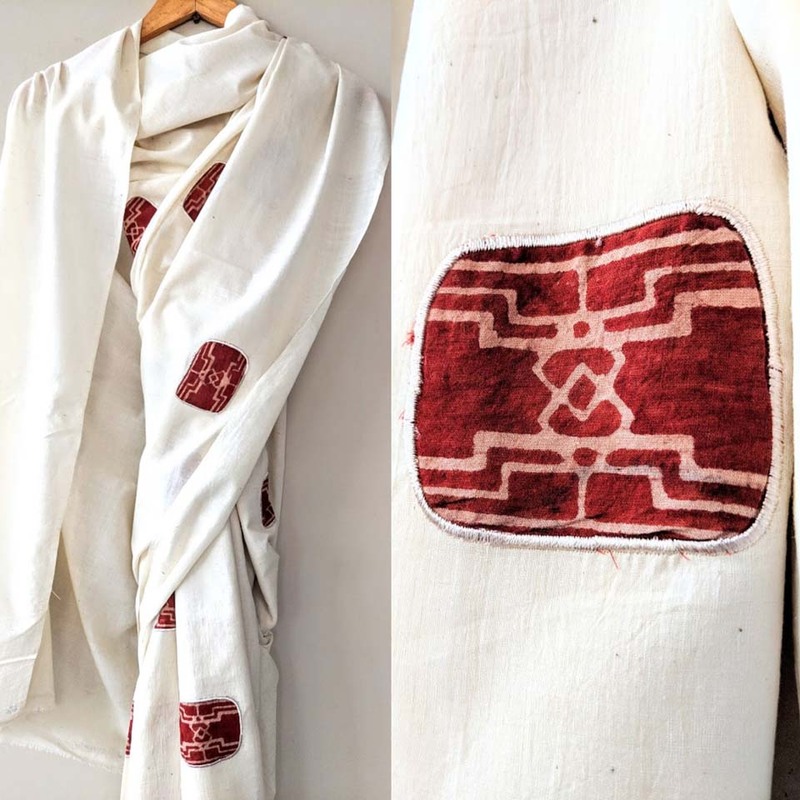 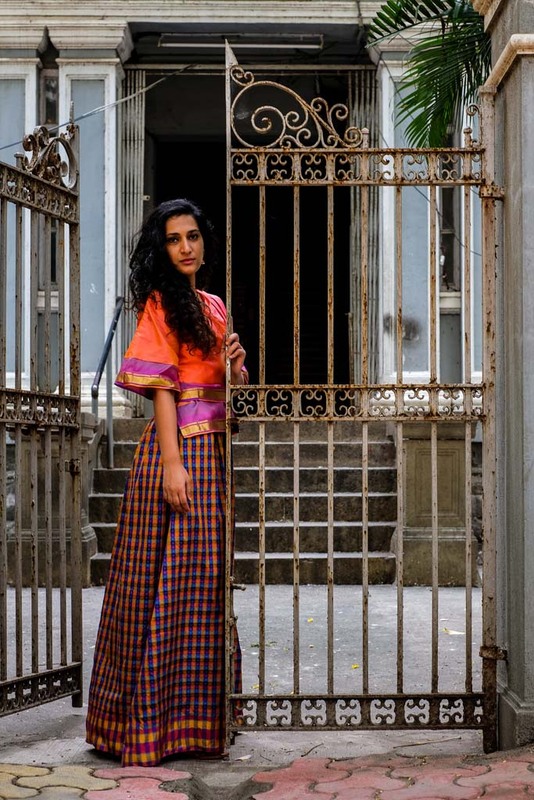 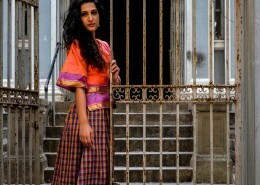 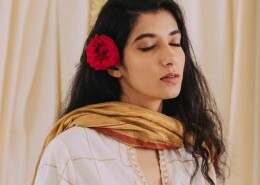 The soulful and beautiful Kilim weave has been used by Boriya Basta design team led by NIFT graduate Deepika Dayal to create a ‘zero waste’ jewellery line comprising Boho ethnic earrings, neckpieces and chokers, fashion accessories like Kilim Kolhapur chappals, Kilim handbags, home decor like cushion covers and floor coverings as well as apparel. 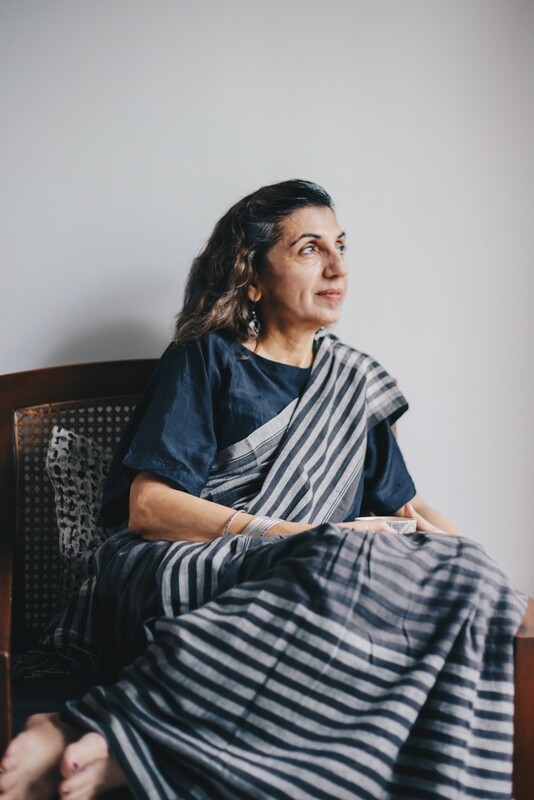 Mita, the designer behind Studio Black Dot explores the beauty of corrugated cardboard to create functional furniture pieces and a range of home decor products under her CORR beauty product line. 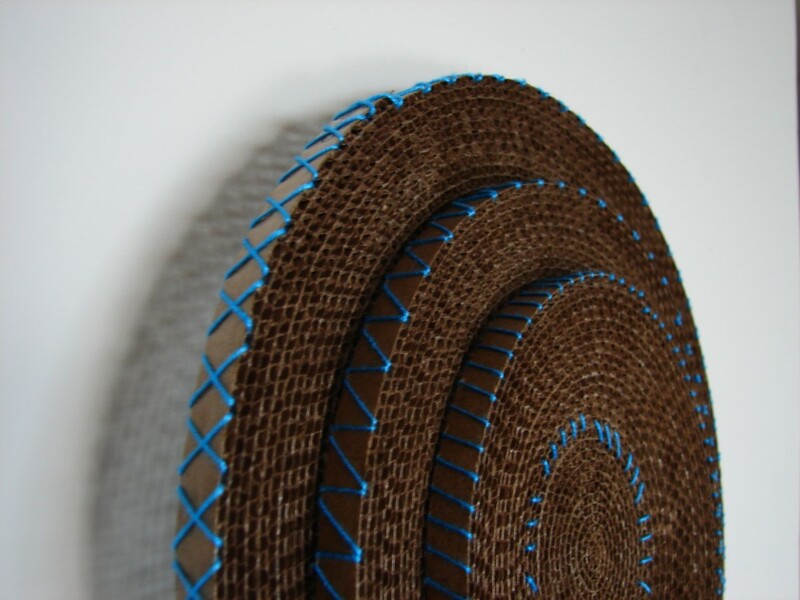 While most people use cardboard as a material to lend strength for packing or protection, Mita uses it to create products with intricate layers and surfaces. 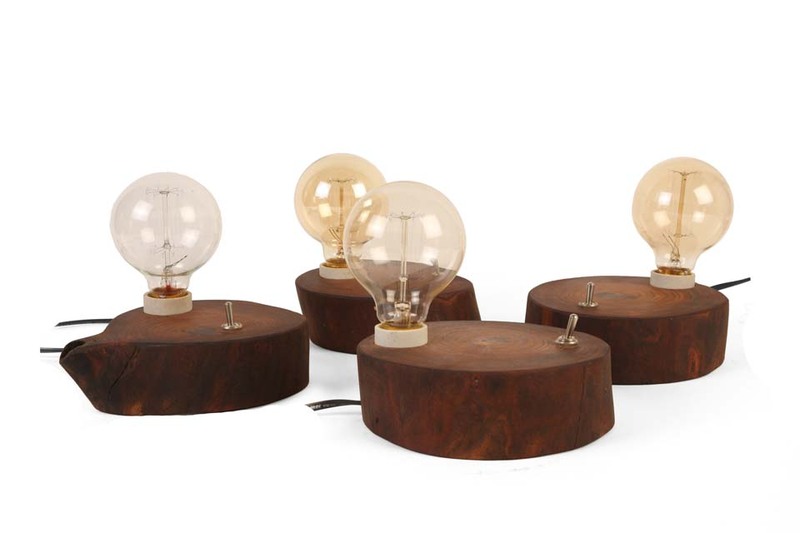 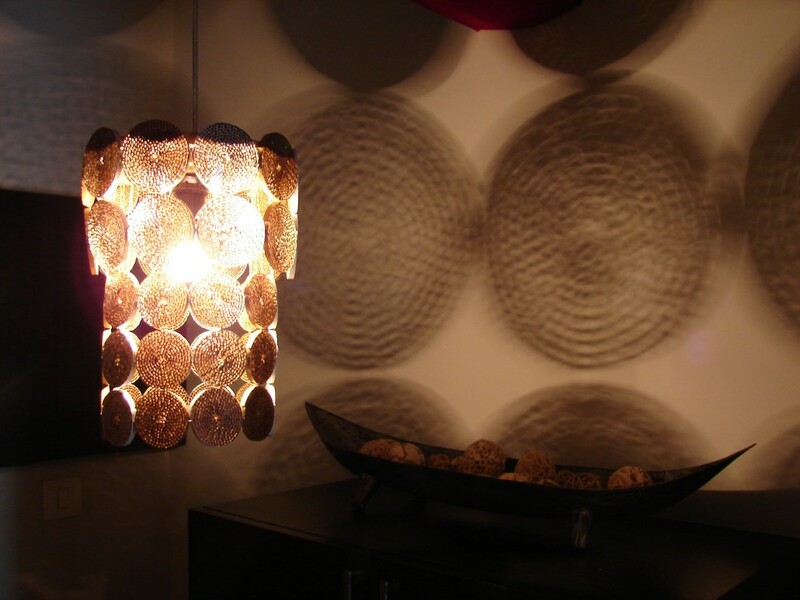 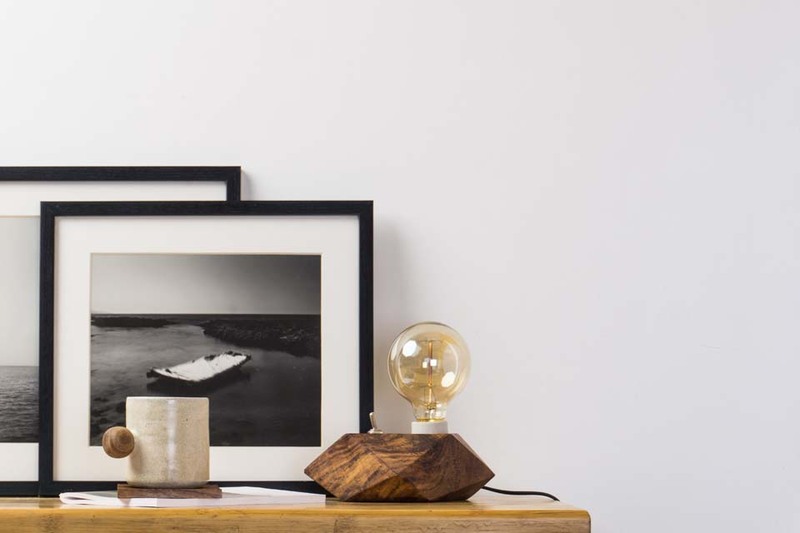 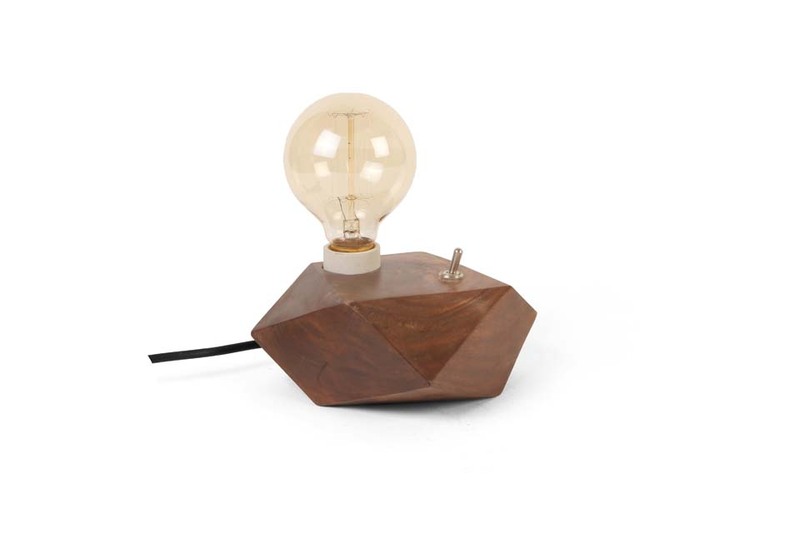 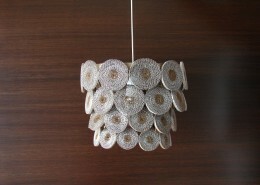 Studio Black Dot’s product line includes hanging lamps, decorative wall plates, nesting boxes, bowls, coasters, etc. 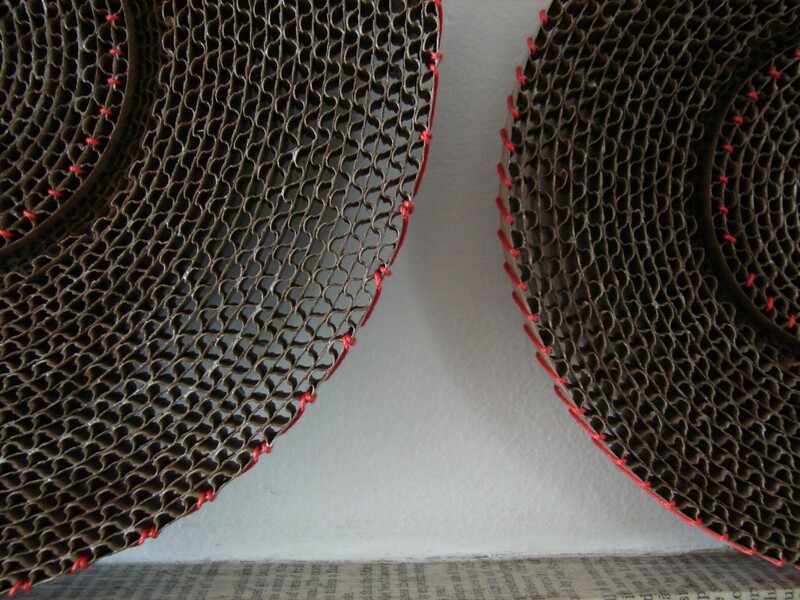 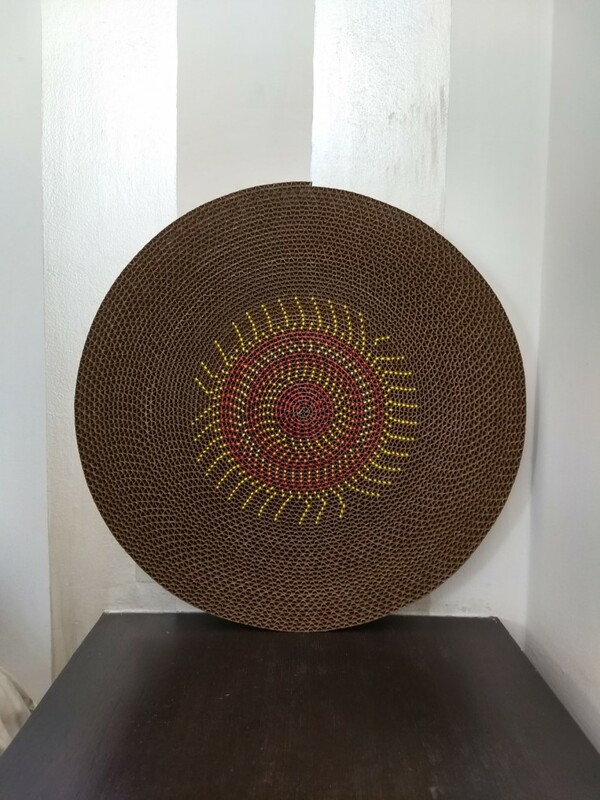 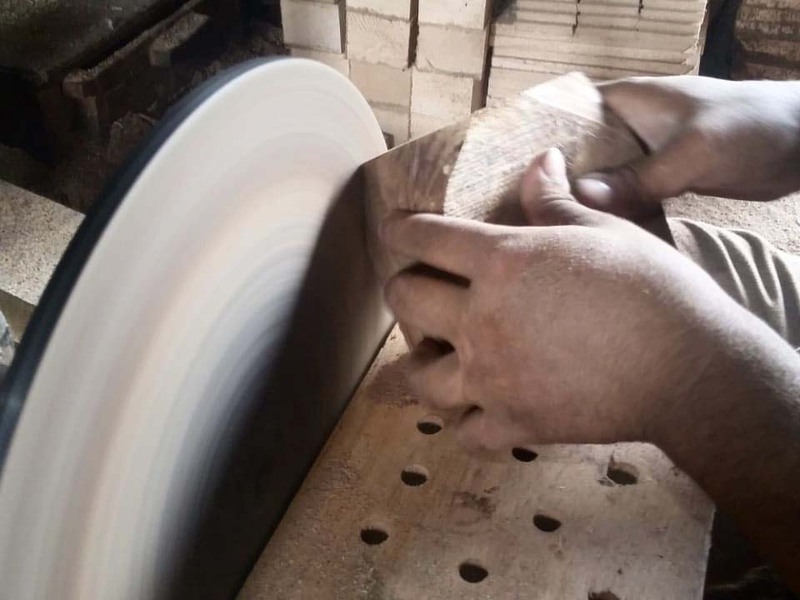 All these products use her signature technique that involves creating discs from thin cardboard strips and shaping the discs further to create the form that makes up the structure of the products. 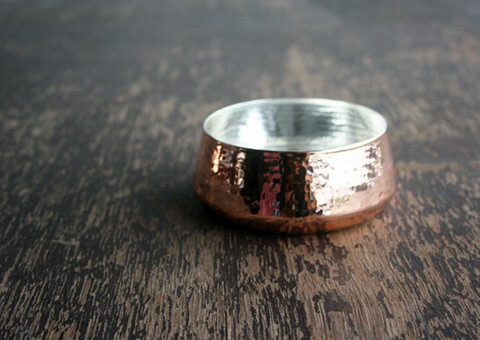 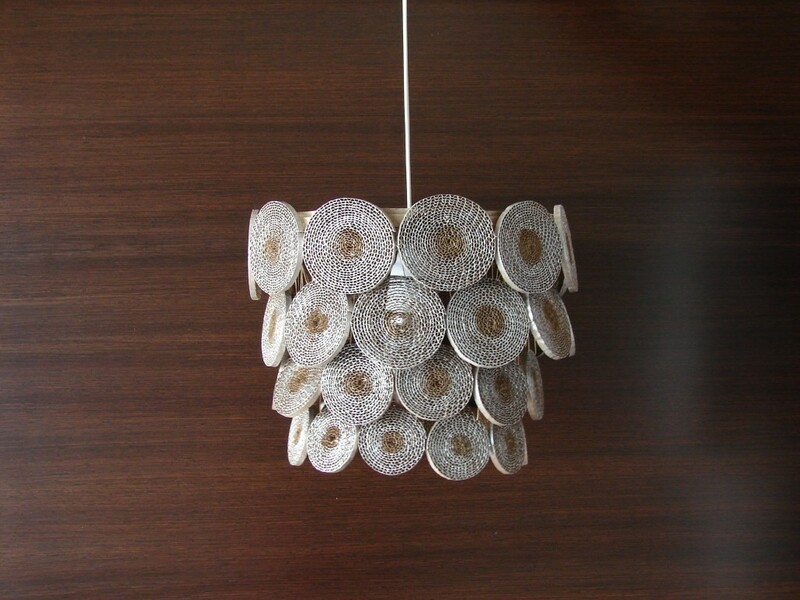 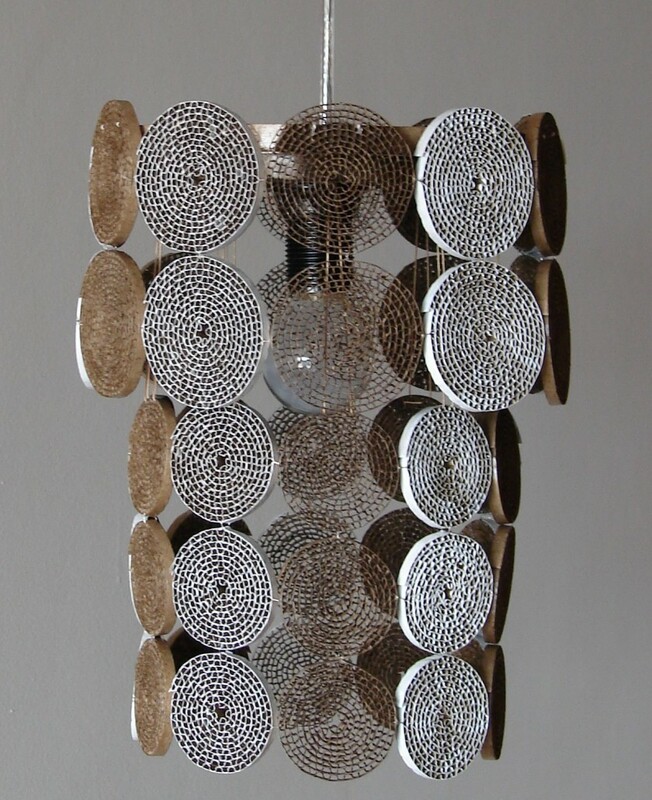 Wanting to explore with other such simple materials led Mita to start working on galvanized aluminum. 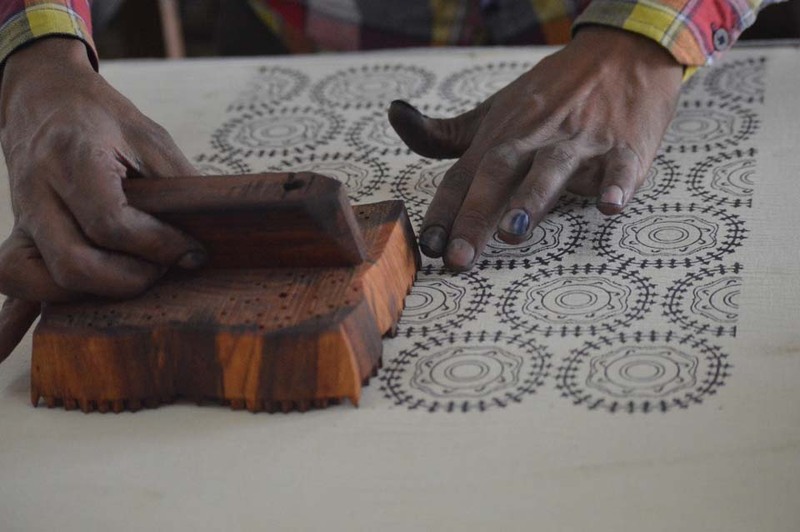 She used the centuries-old technique of tin punching to embellish the material with Indian forms and motifs to make beautiful art pieces. 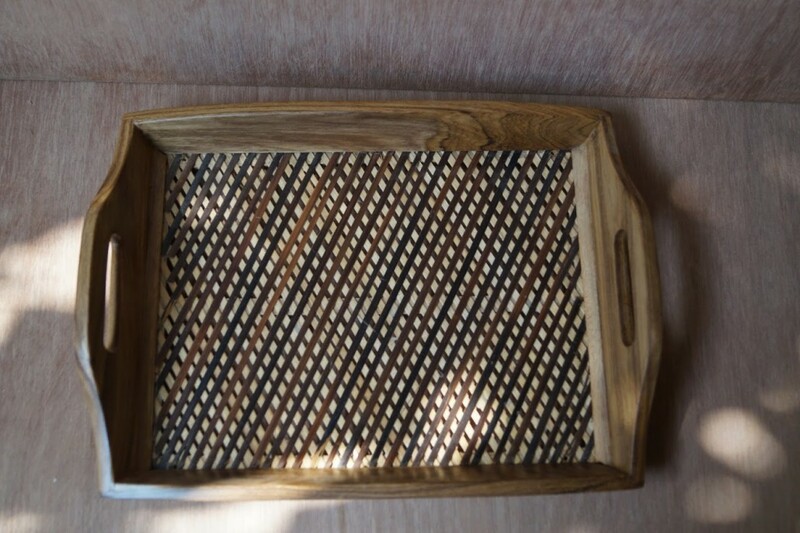 She also makes wood-burned plaques, trinket boxes and frames. 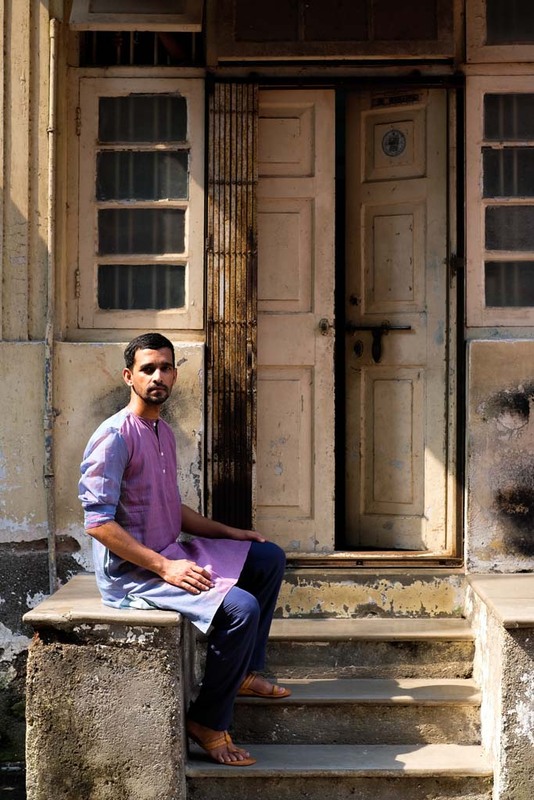 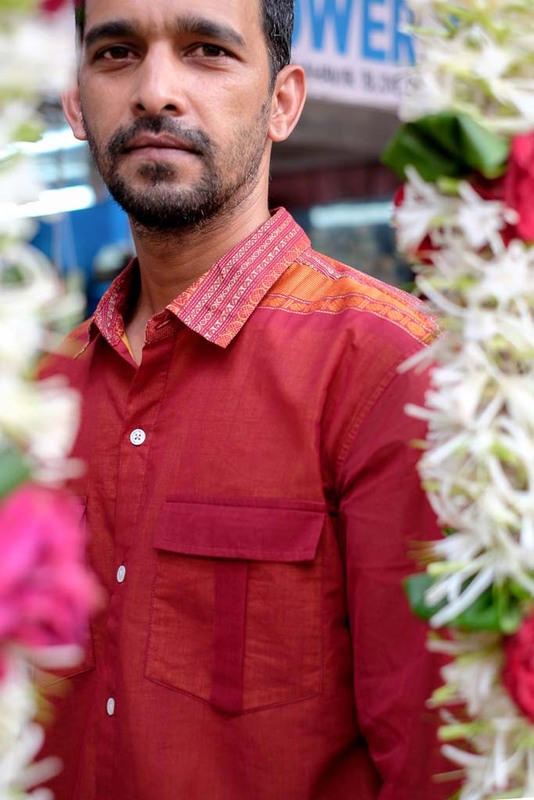 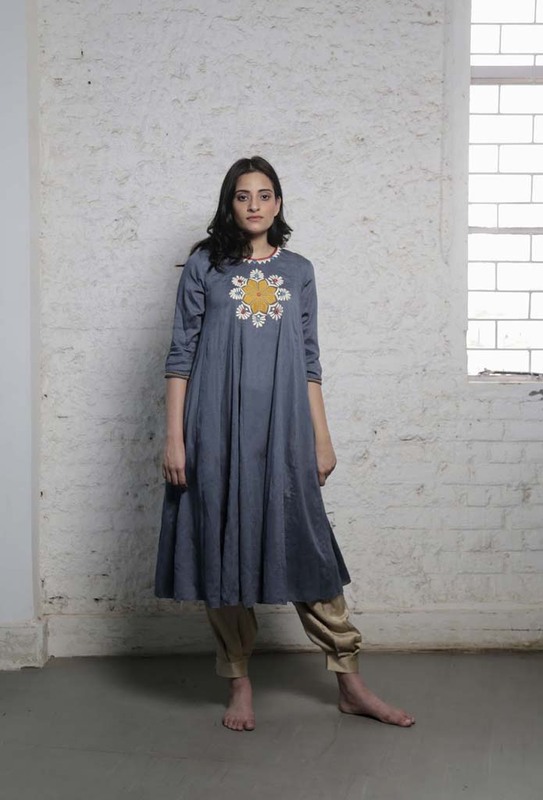 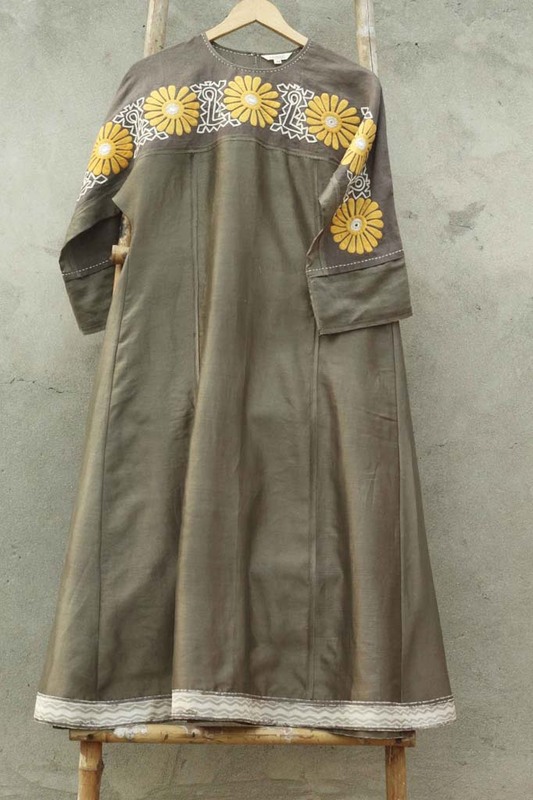 Sawrabh Kumar’s BarahMasi kurta pyjama, jackets, dupattas and skirts bloom through 12 months of the year. 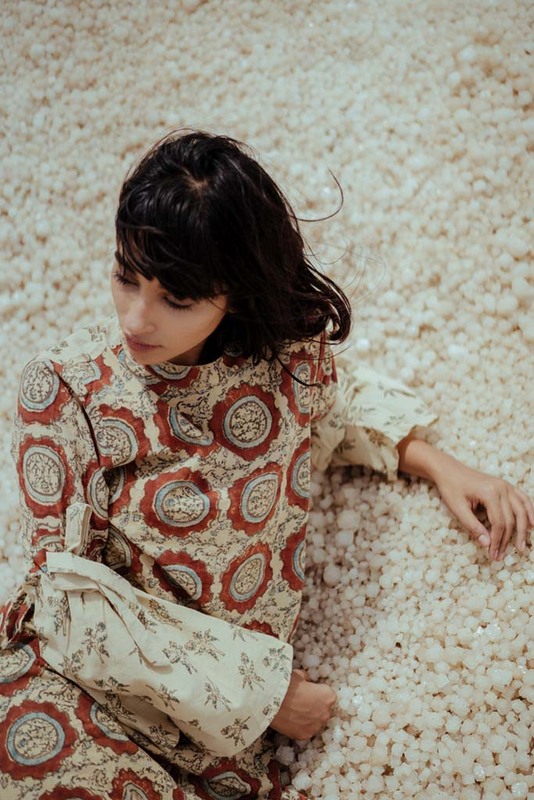 The collections celebrate the 3 distinct poetic colours: off white, tea green and red. 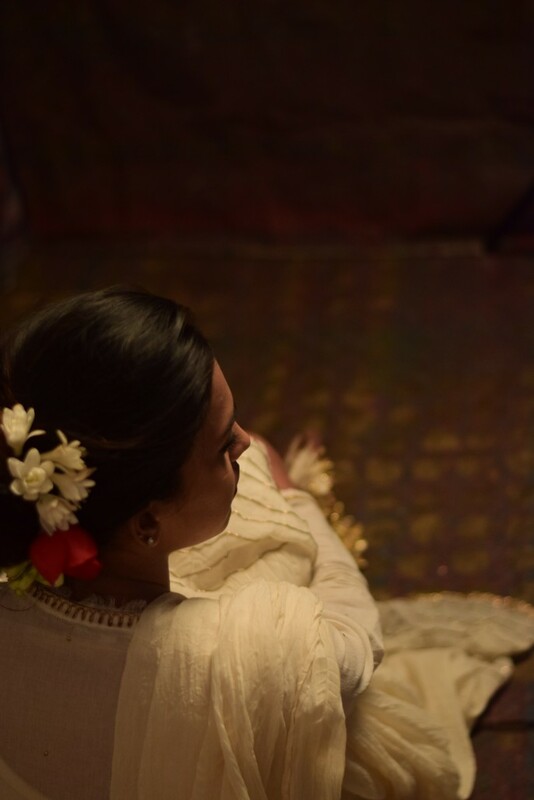 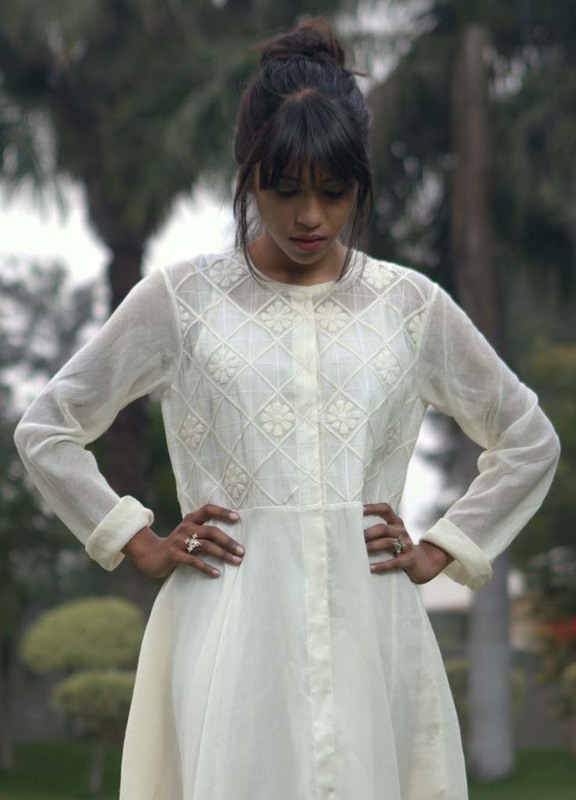 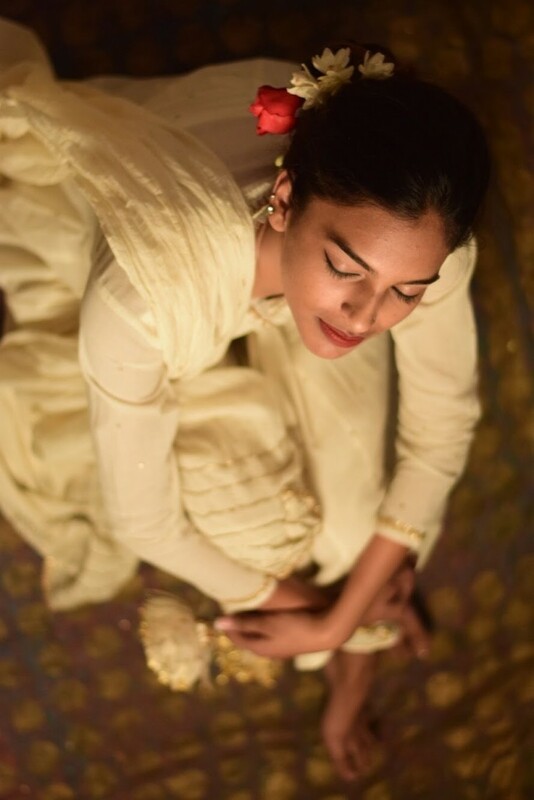 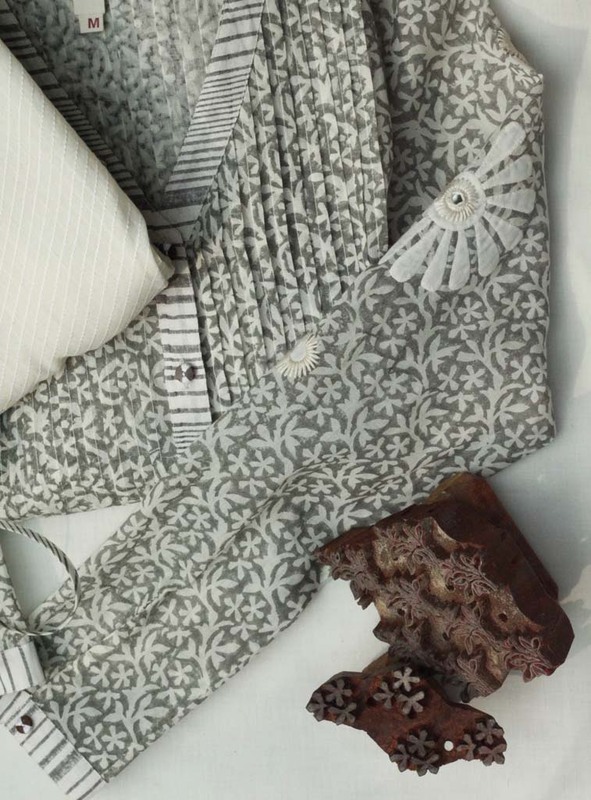 The Sufi inspired off white collection has exquisite gota embroidery and is poetic in its beauty. 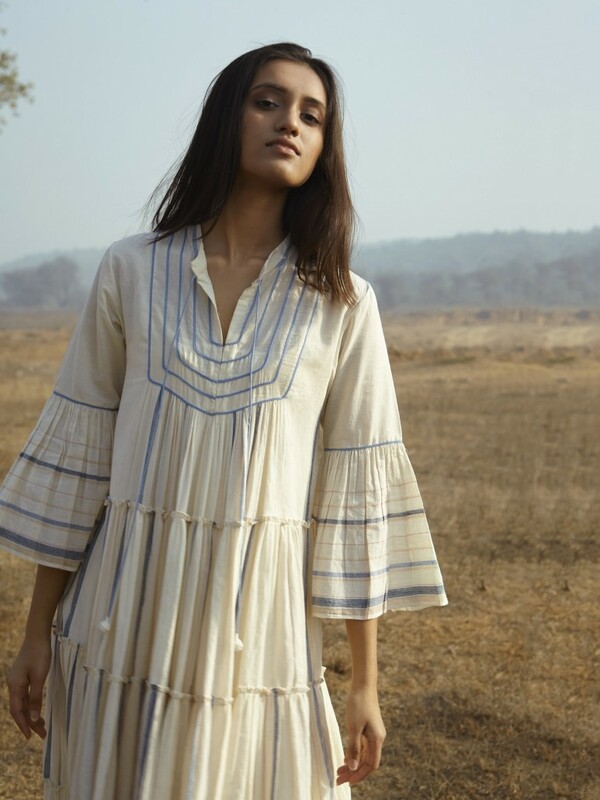 Crafted out of mull and handwoven cotton, the collections feature touches of block prints, zardosi and kantha for year round elegance. 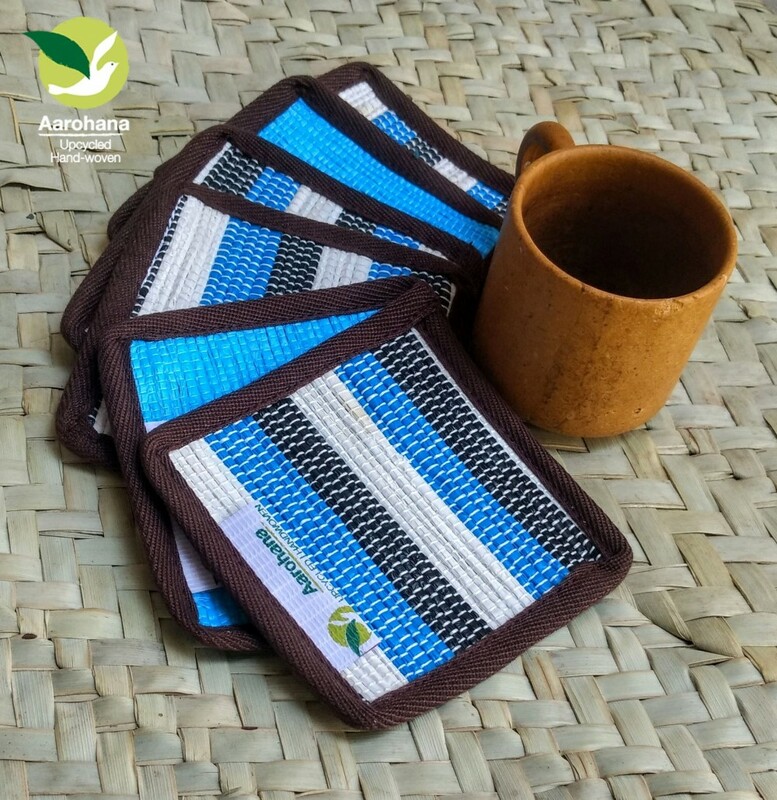 Nandan Bhat & Amita Deshpande are founders of Aarohana Eco-Social Development, a social enterprise based in Pune which works on upcycling waste plastic to conserve the environment and provide livelihoods, to tribal and rural youth and women. 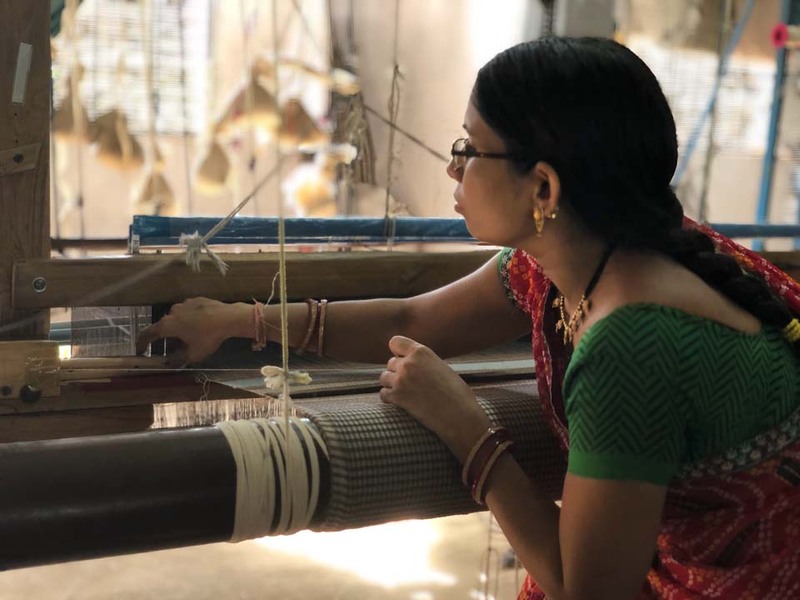 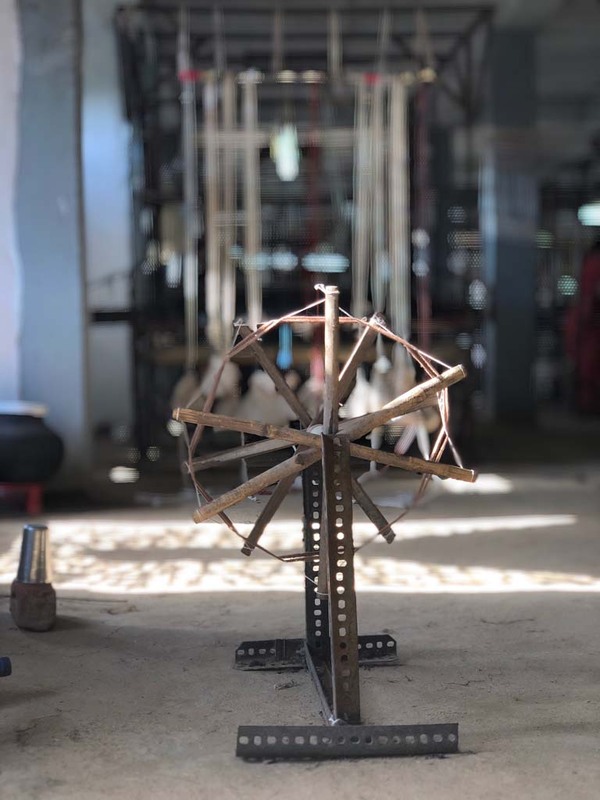 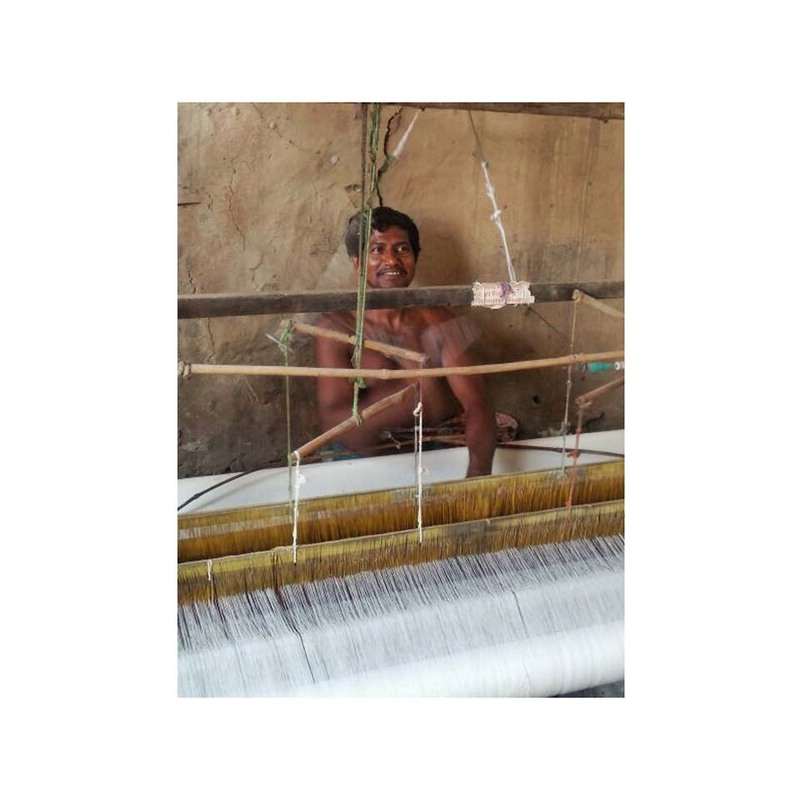 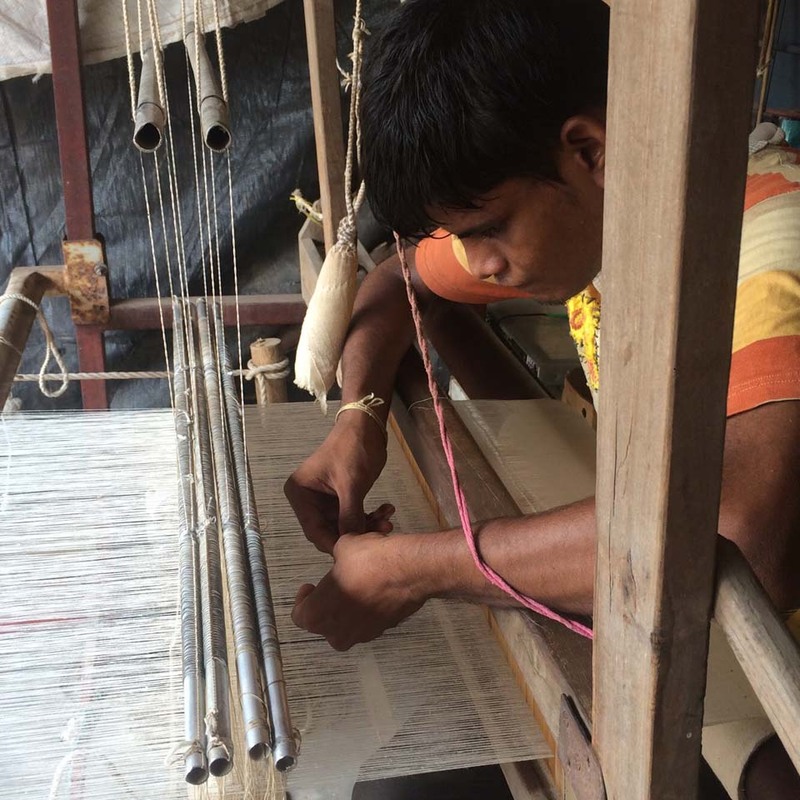 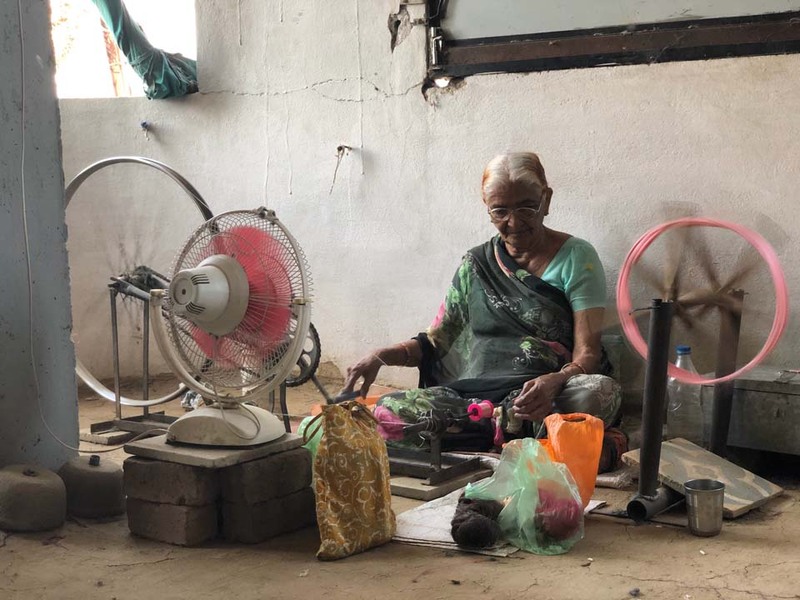 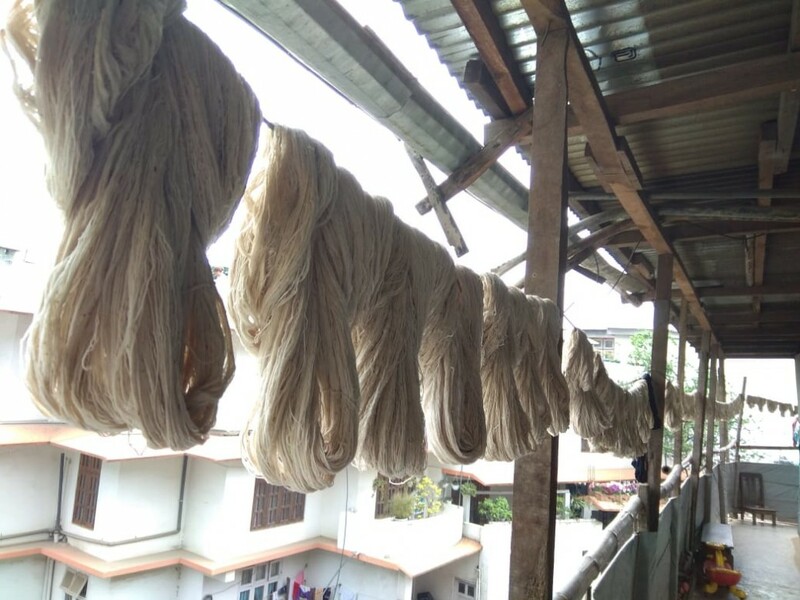 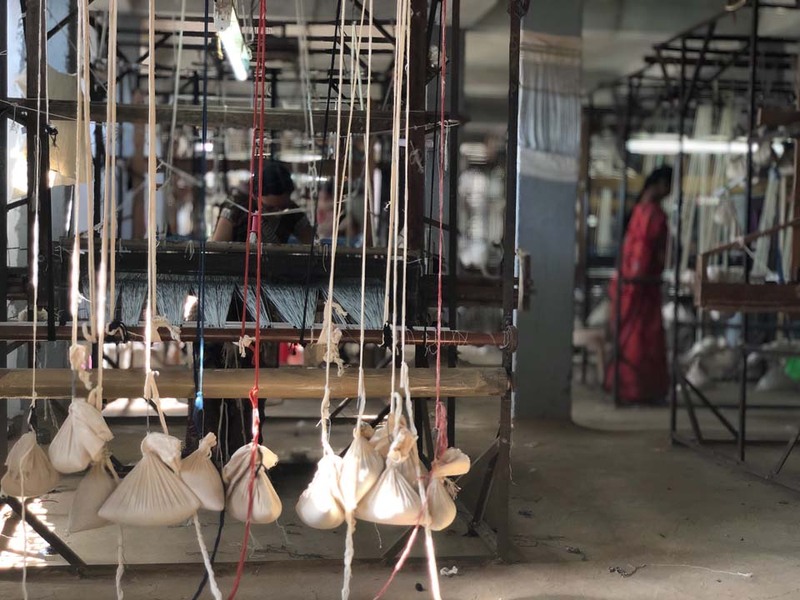 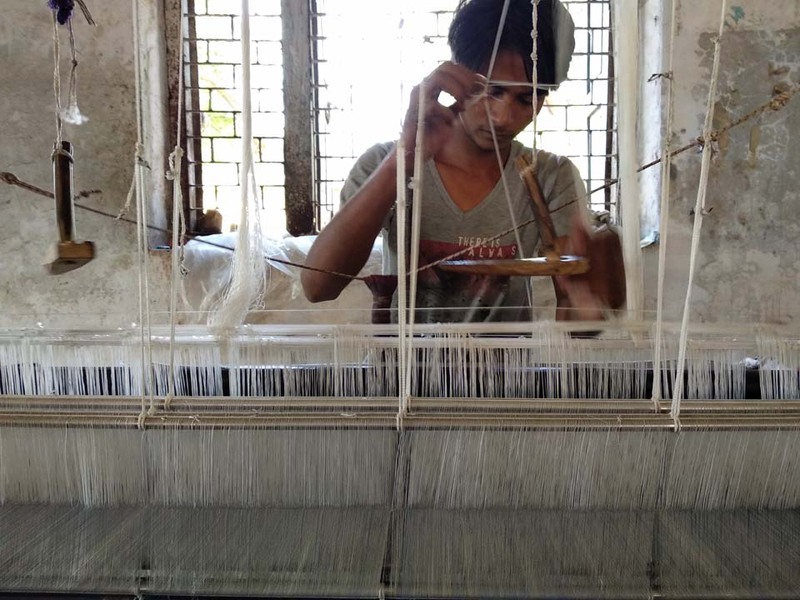 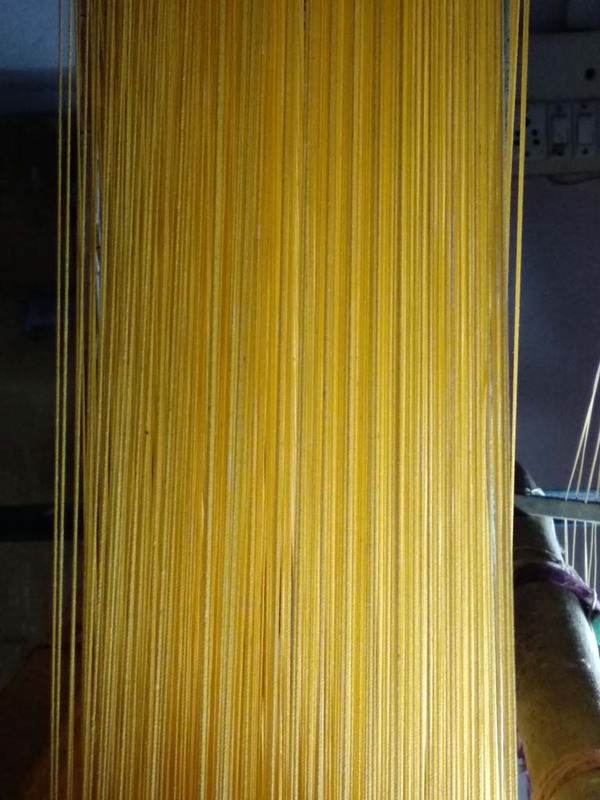 The organisation collects waste plastic from household waste pickers and industries in India and upcycles it, using a traditional ‘charkha’ and handloom to weave it into a fabric. 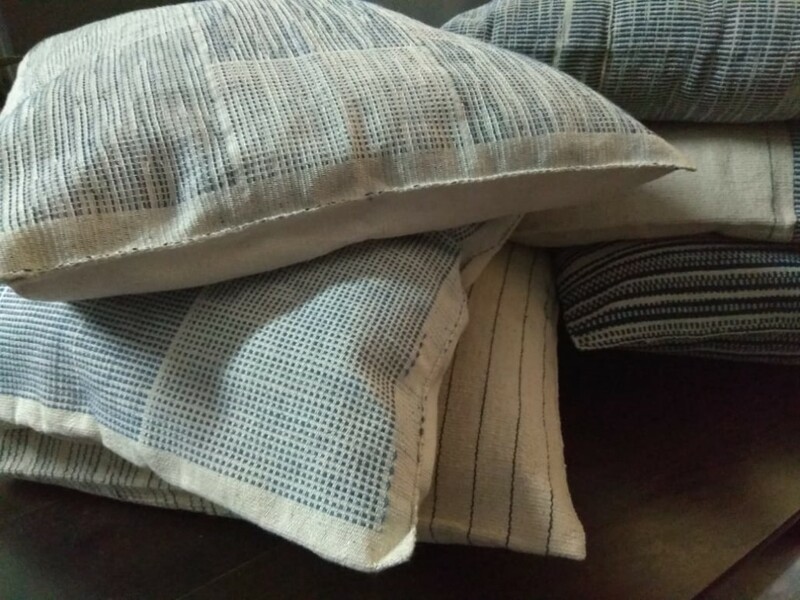 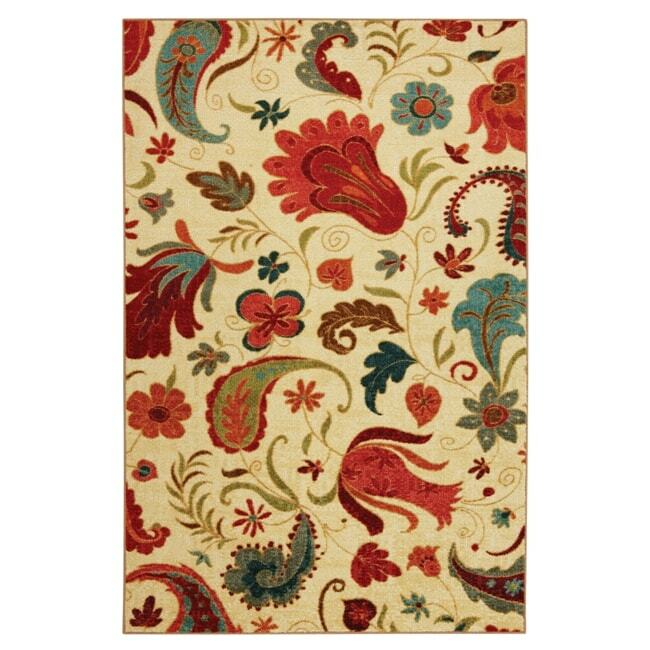 The fabric is then used to make bags, fashion accessories, file covers and home decor products. 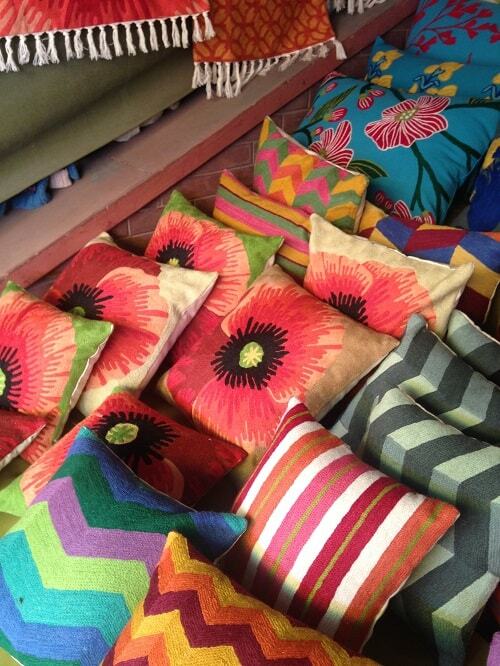 Apart from these products, customised bulk orders are taken from corporates.